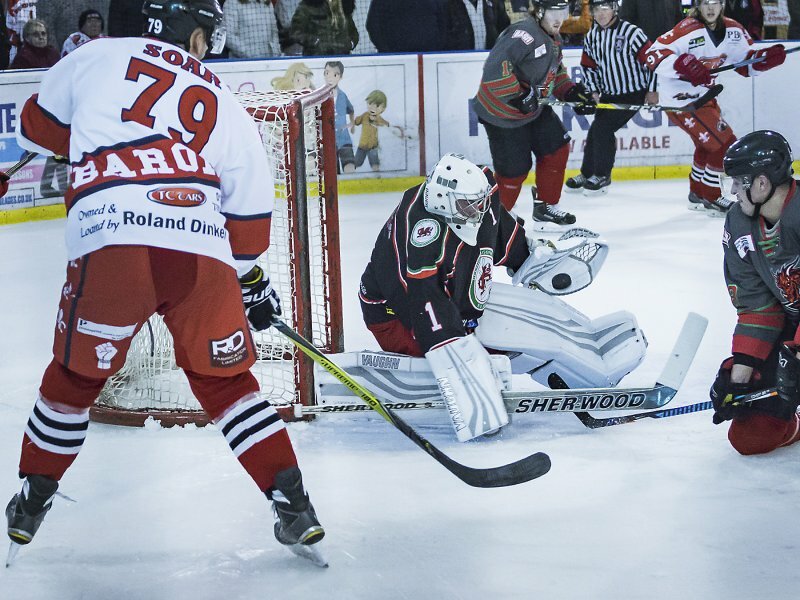 Click on any image and navigate using the left and right arrows. 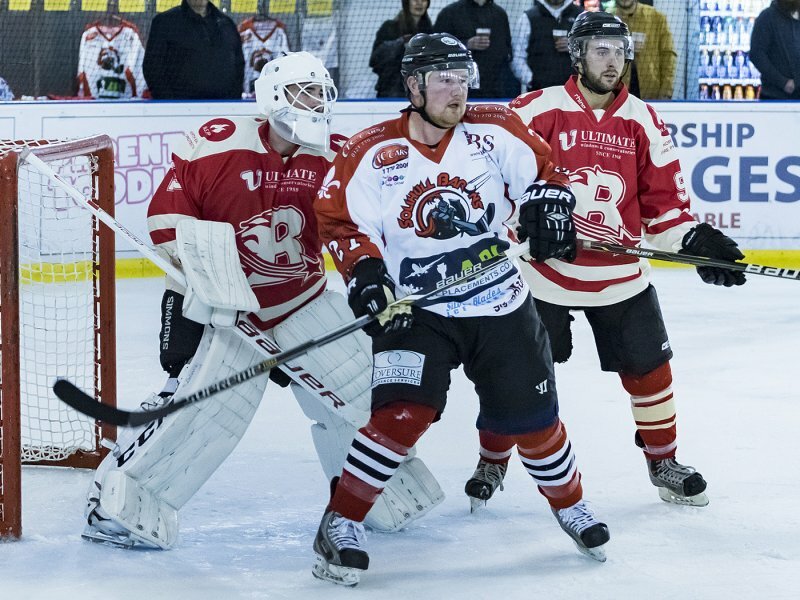 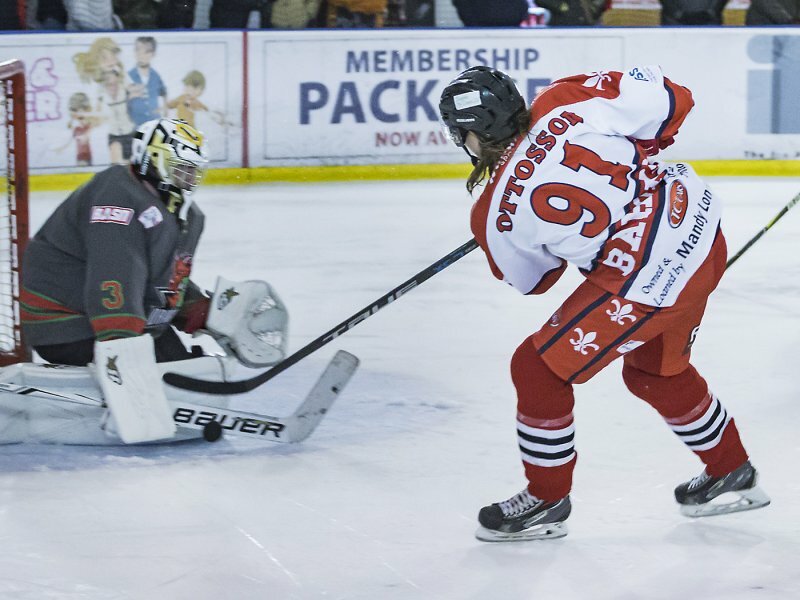 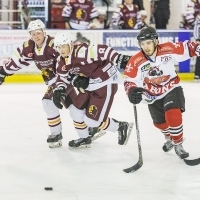 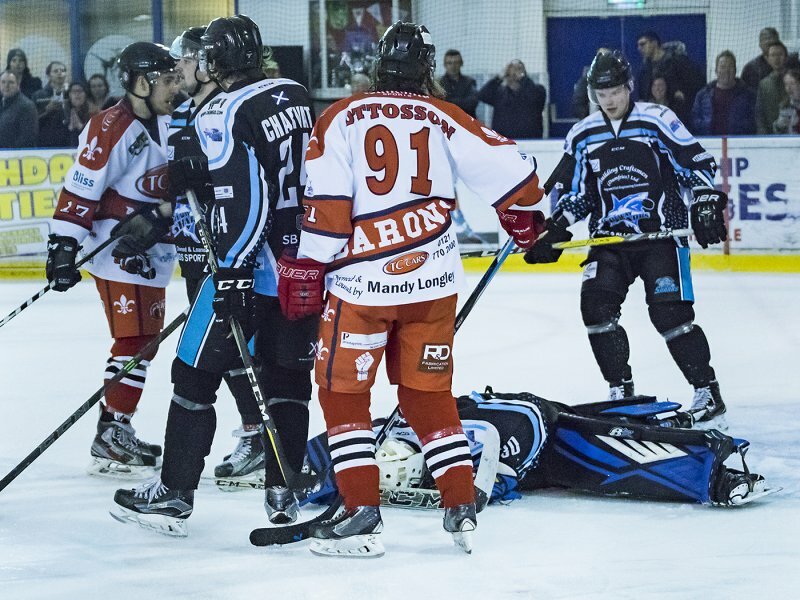 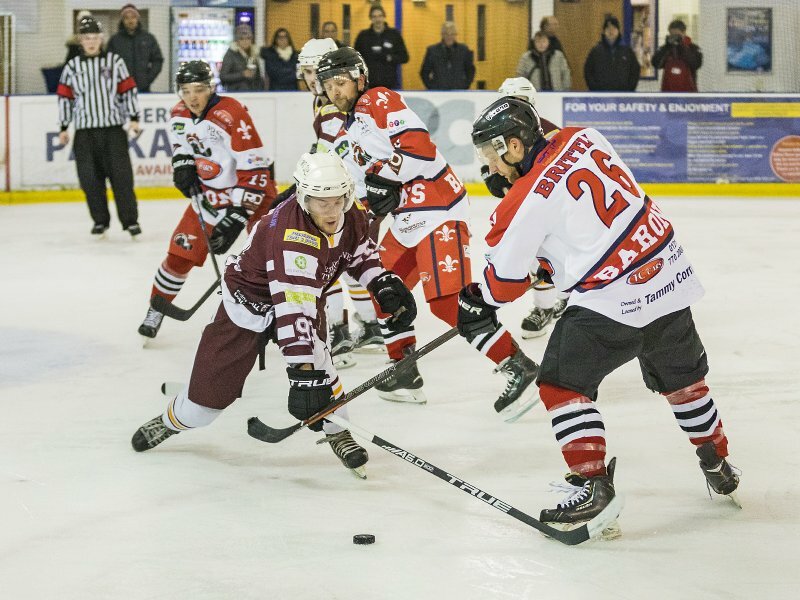 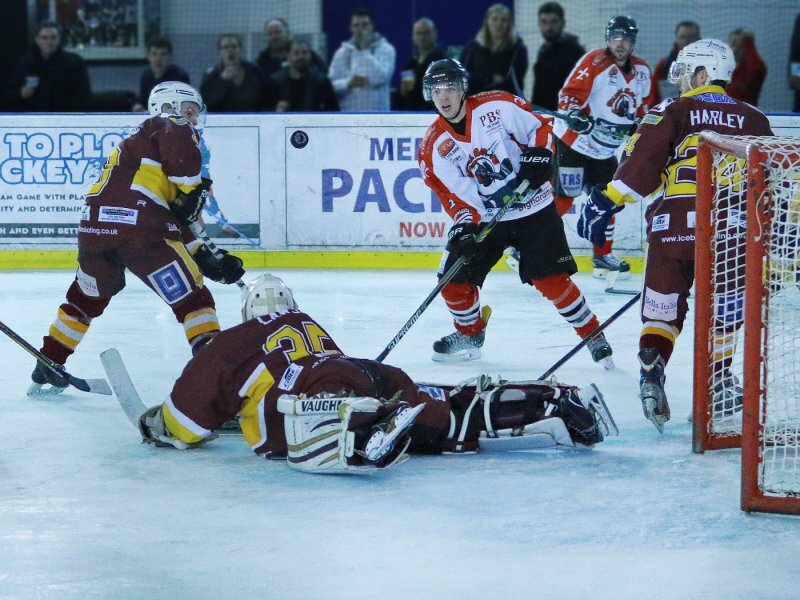 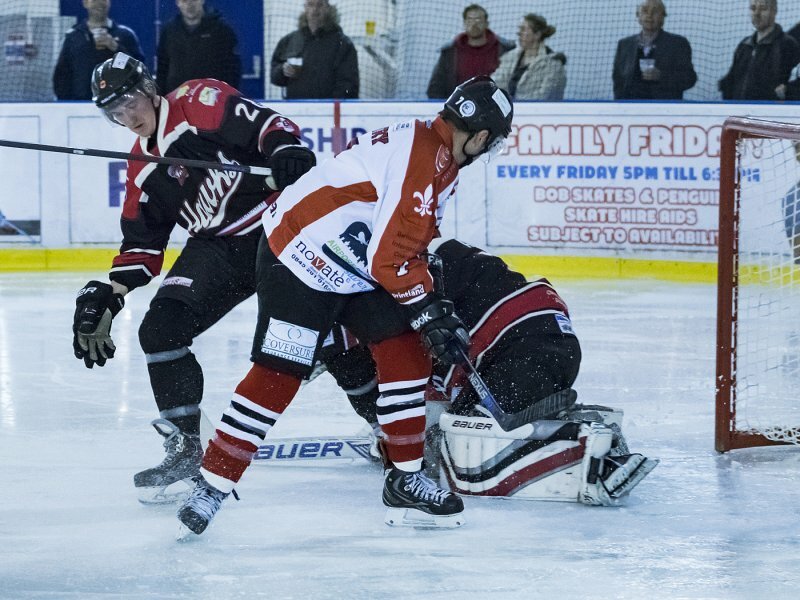 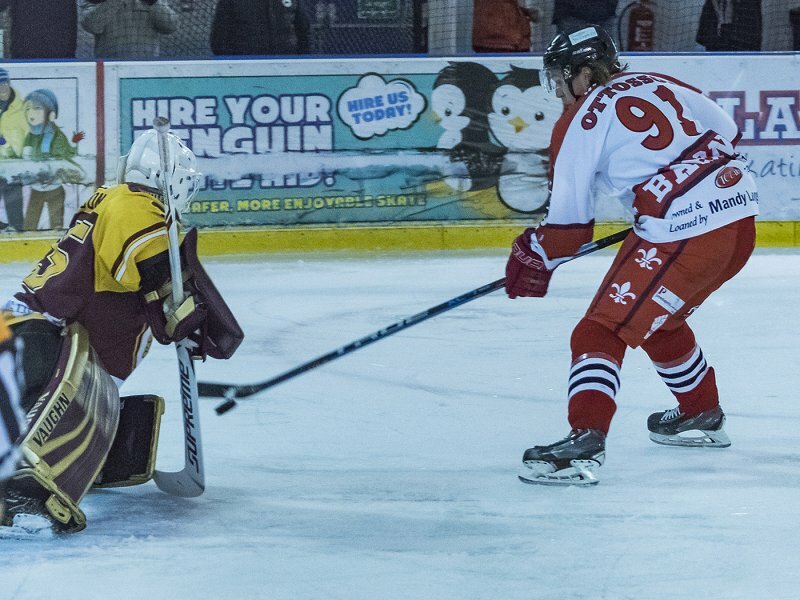 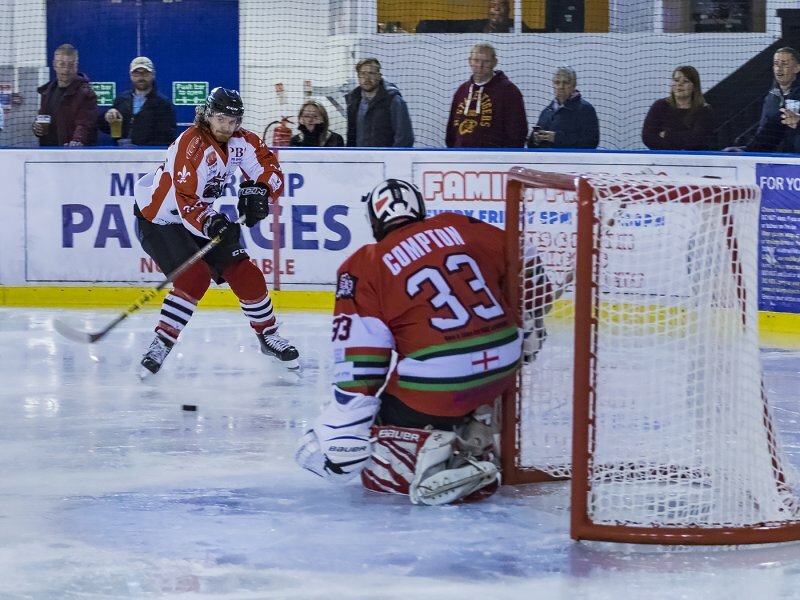 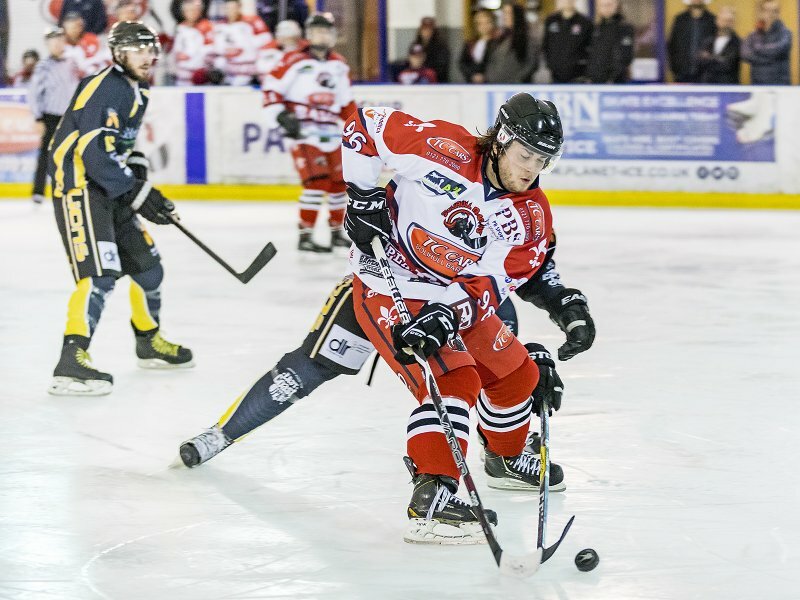 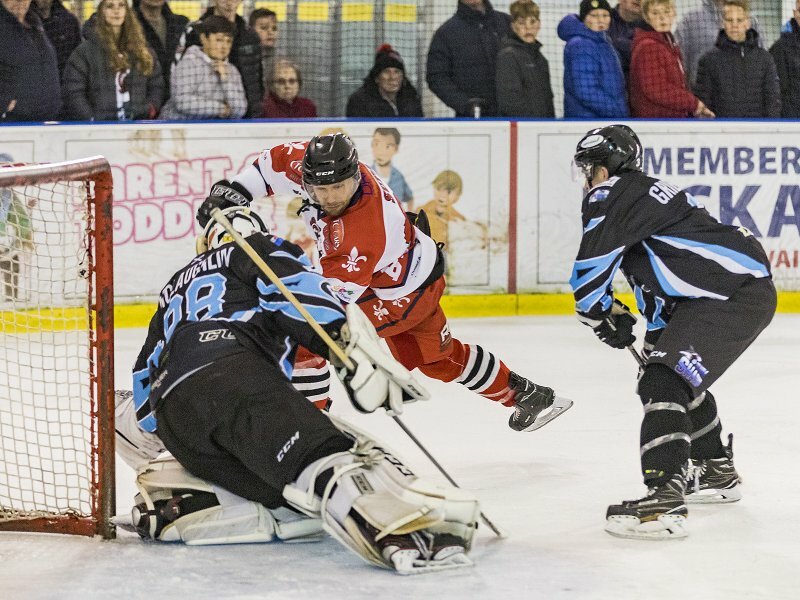 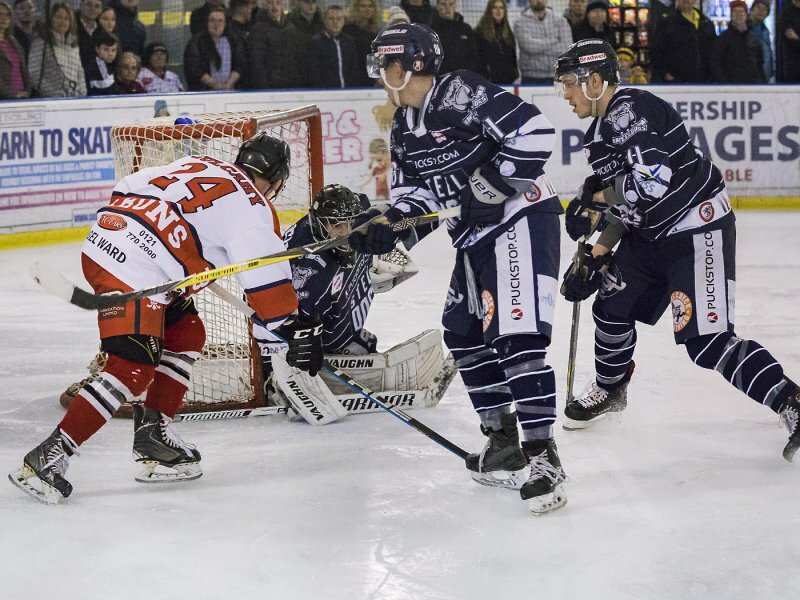 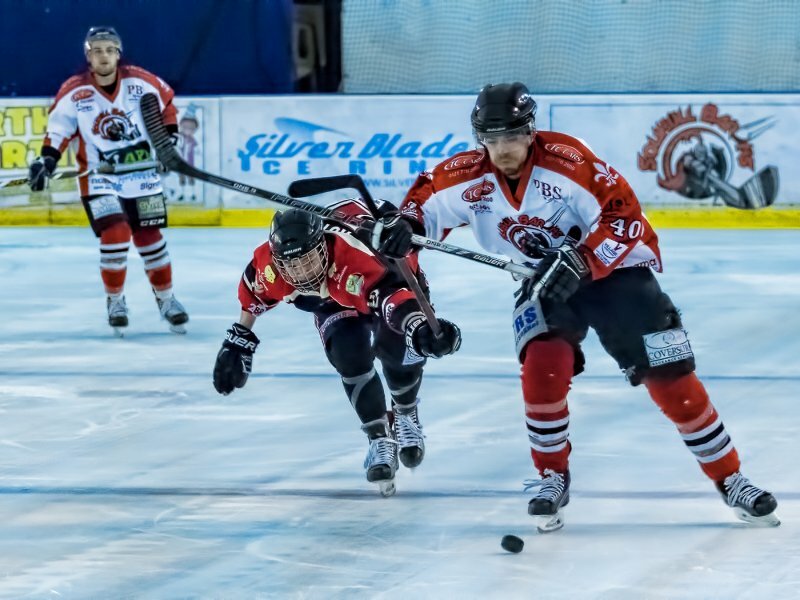 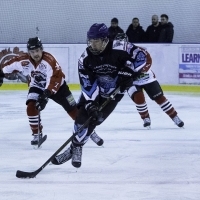 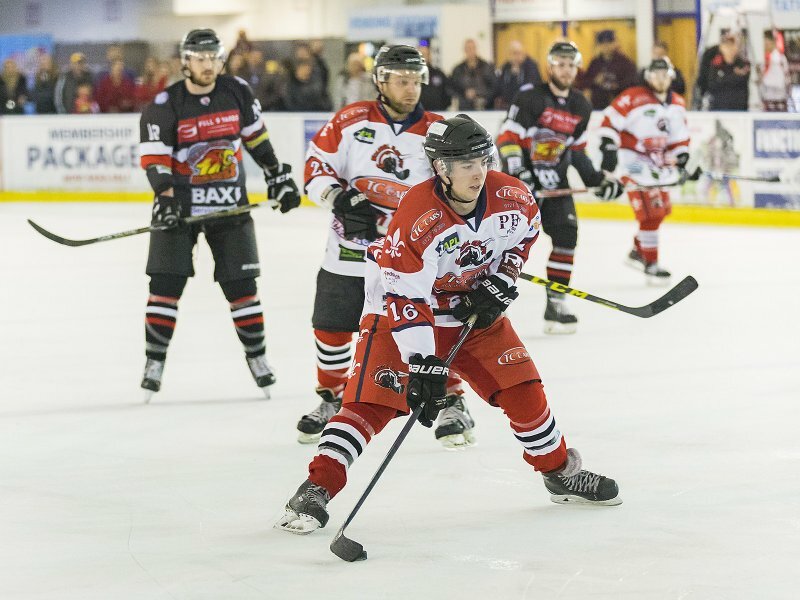 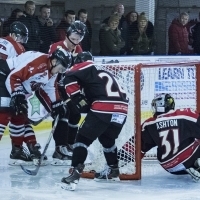 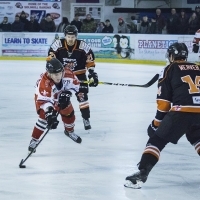 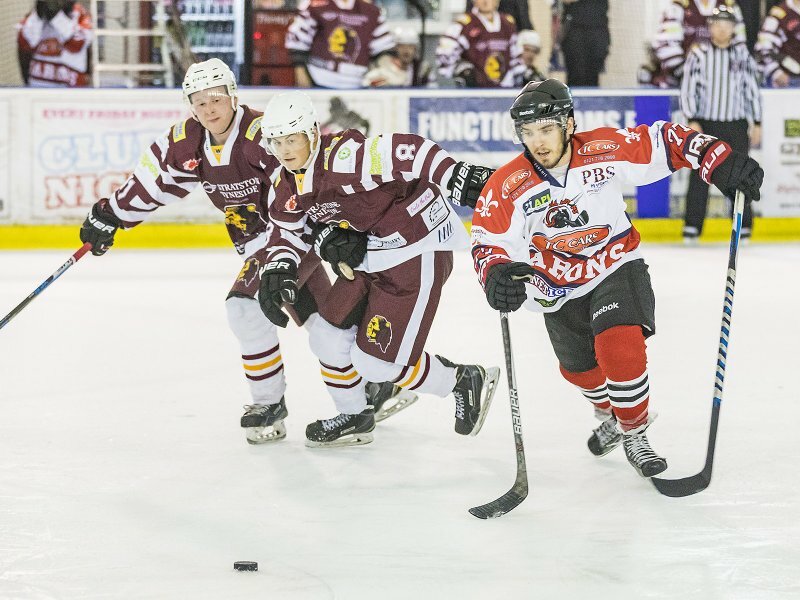 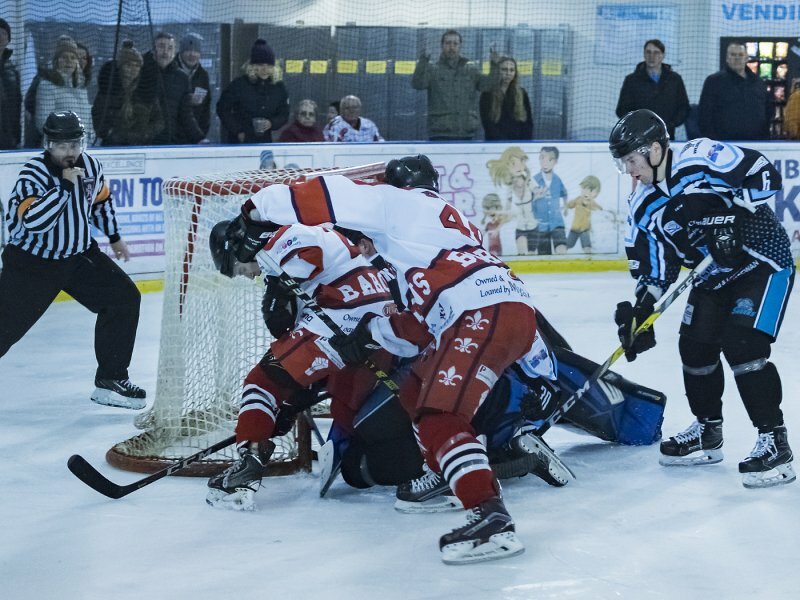 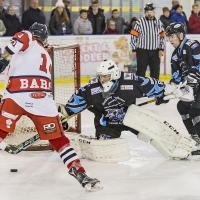 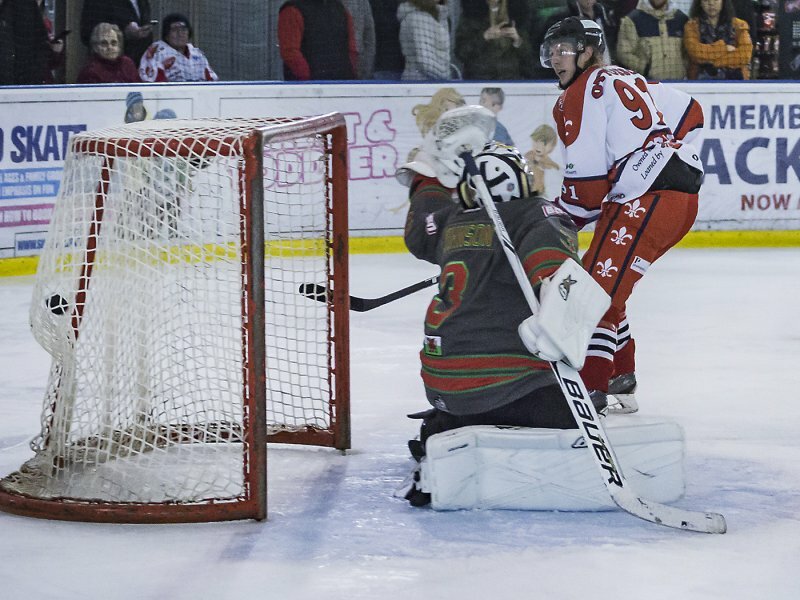 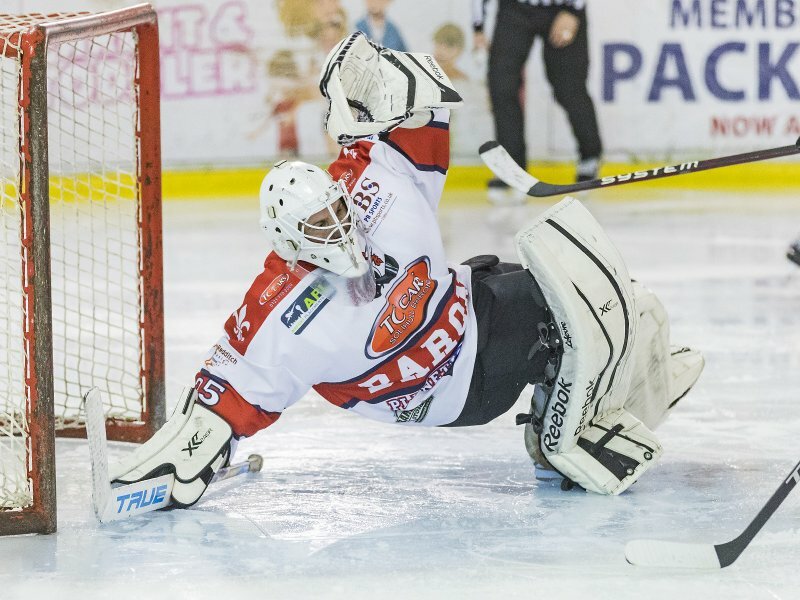 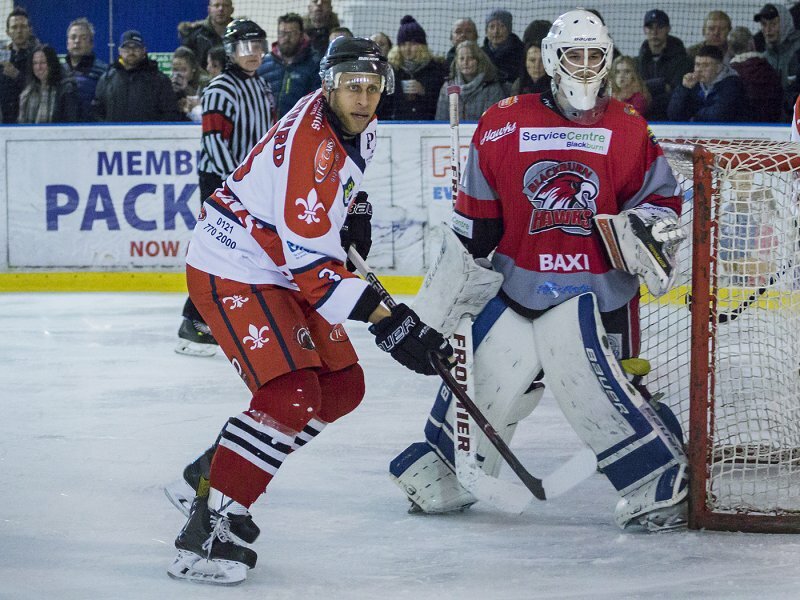 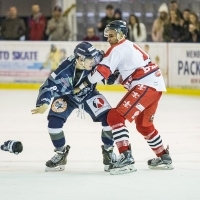 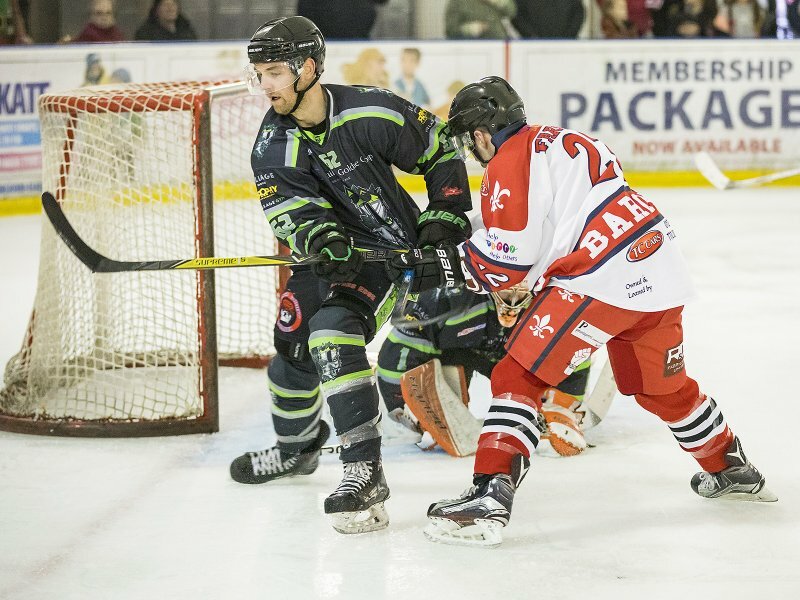 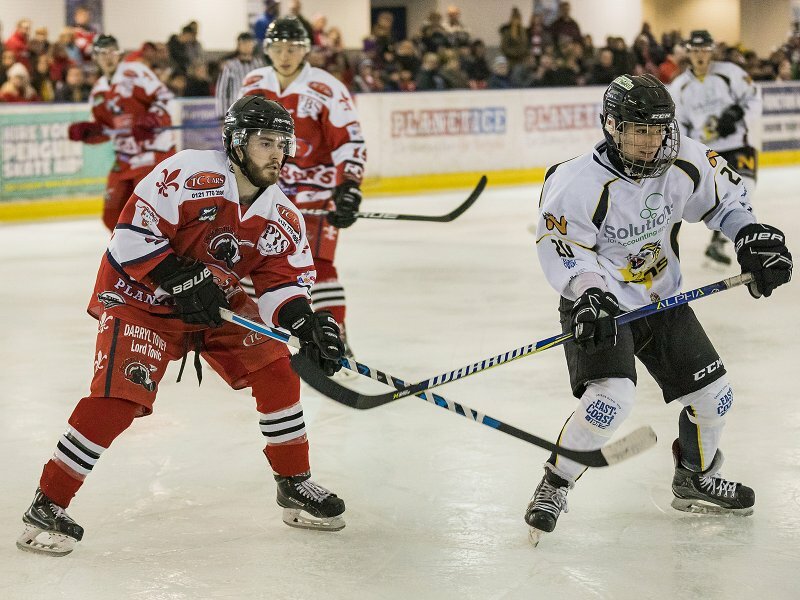 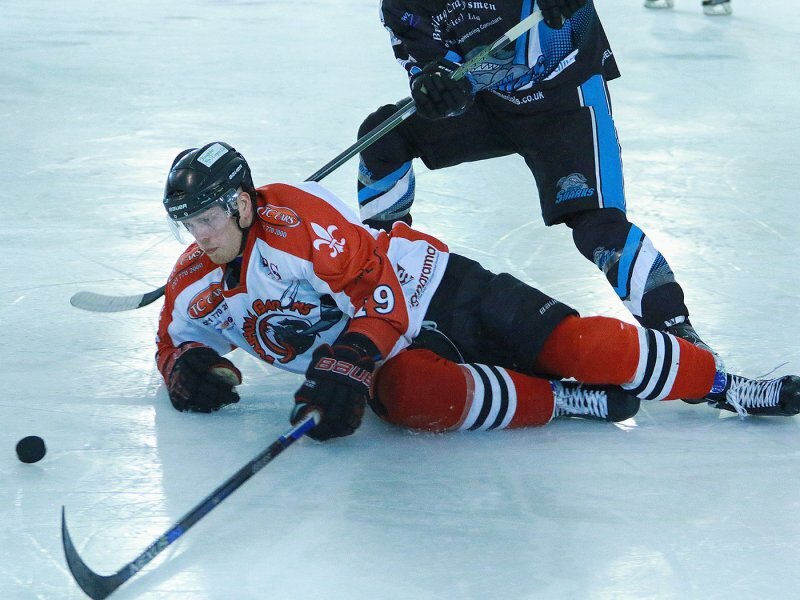 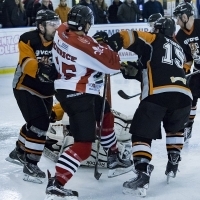 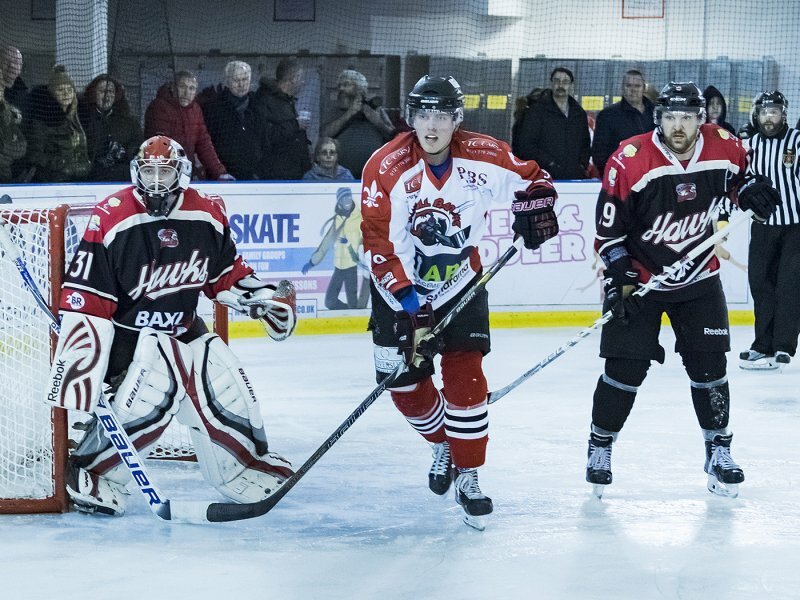 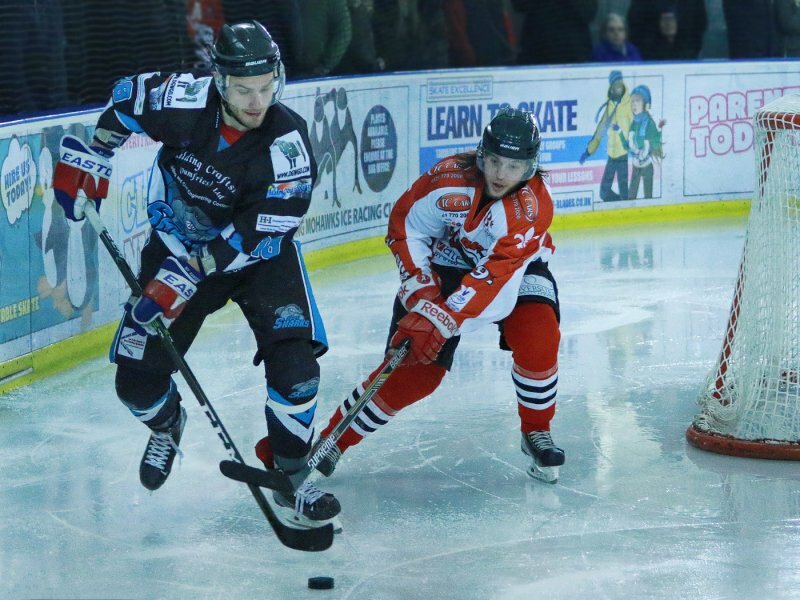 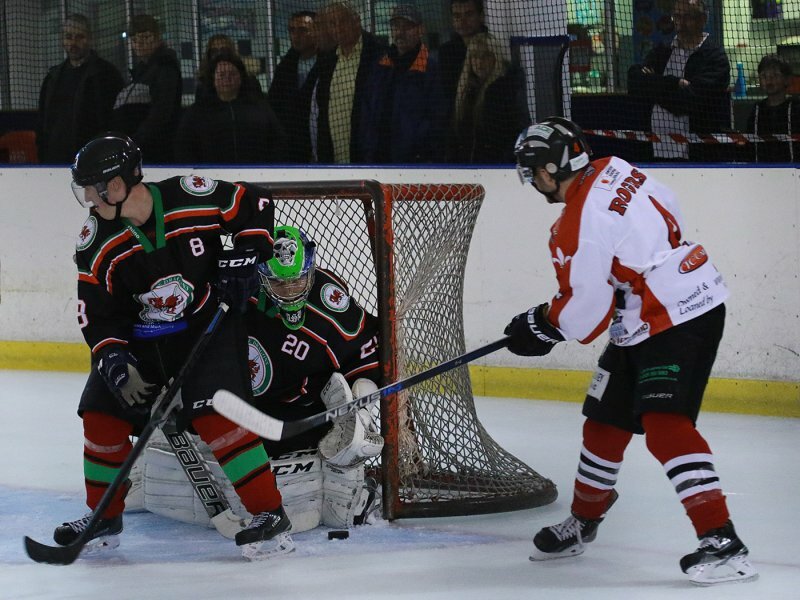 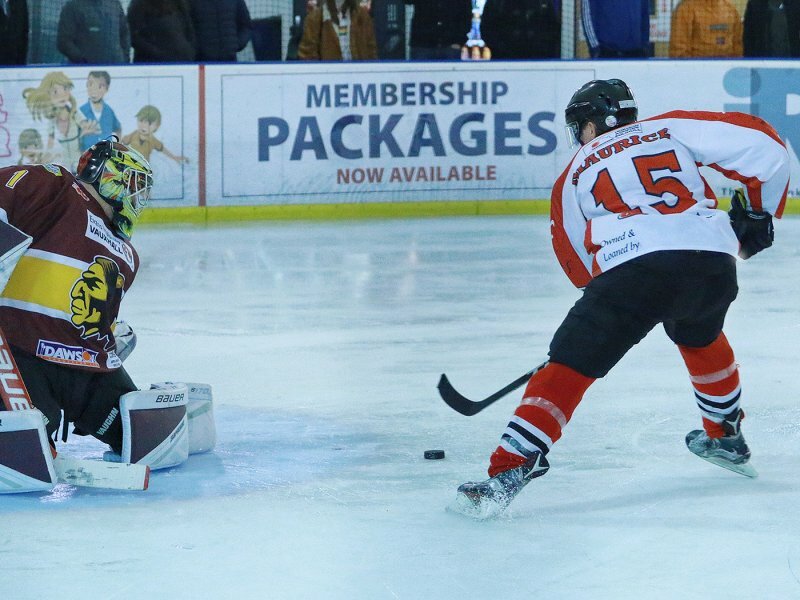 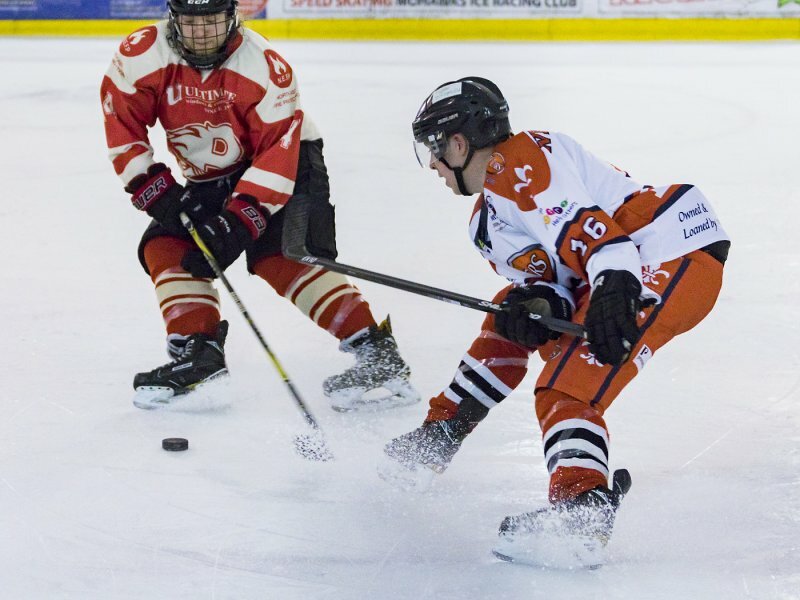 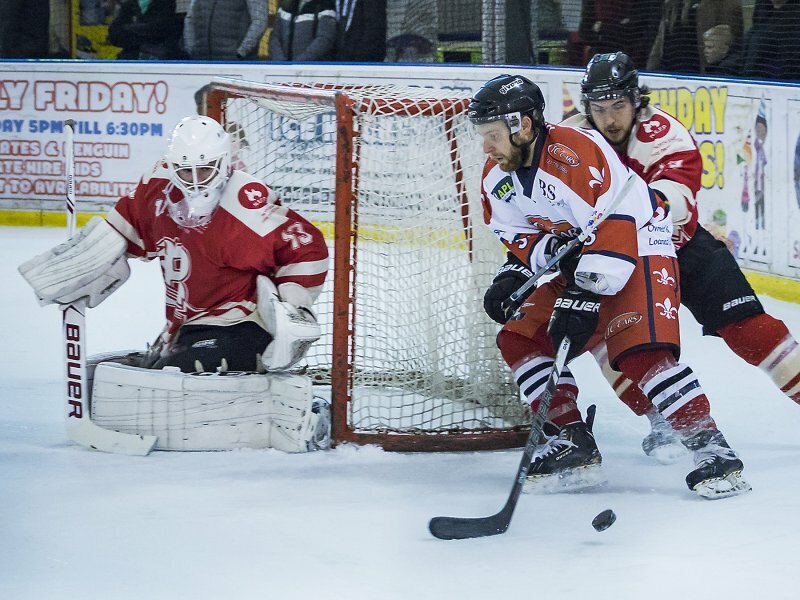 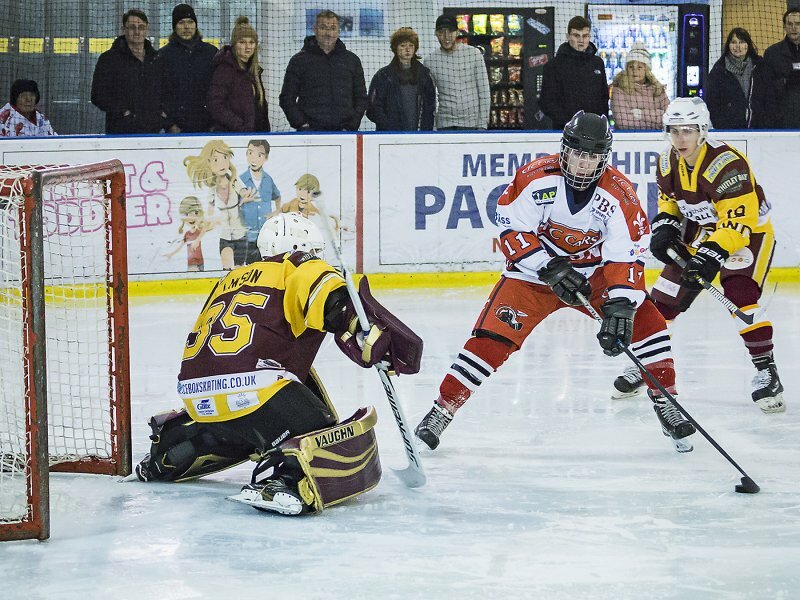 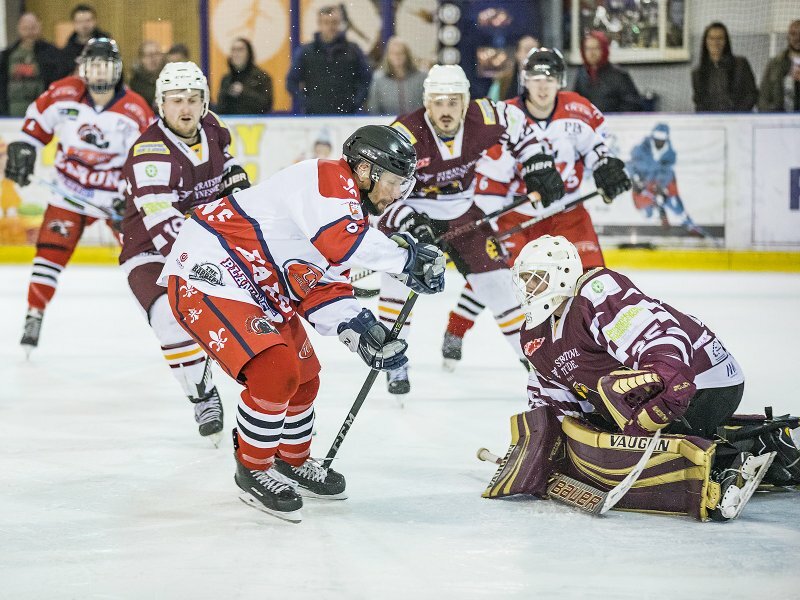 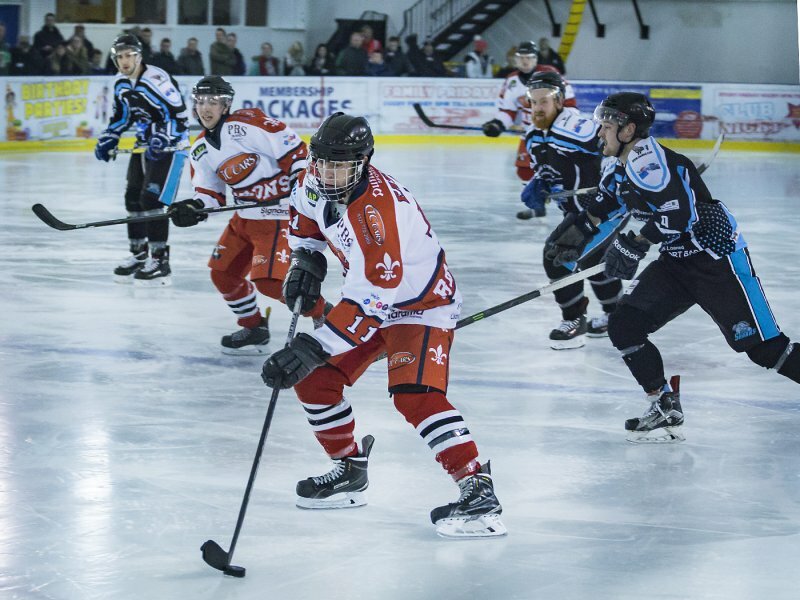 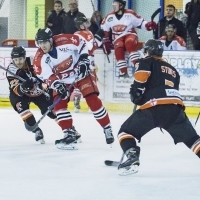 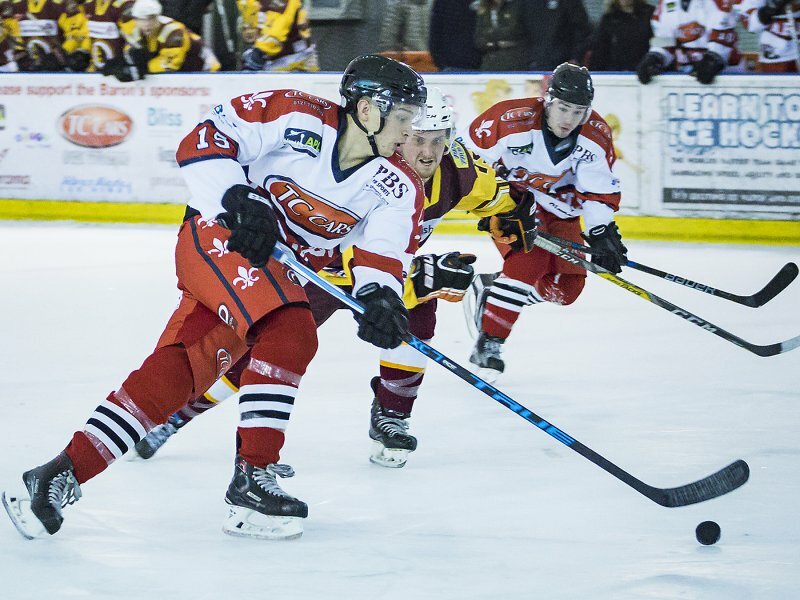 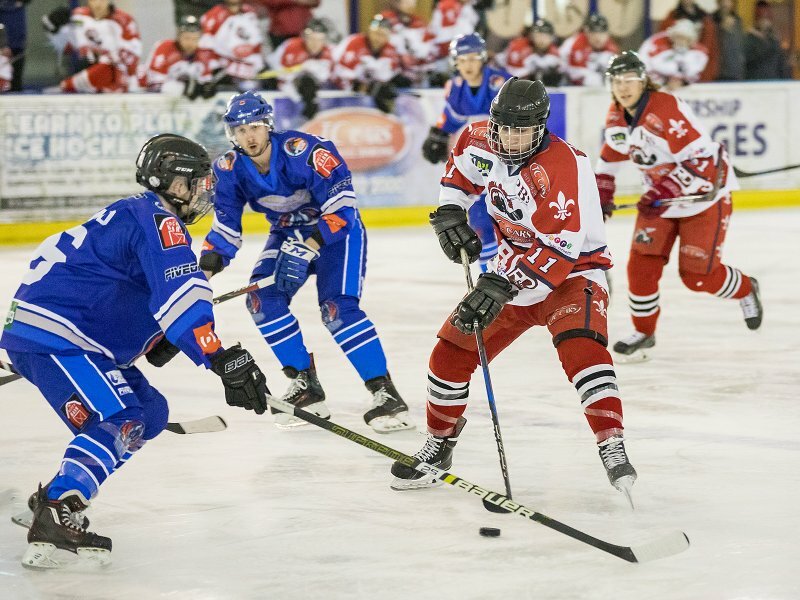 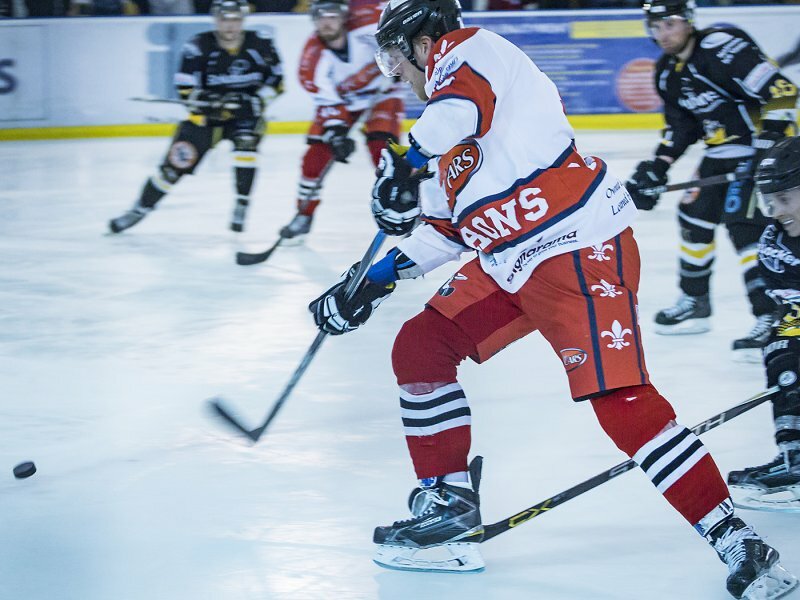 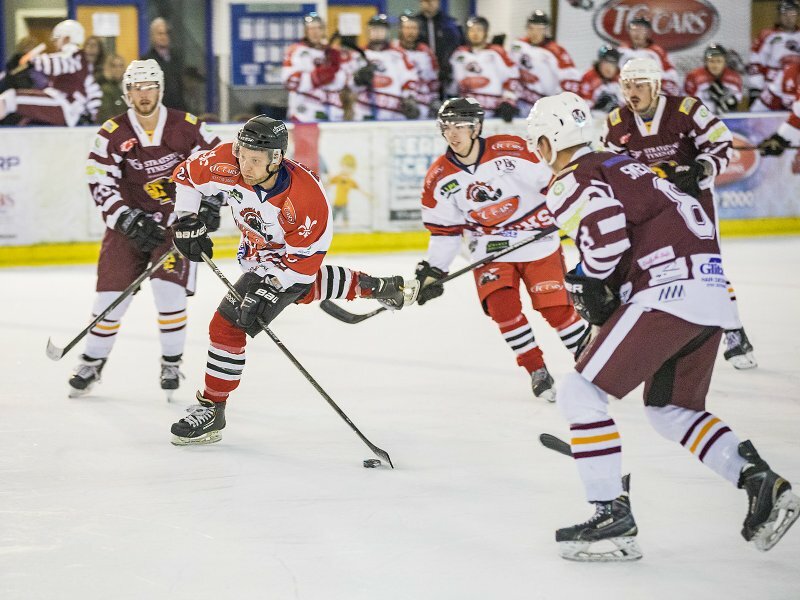 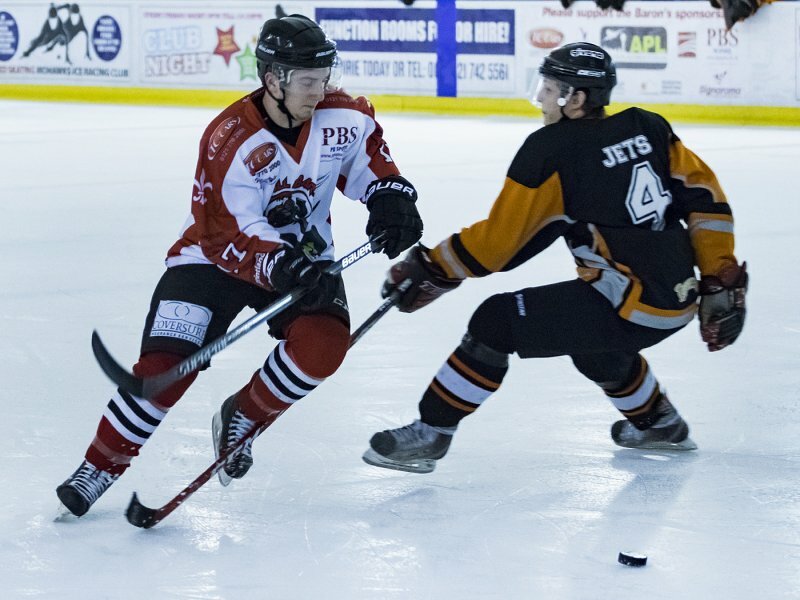 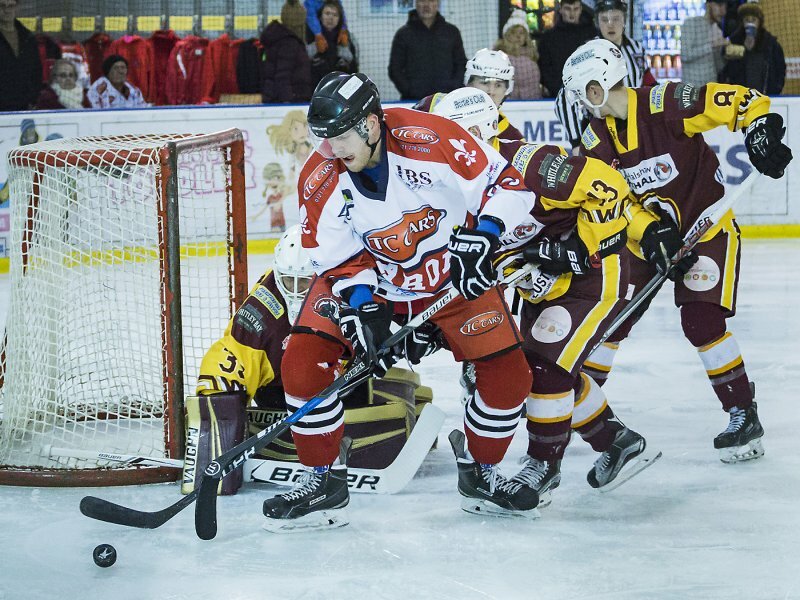 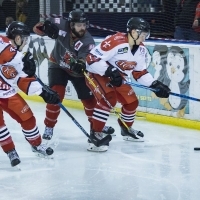 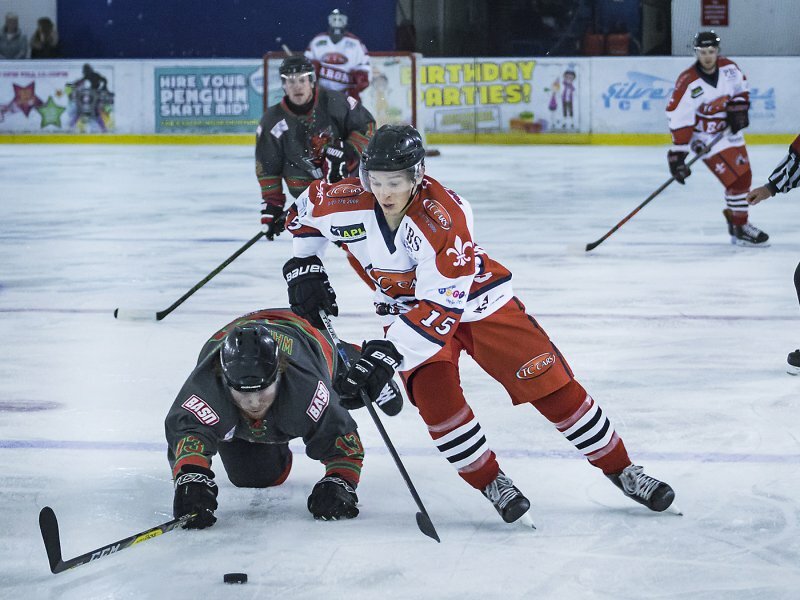 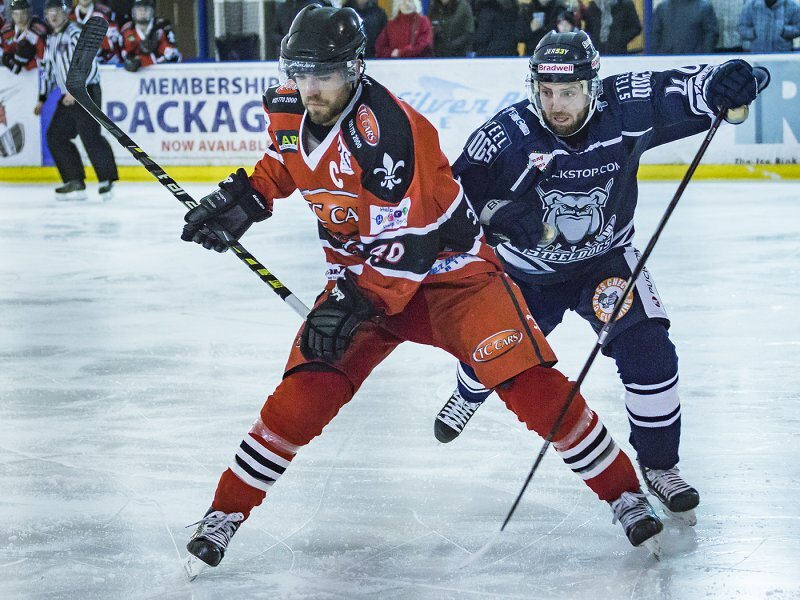 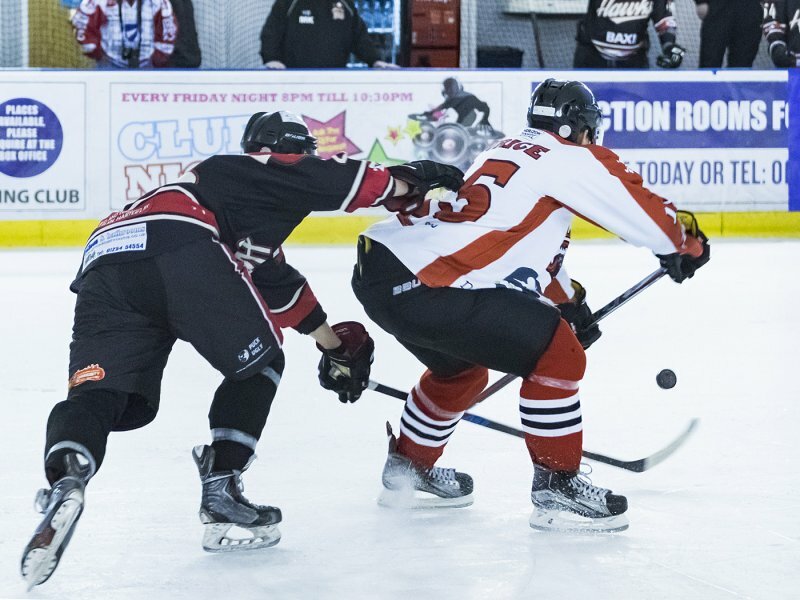 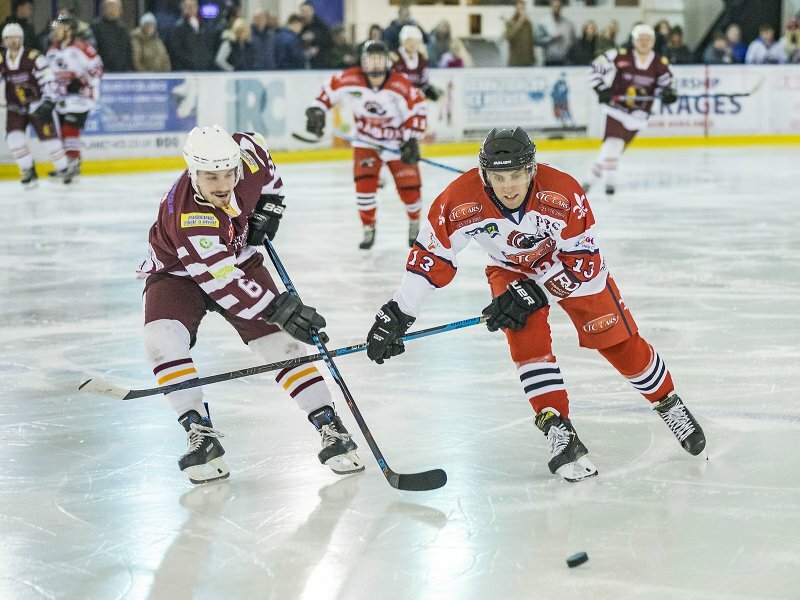 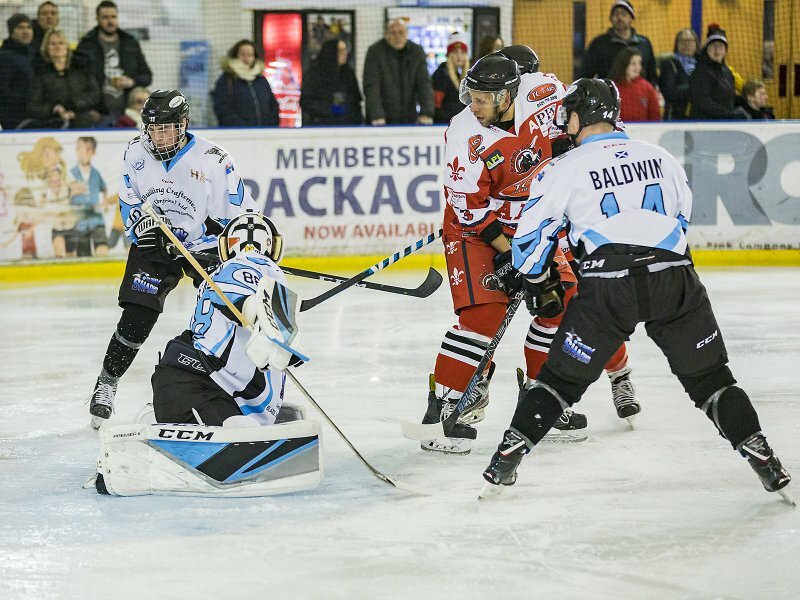 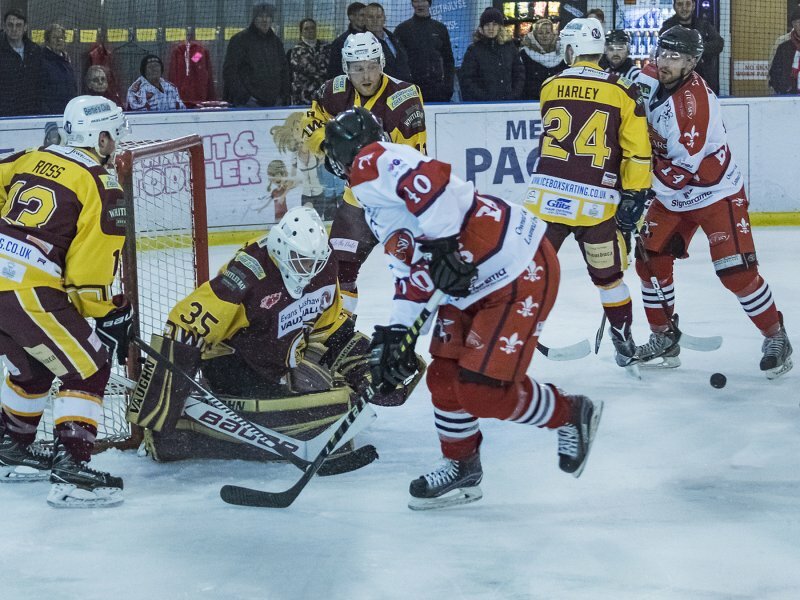 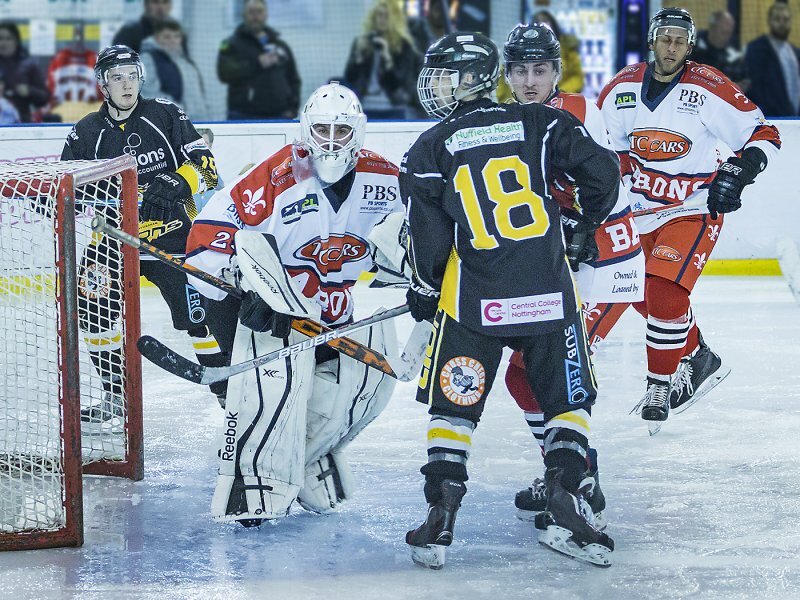 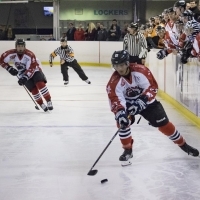 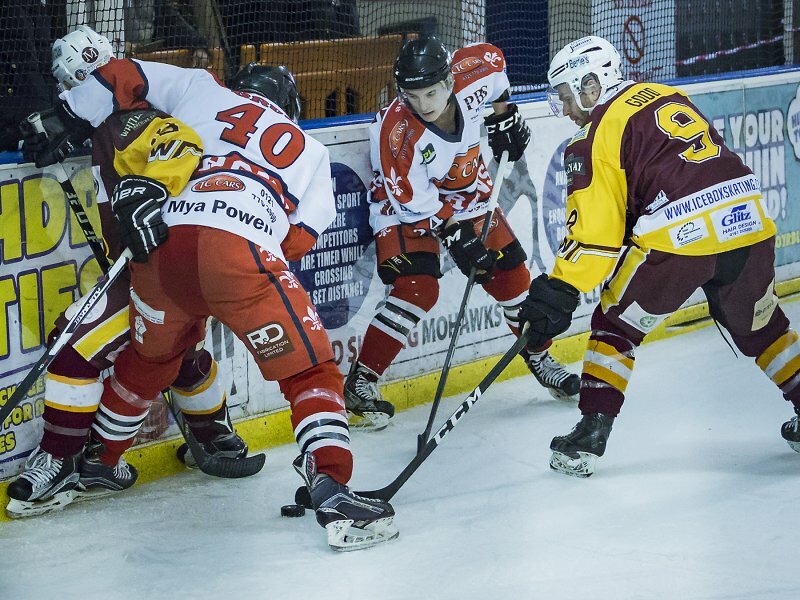 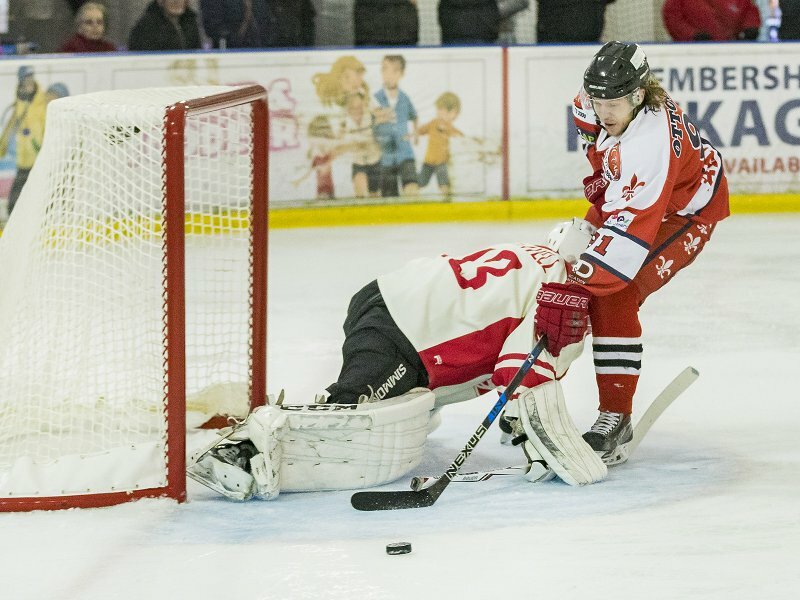 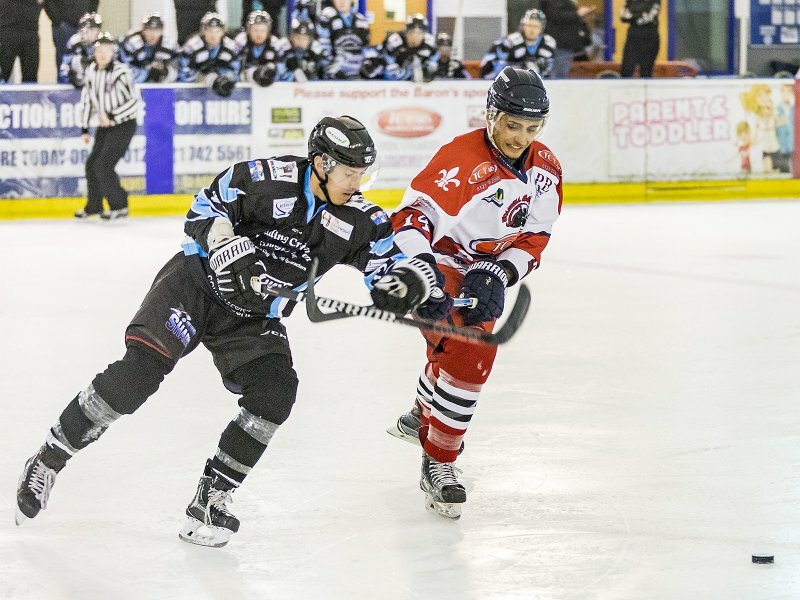 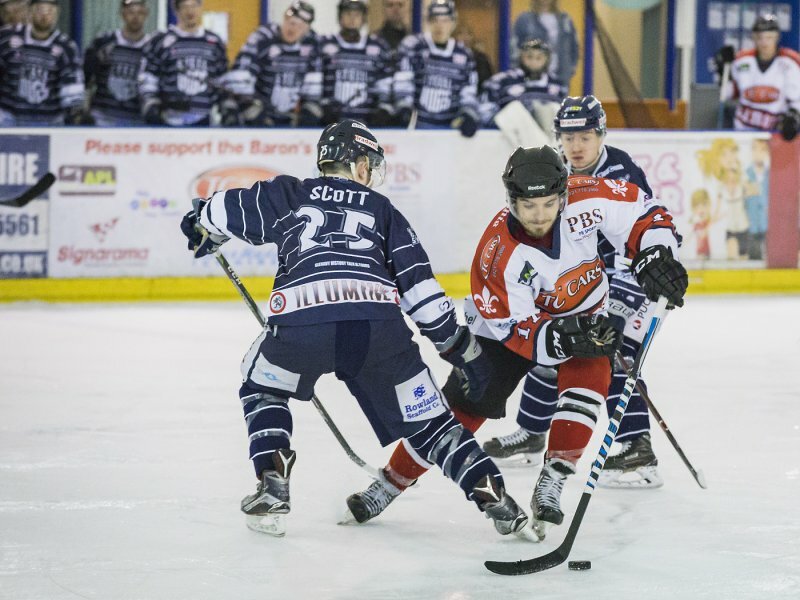 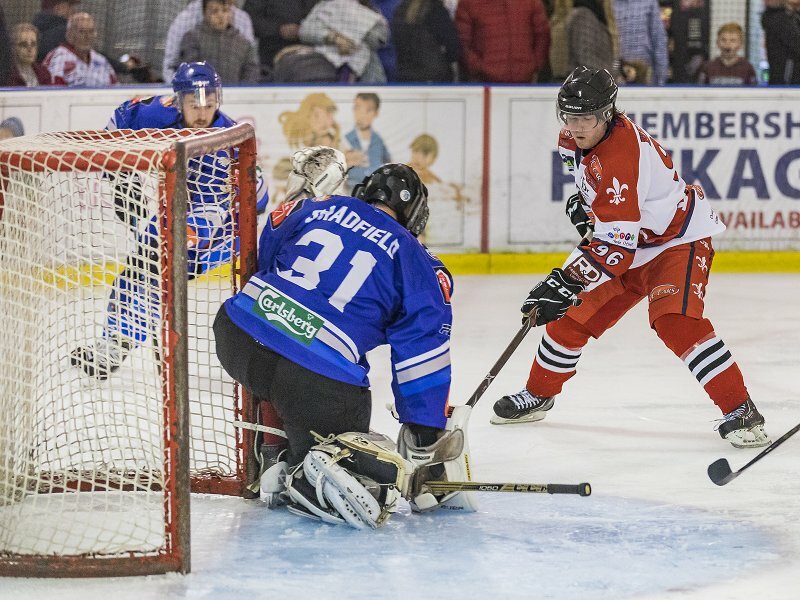 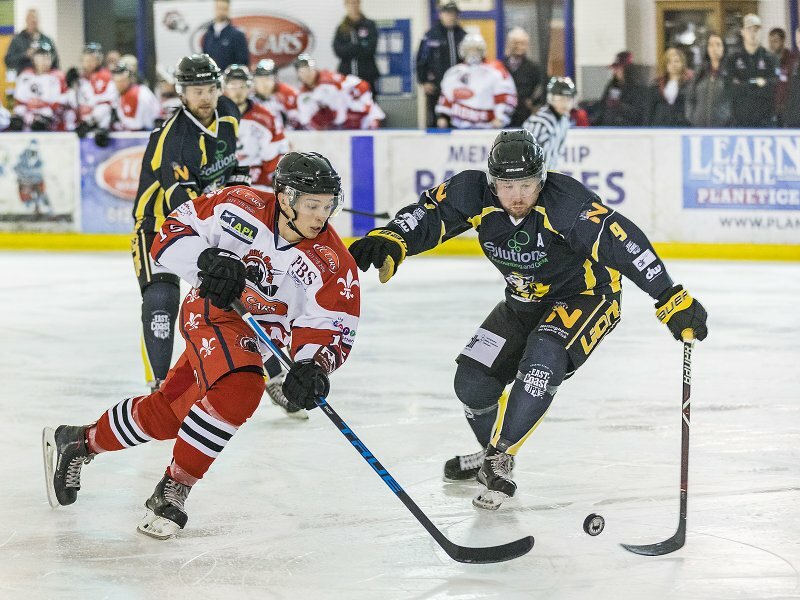 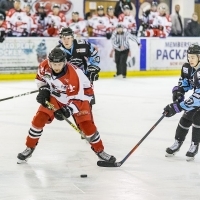 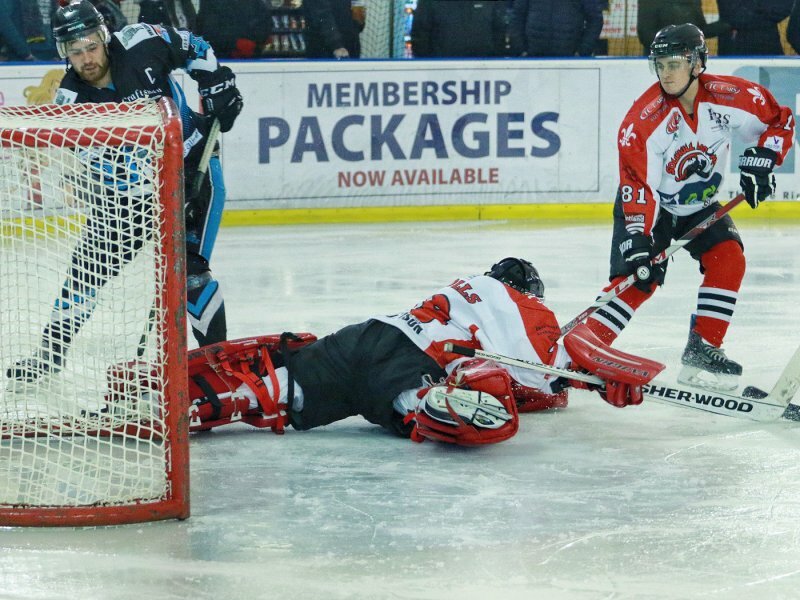 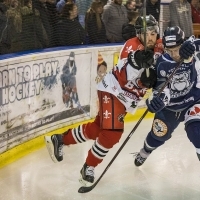 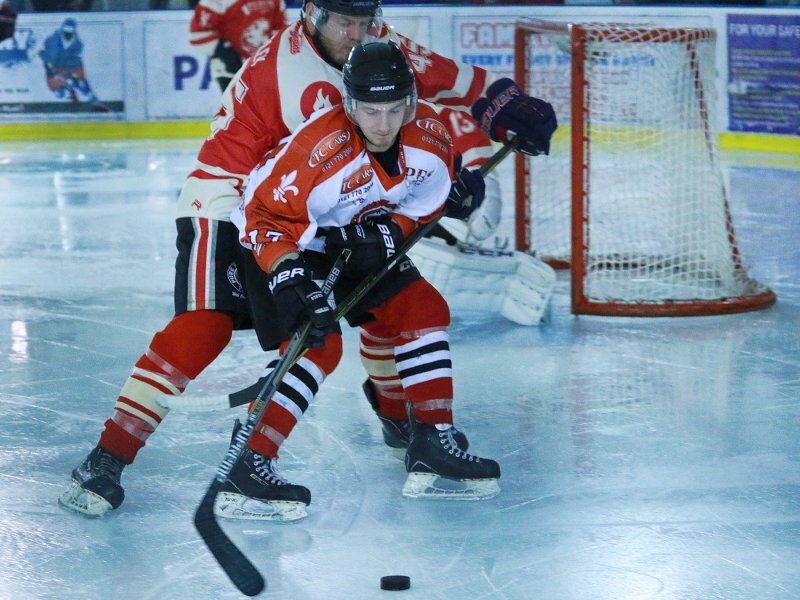 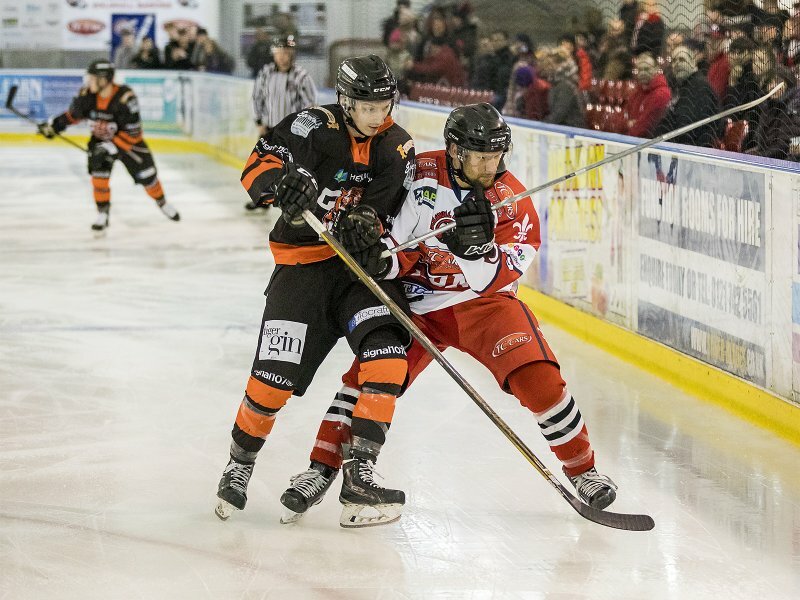 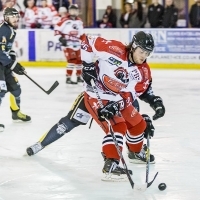 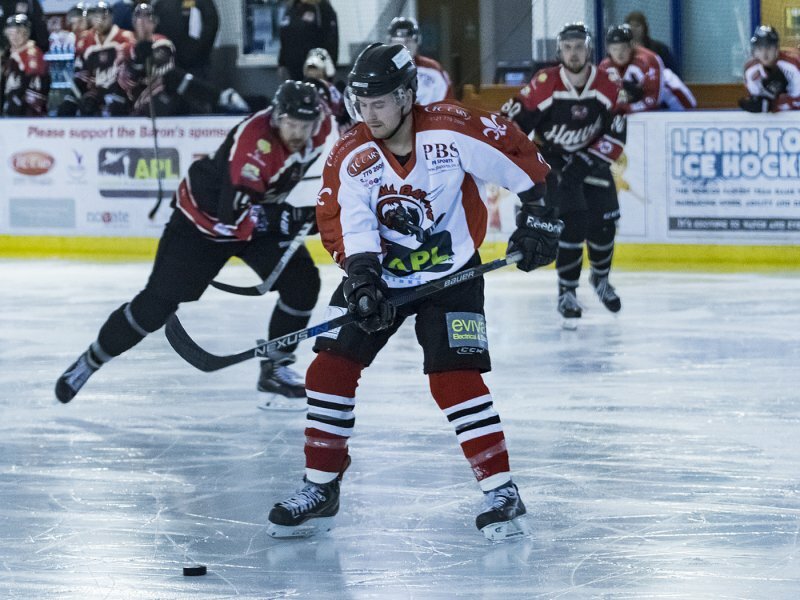 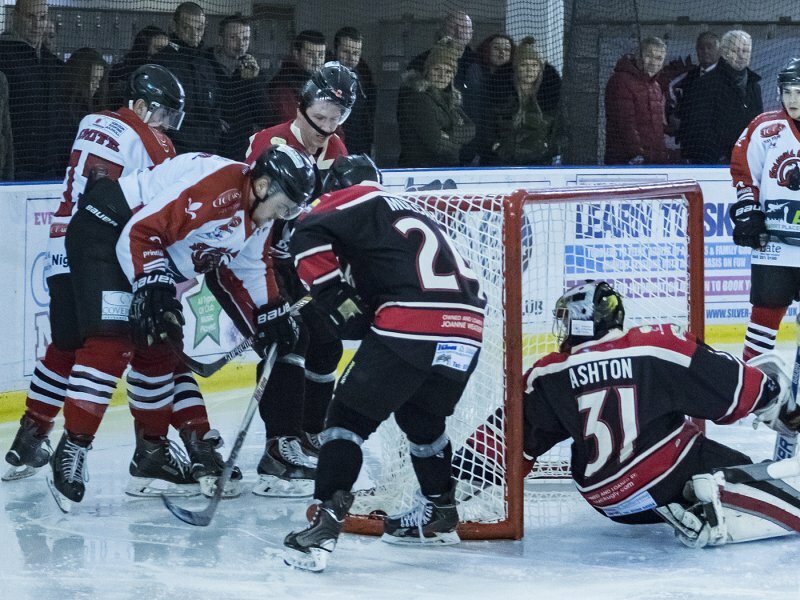 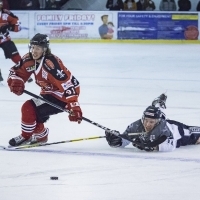 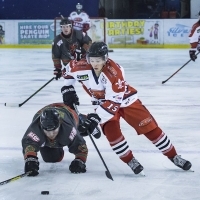 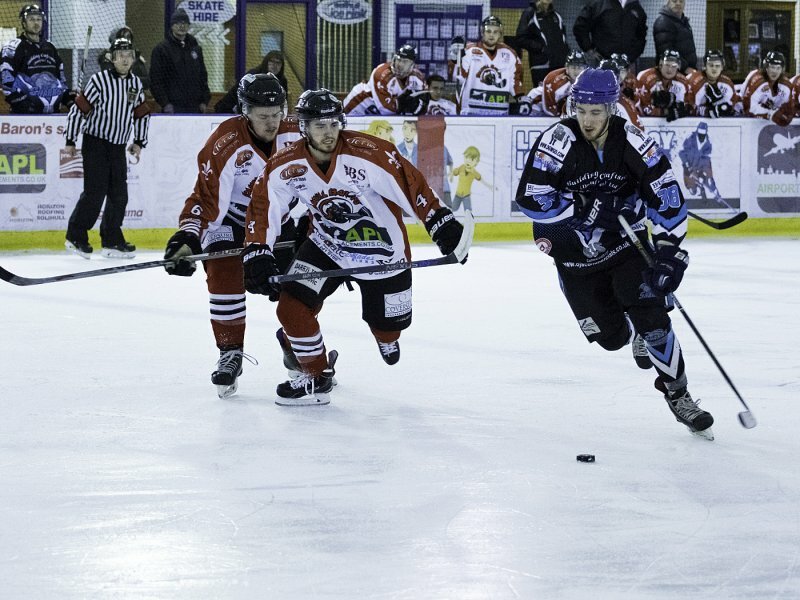 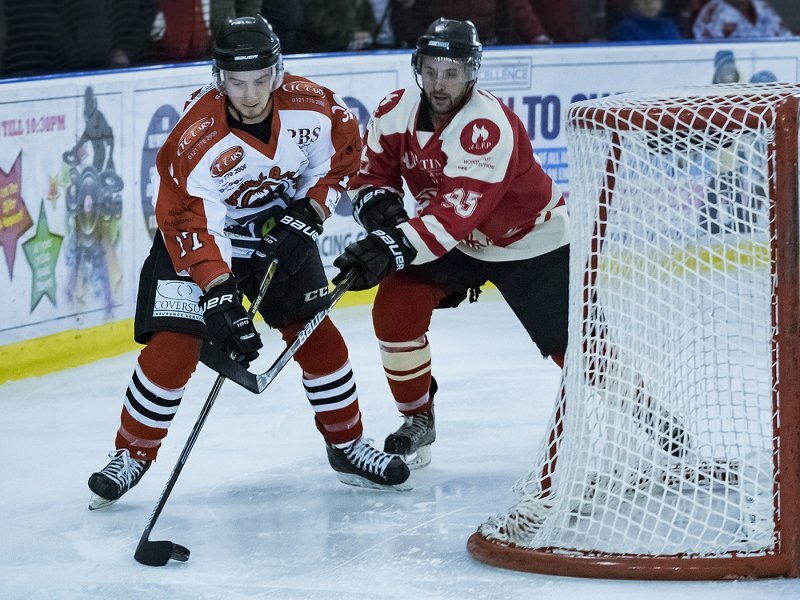 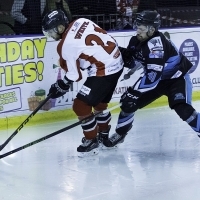 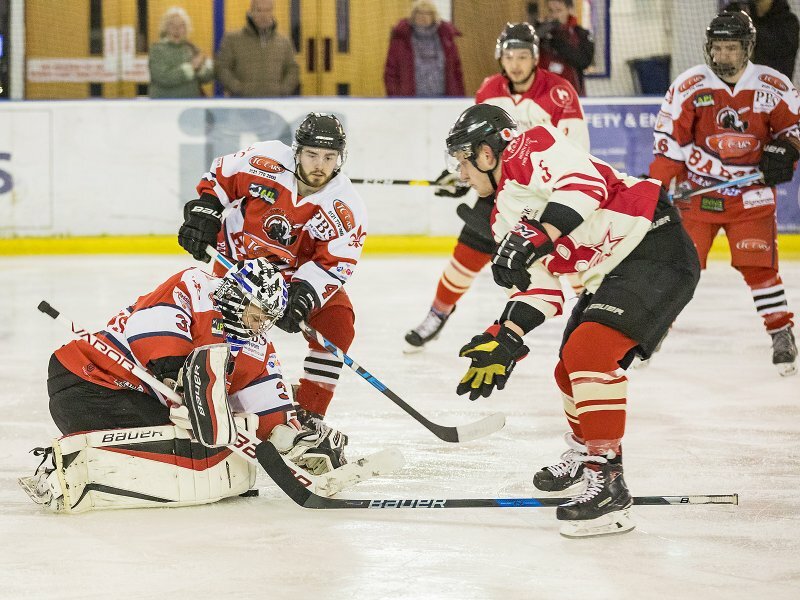 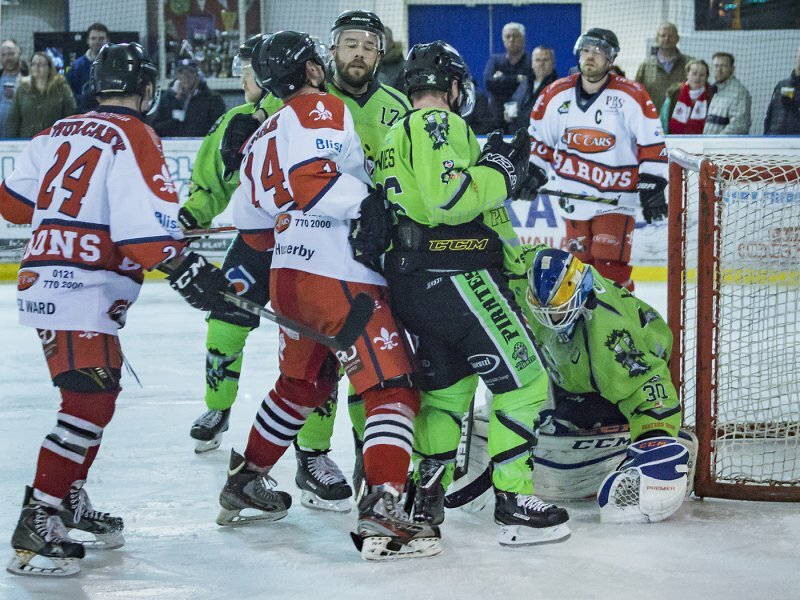 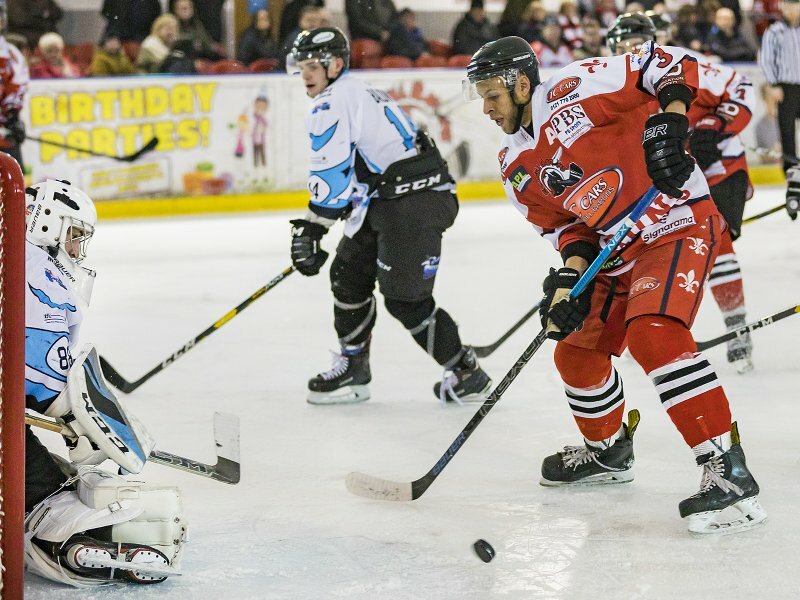 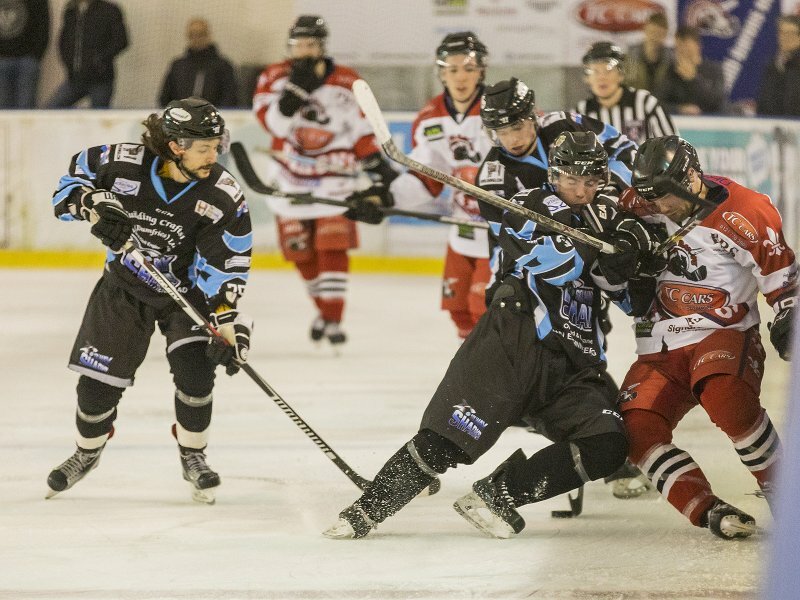 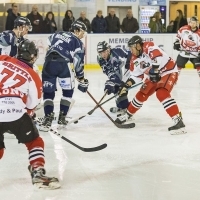 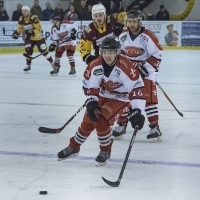 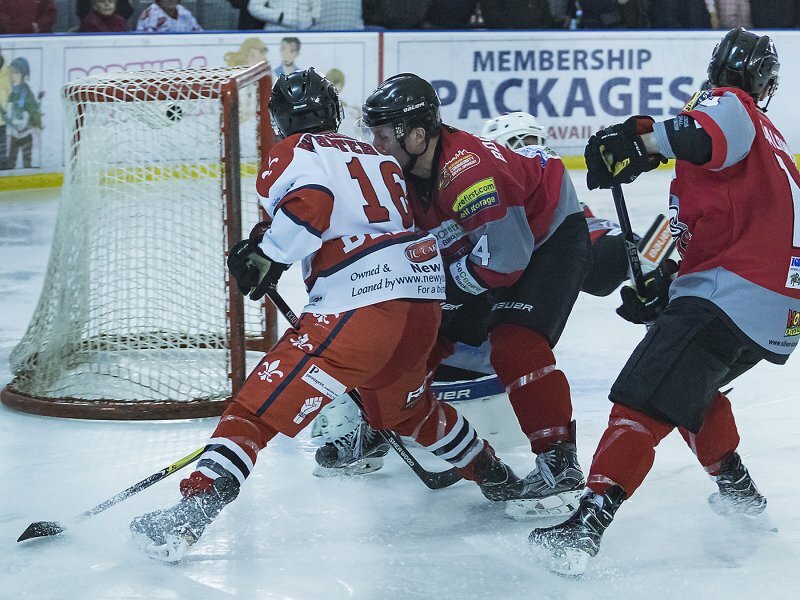 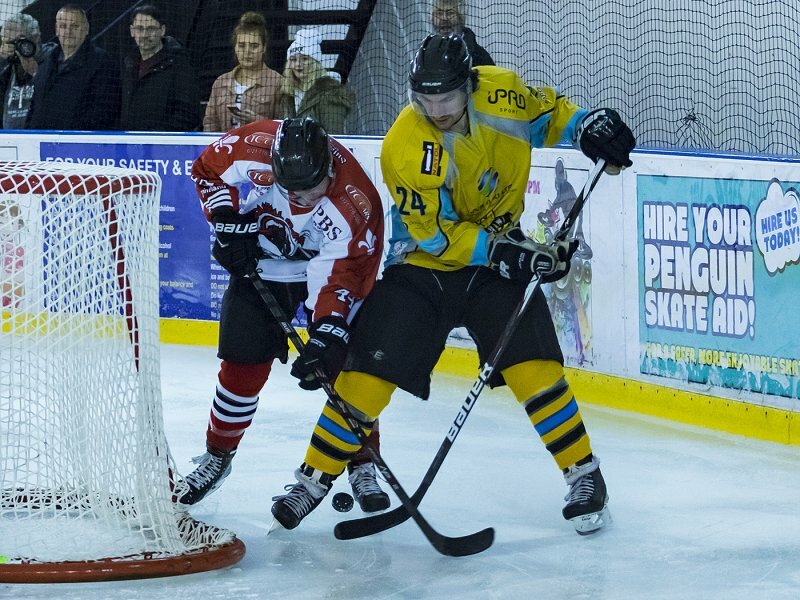 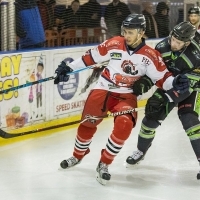 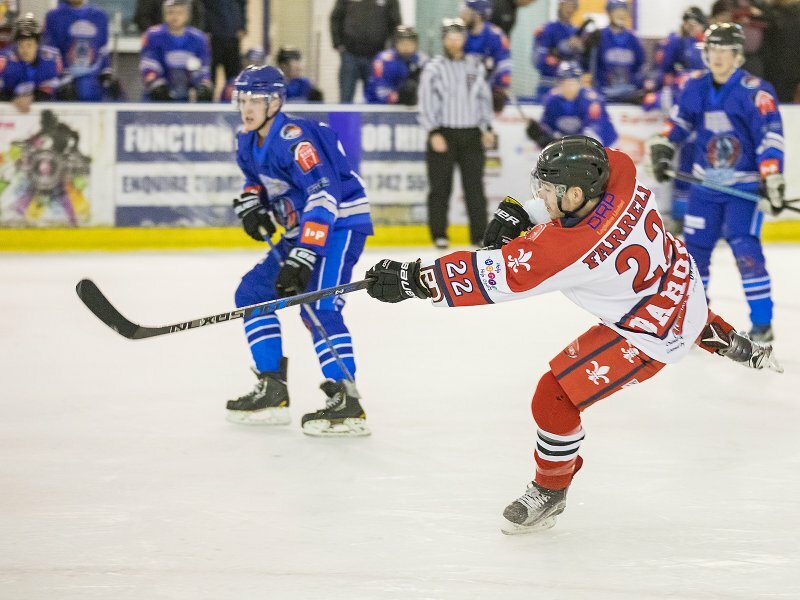 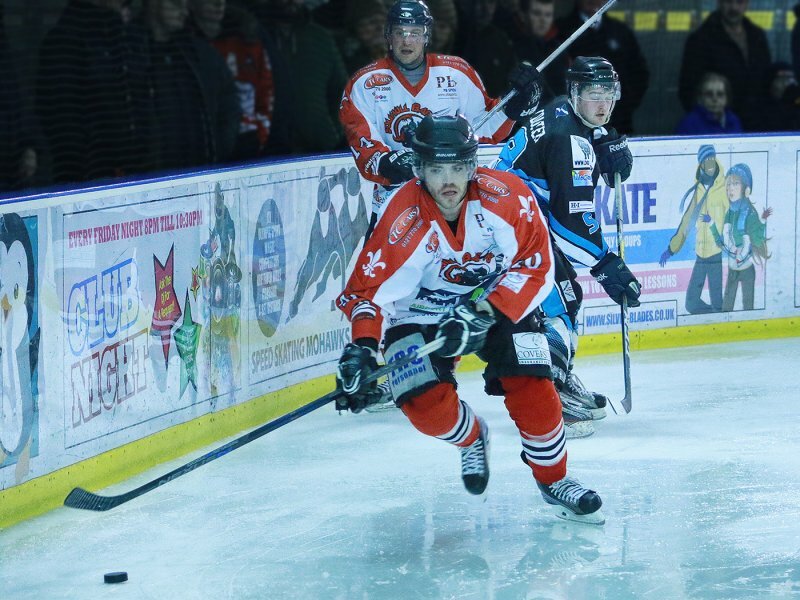 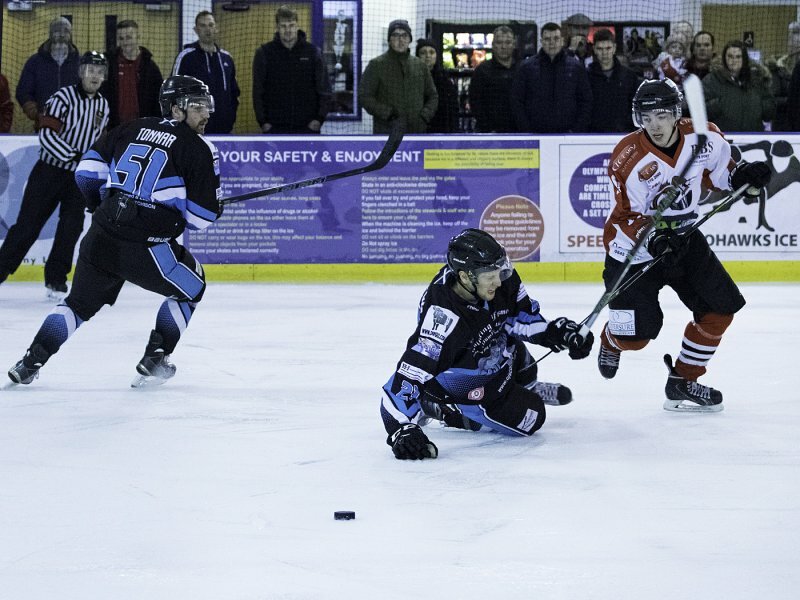 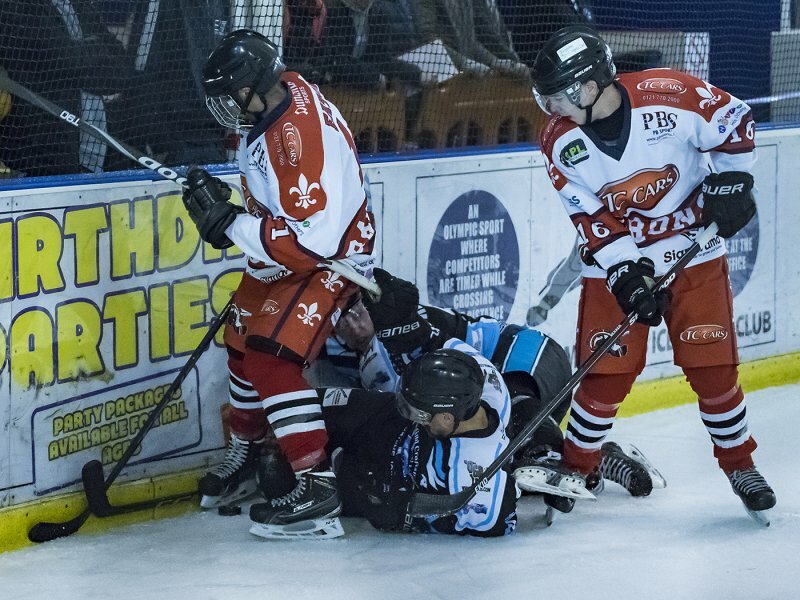 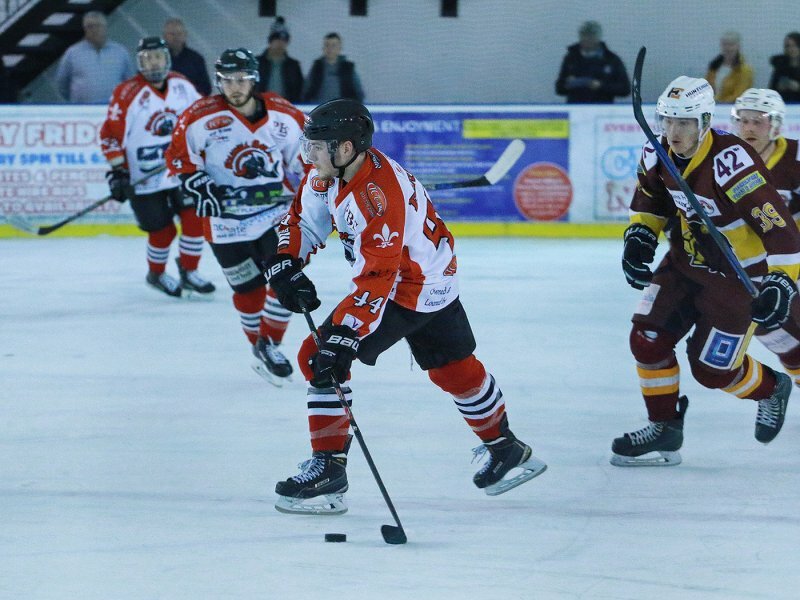 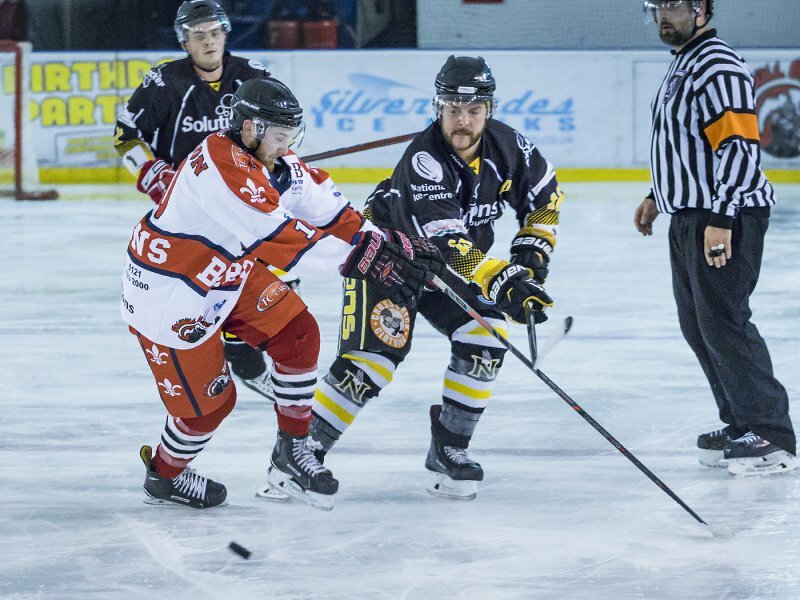 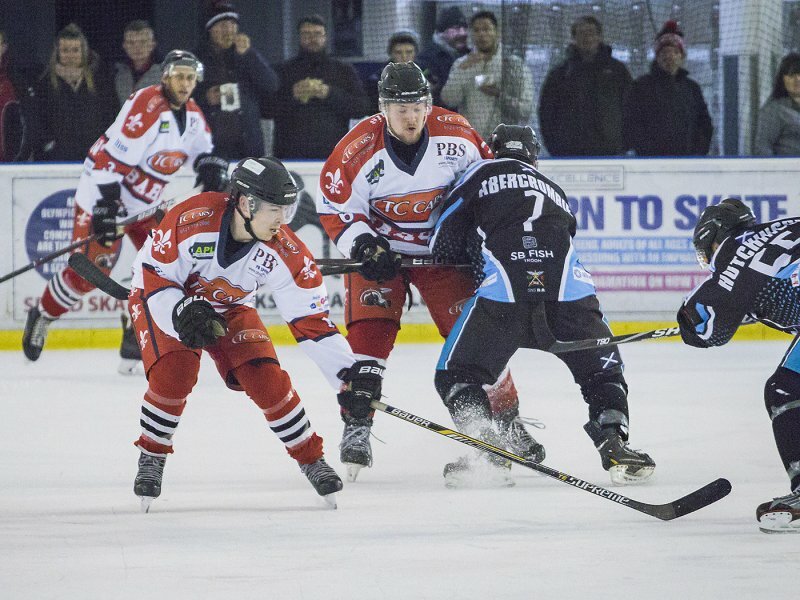 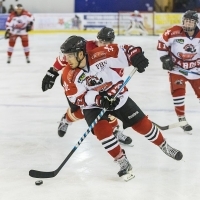 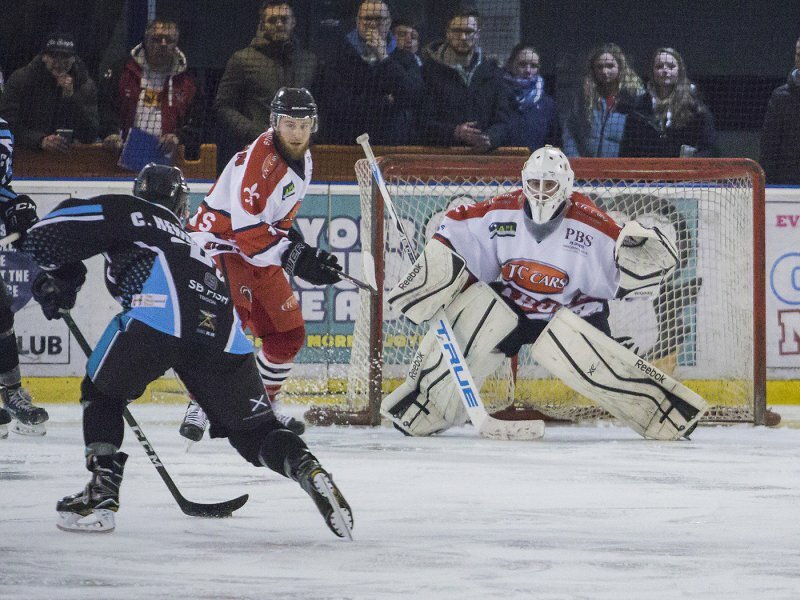 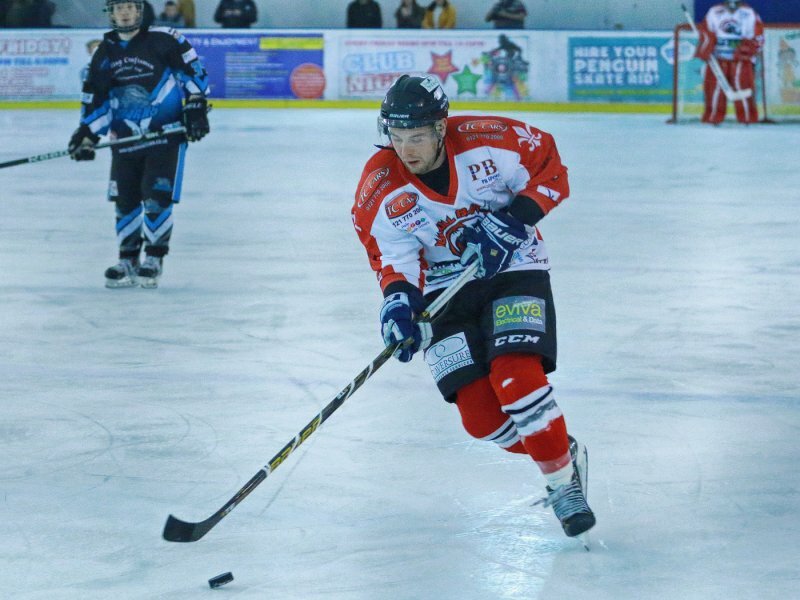 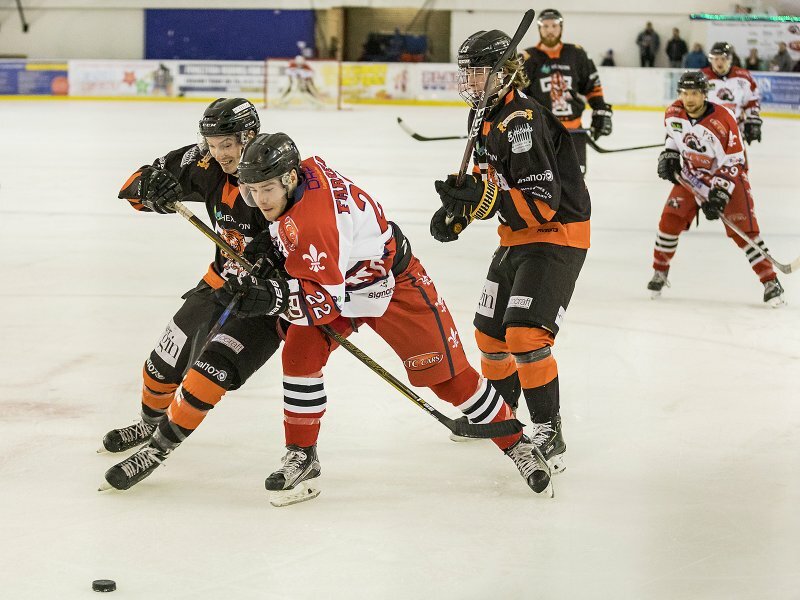 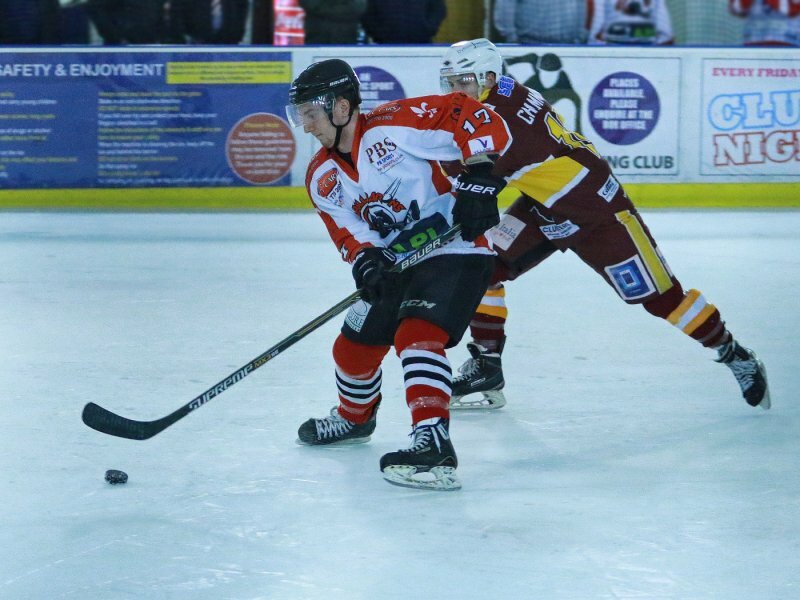 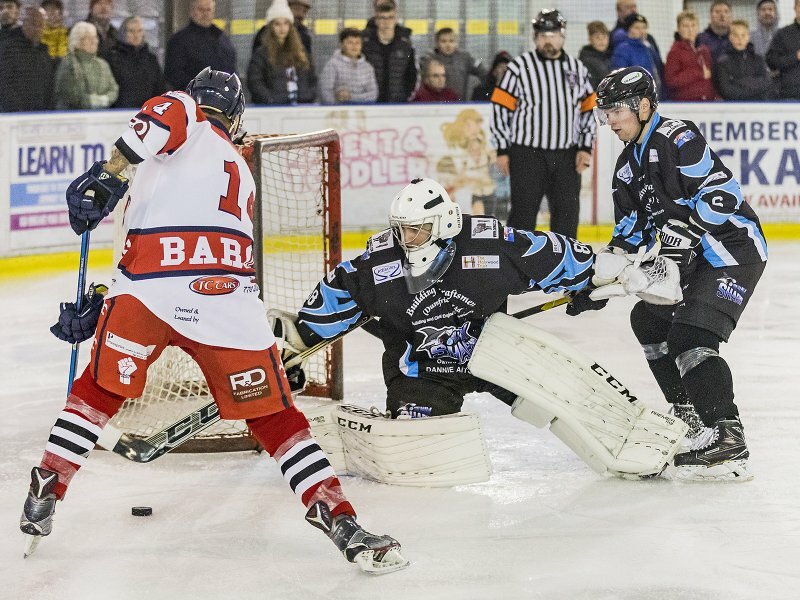 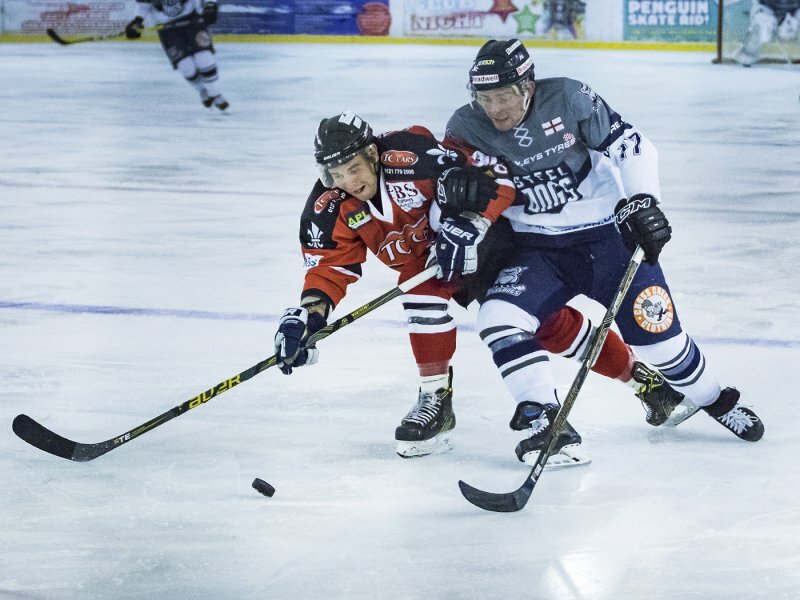 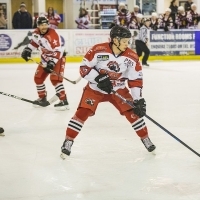 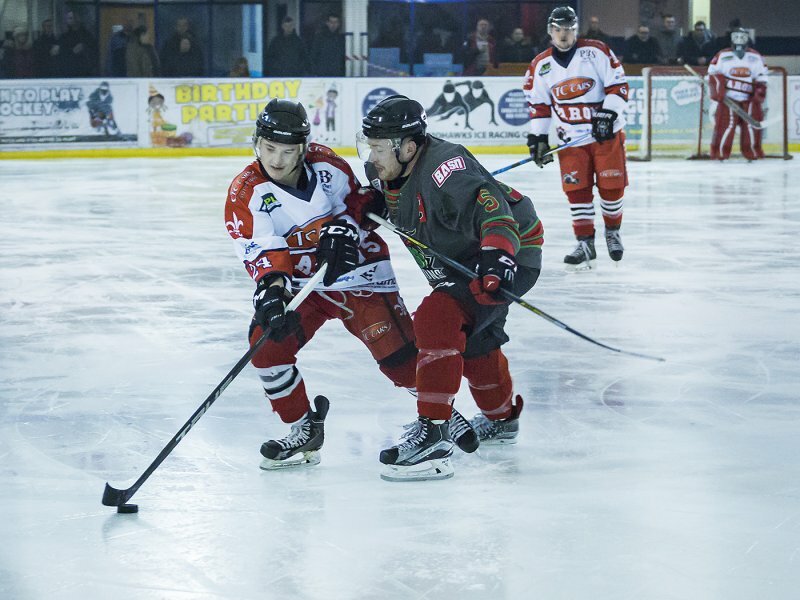 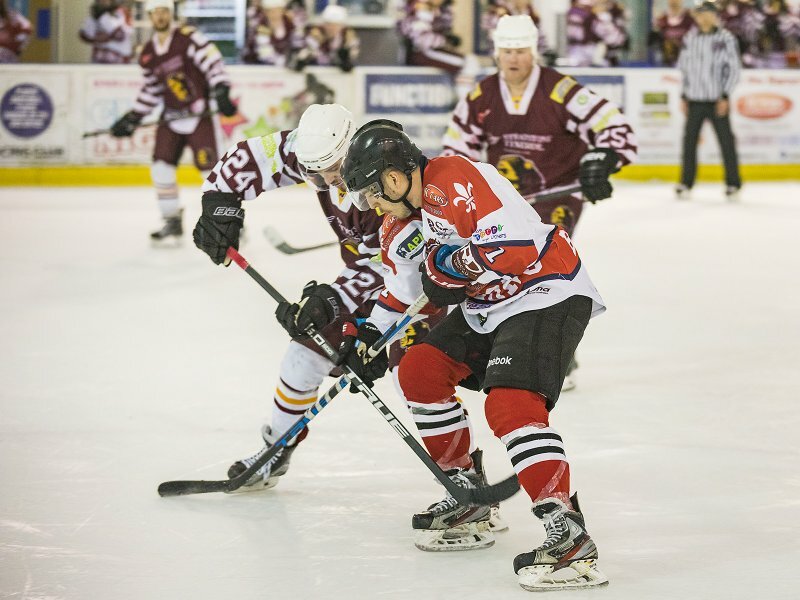 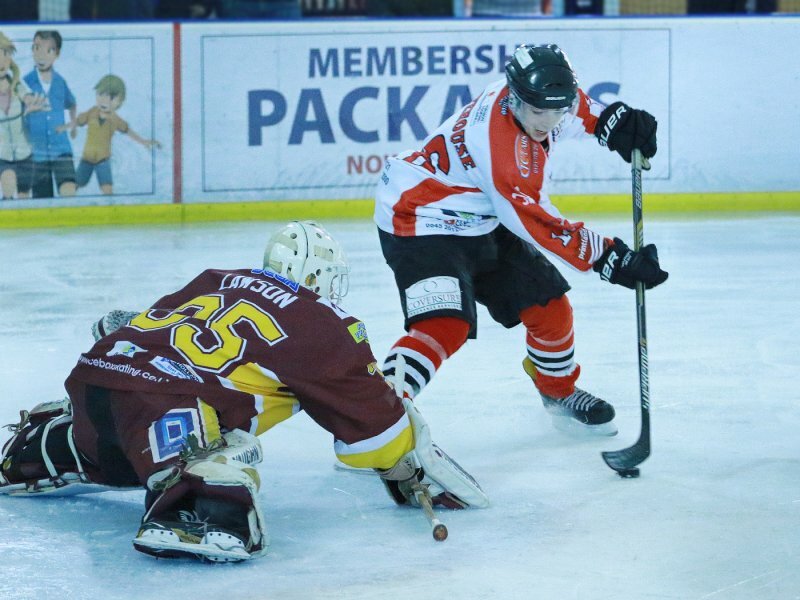 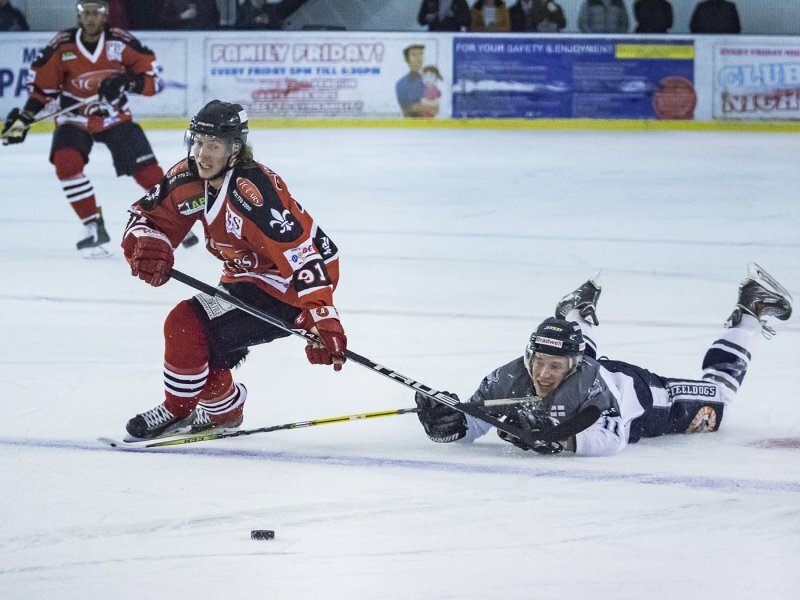 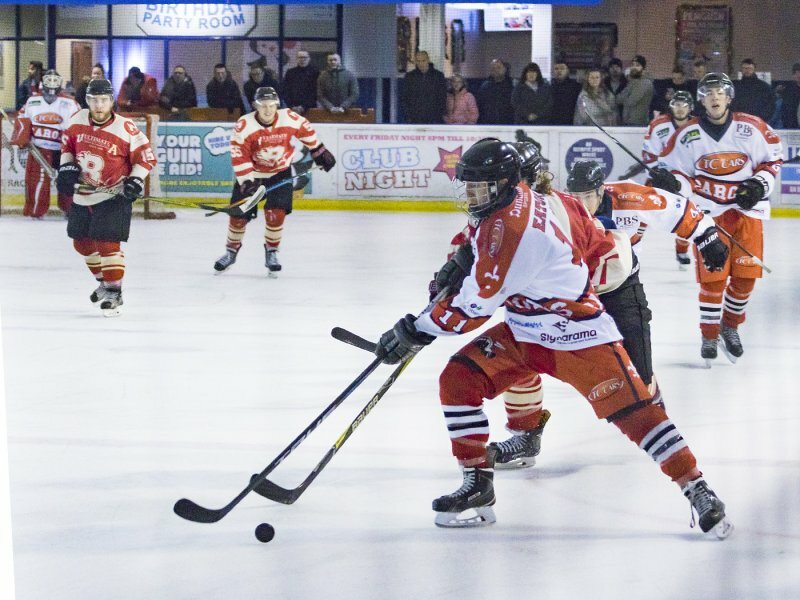 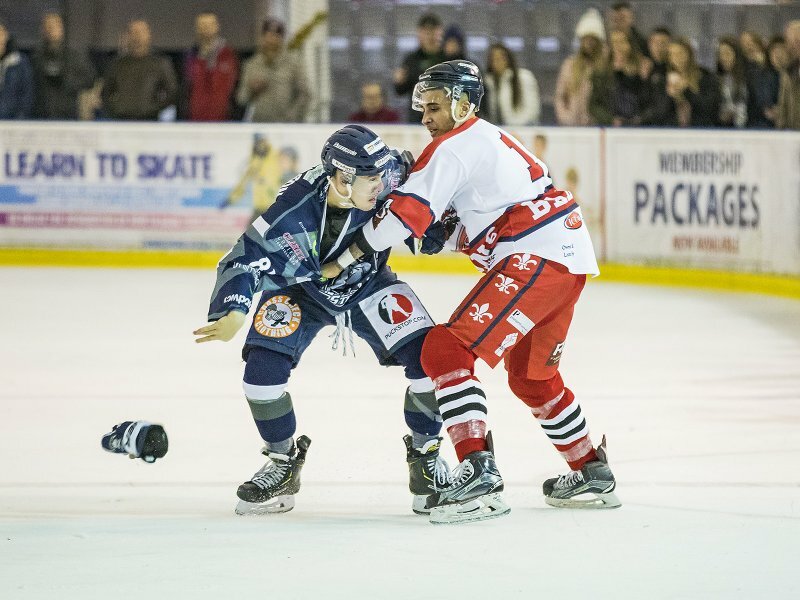 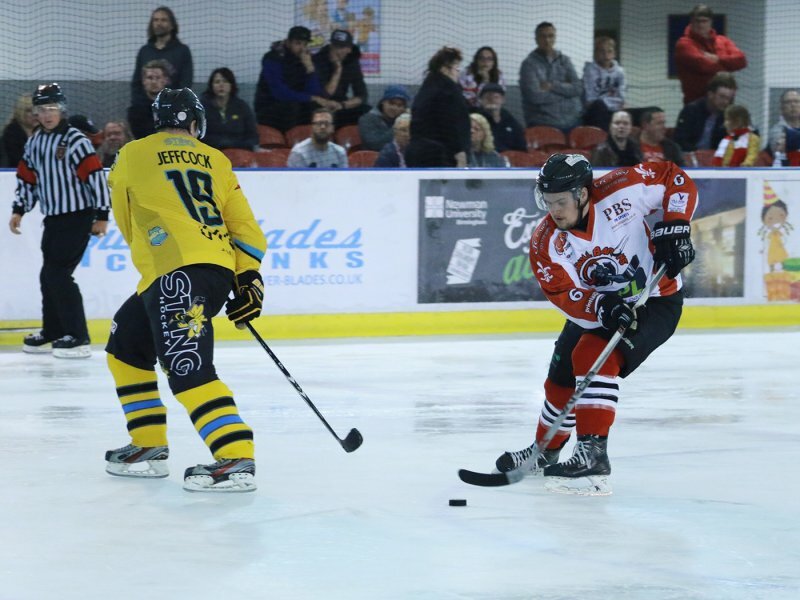 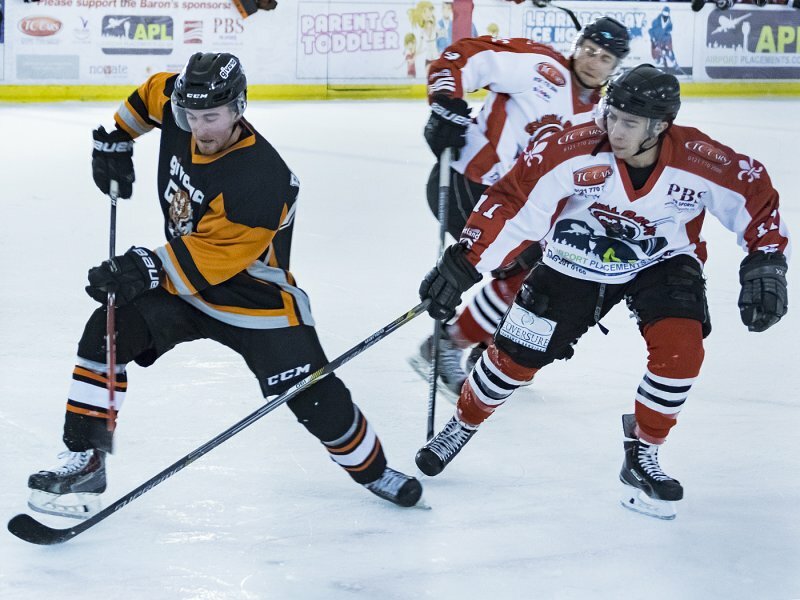 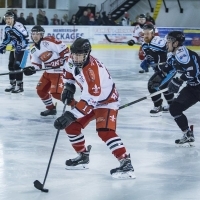 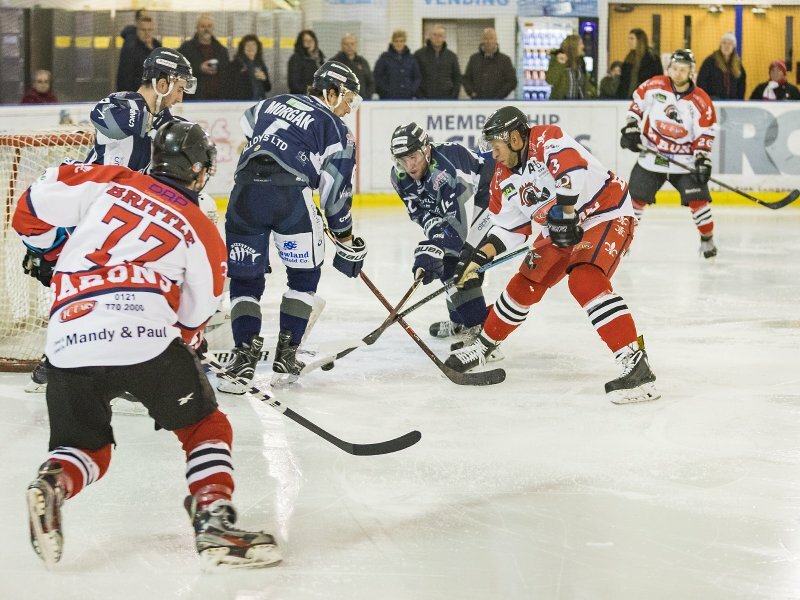 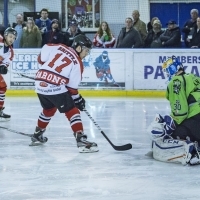 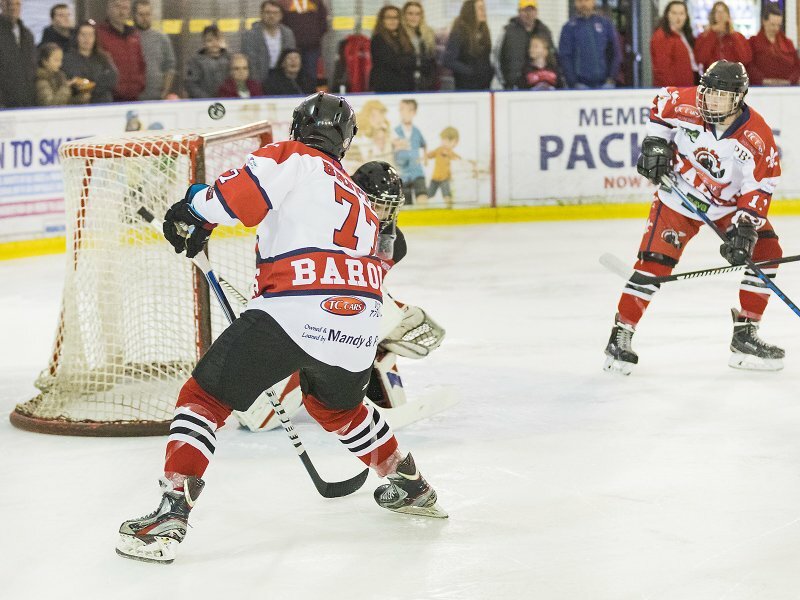 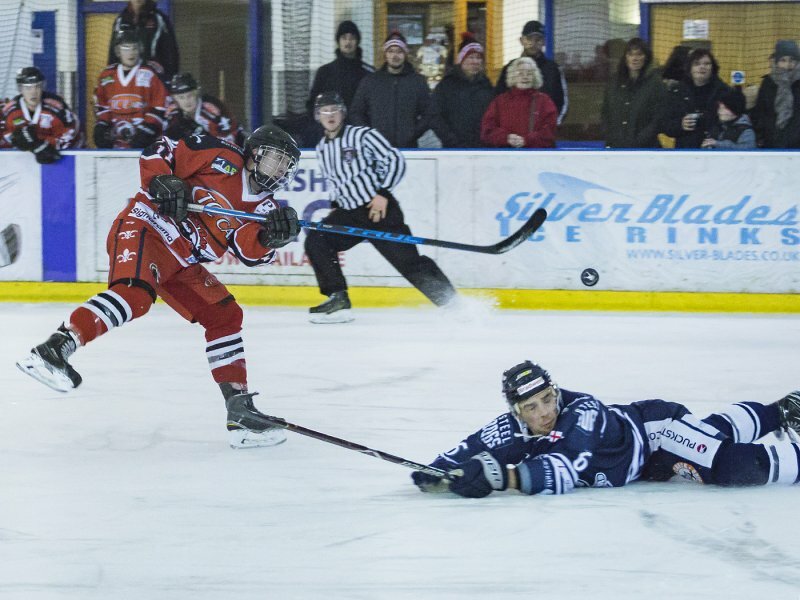 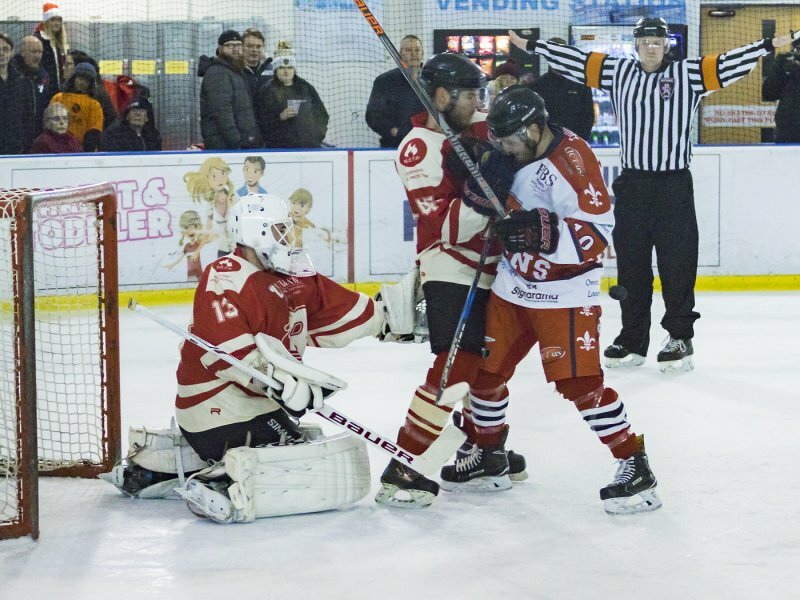 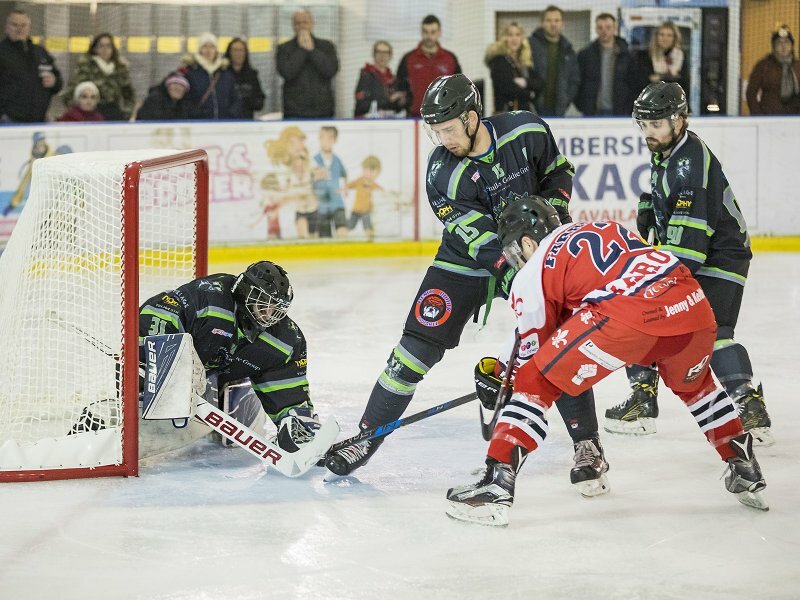 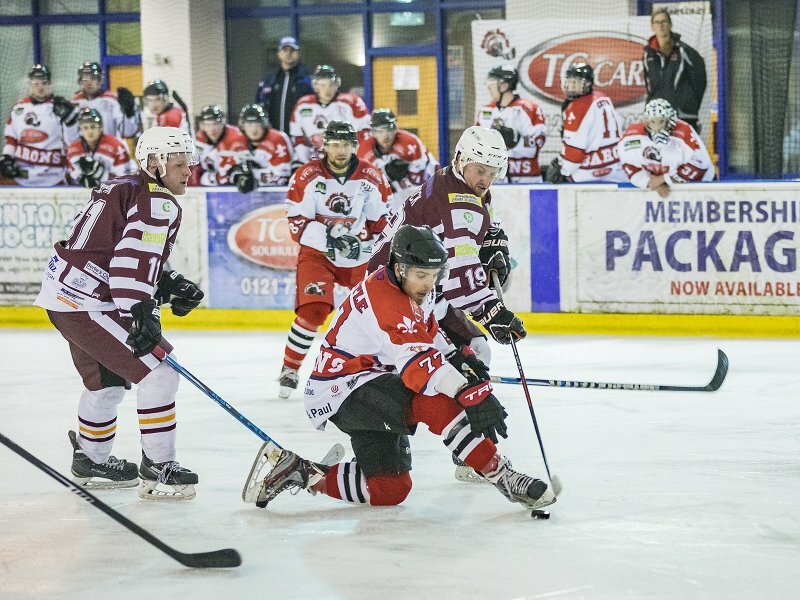 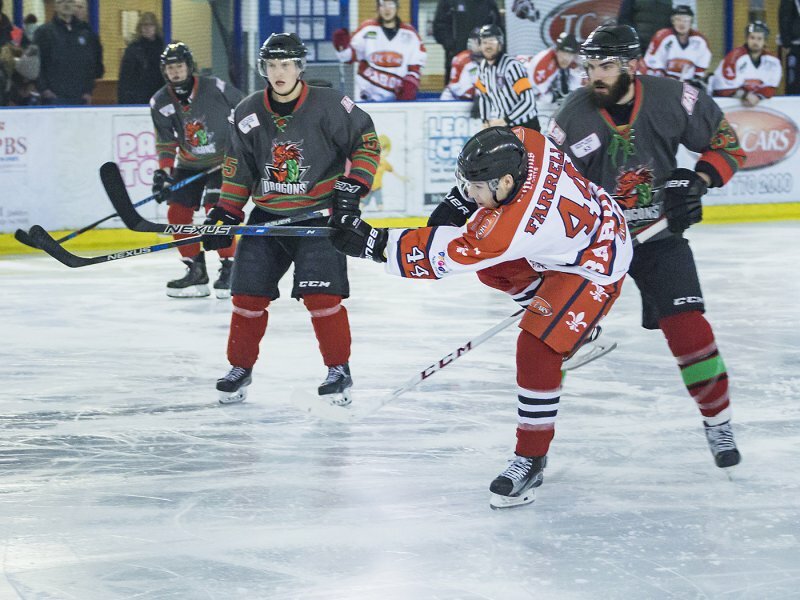 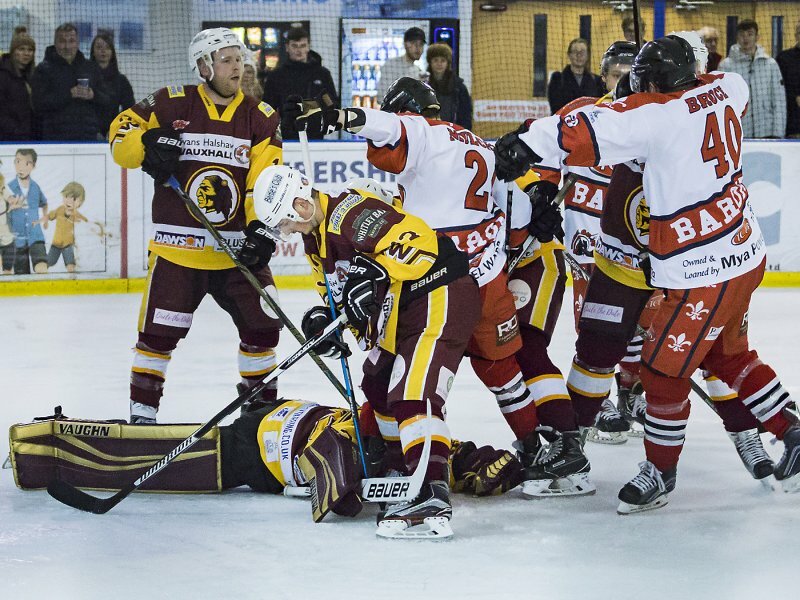 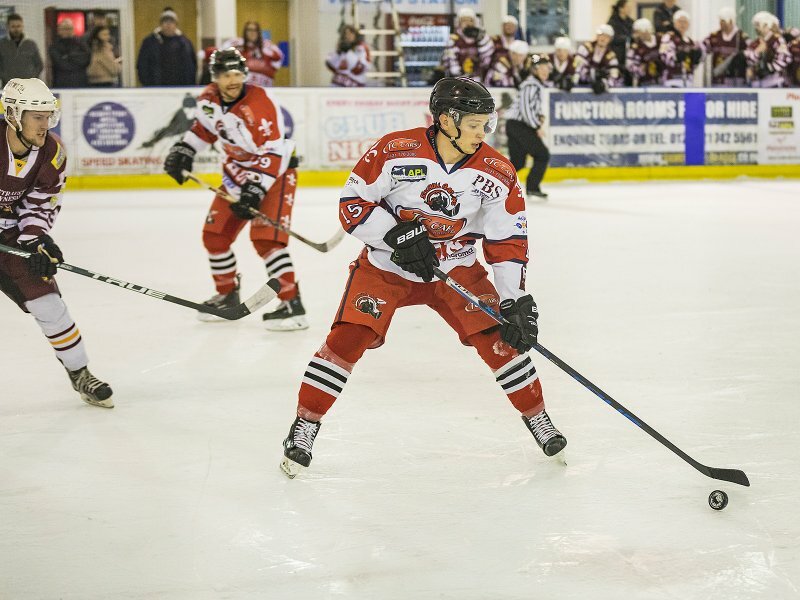 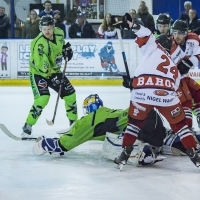 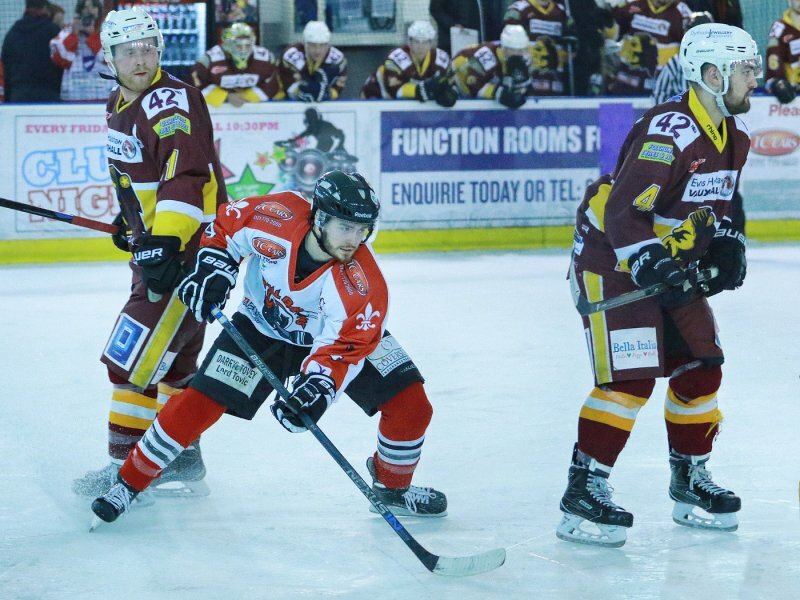 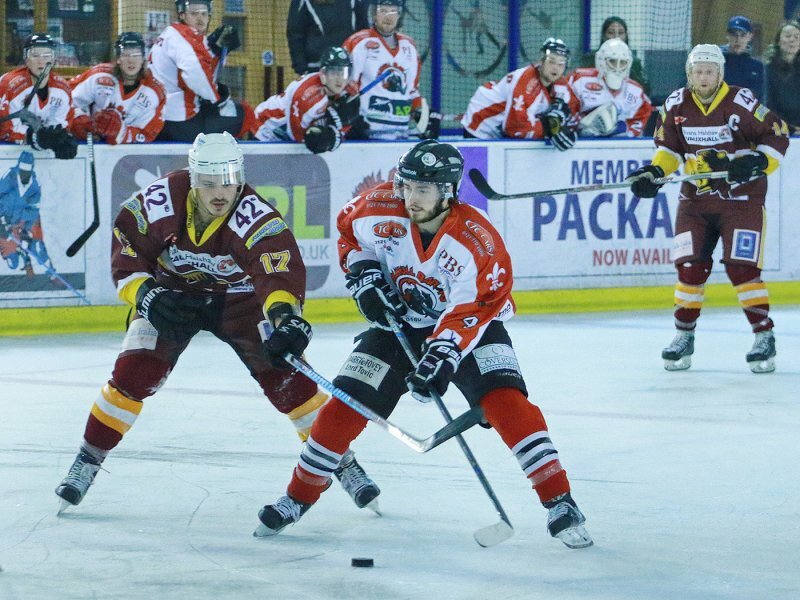 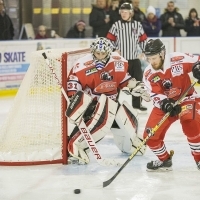 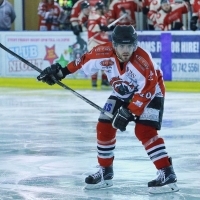 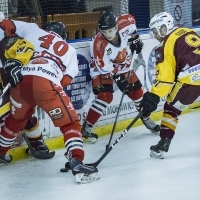 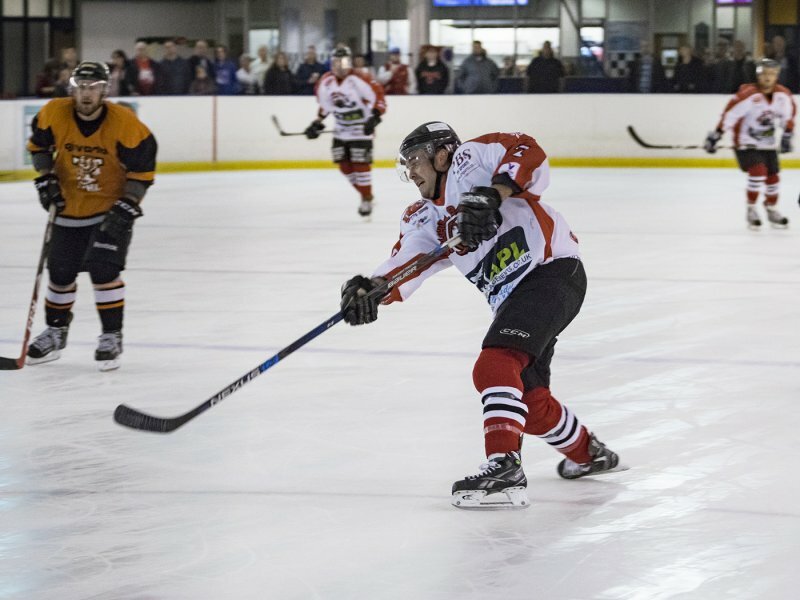 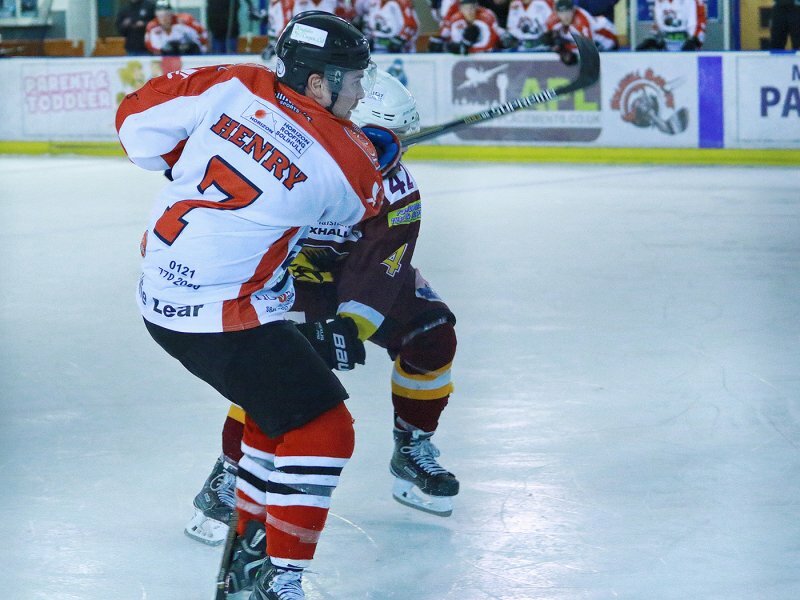 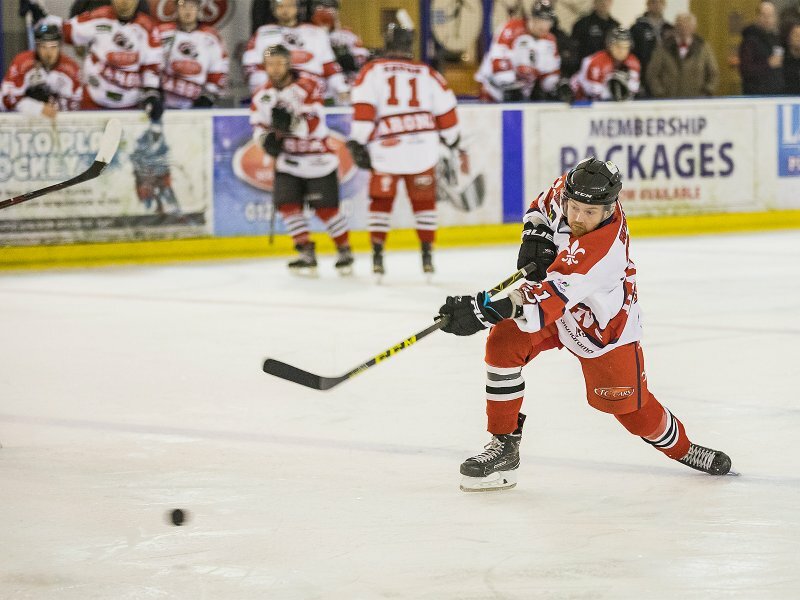 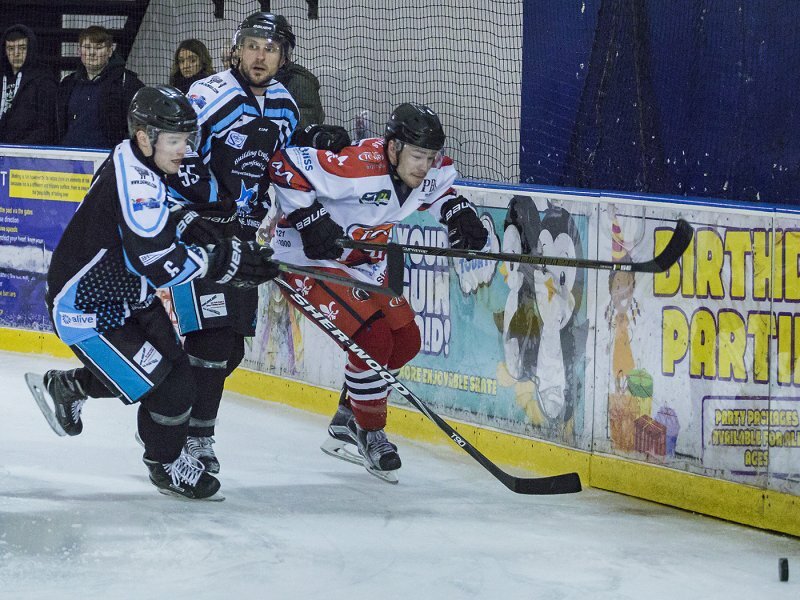 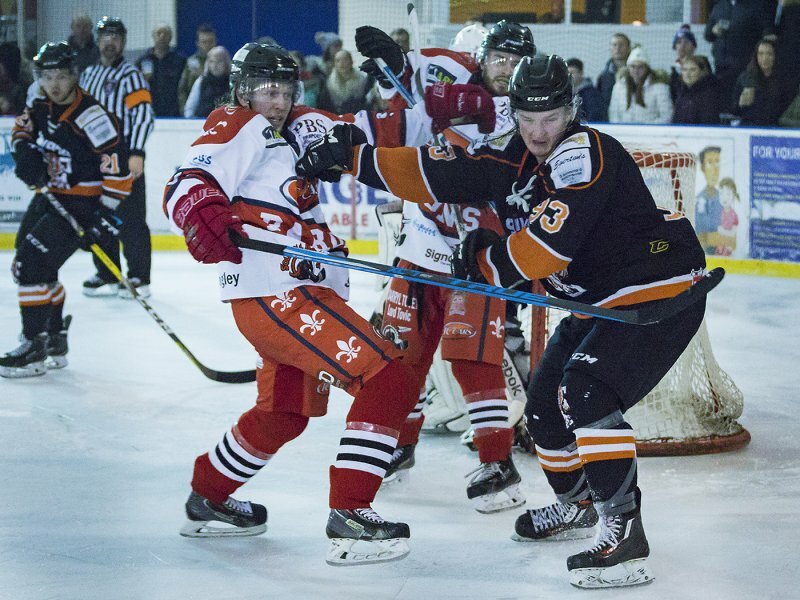 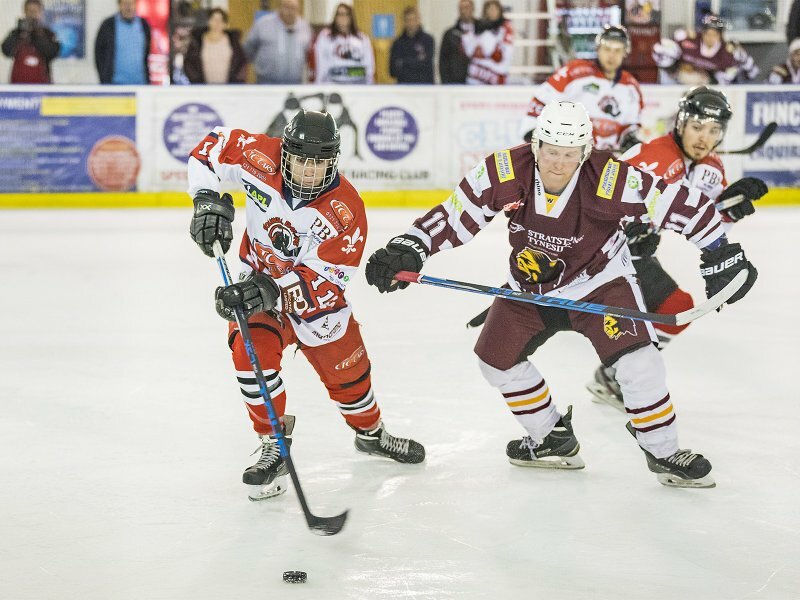 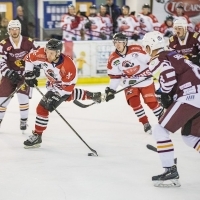 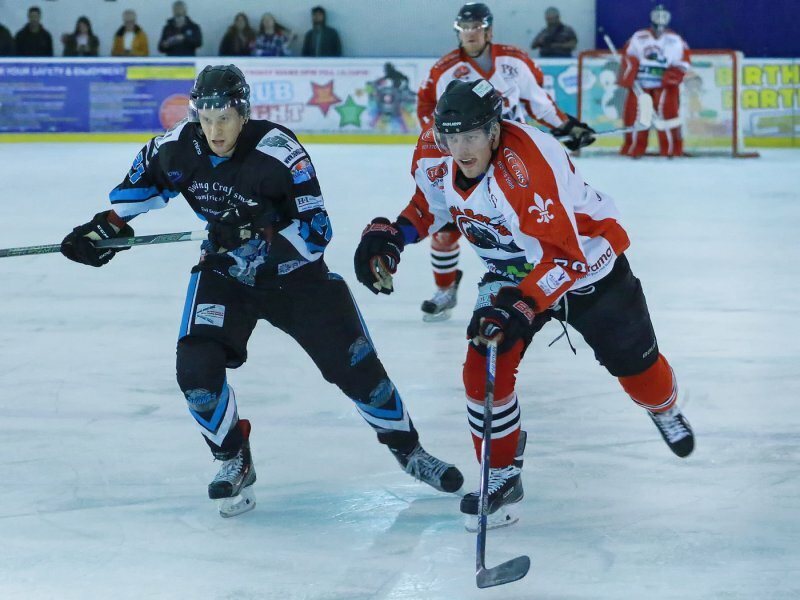 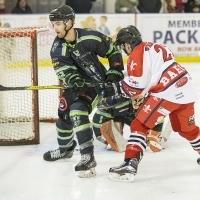 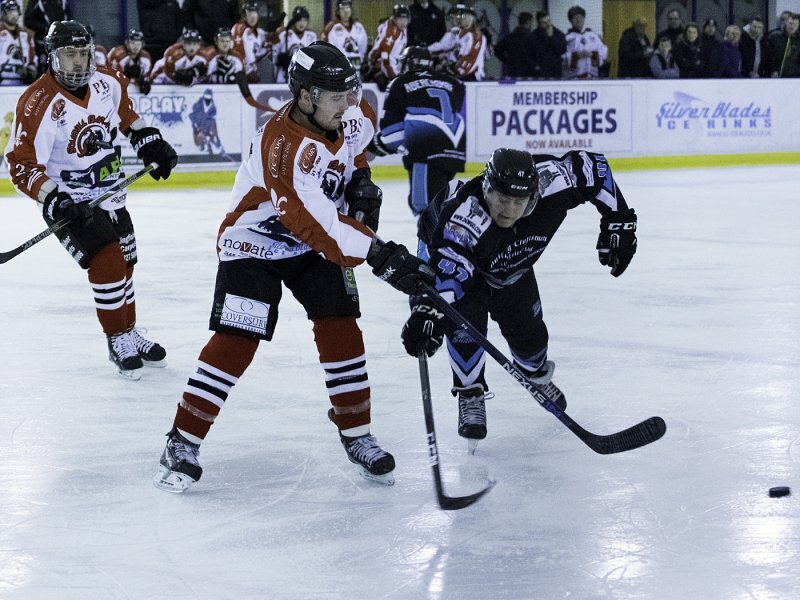 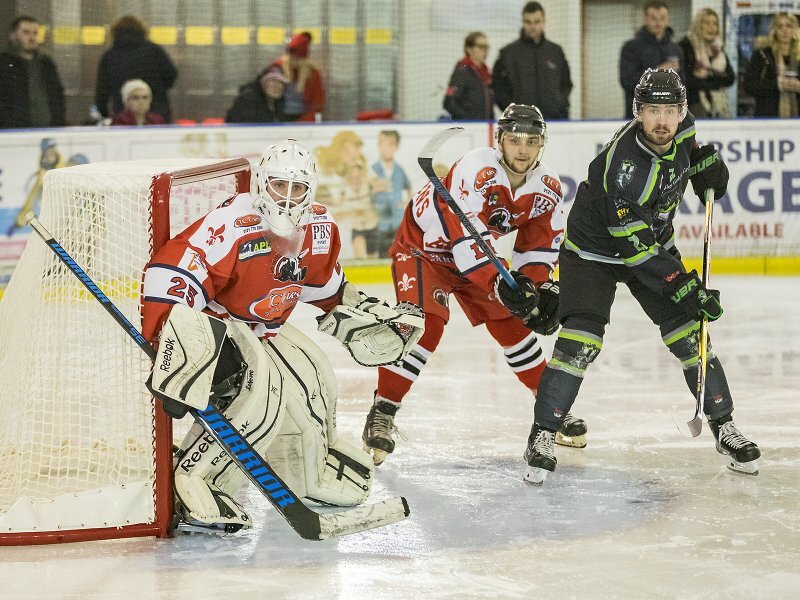 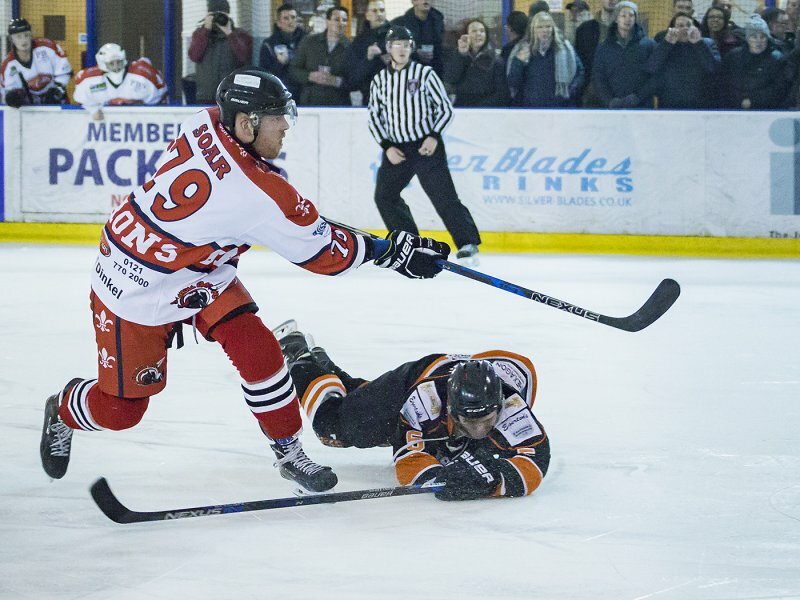 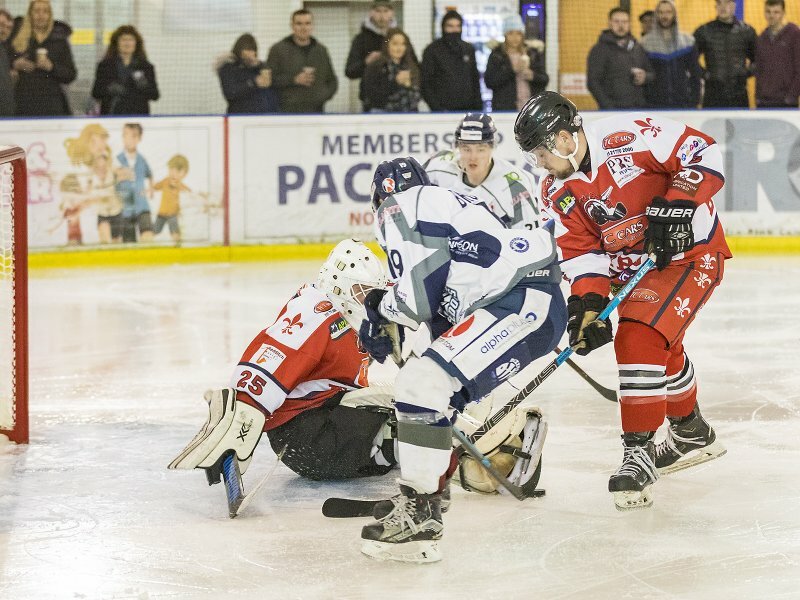 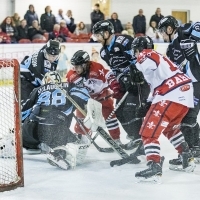 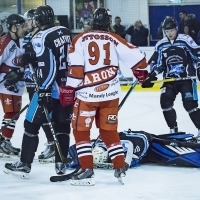 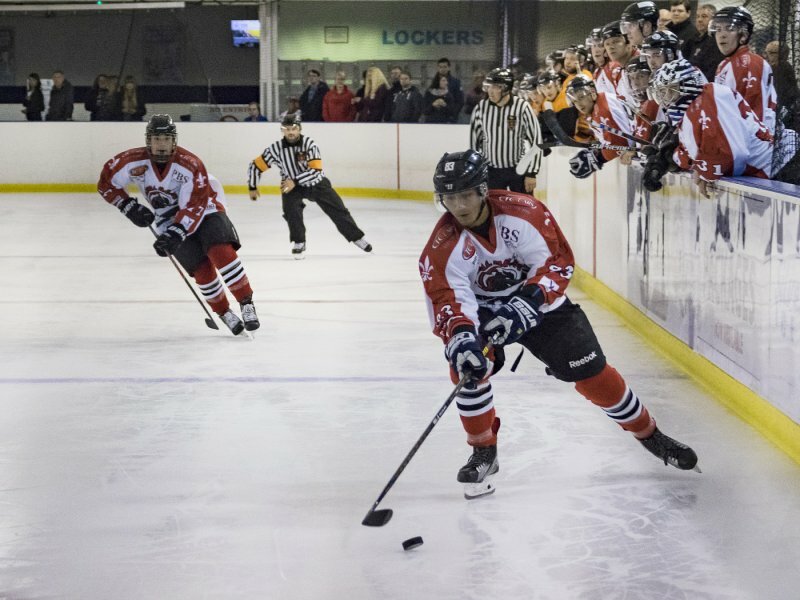 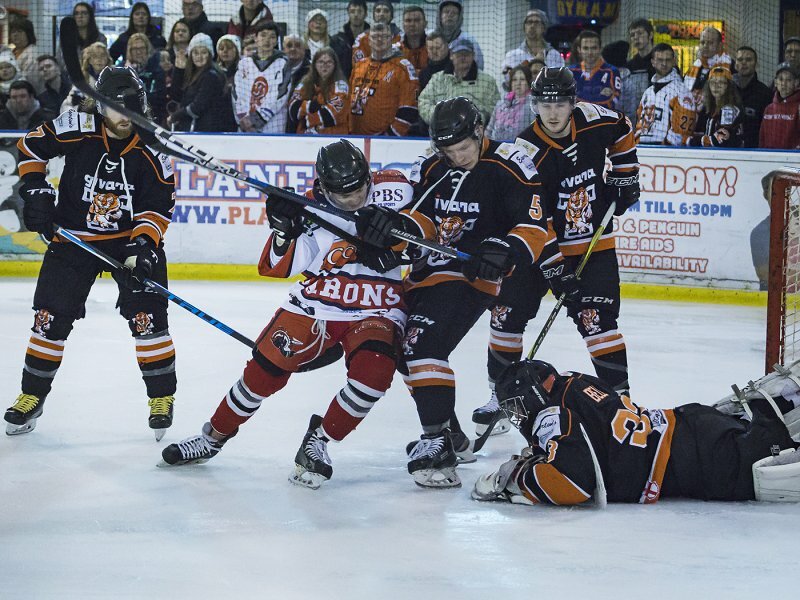 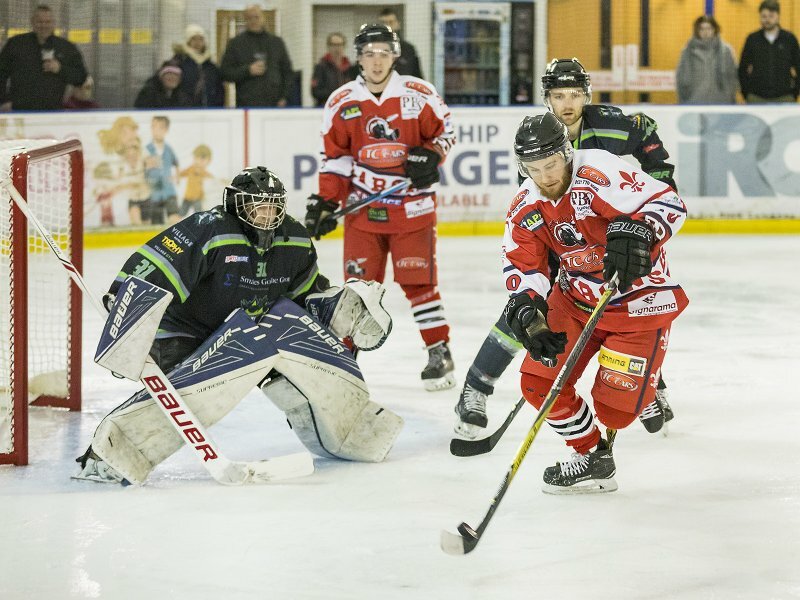 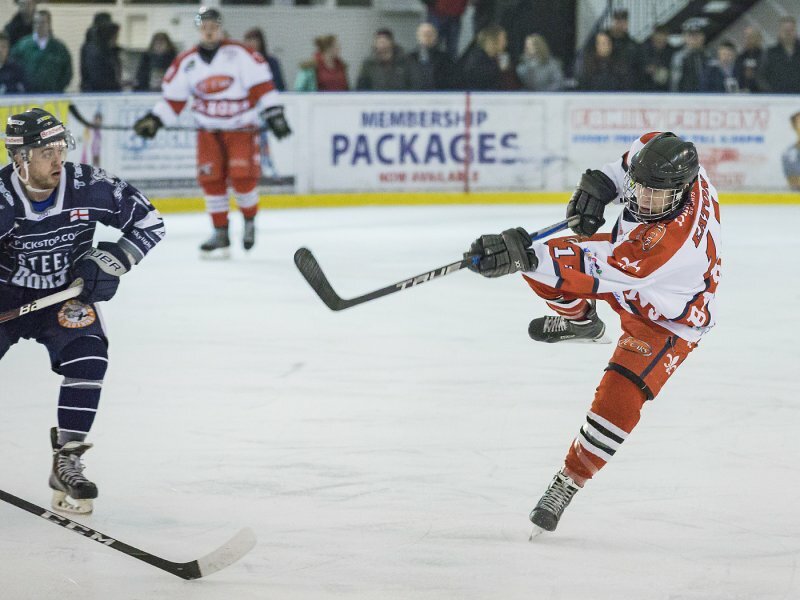 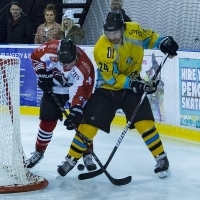 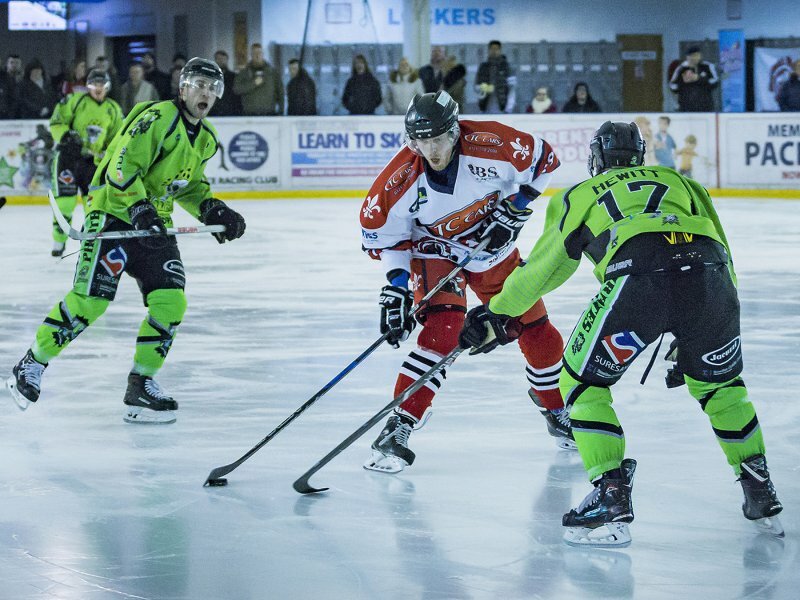 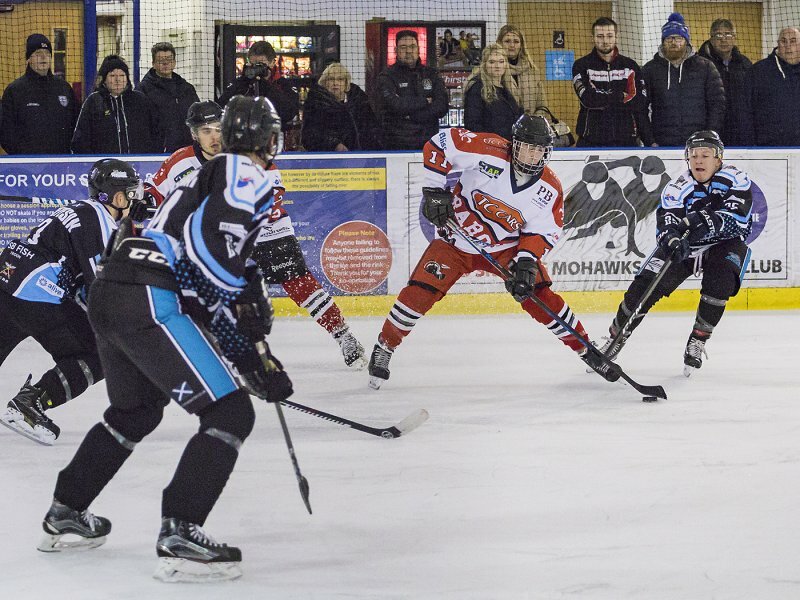 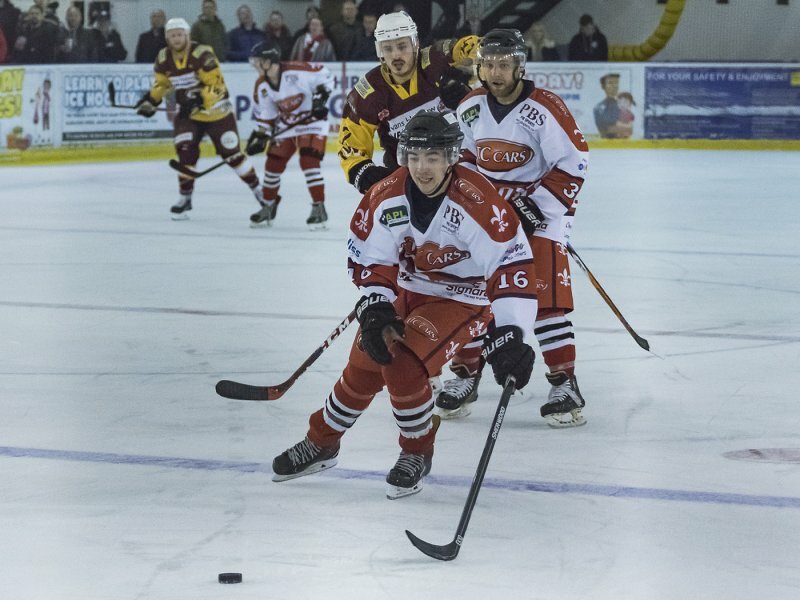 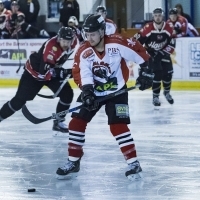 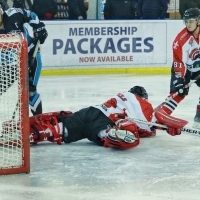 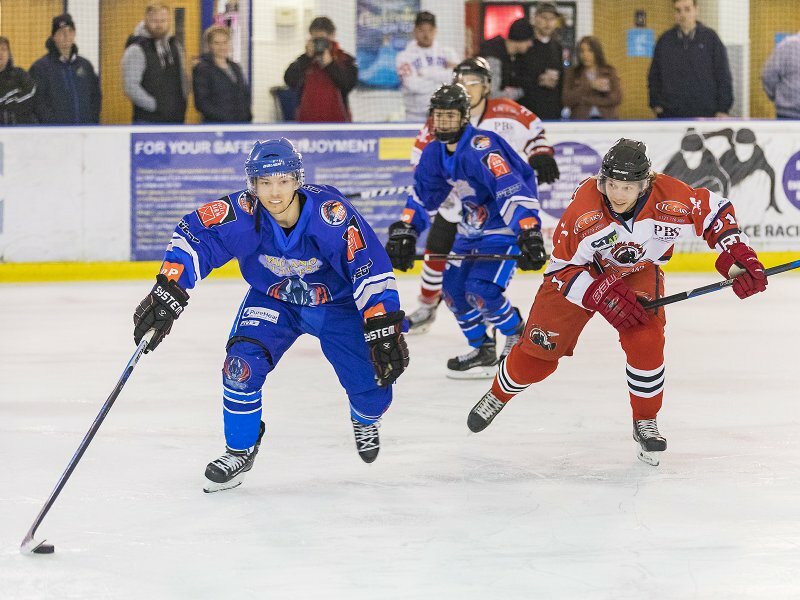 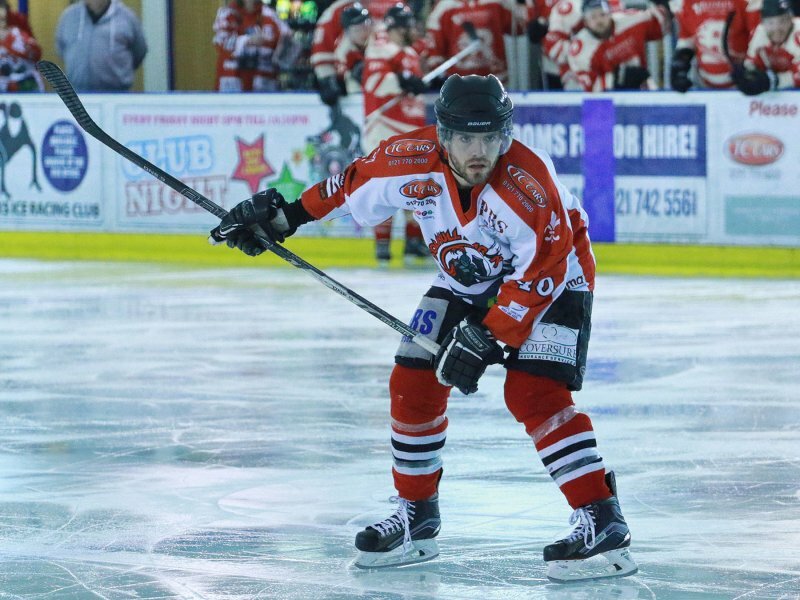 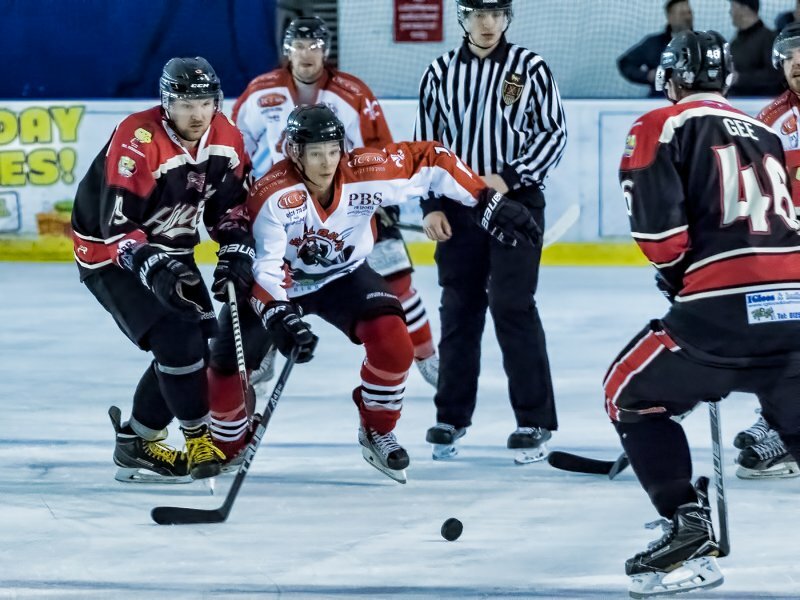 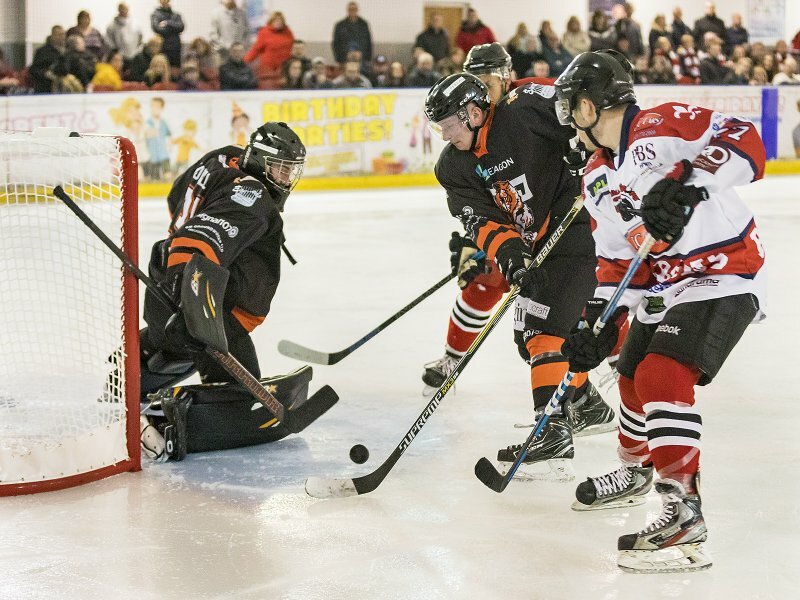 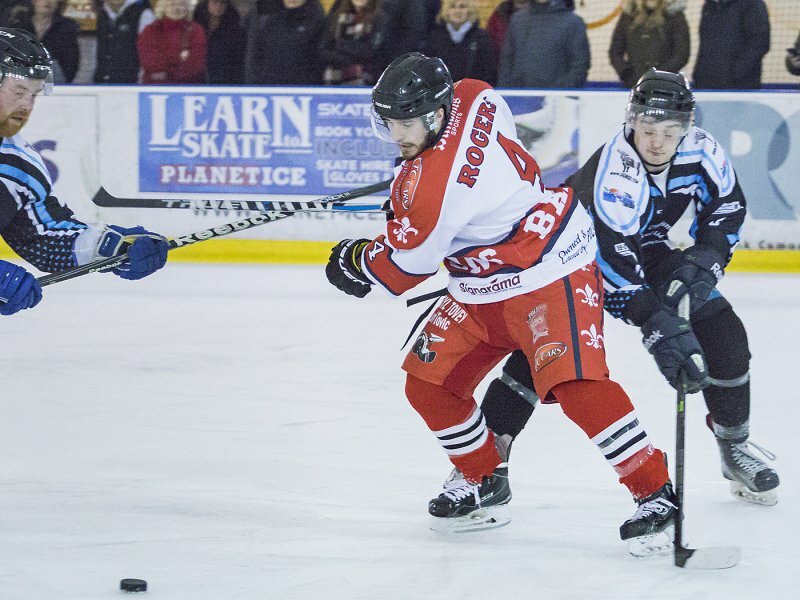 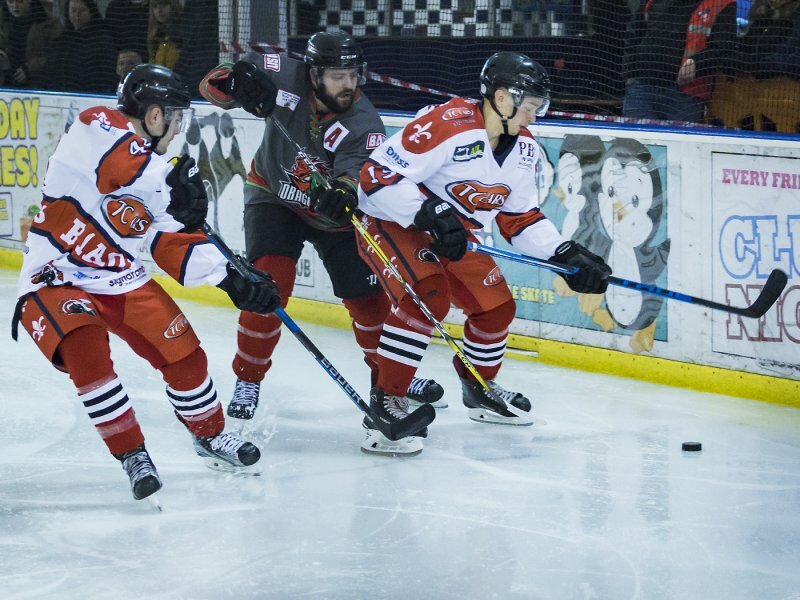 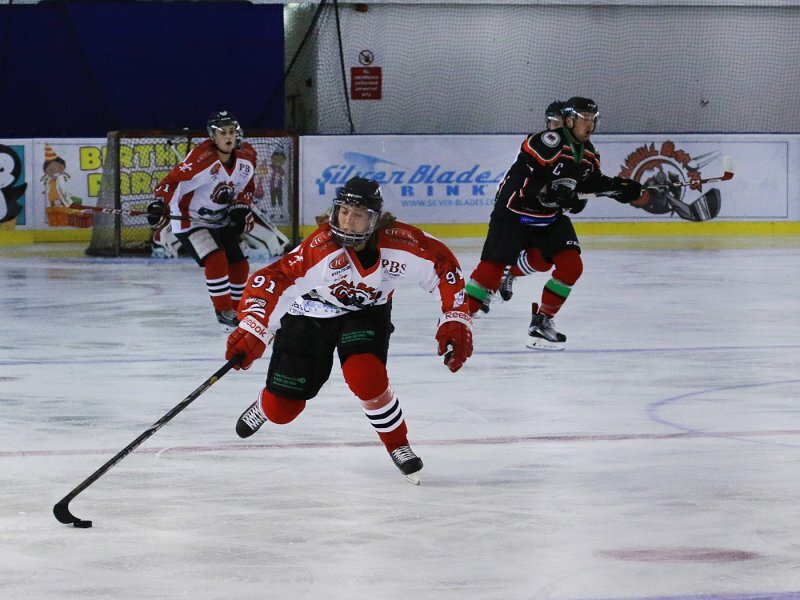 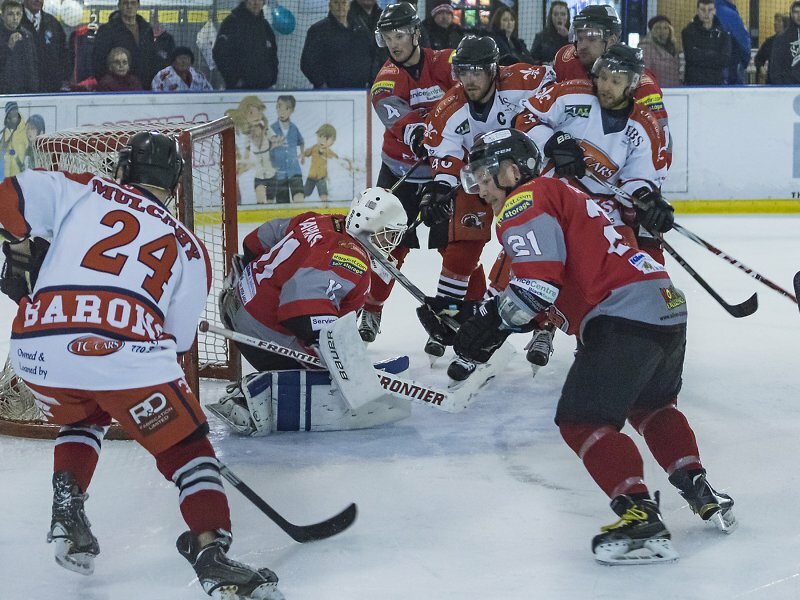 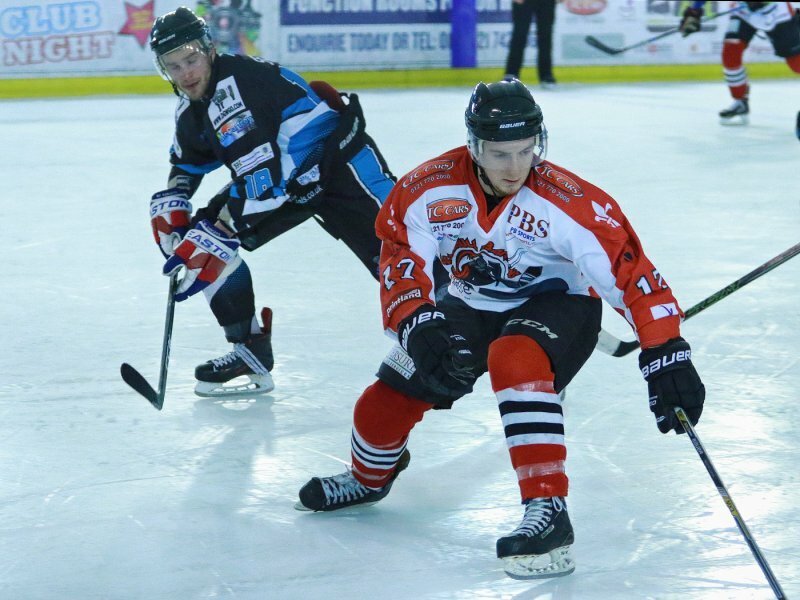 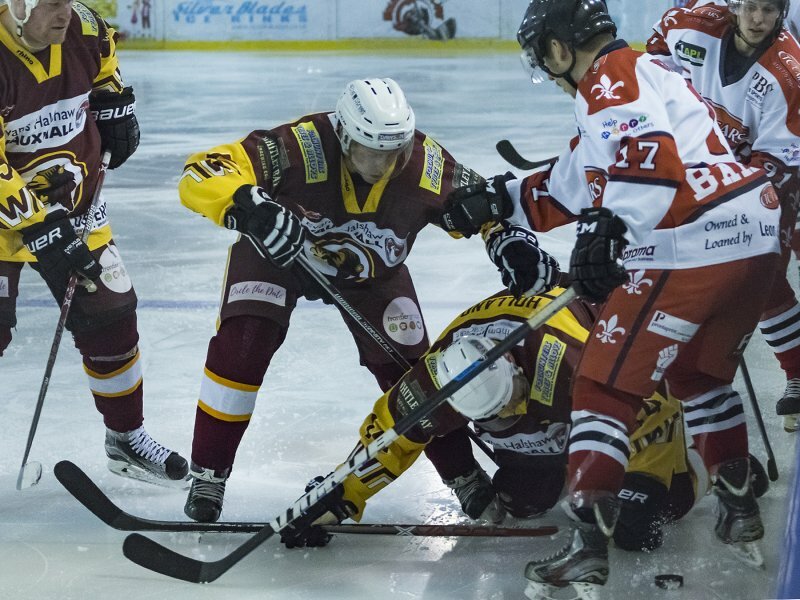 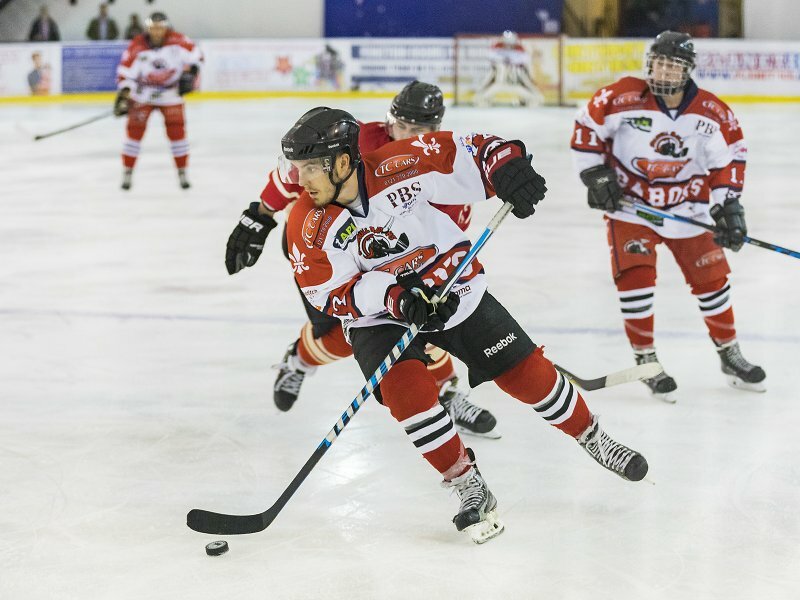 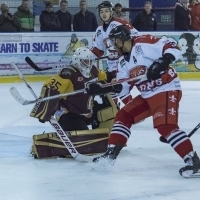 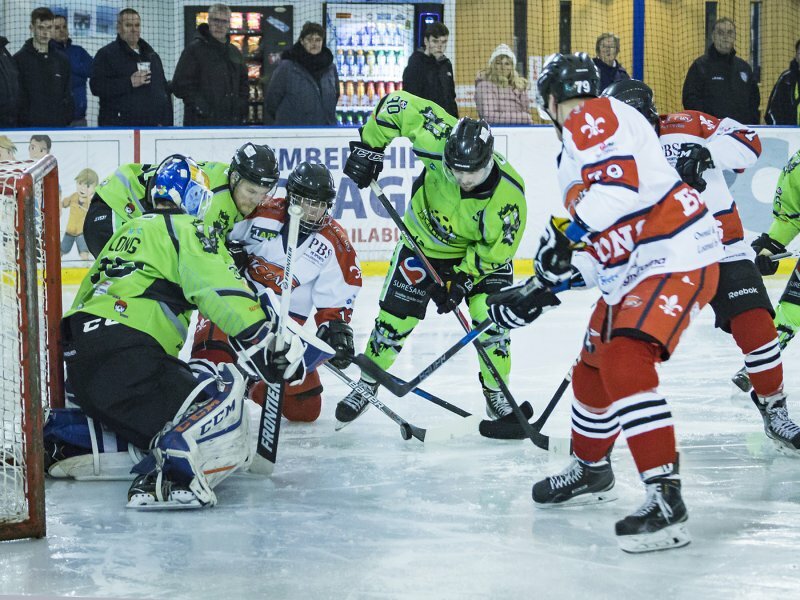 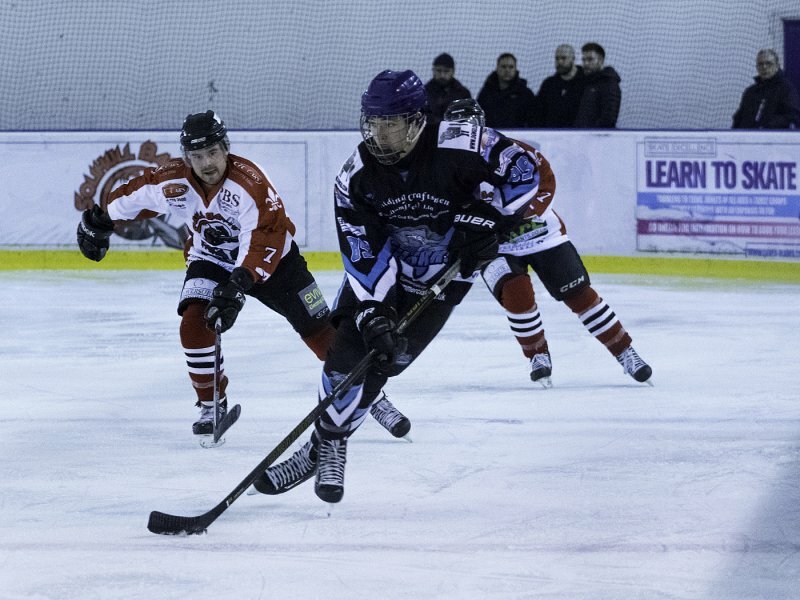 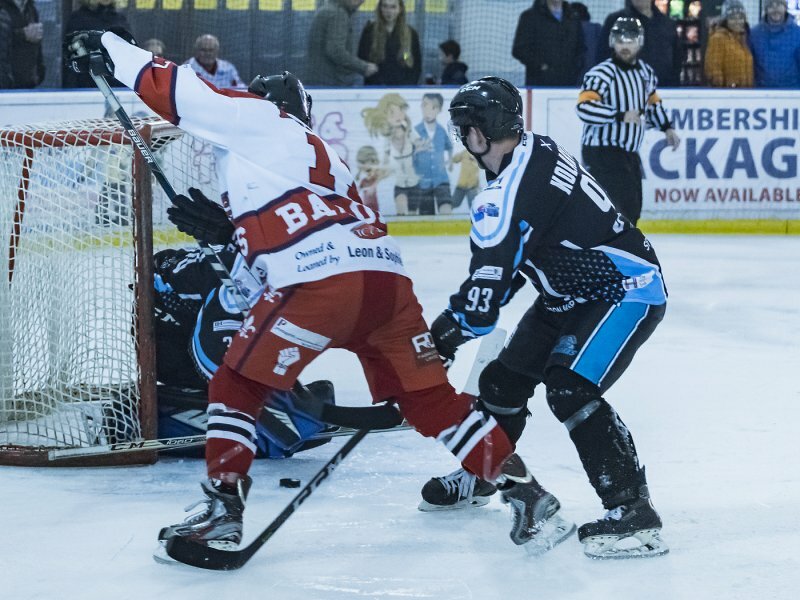 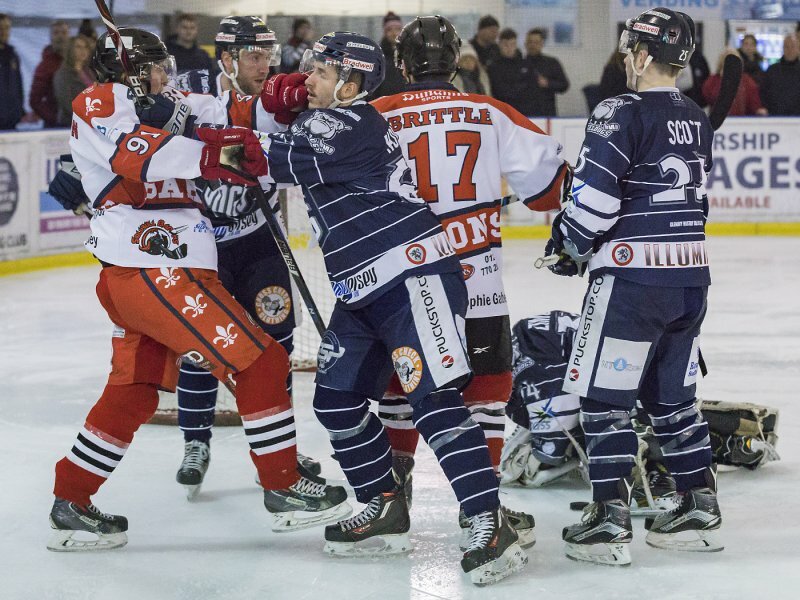 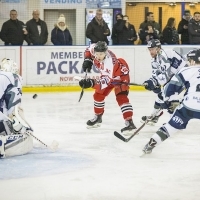 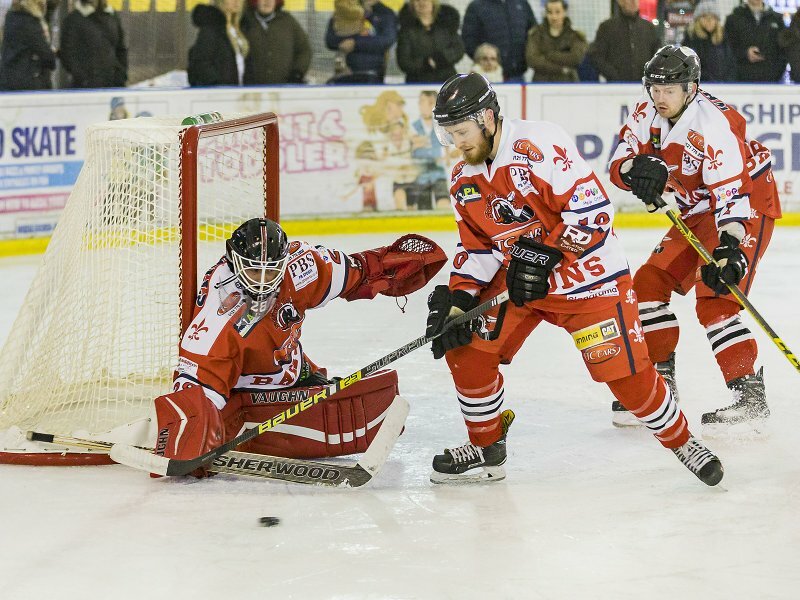 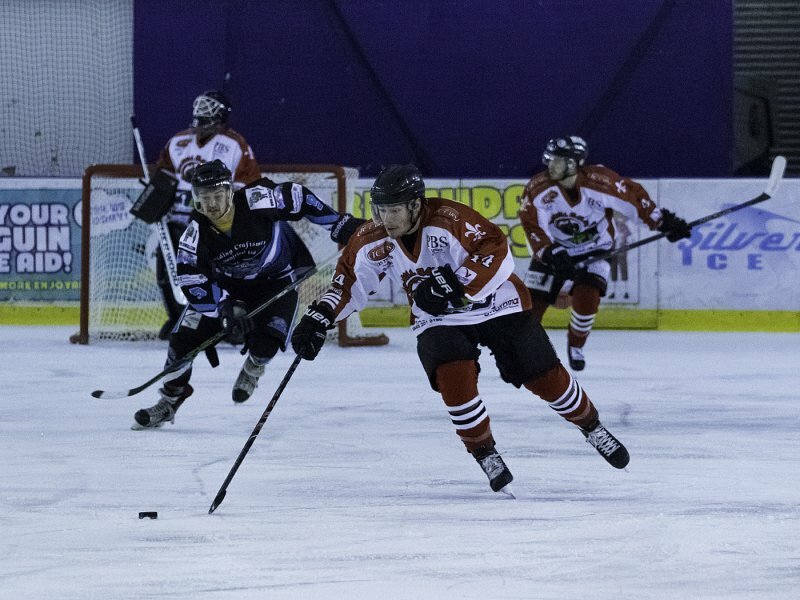 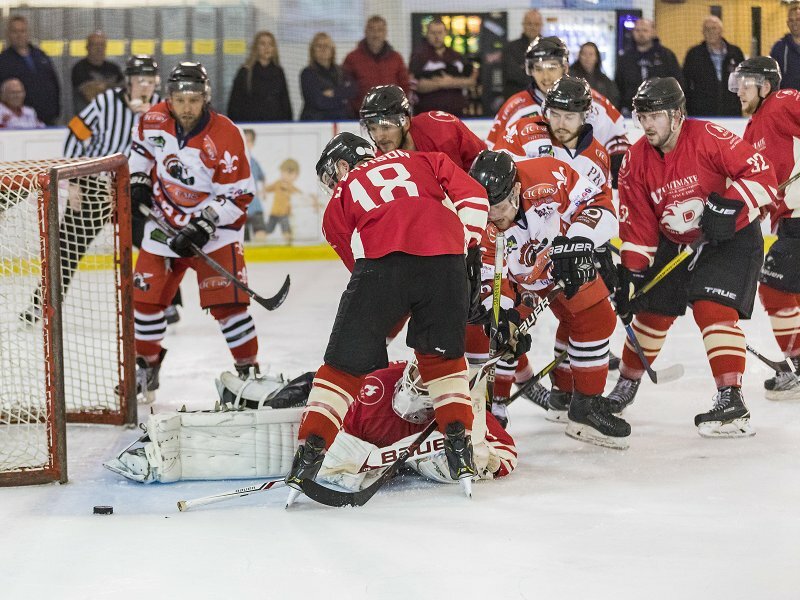 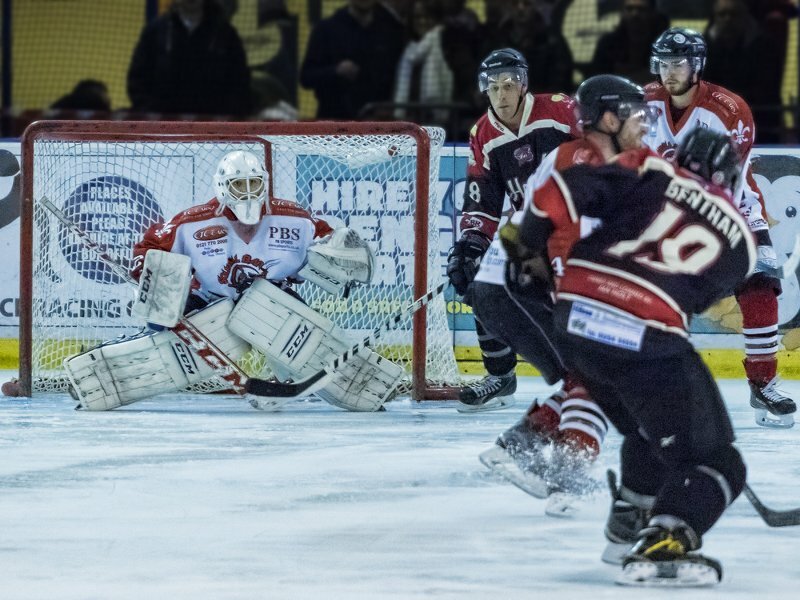 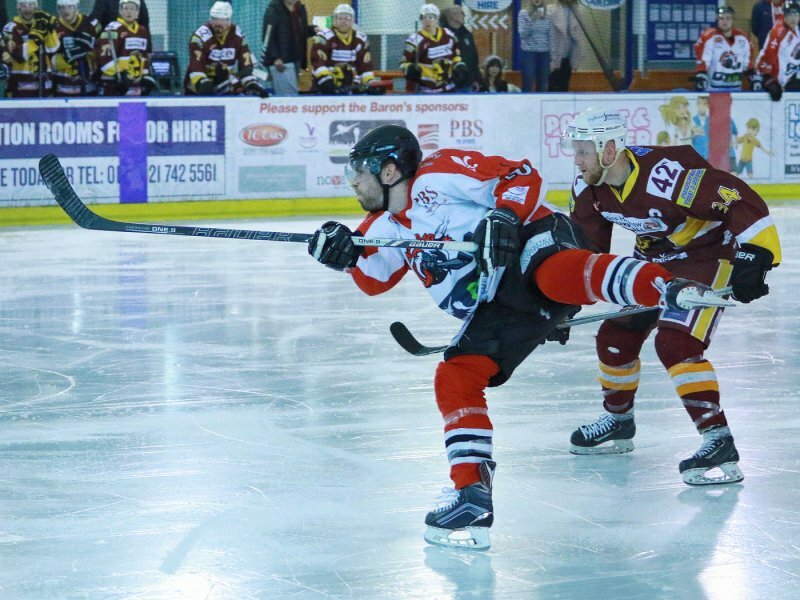 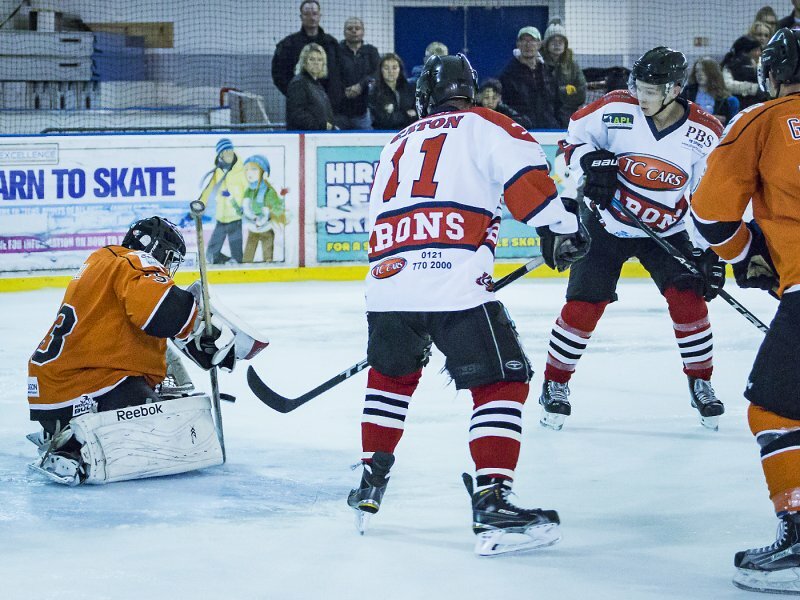 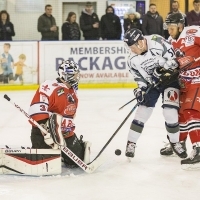 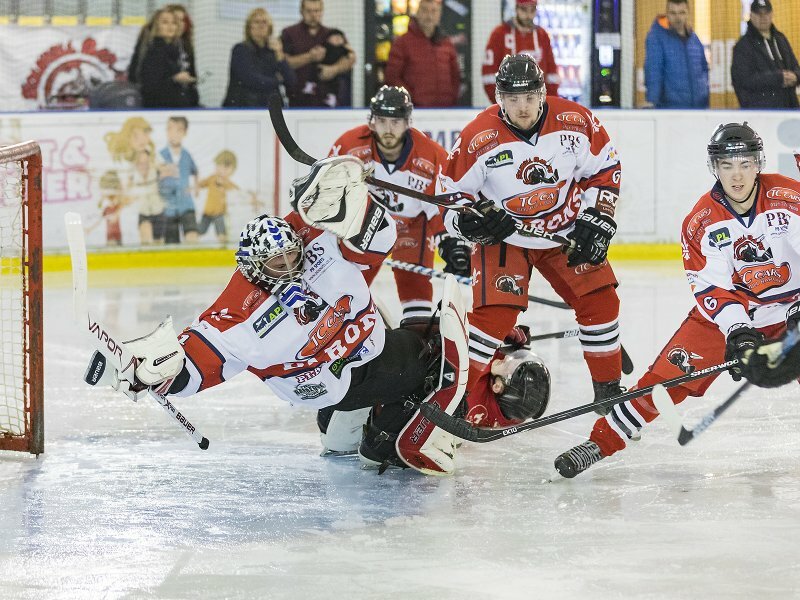 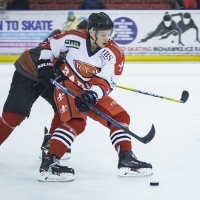 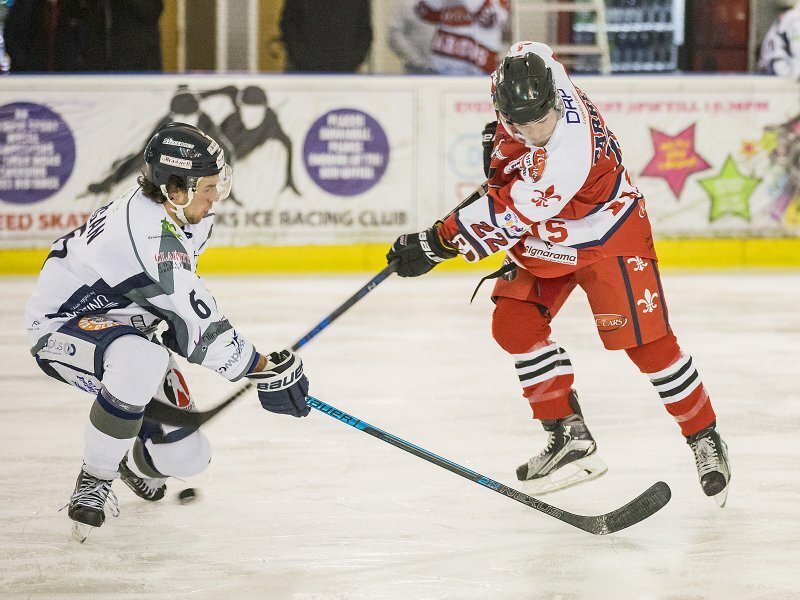 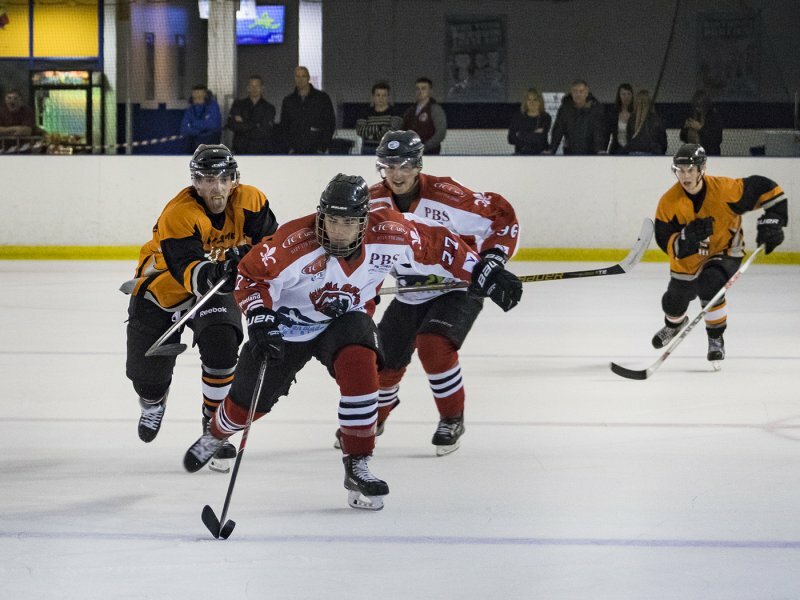 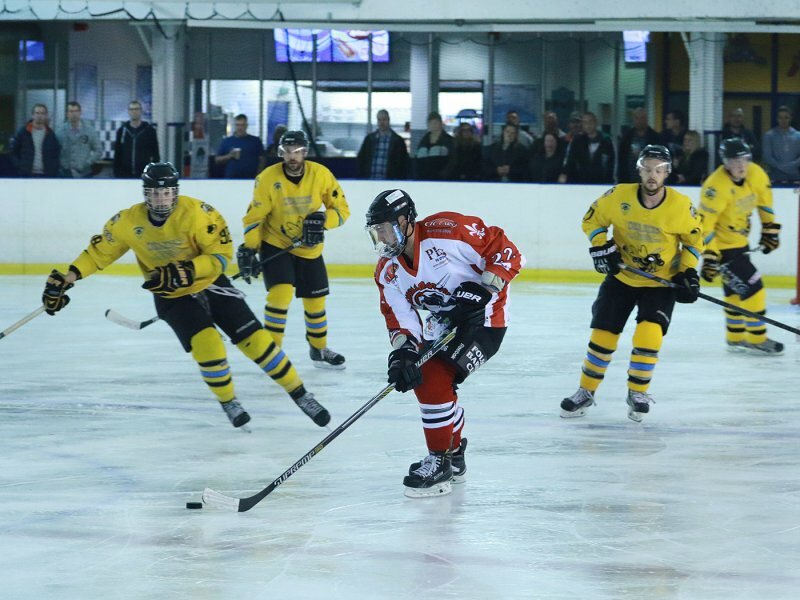 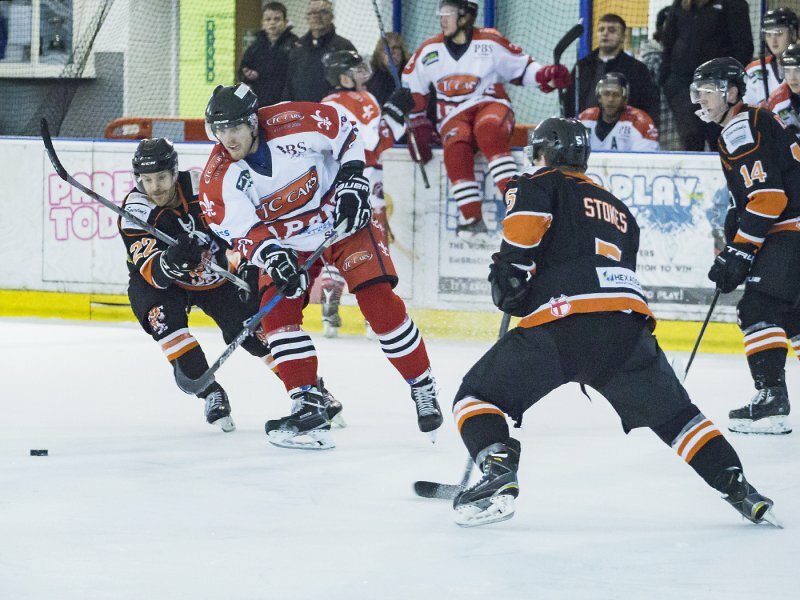 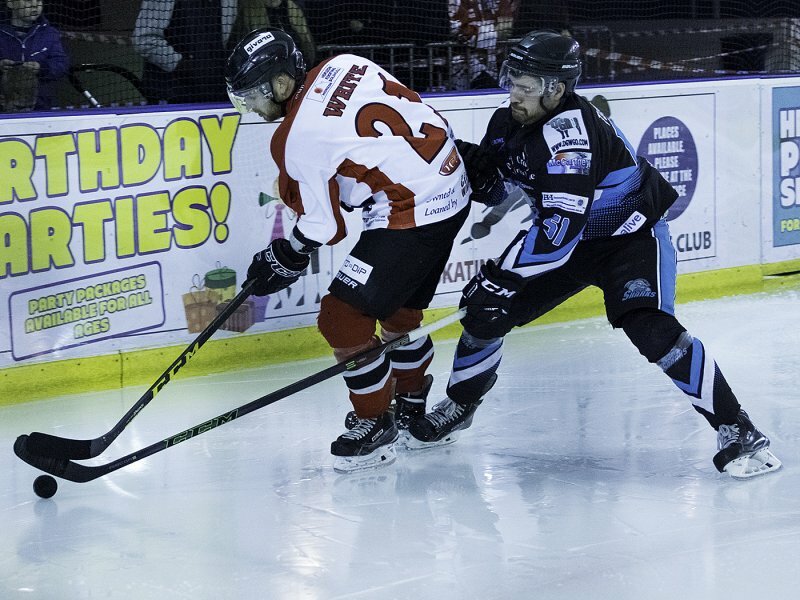 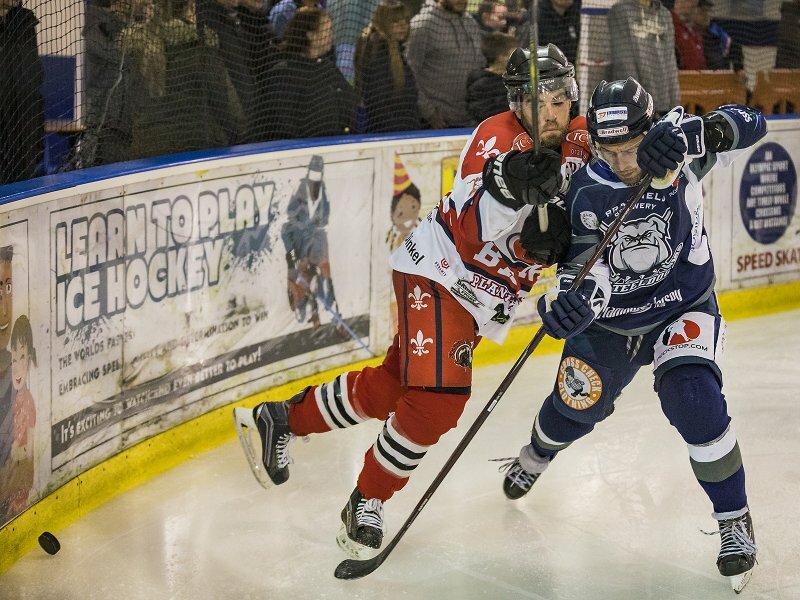 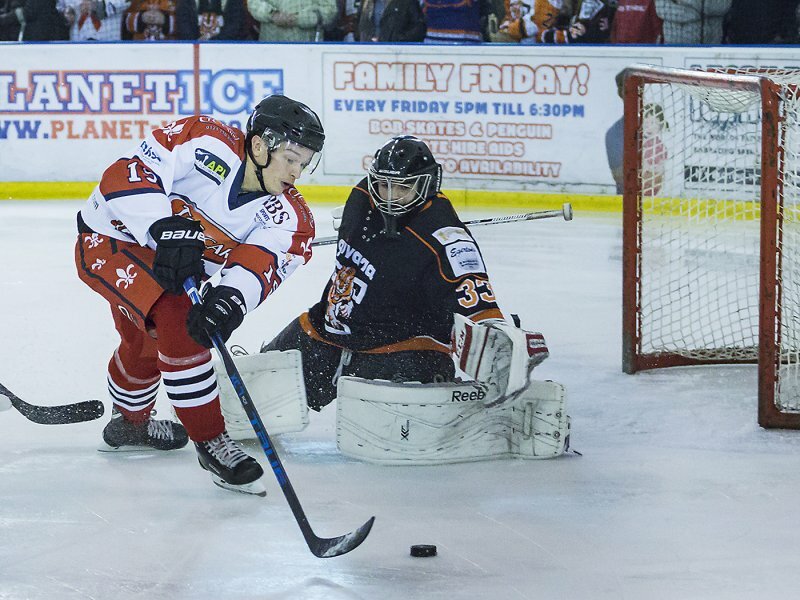 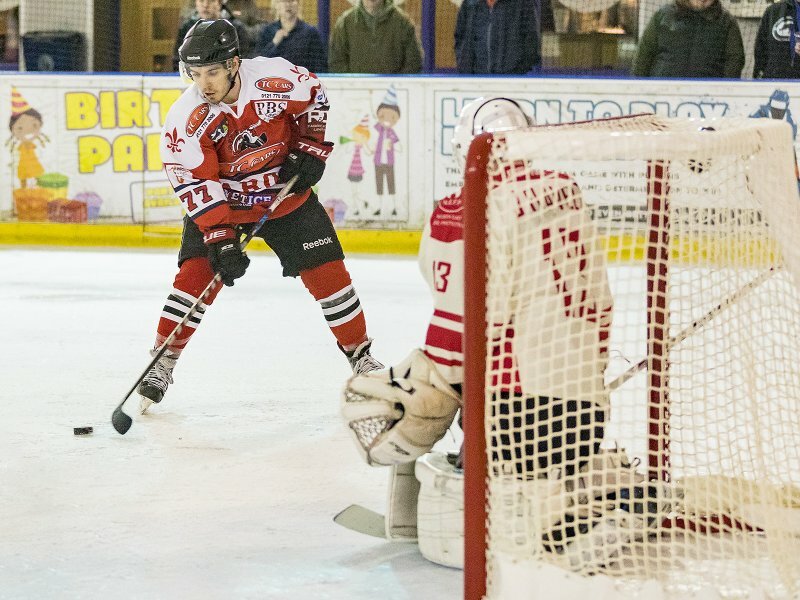 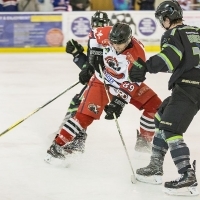 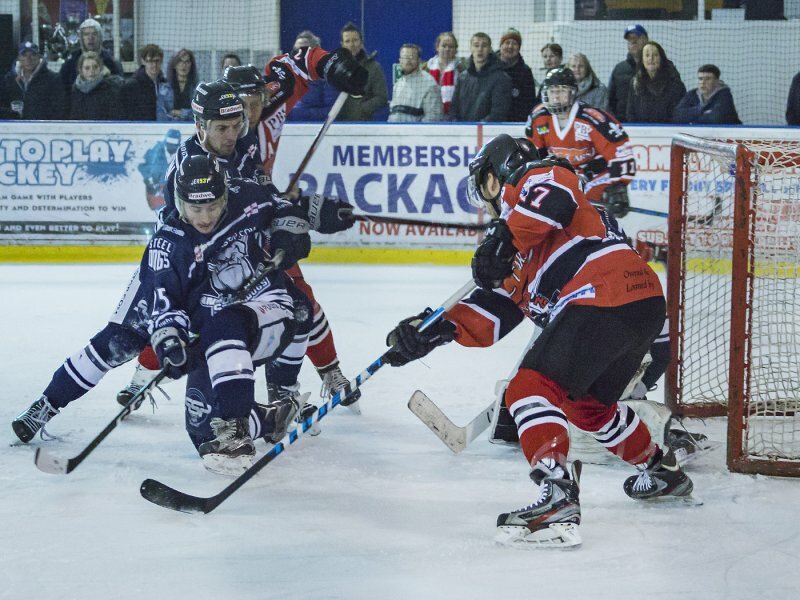 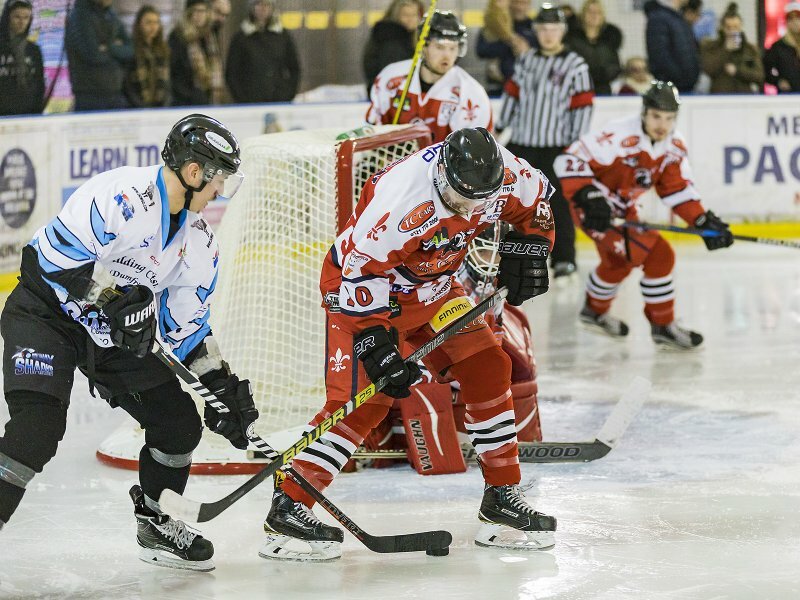 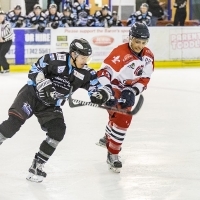 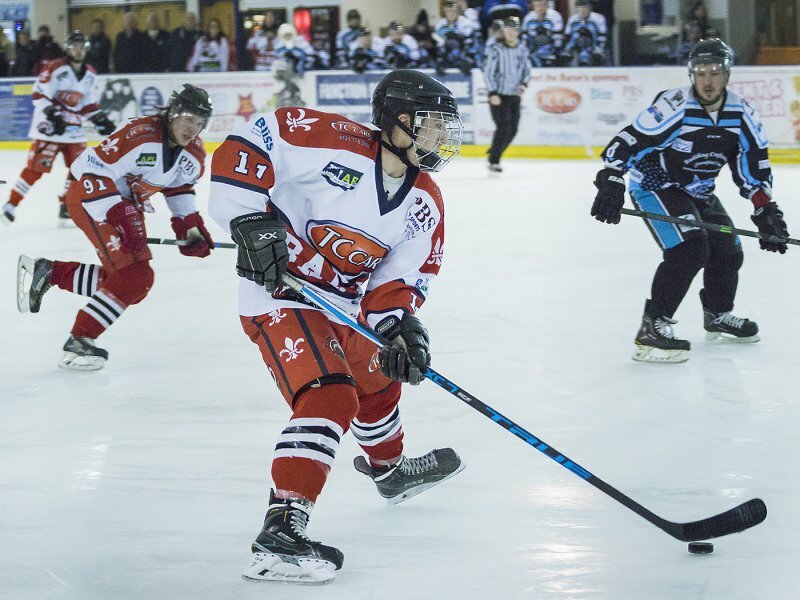 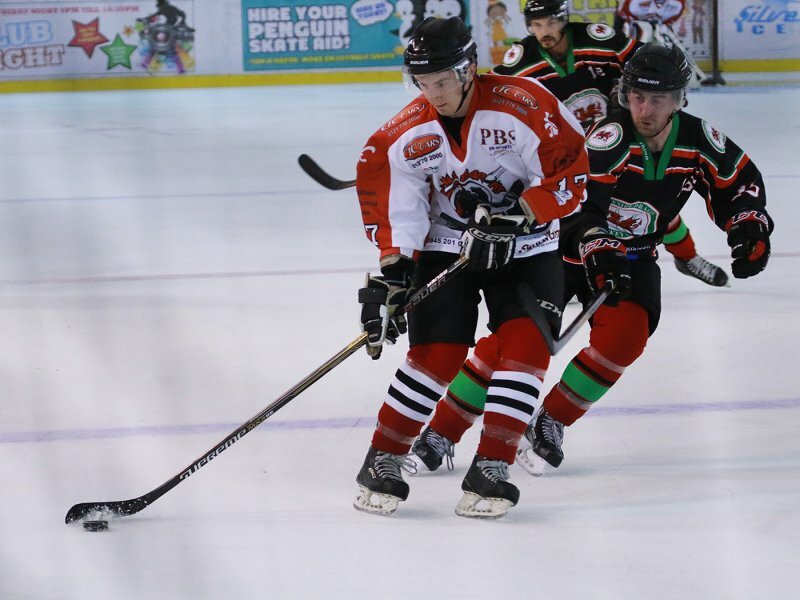 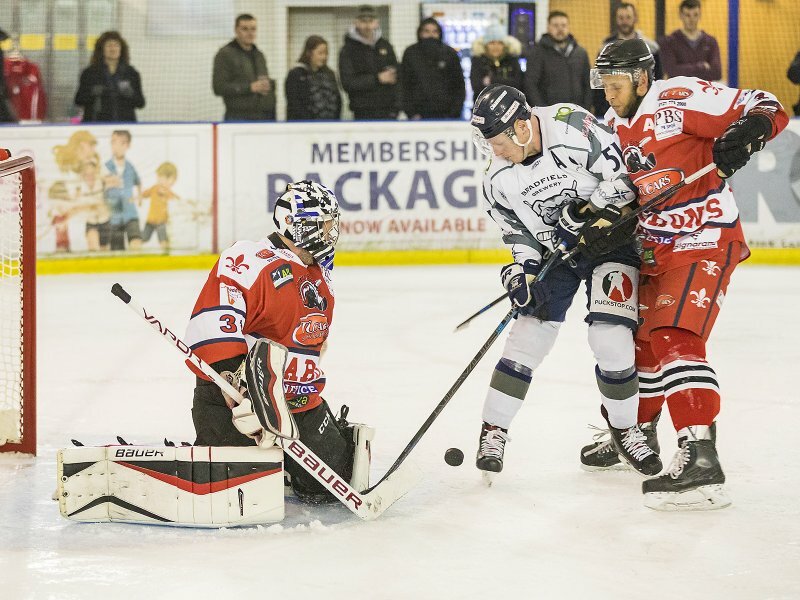 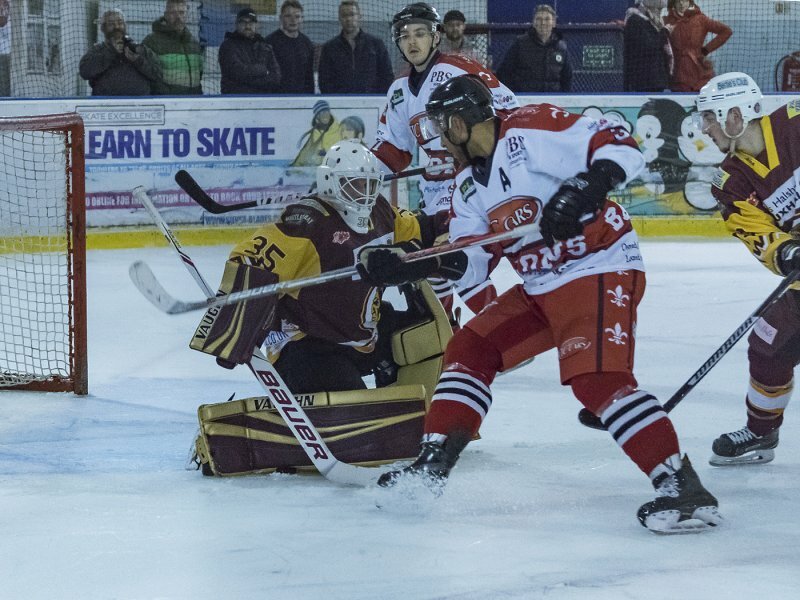 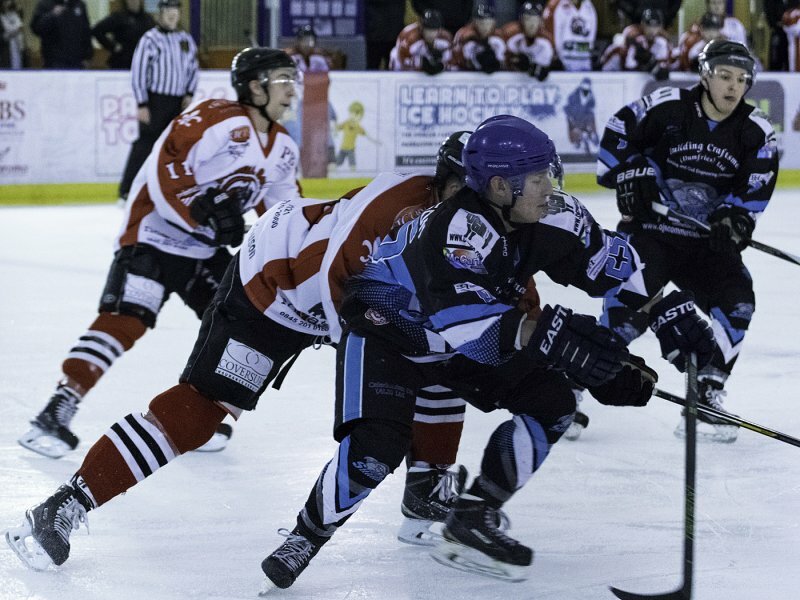 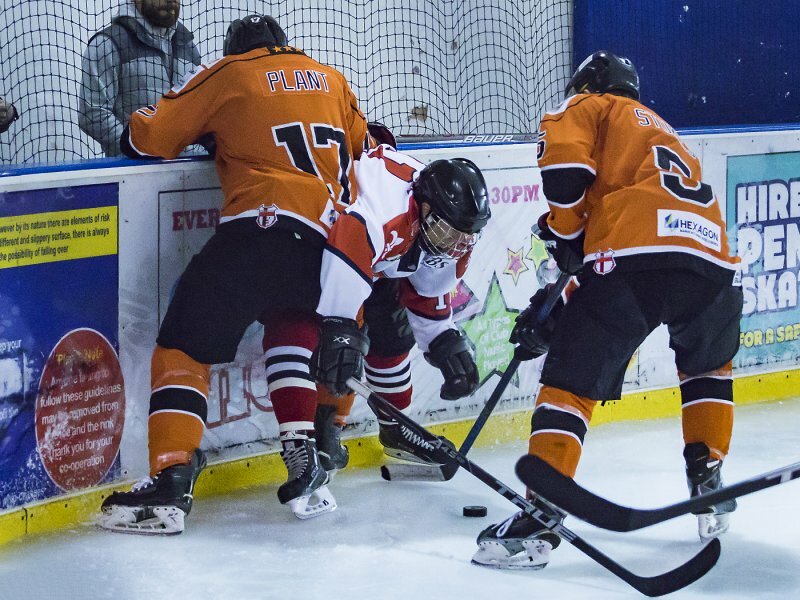 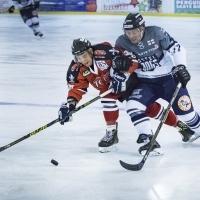 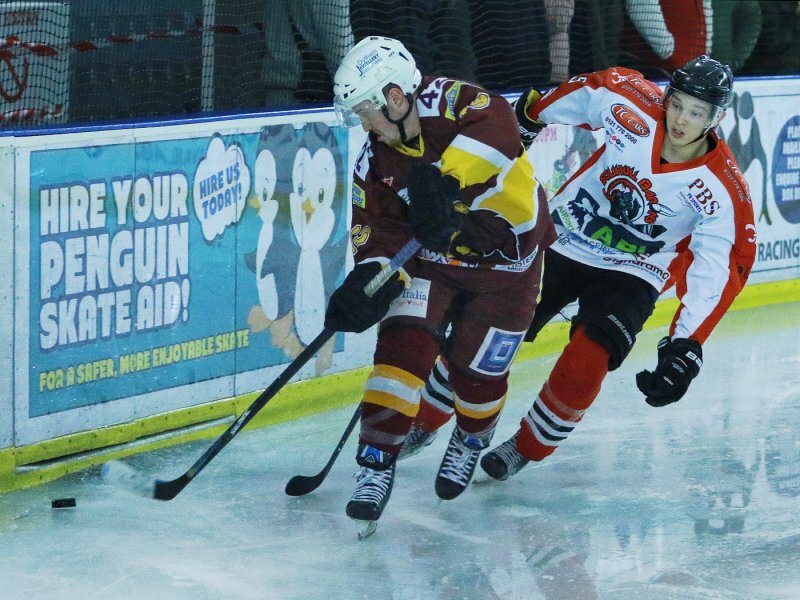 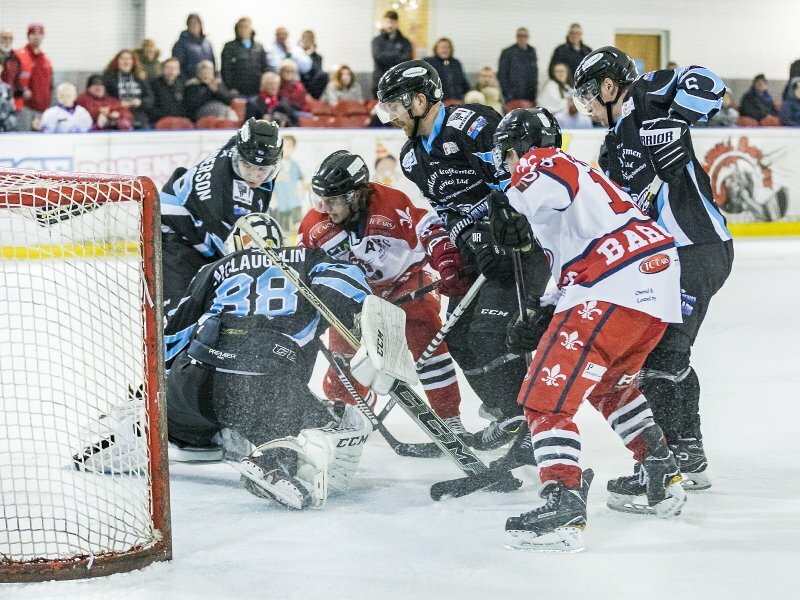 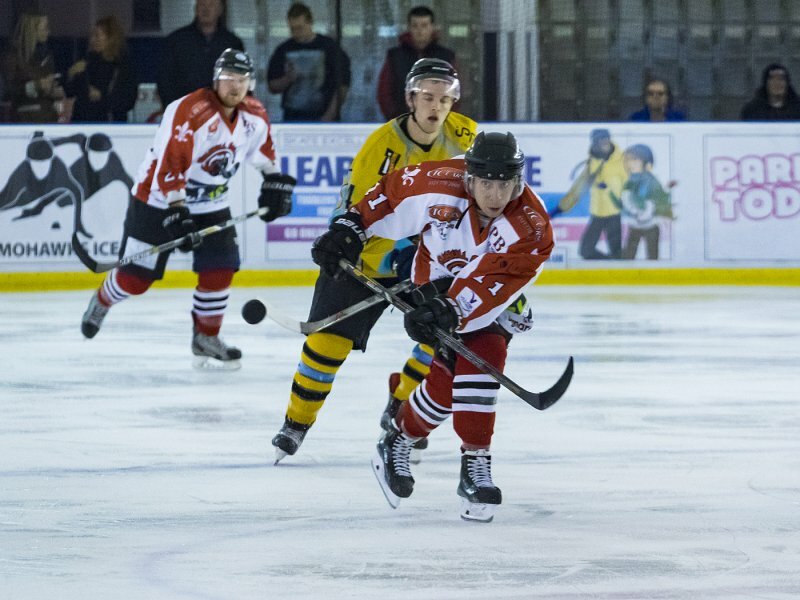 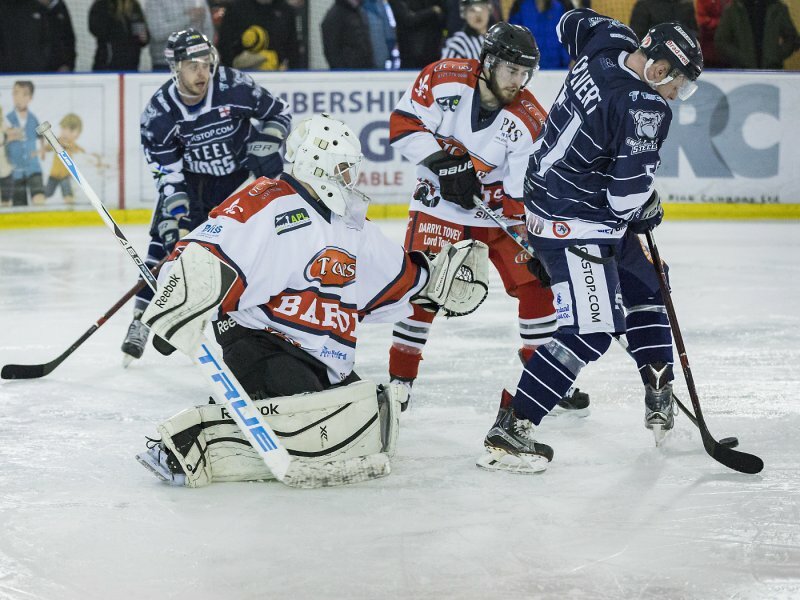 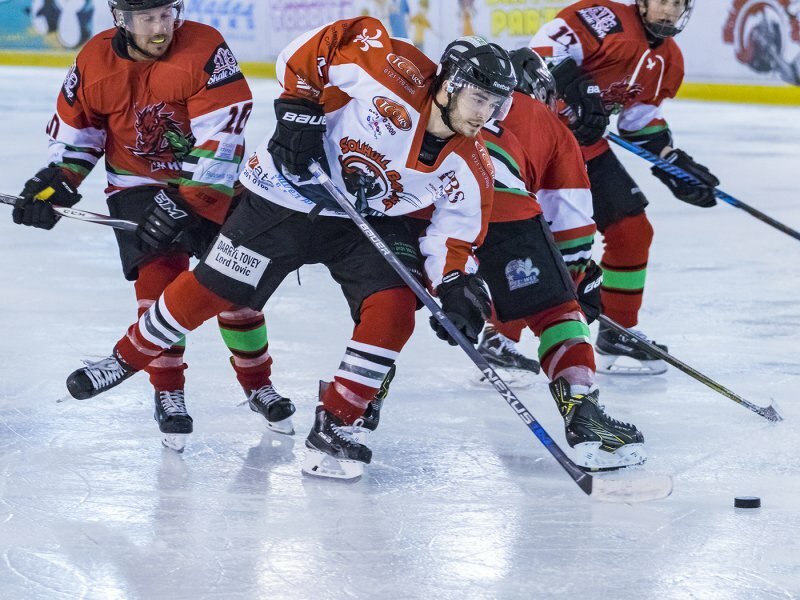 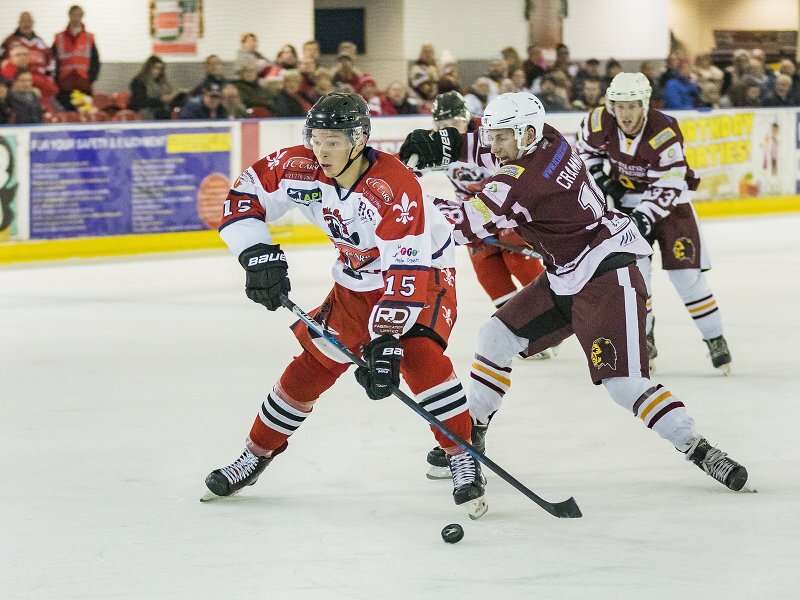 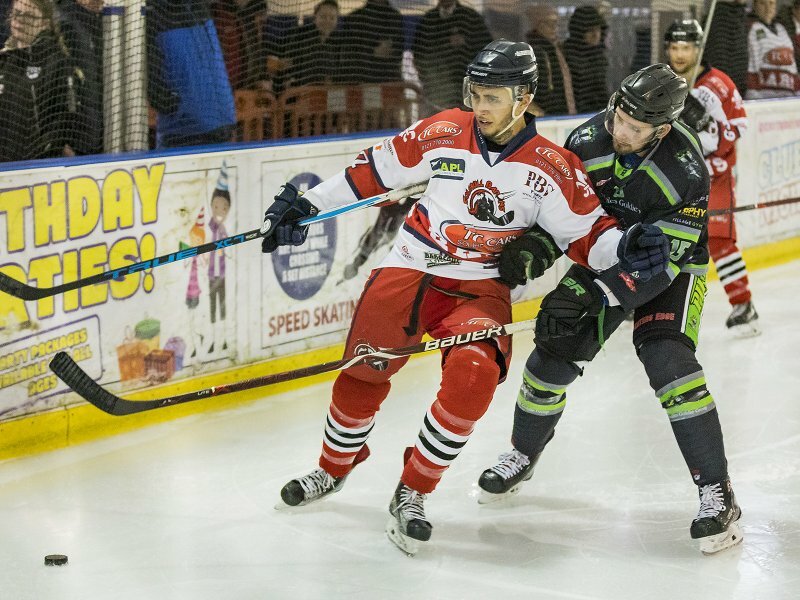 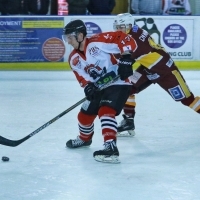 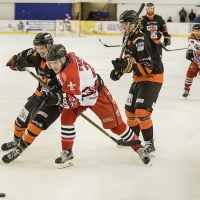 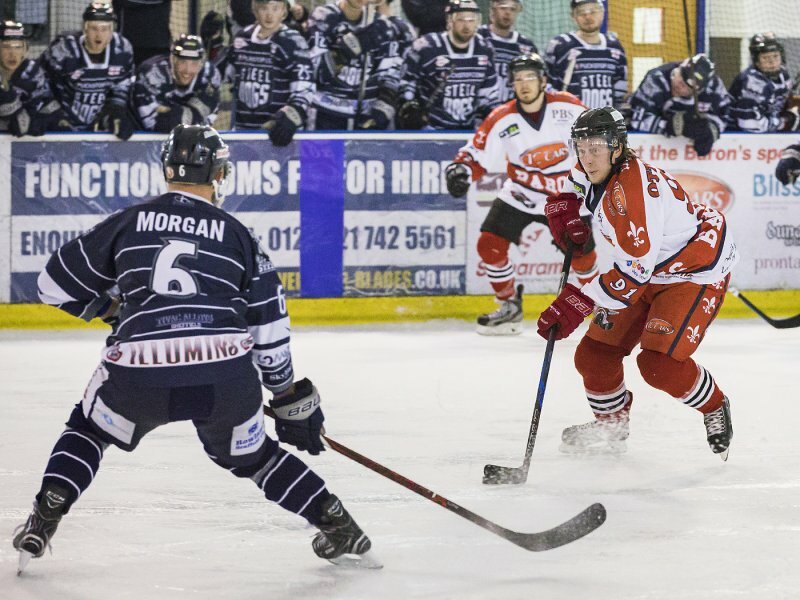 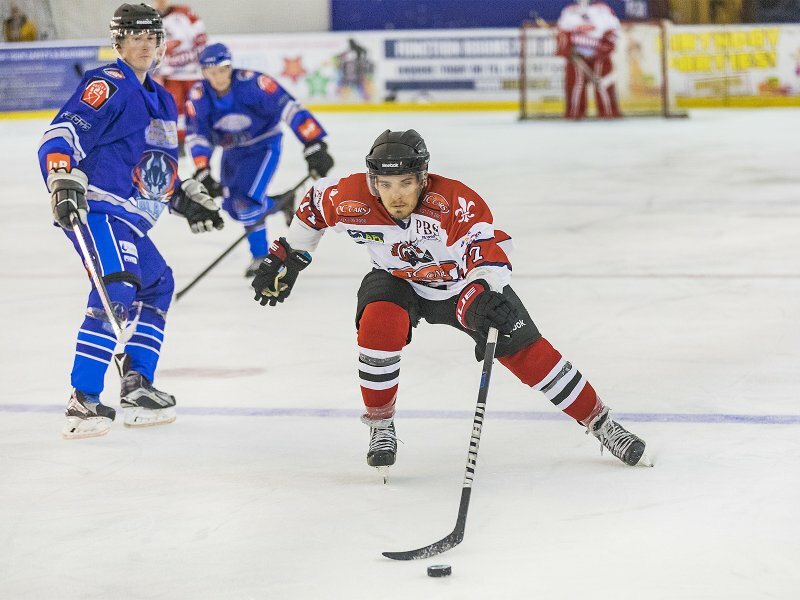 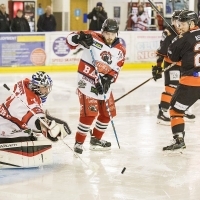 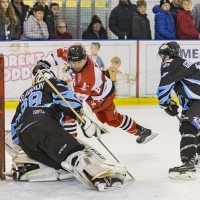 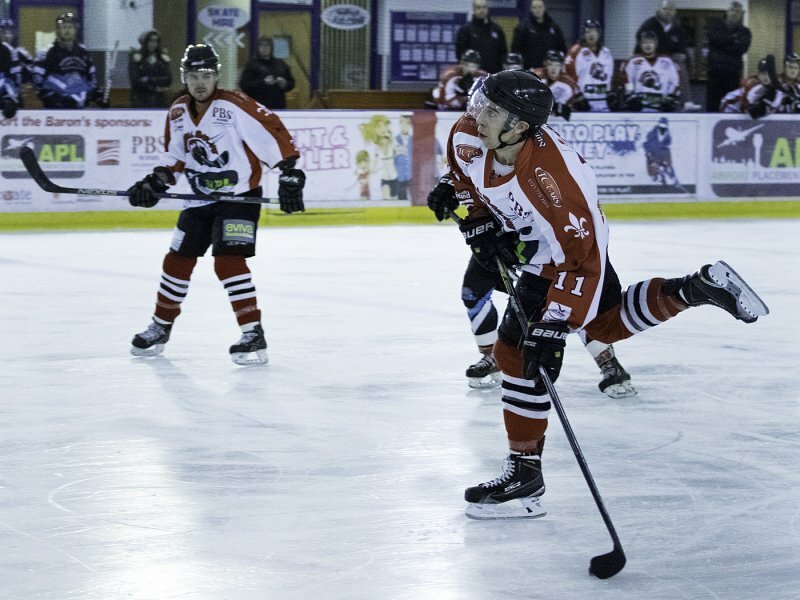 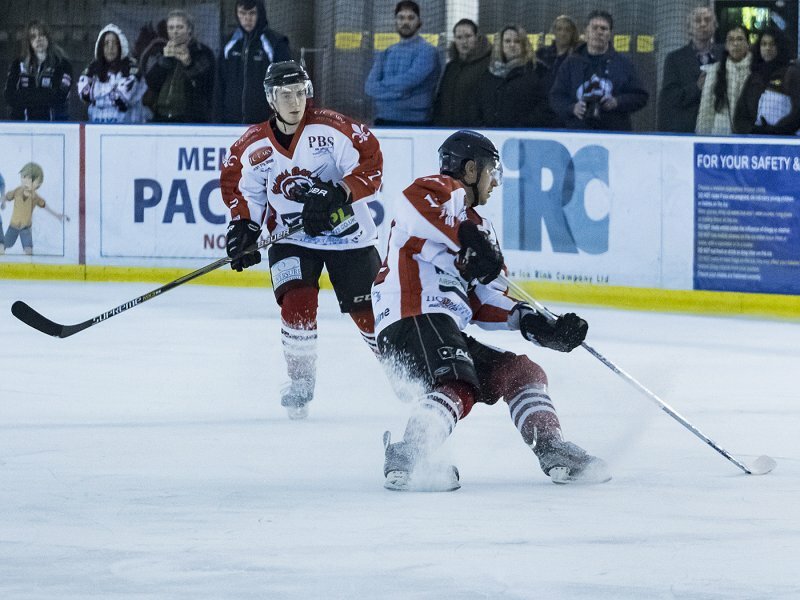 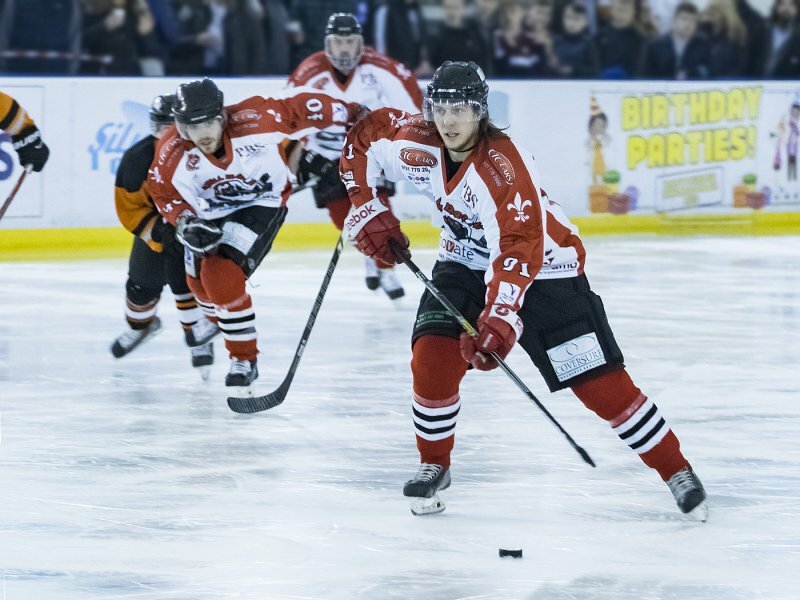 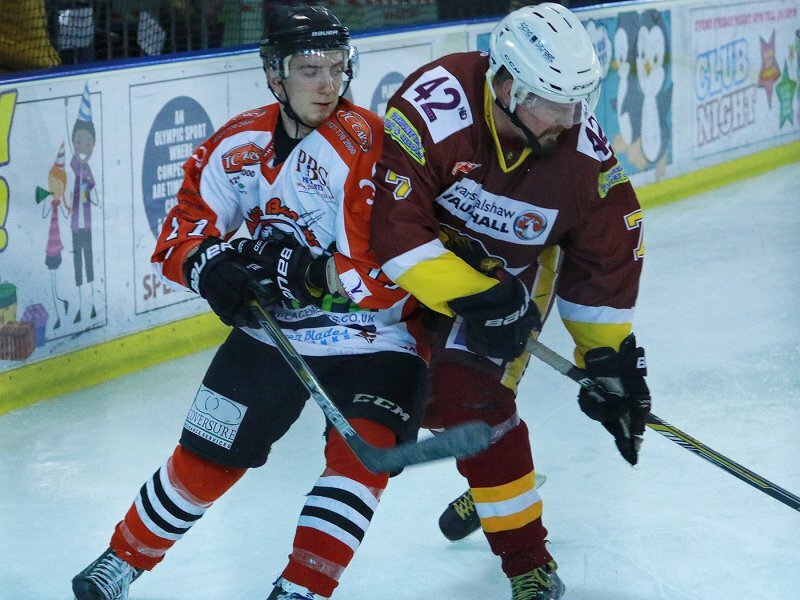 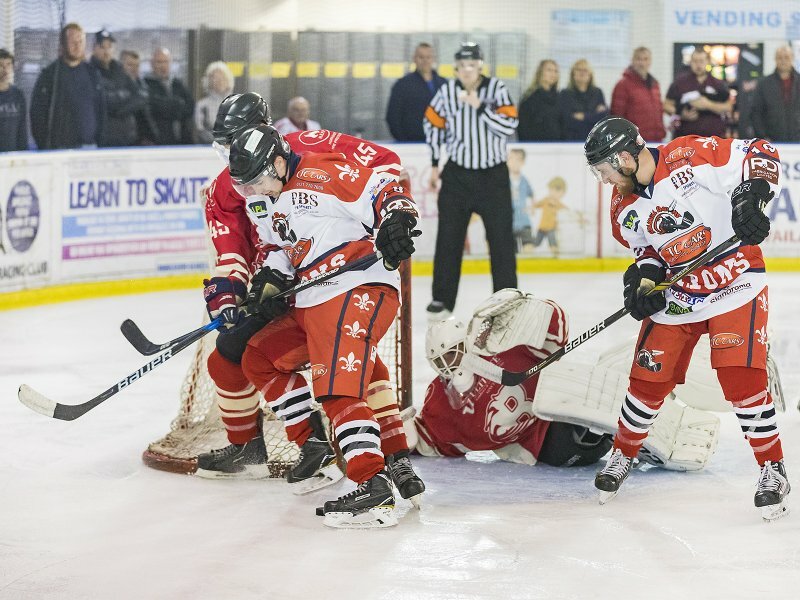 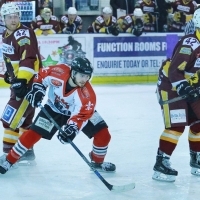 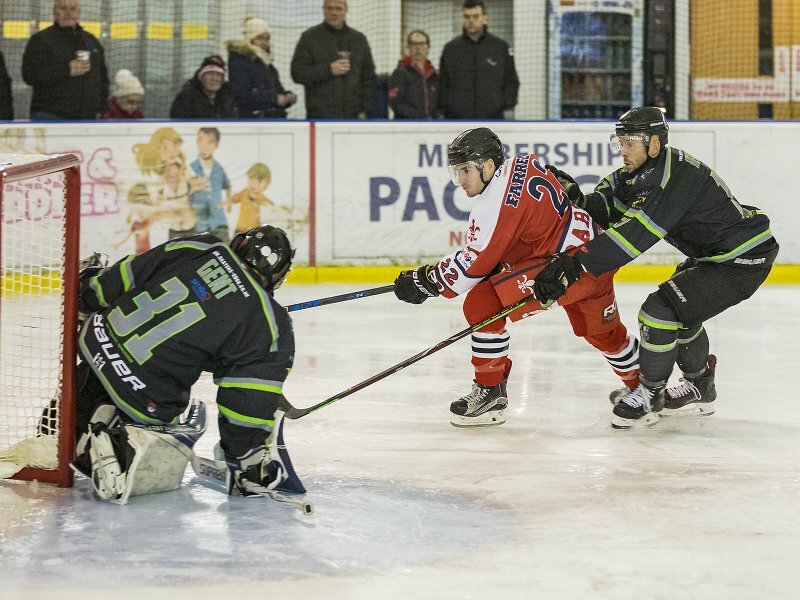 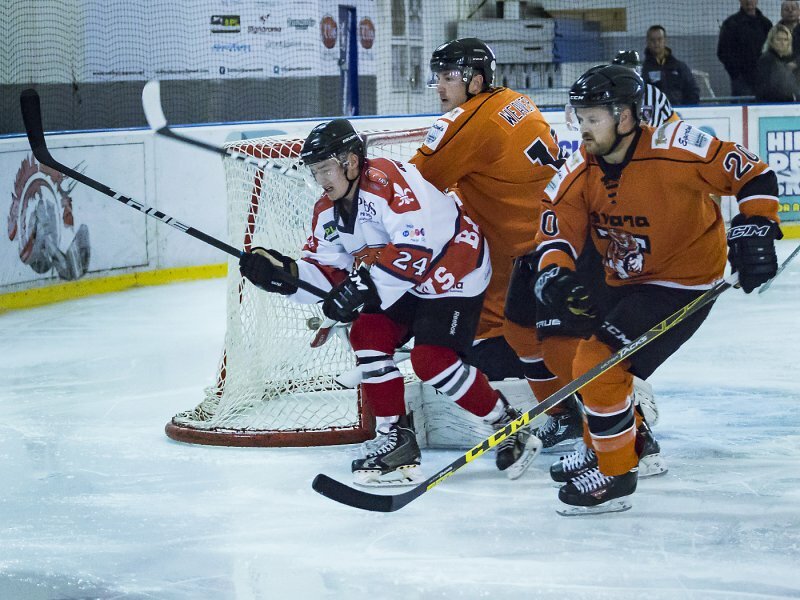 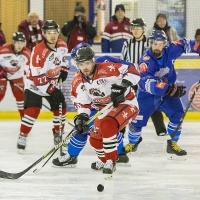 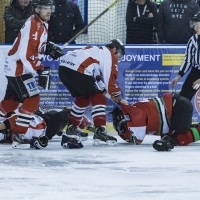 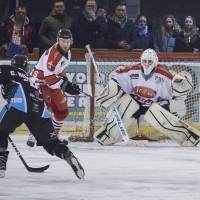 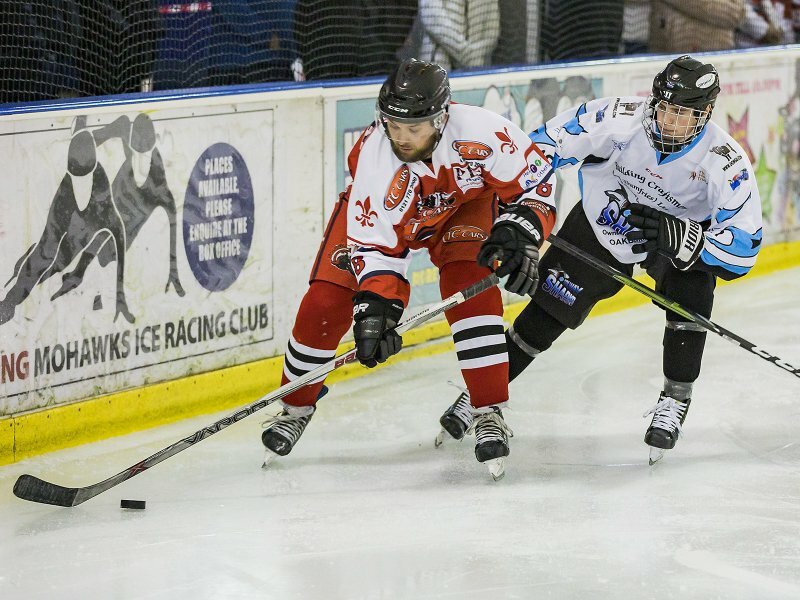 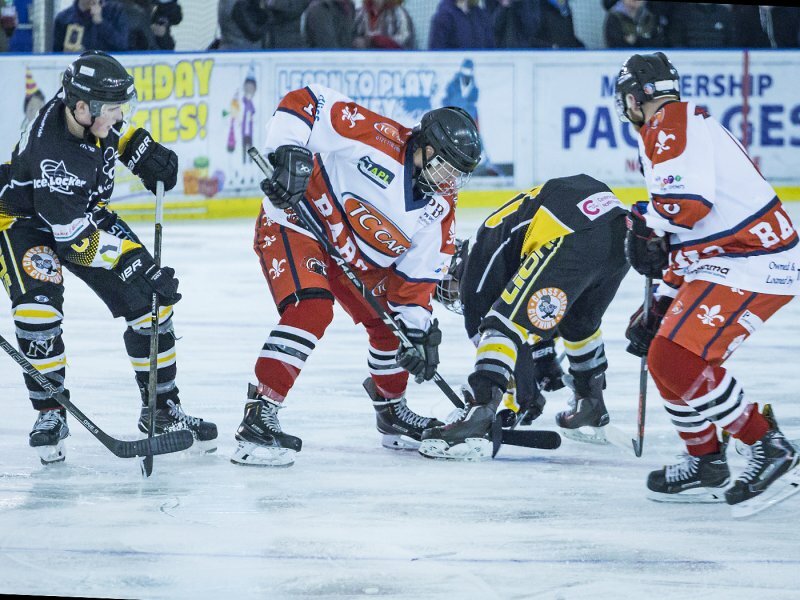 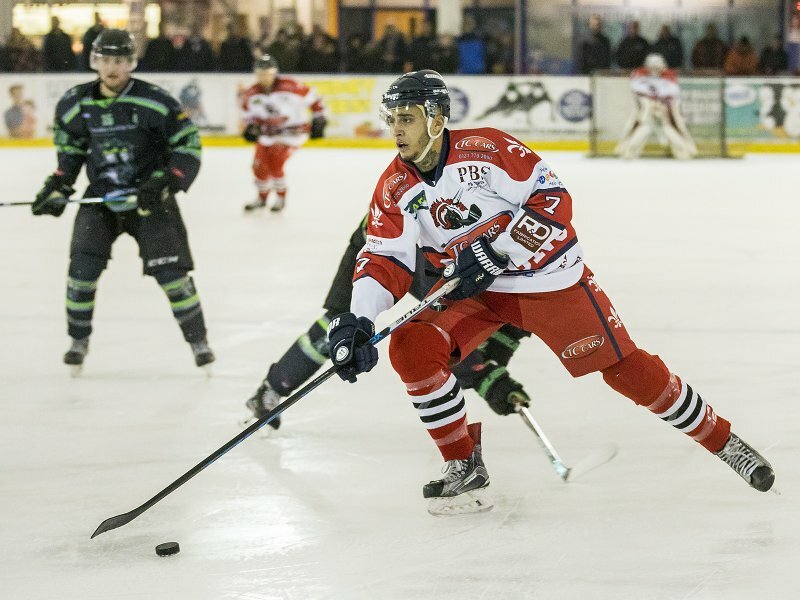 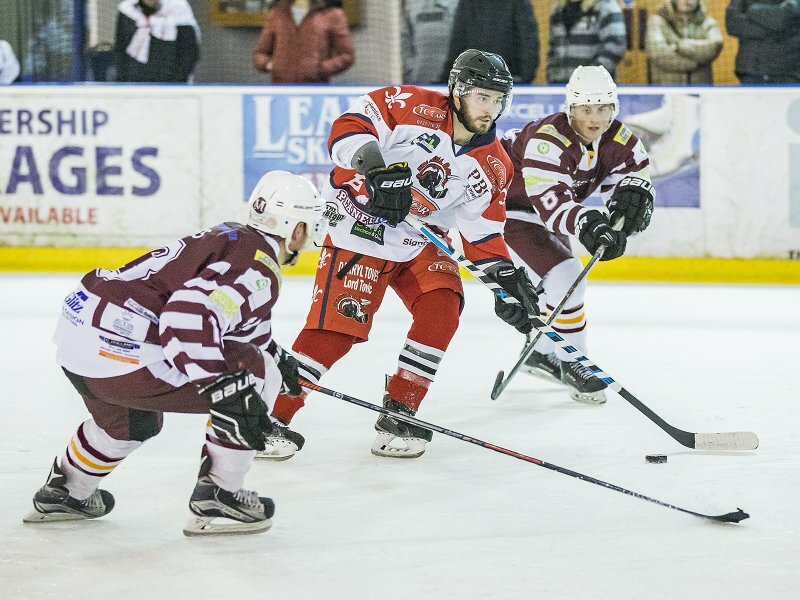 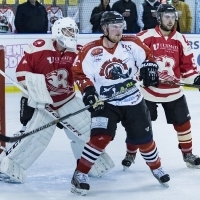 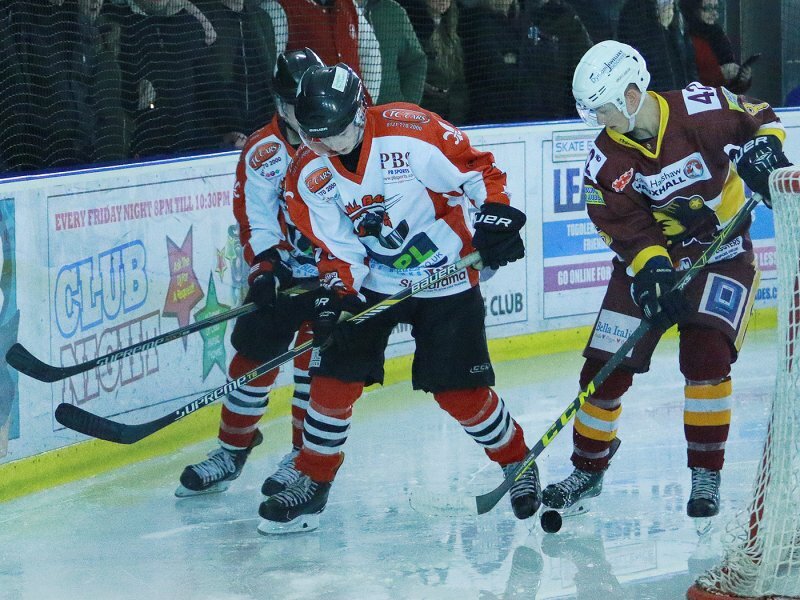 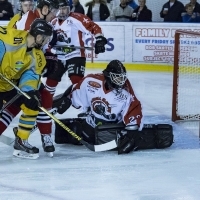 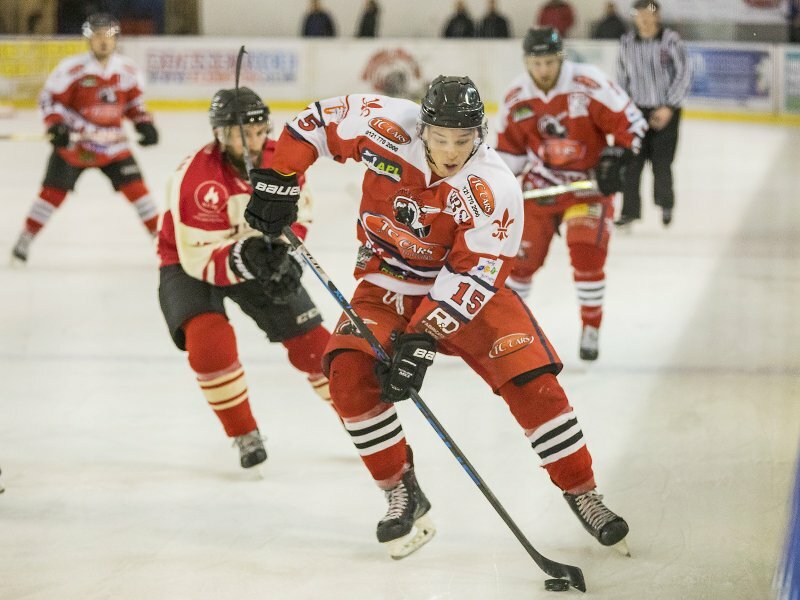 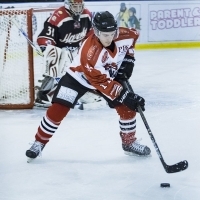 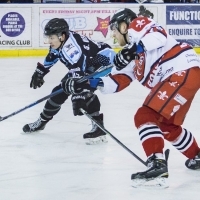 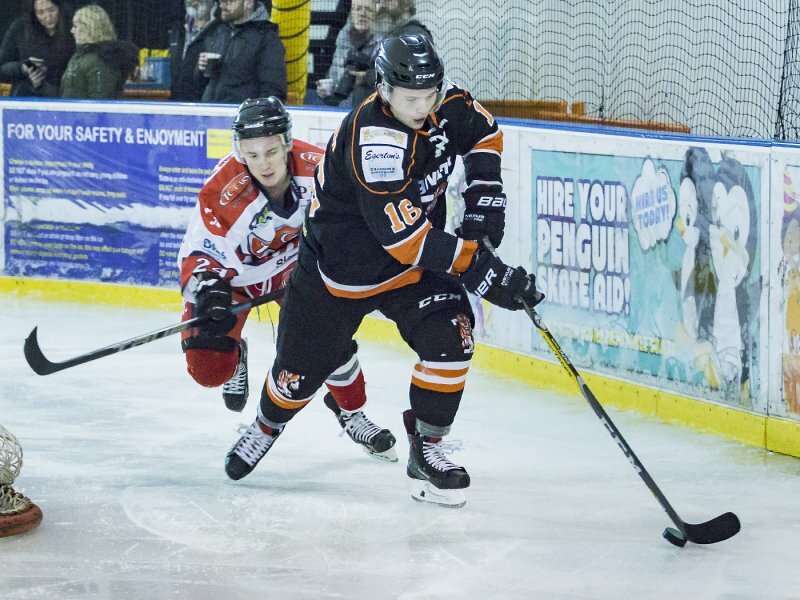 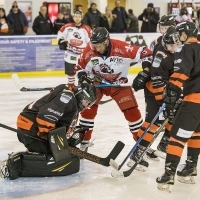 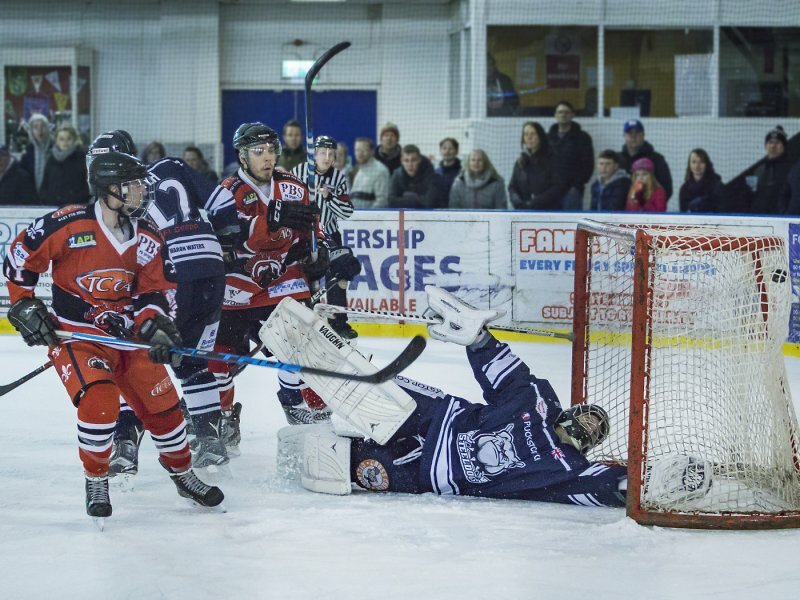 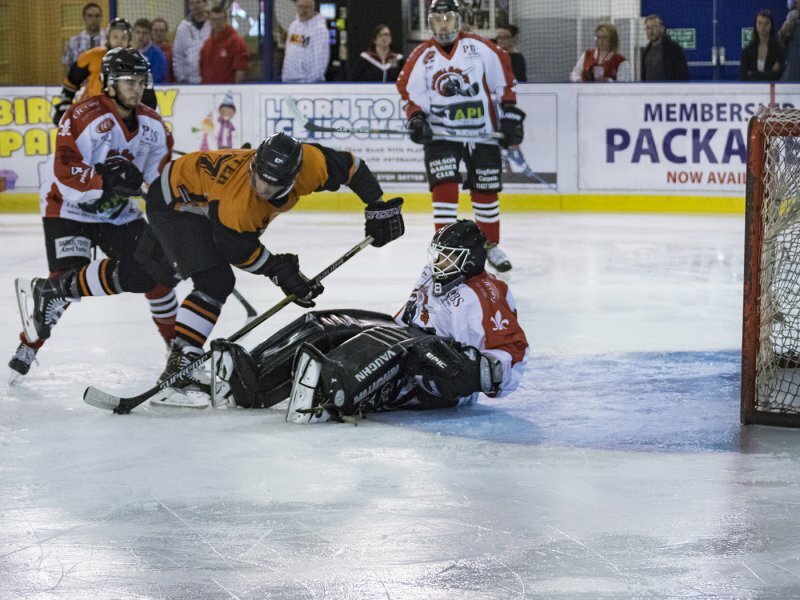 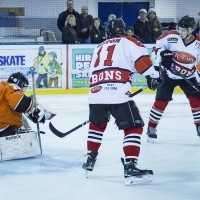 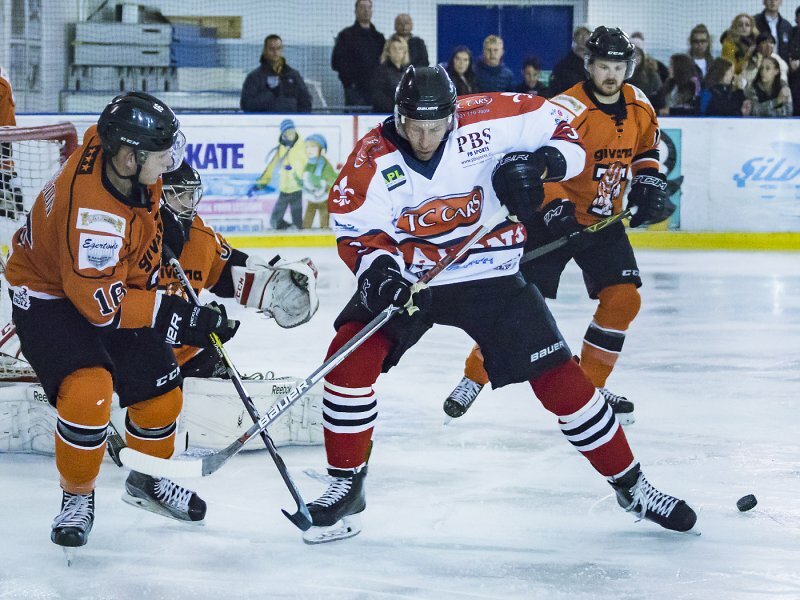 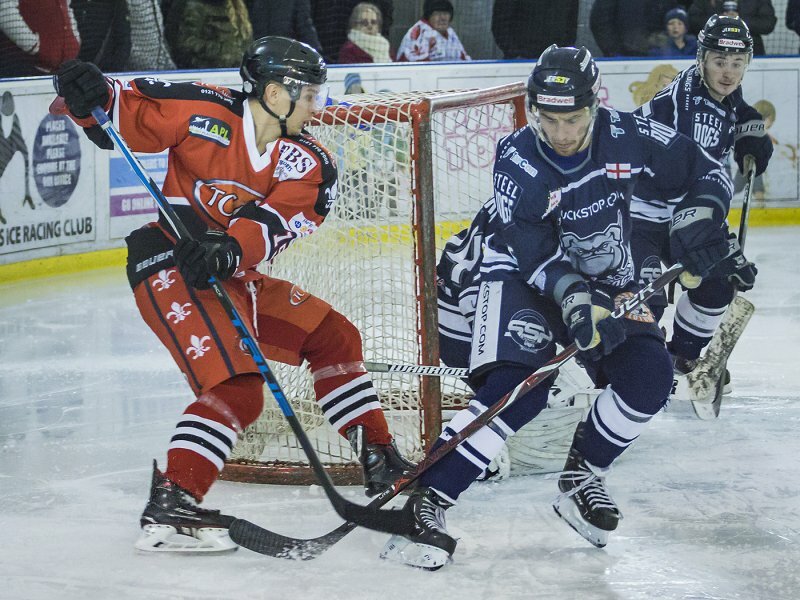 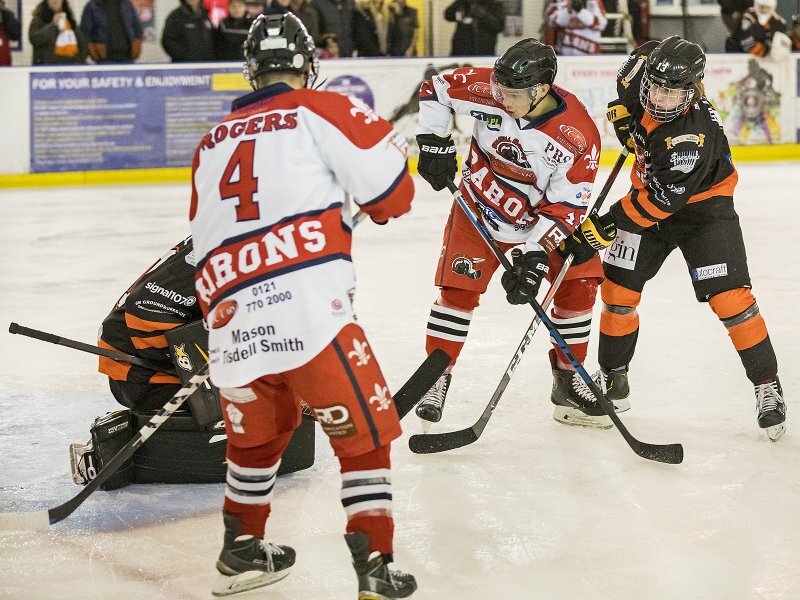 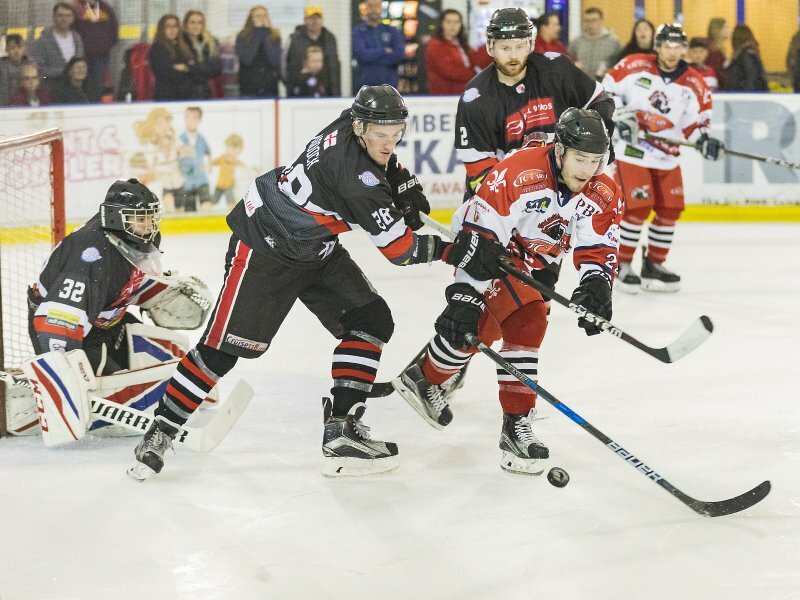 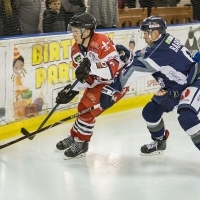 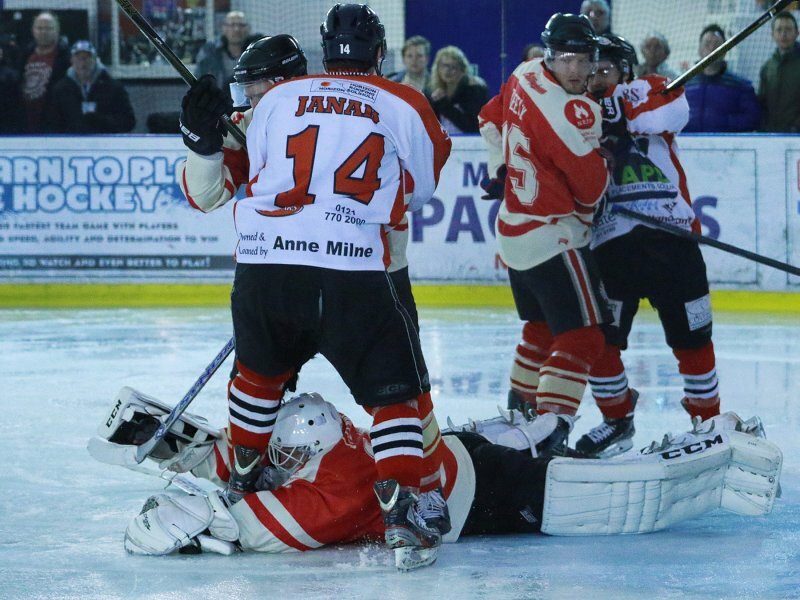 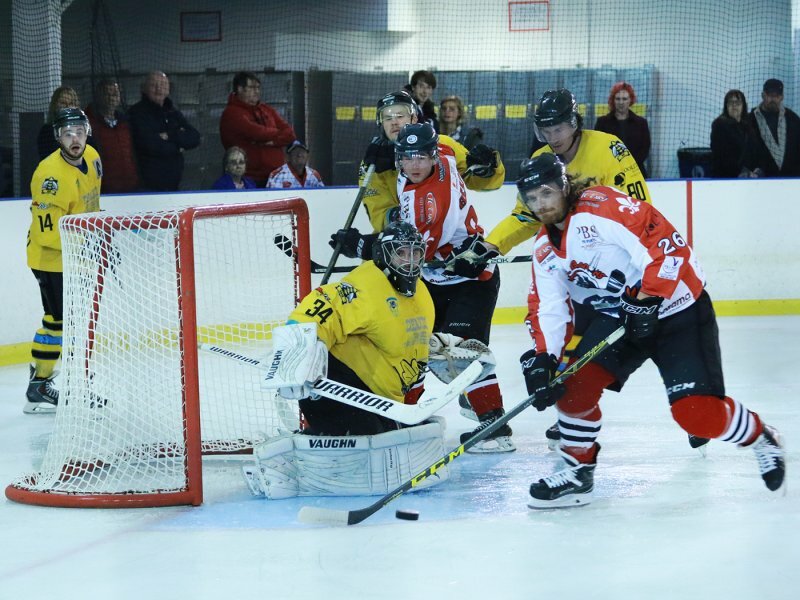 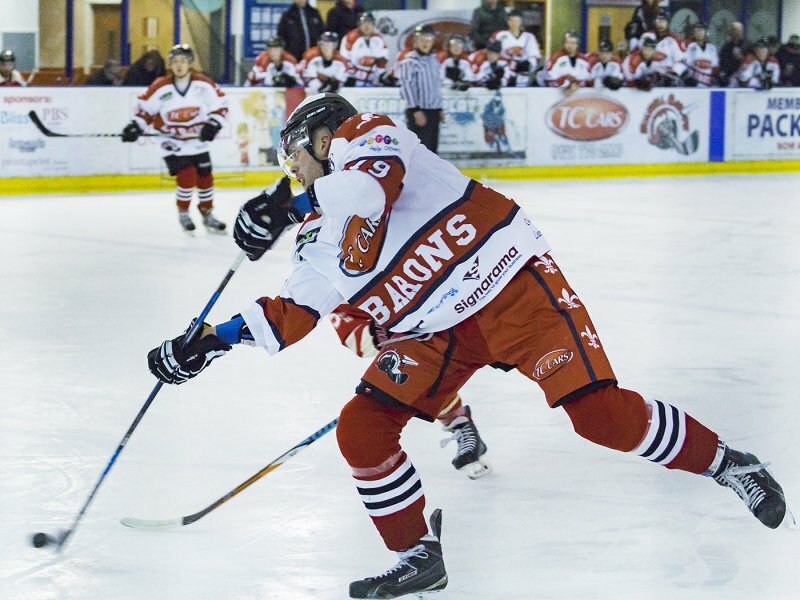 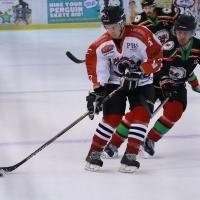 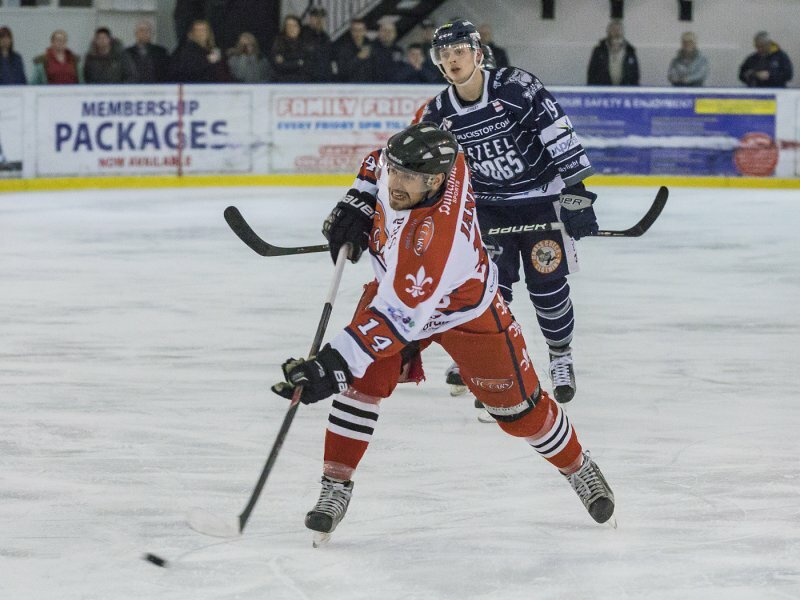 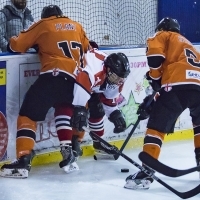 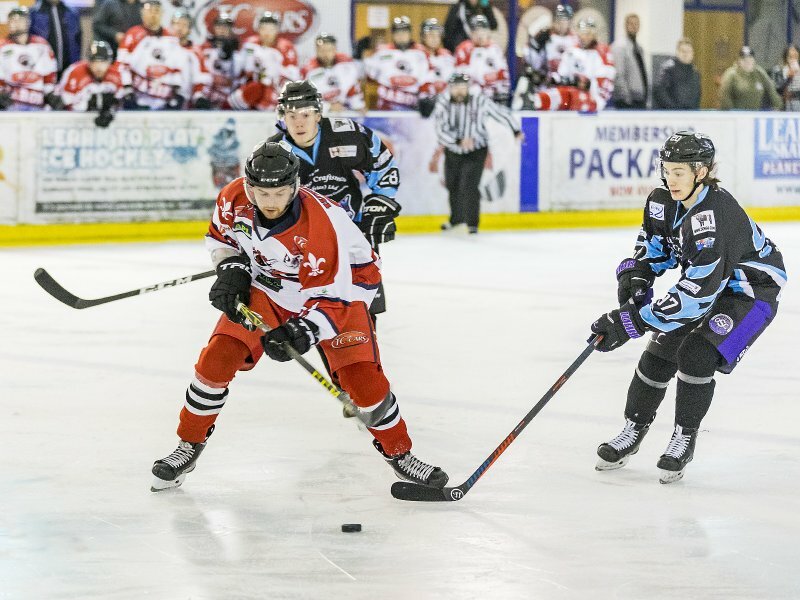 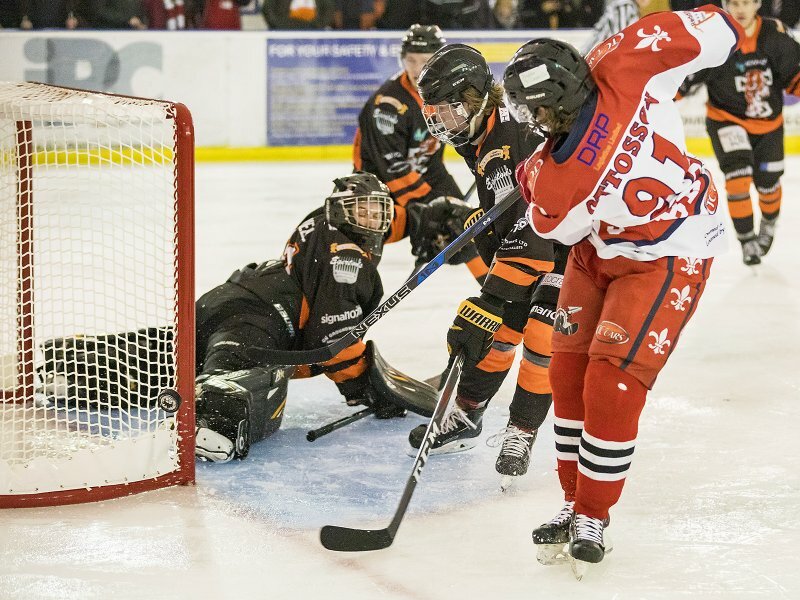 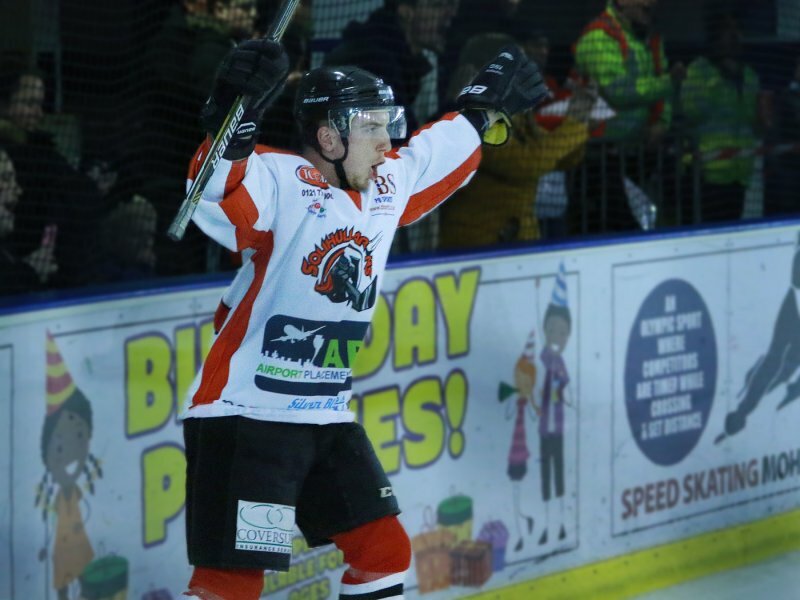 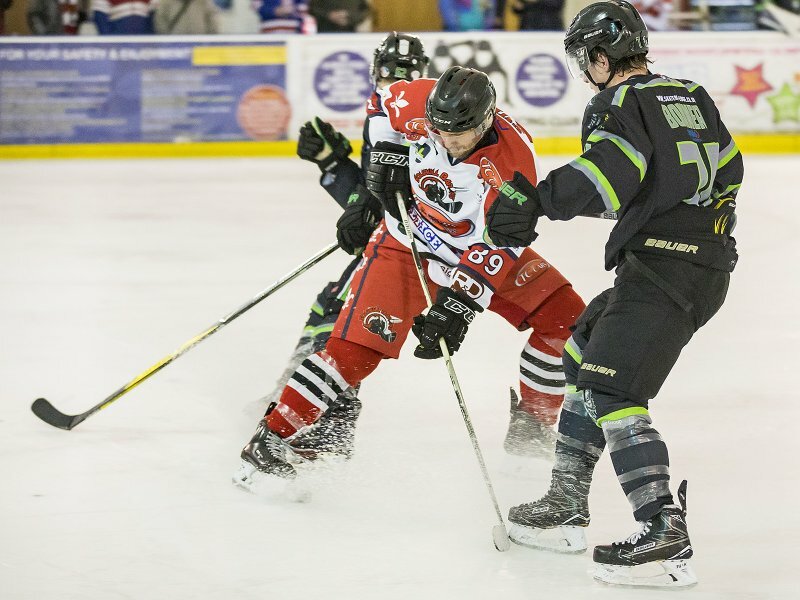 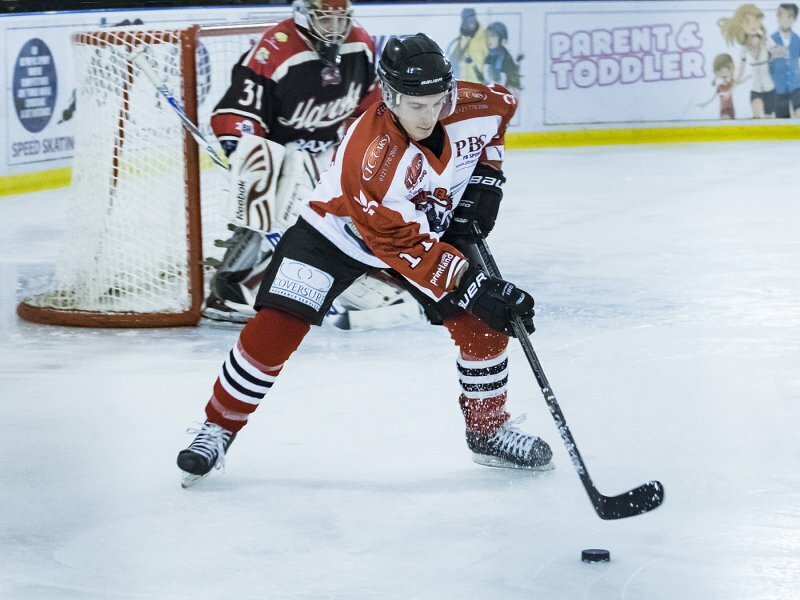 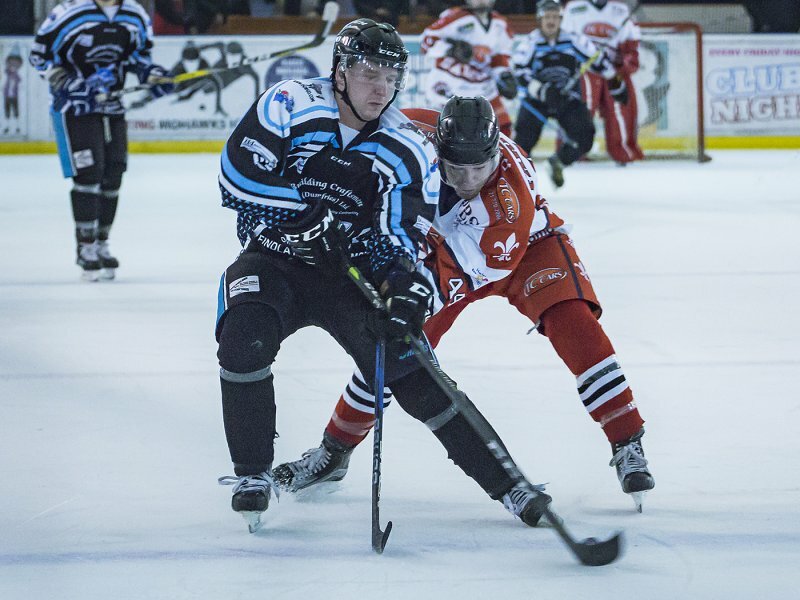 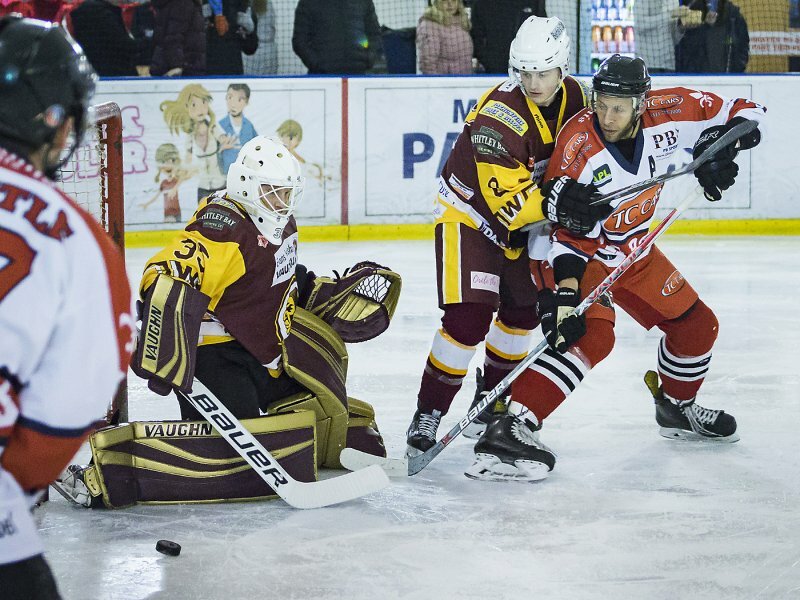 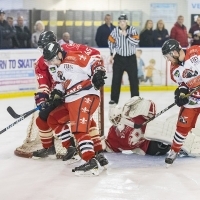 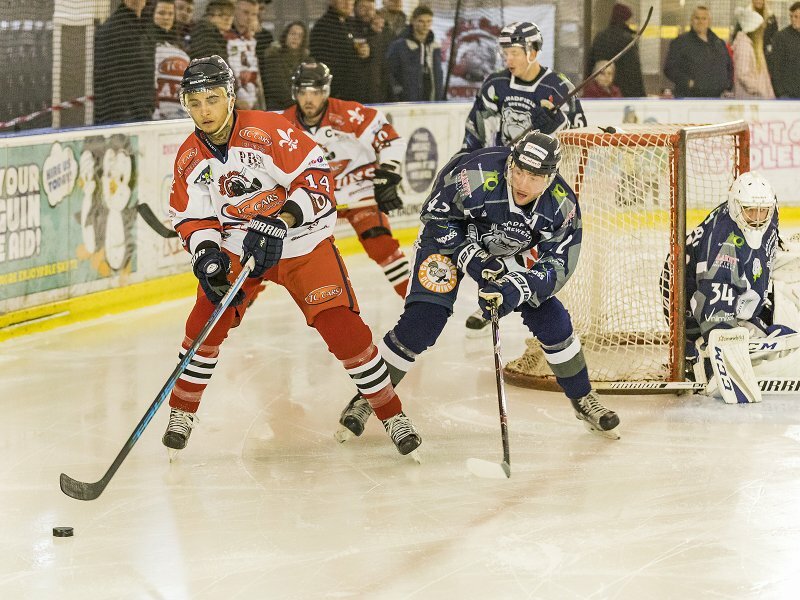 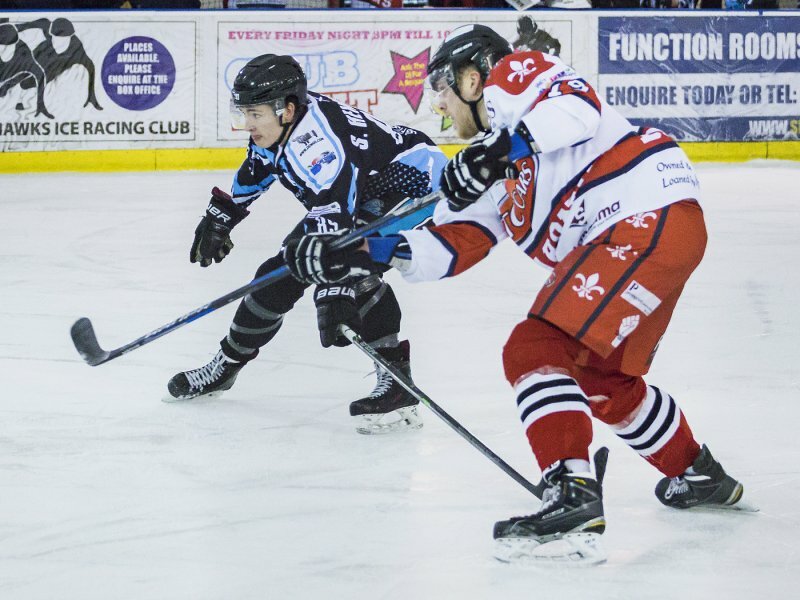 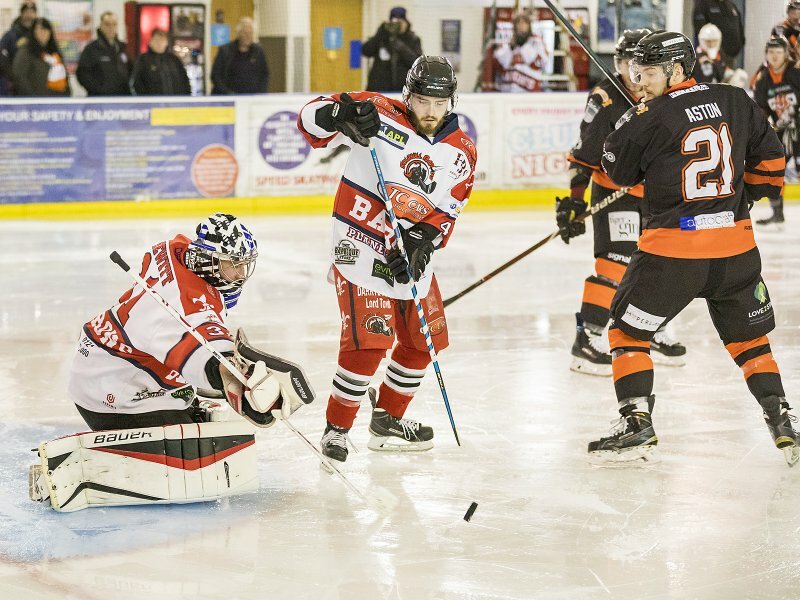 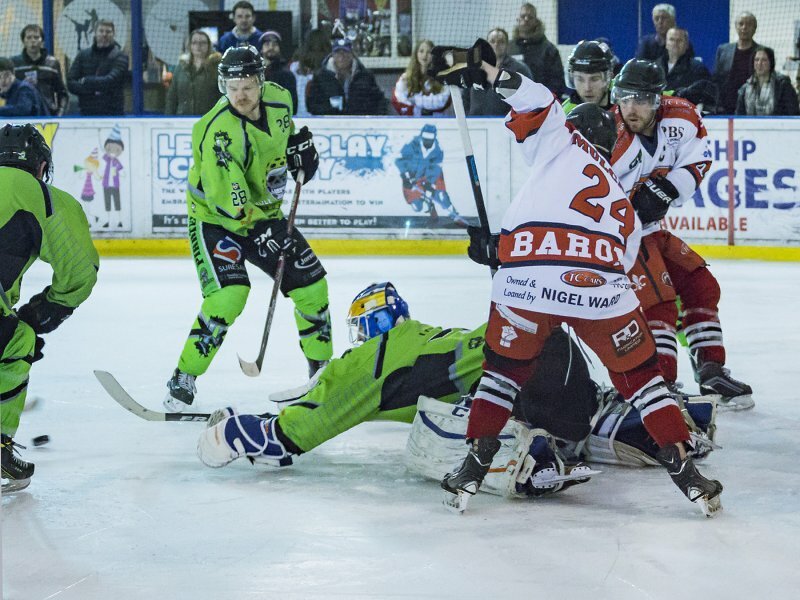 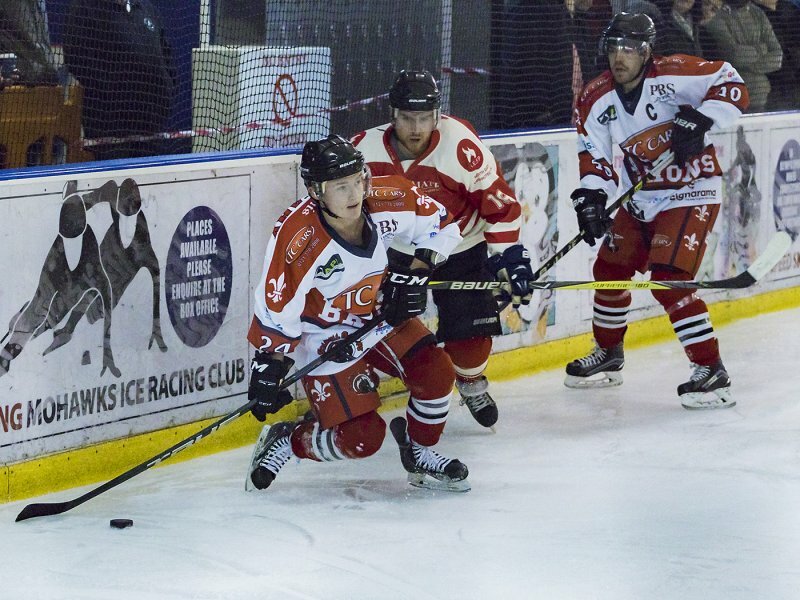 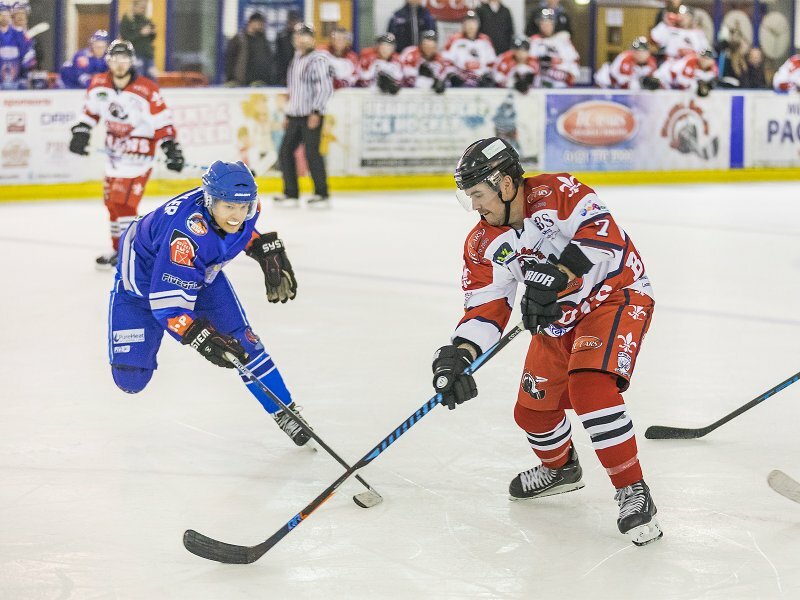 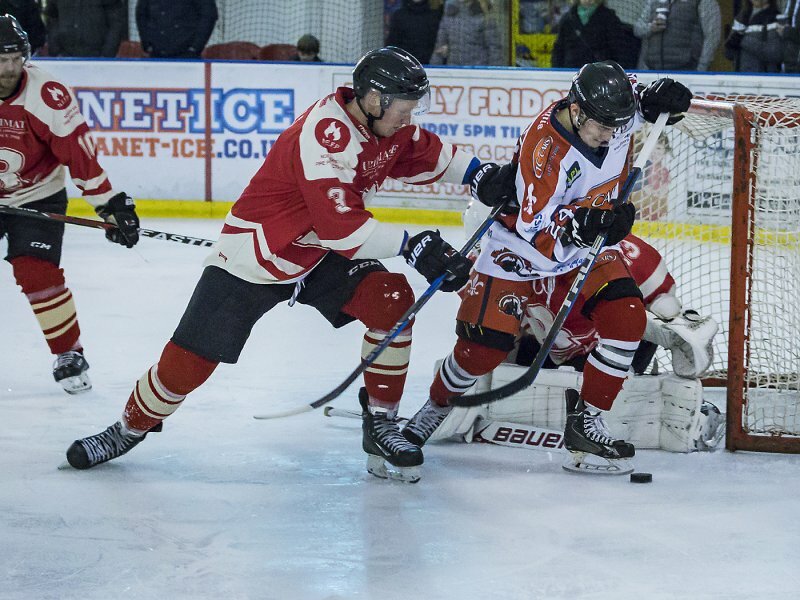 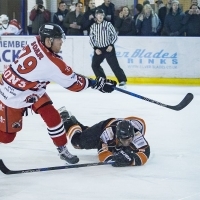 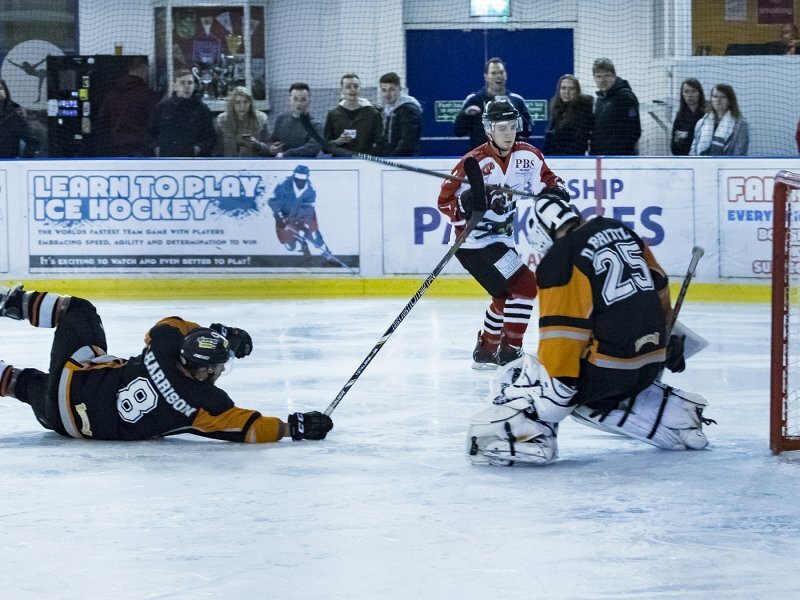 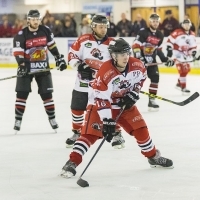 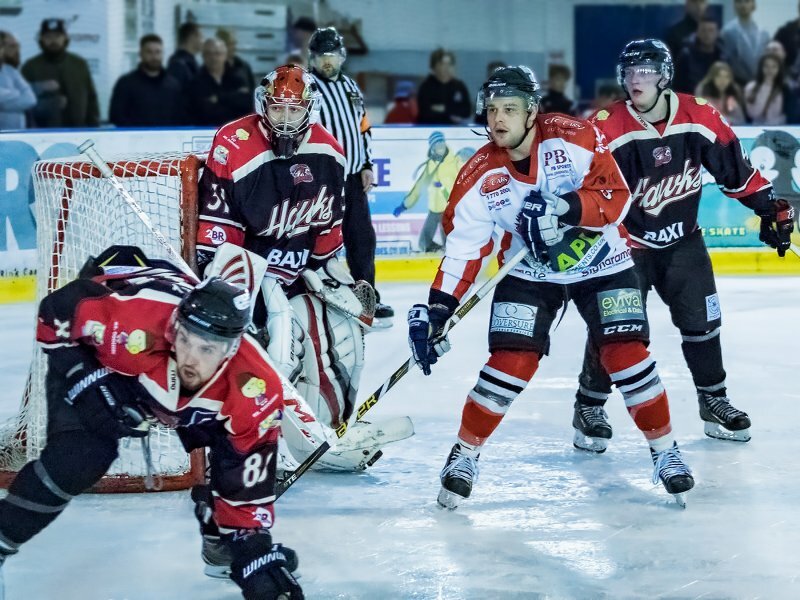 10th March 2019 – Barons v Solway Sharks. 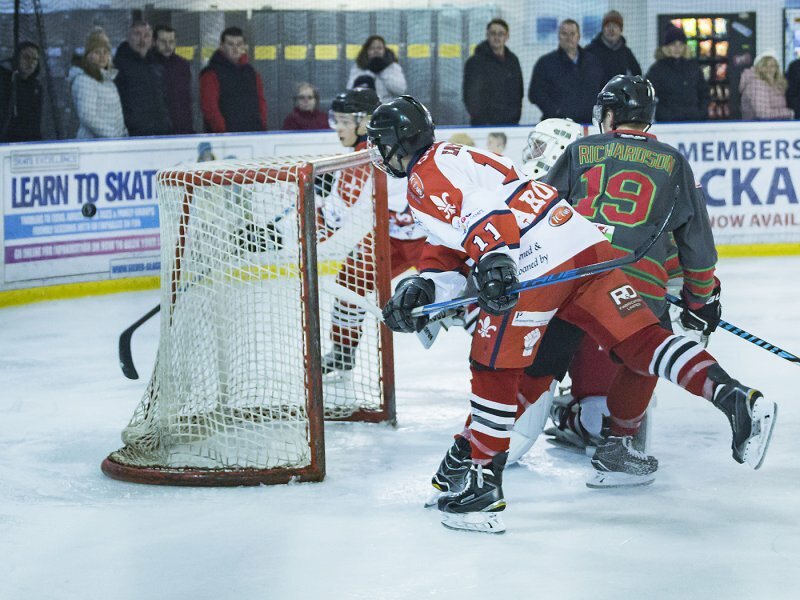 Final score 5-4. 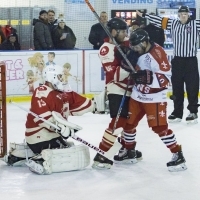 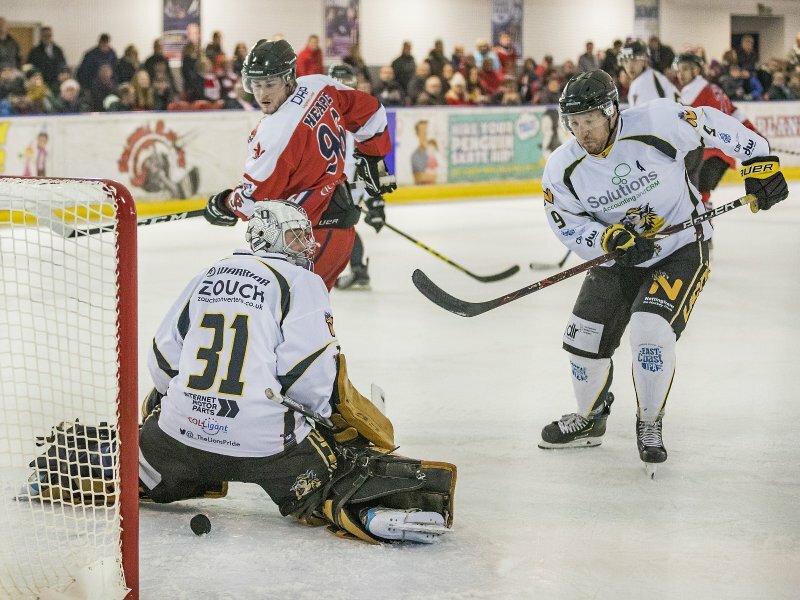 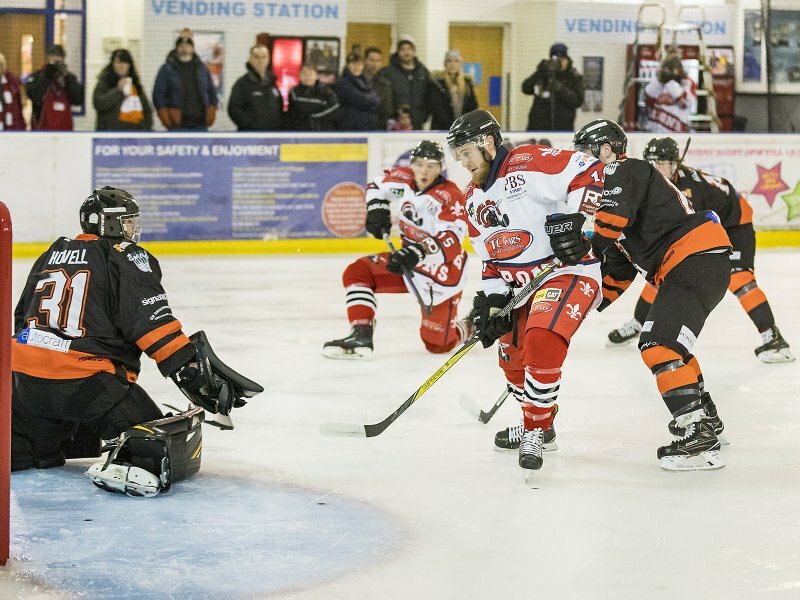 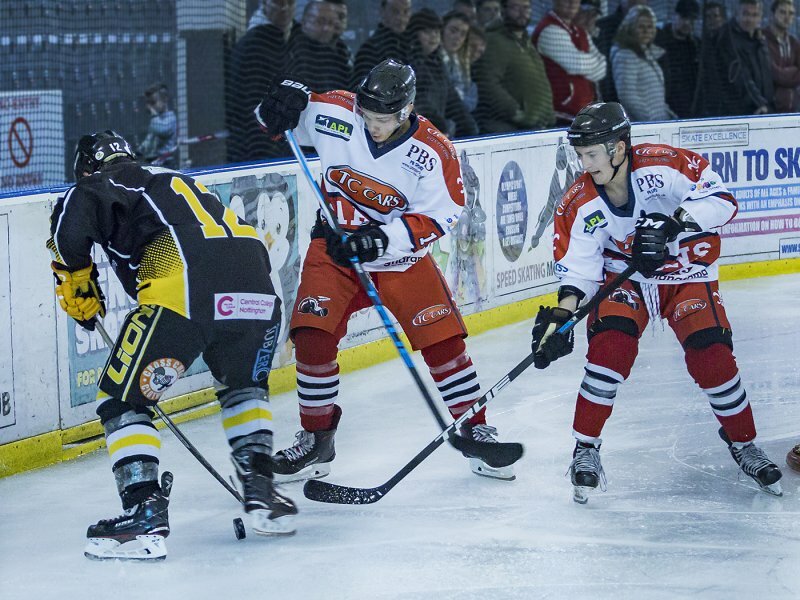 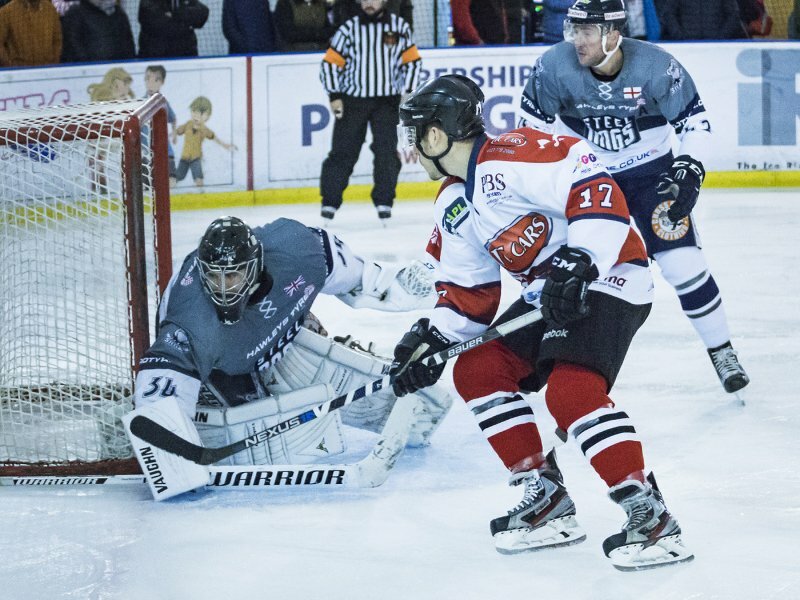 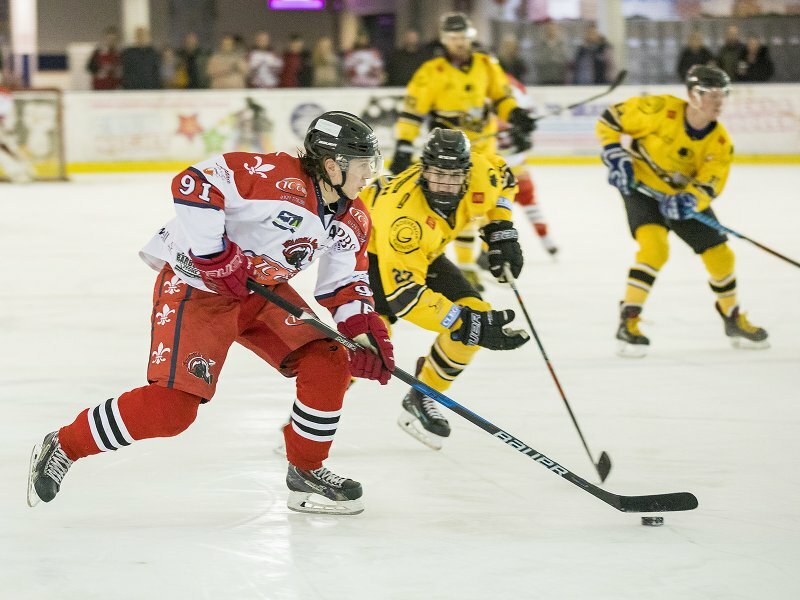 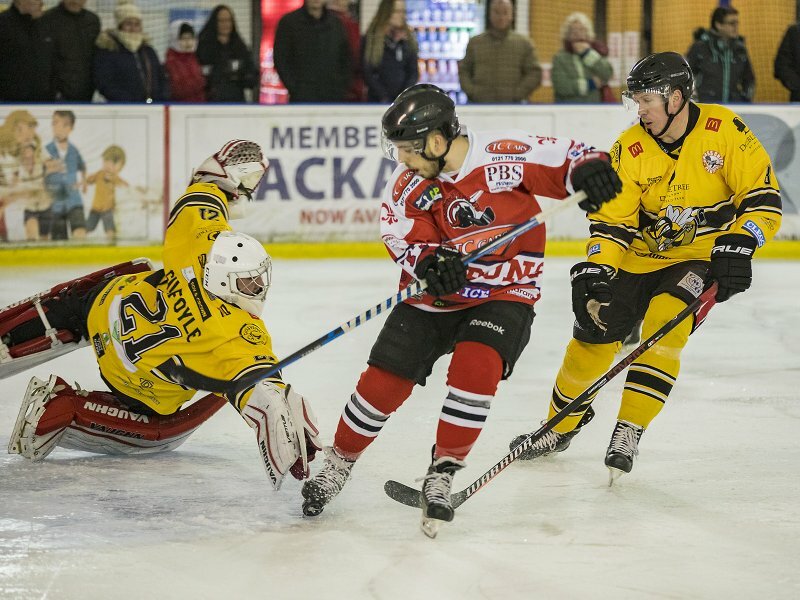 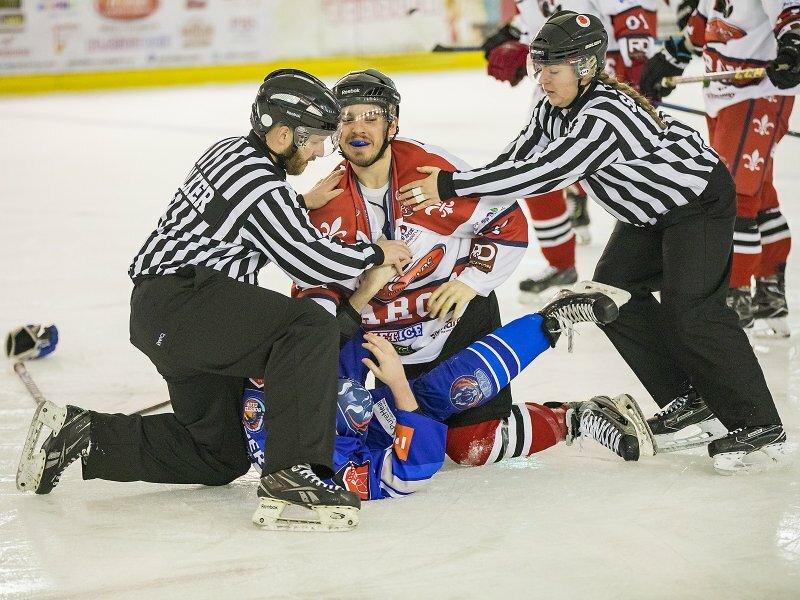 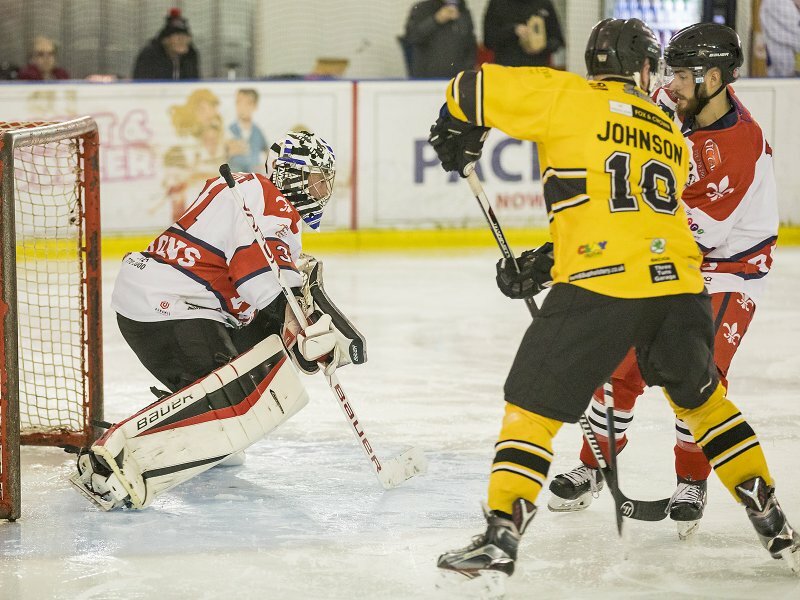 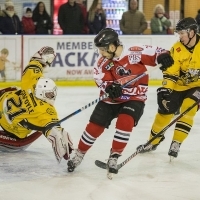 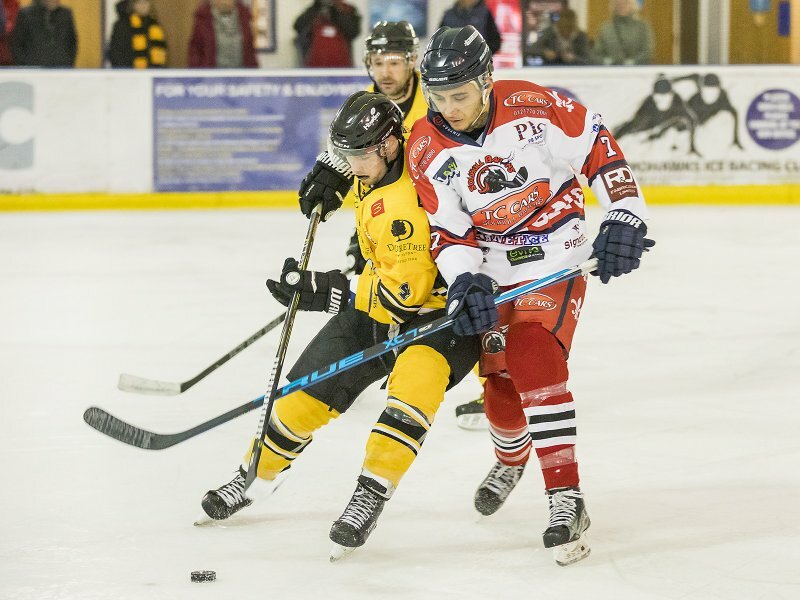 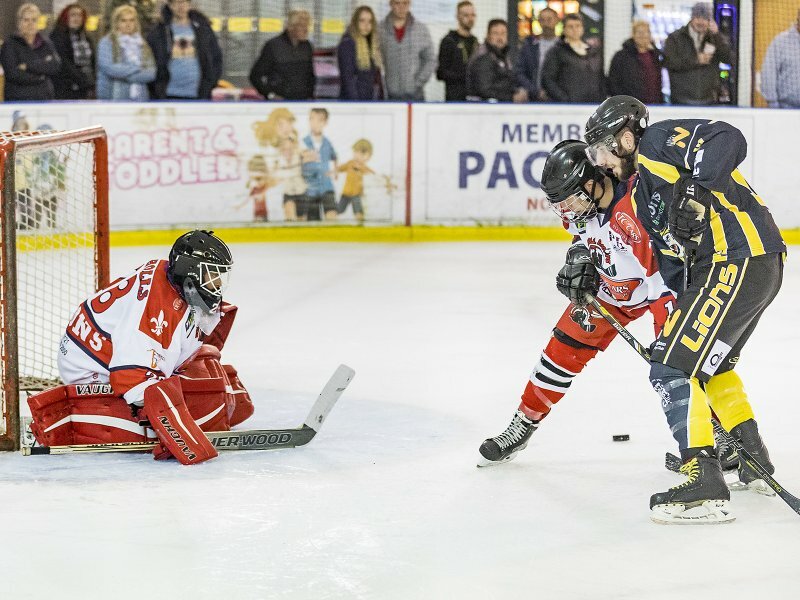 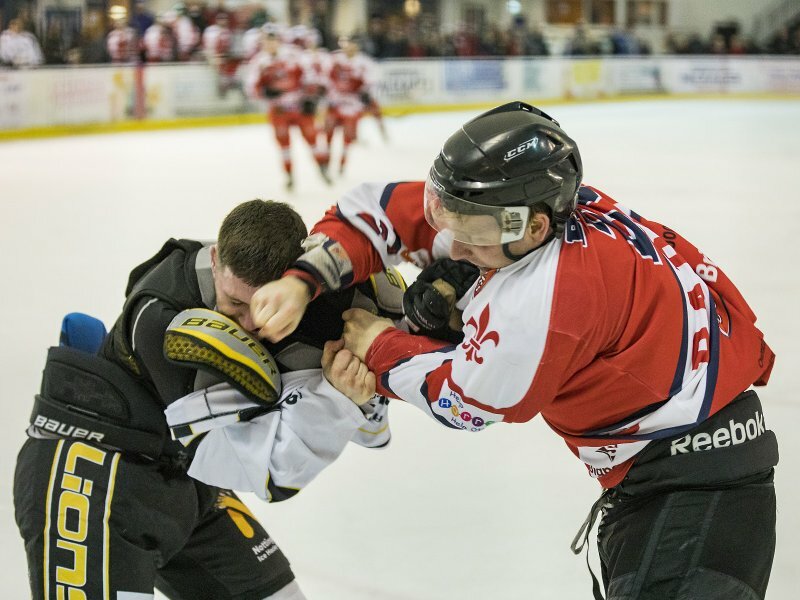 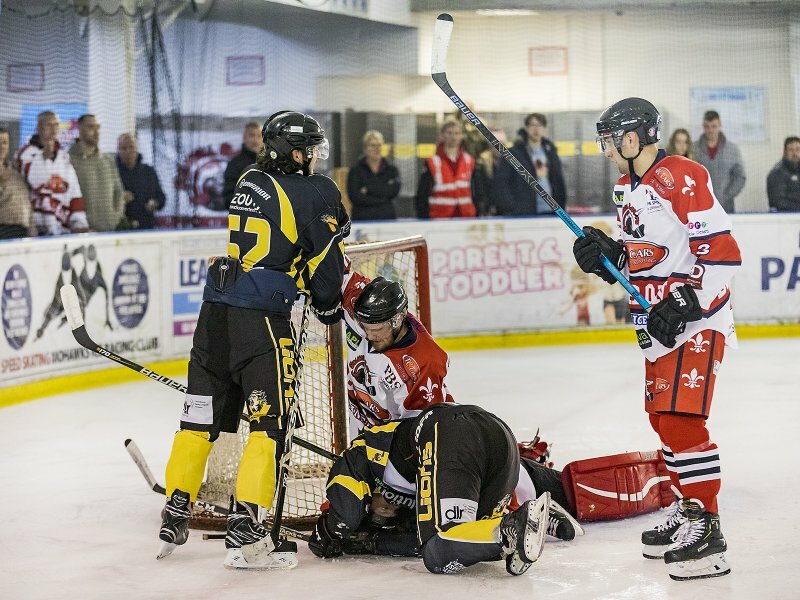 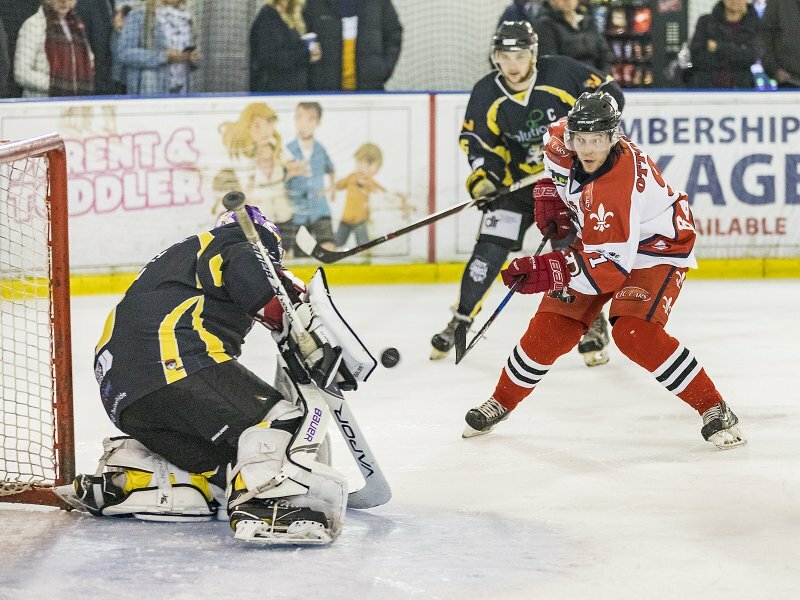 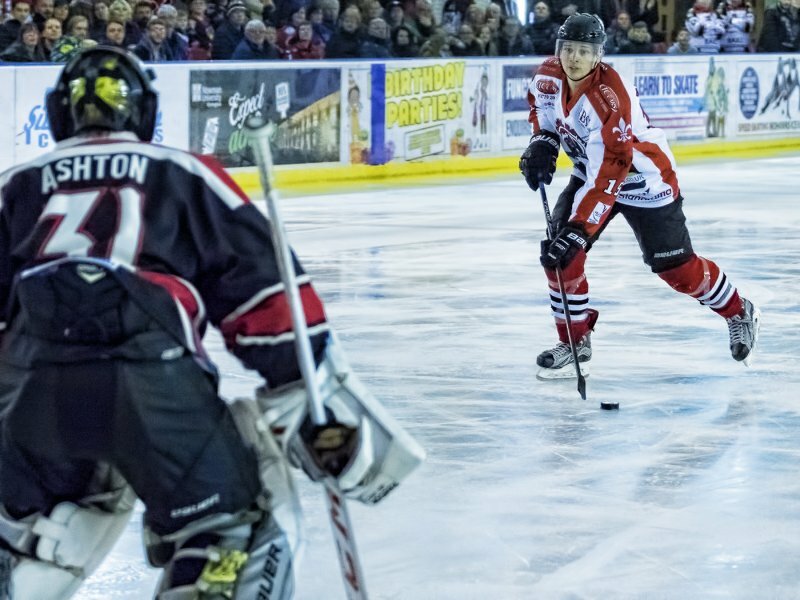 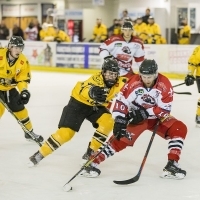 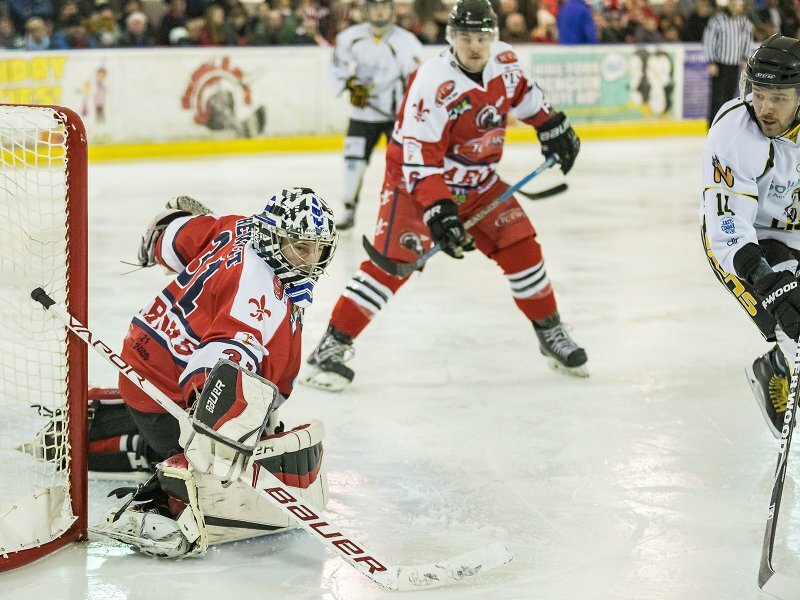 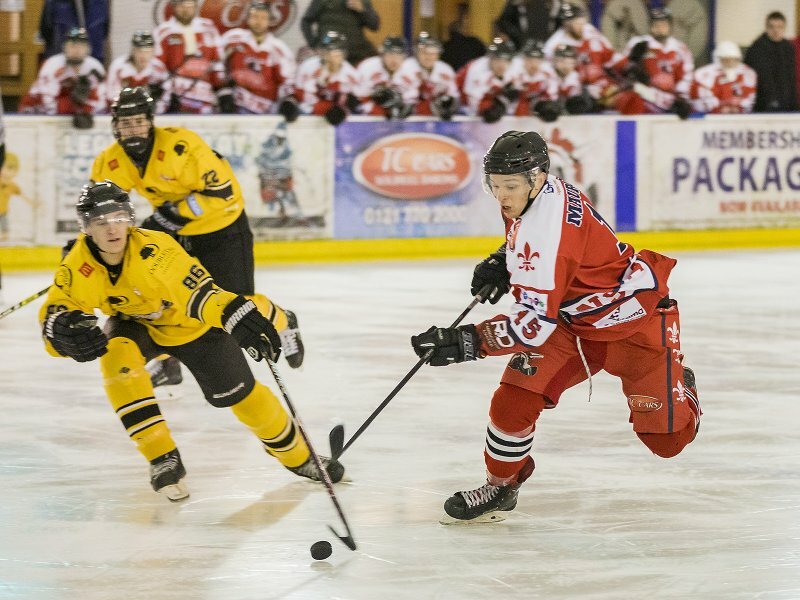 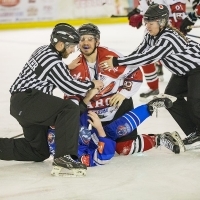 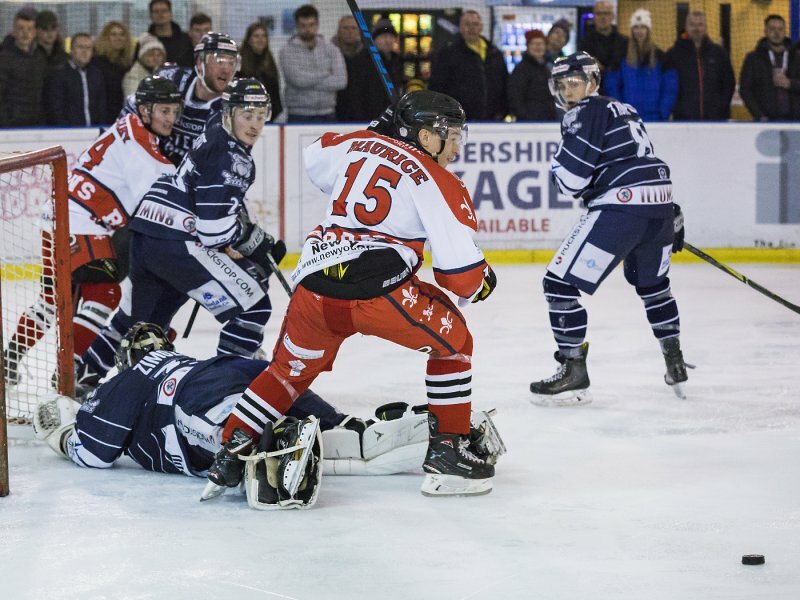 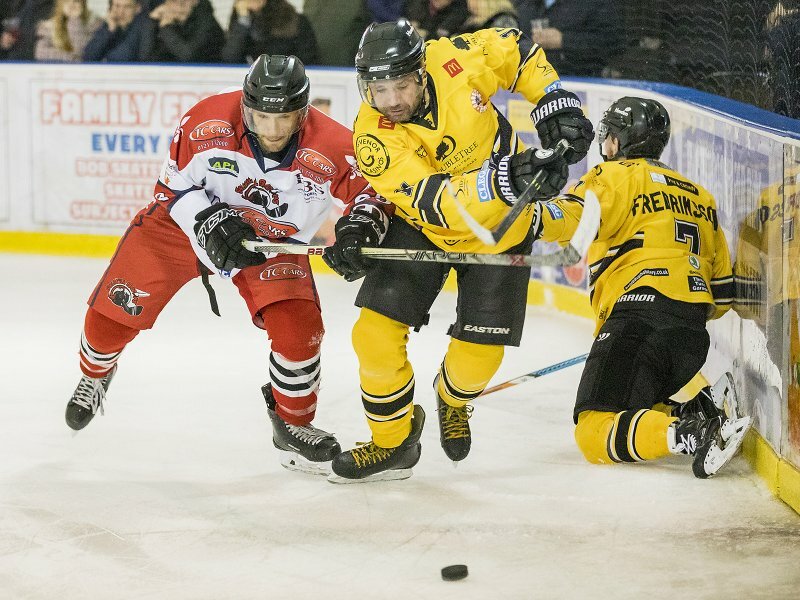 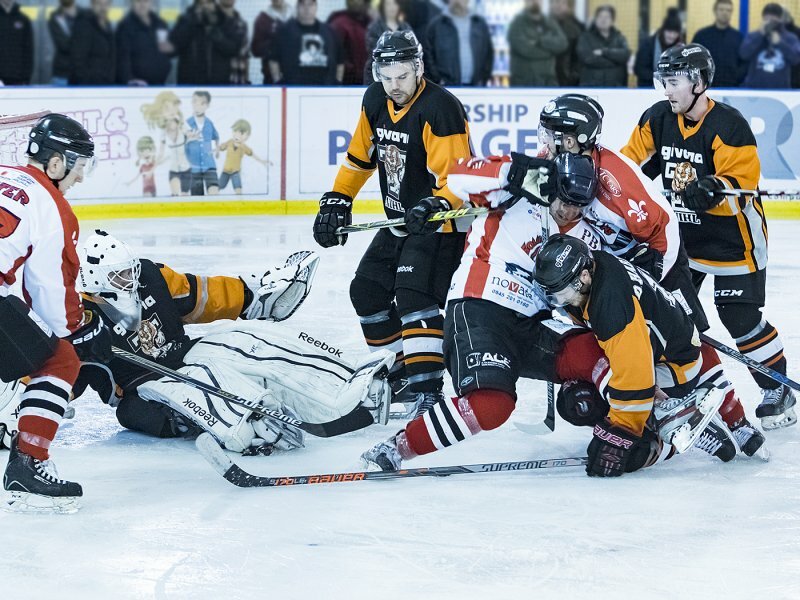 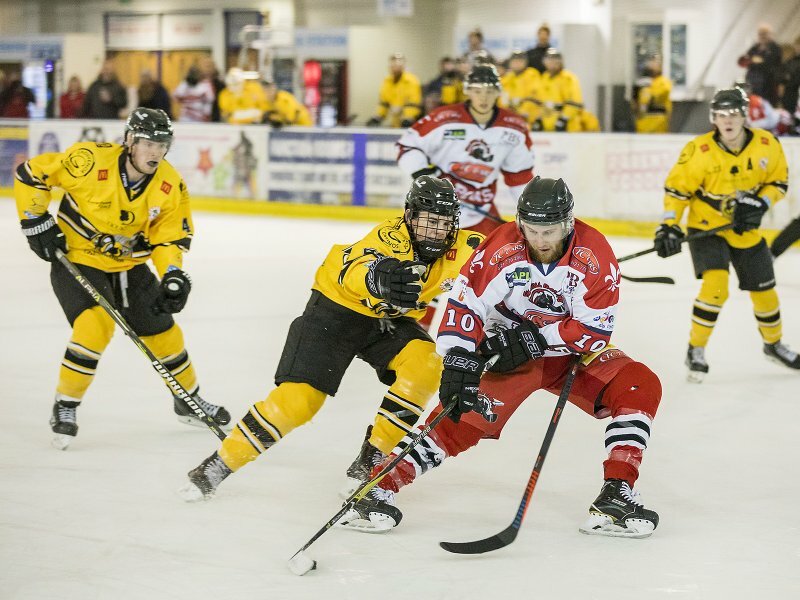 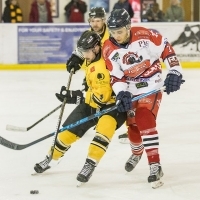 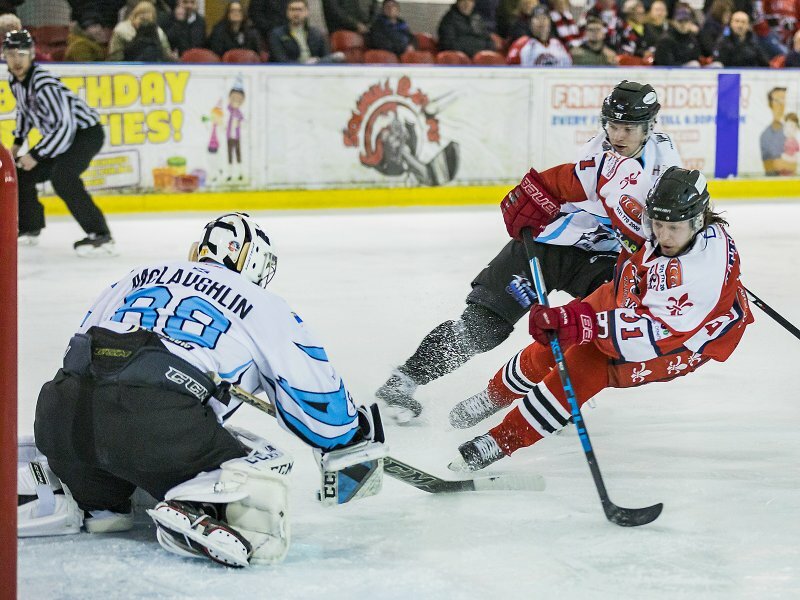 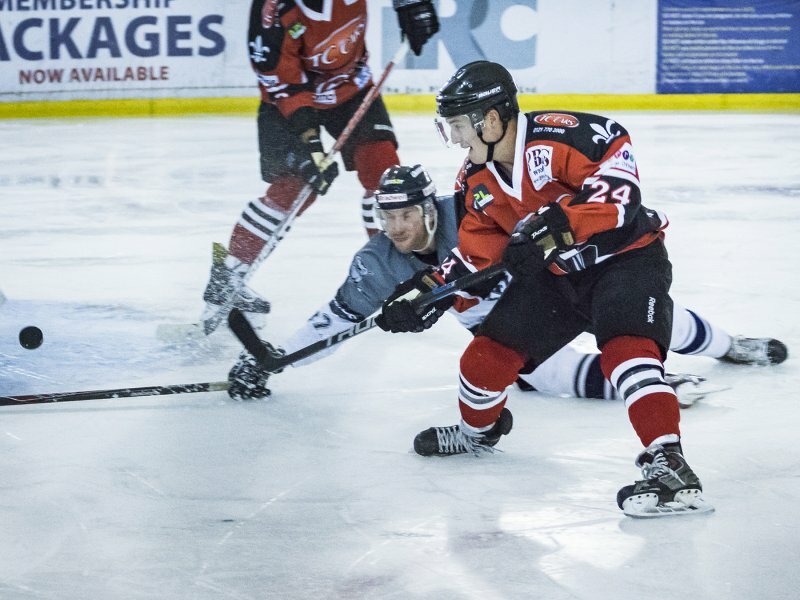 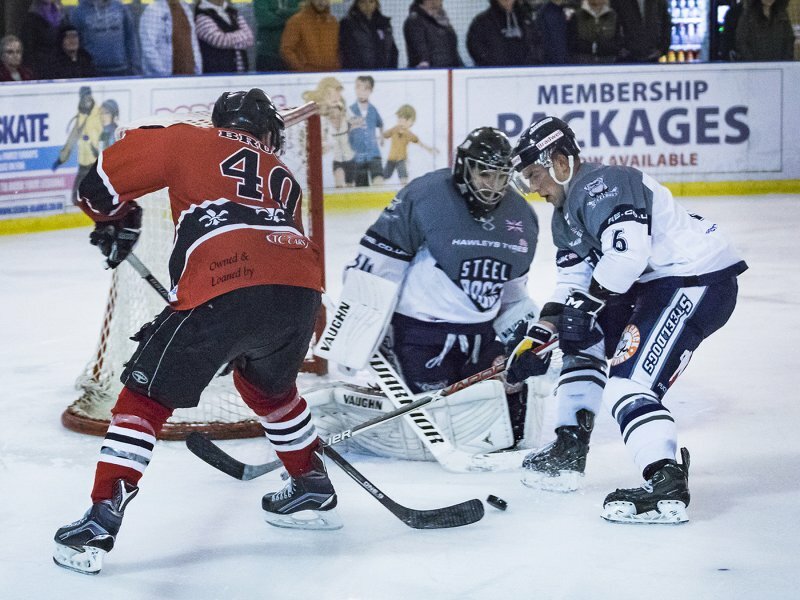 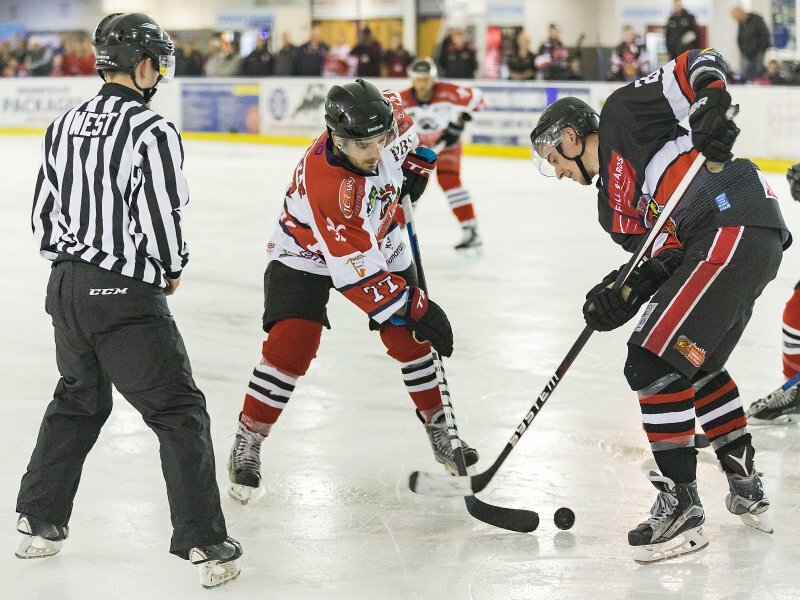 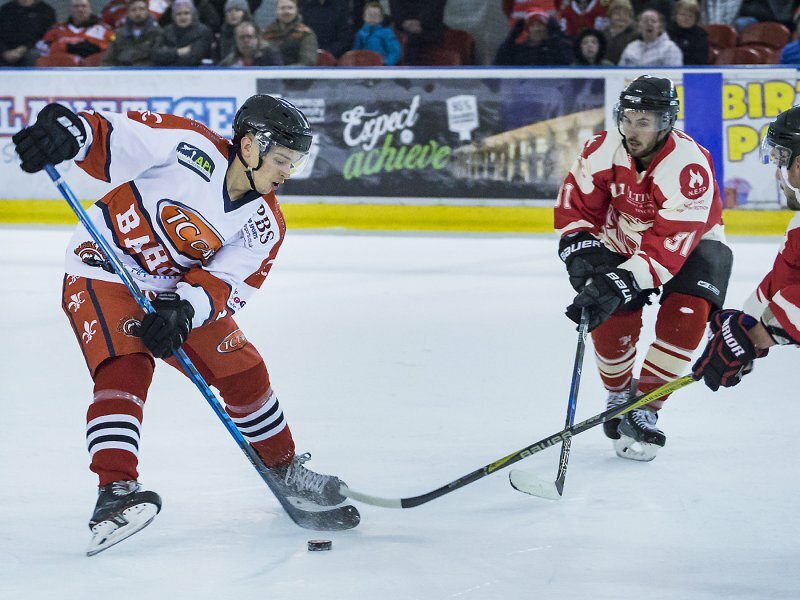 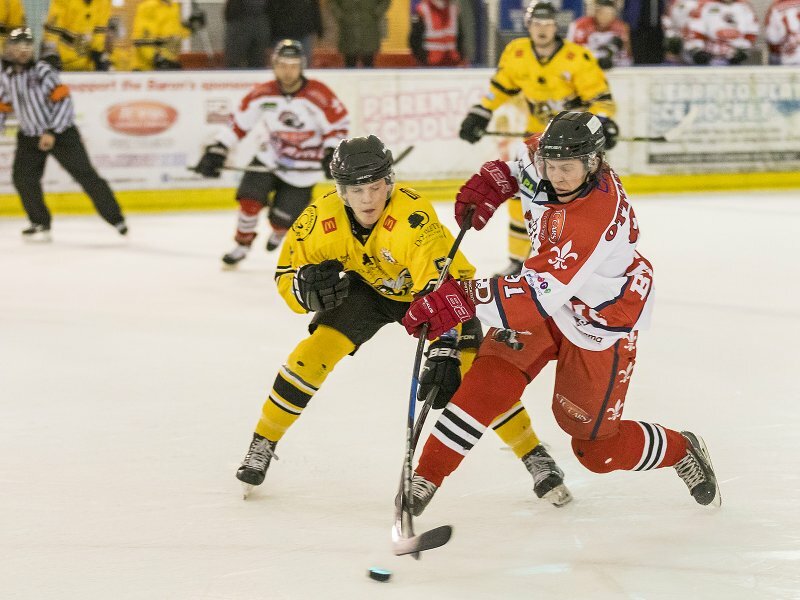 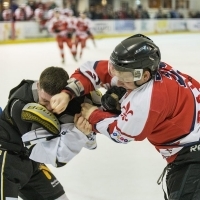 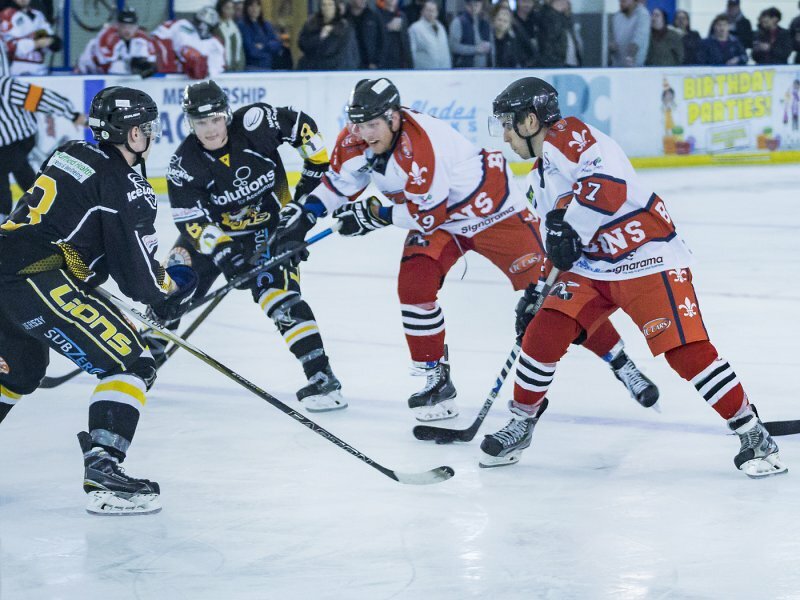 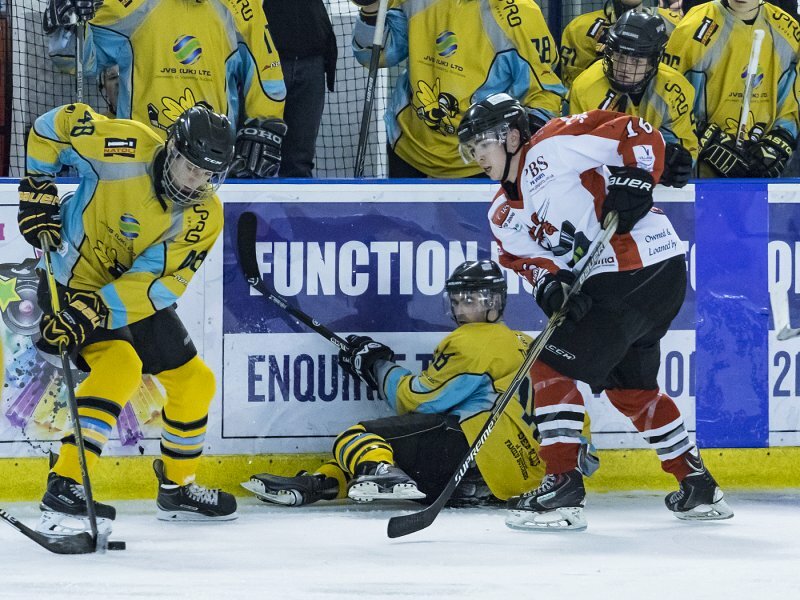 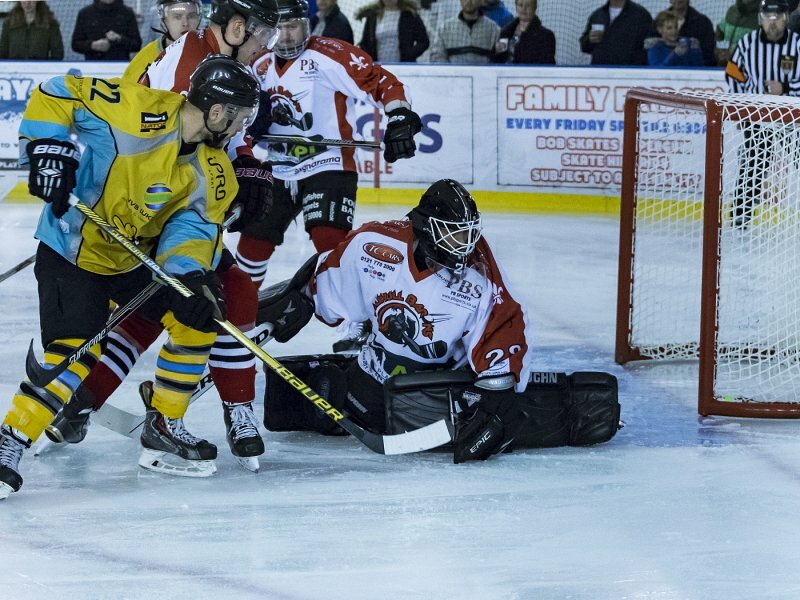 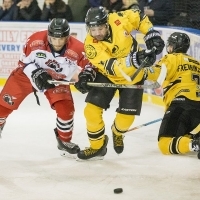 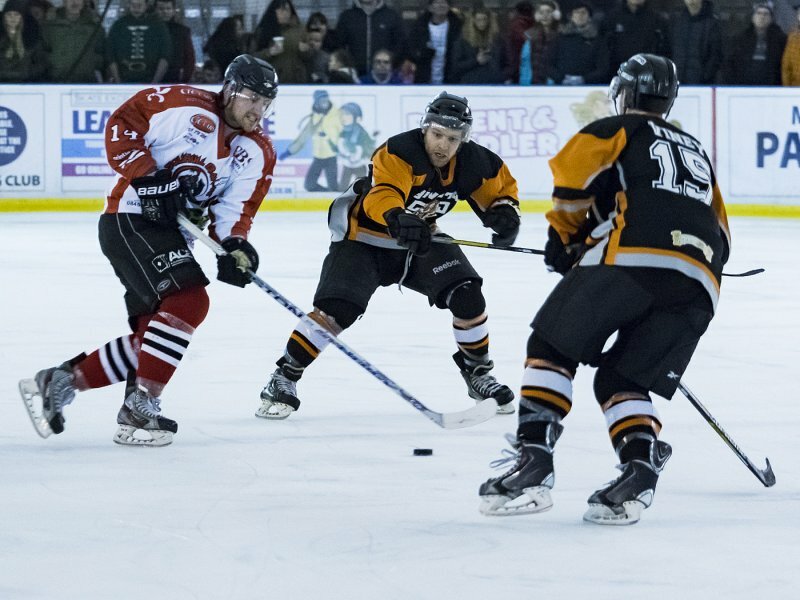 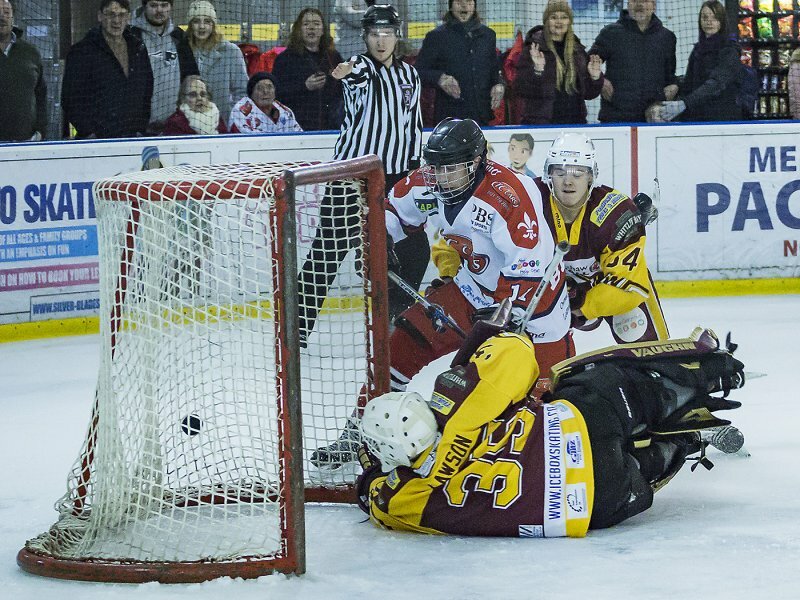 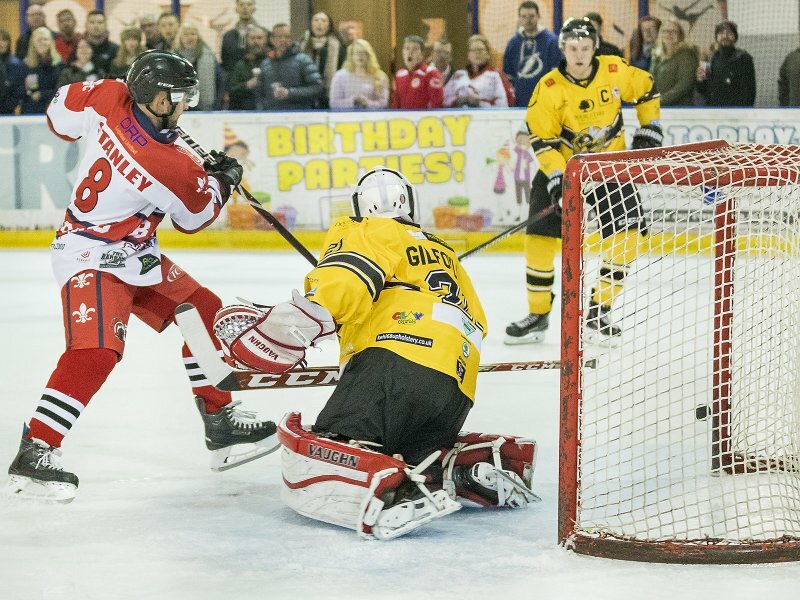 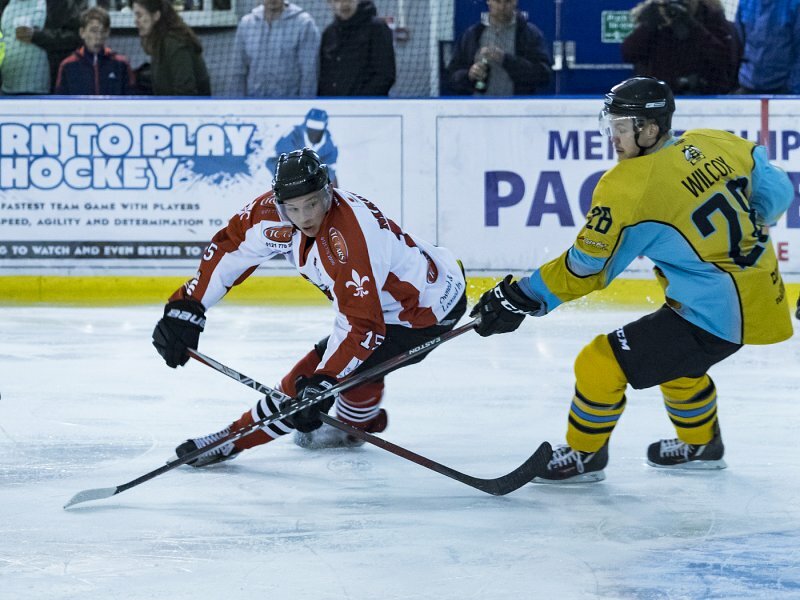 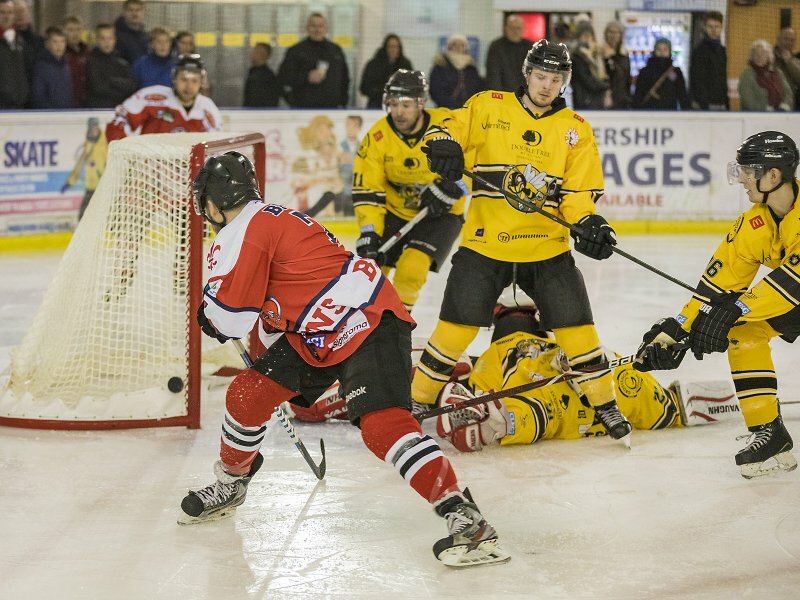 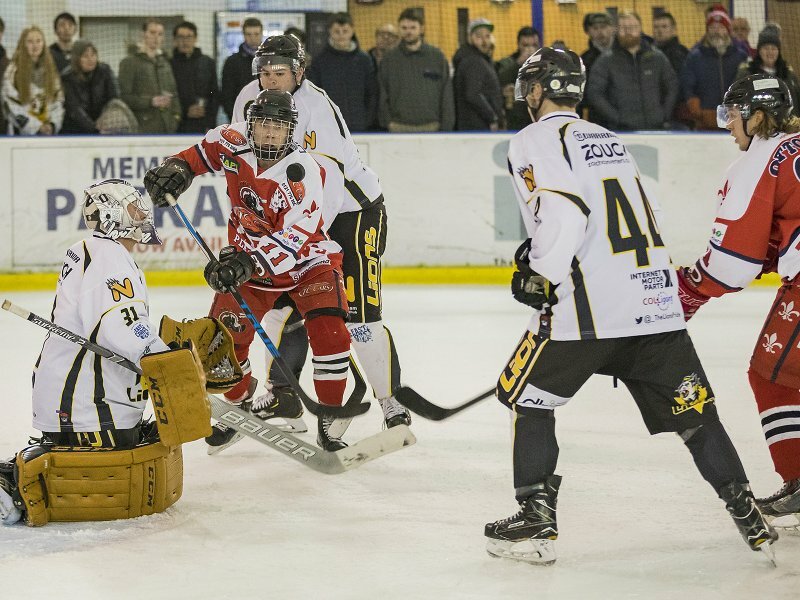 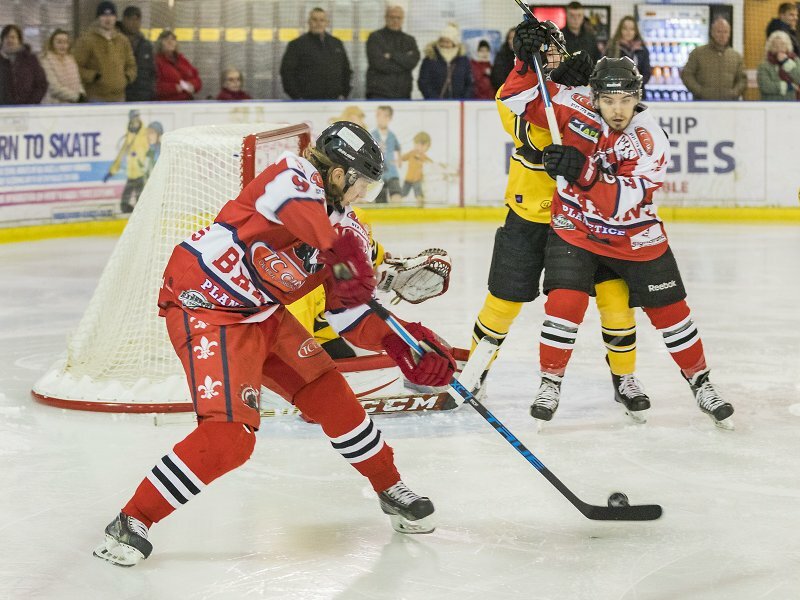 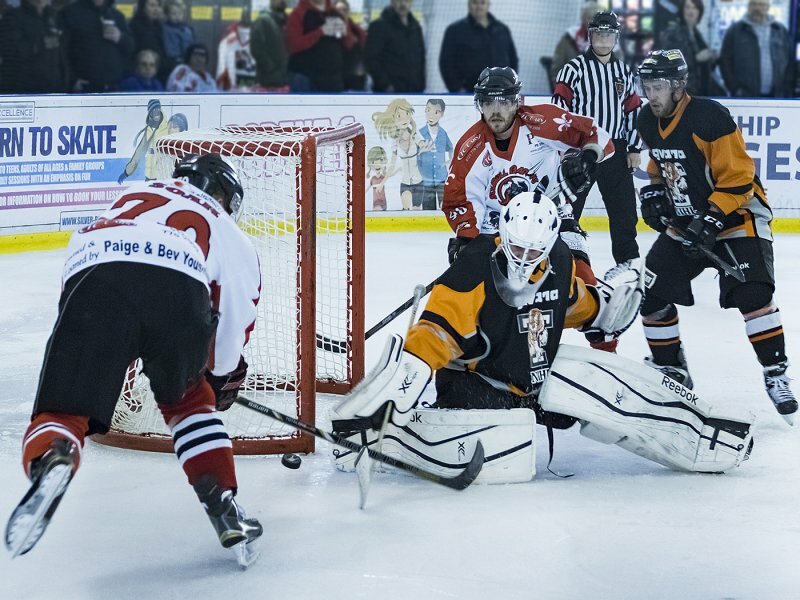 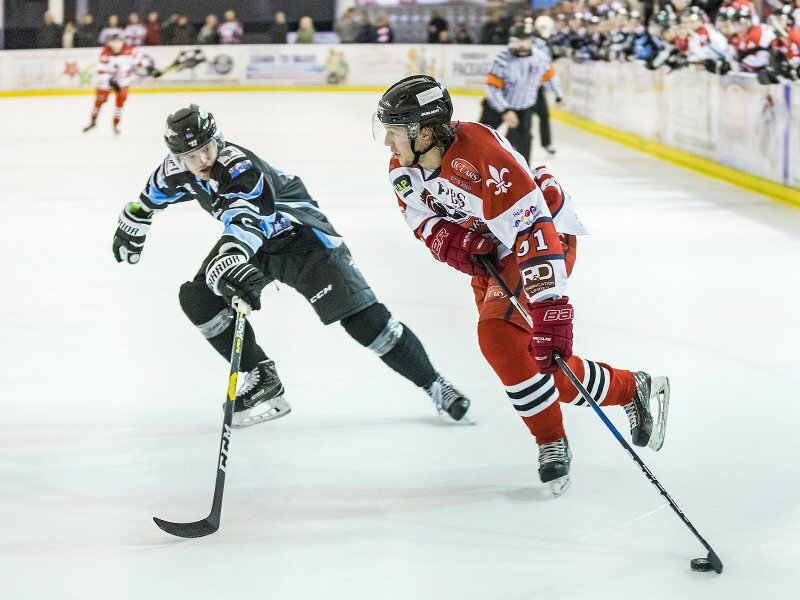 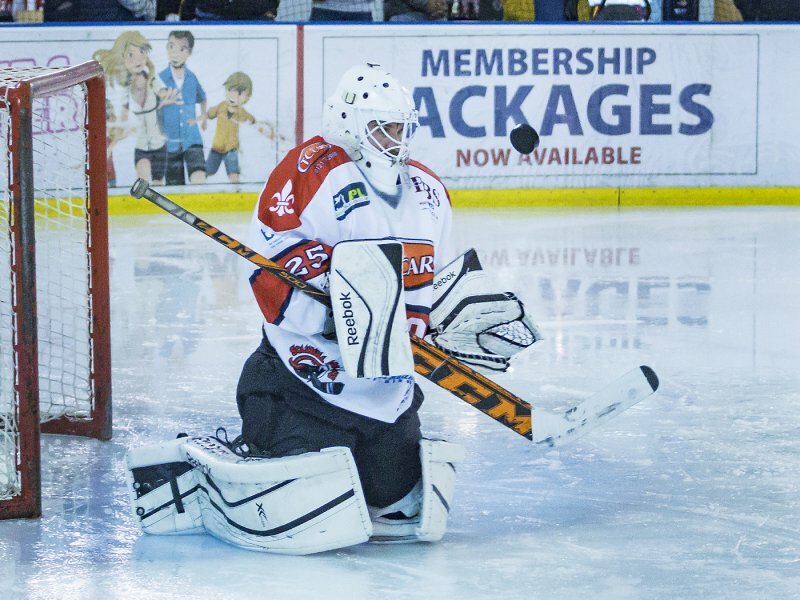 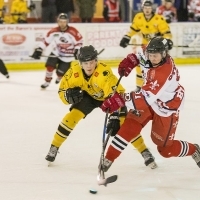 10th February 2019 – Barons v Sutton Sting. 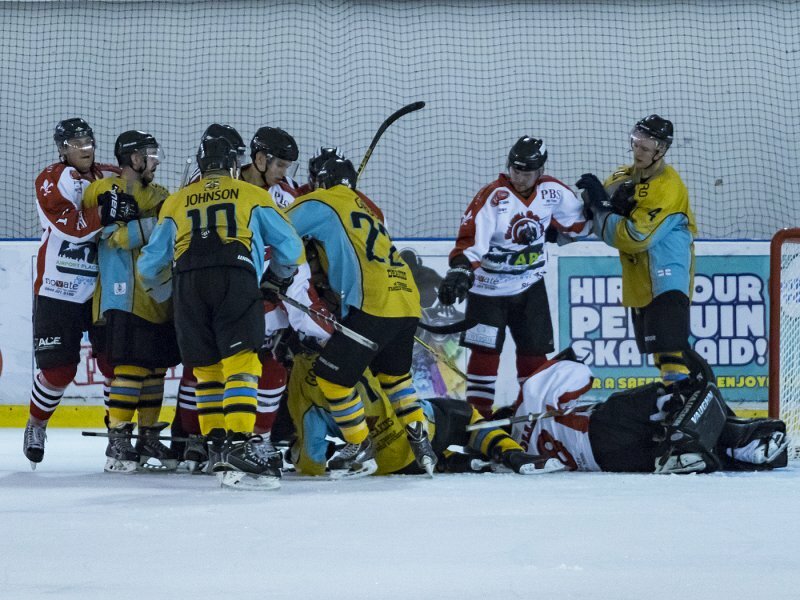 Final score 5-0. 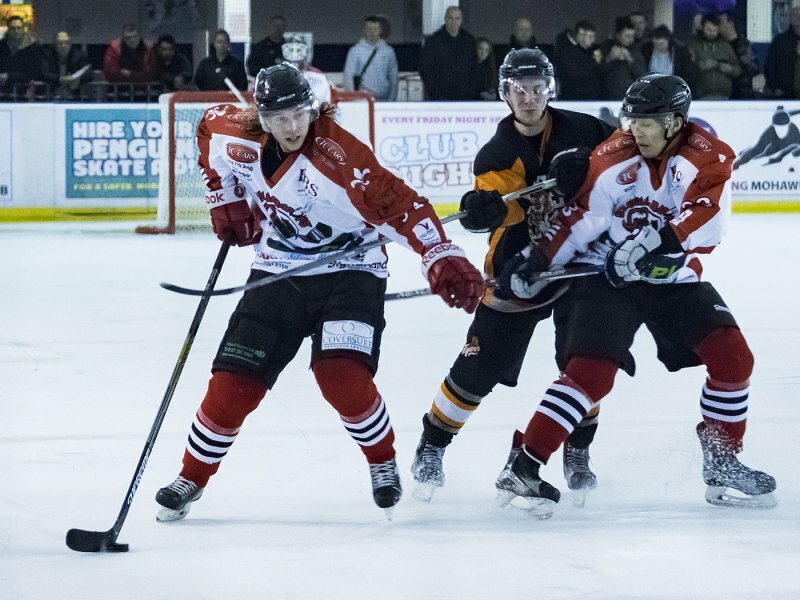 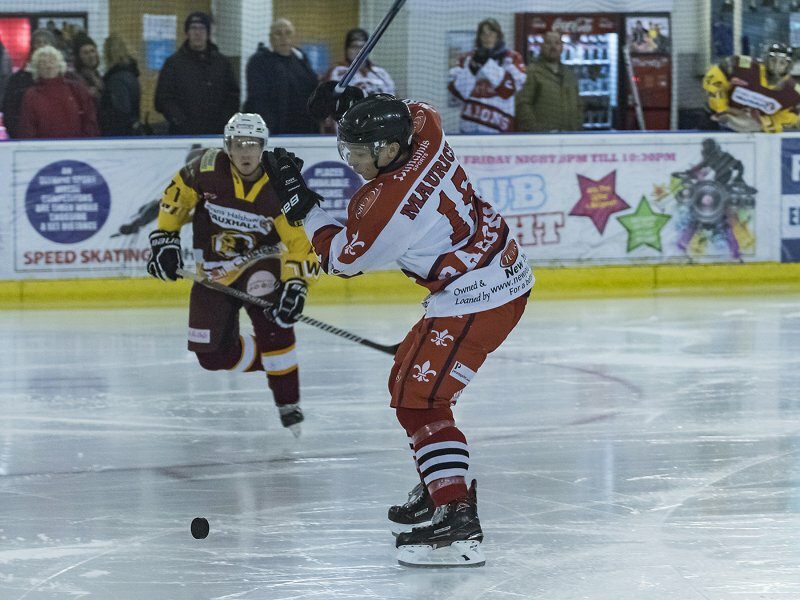 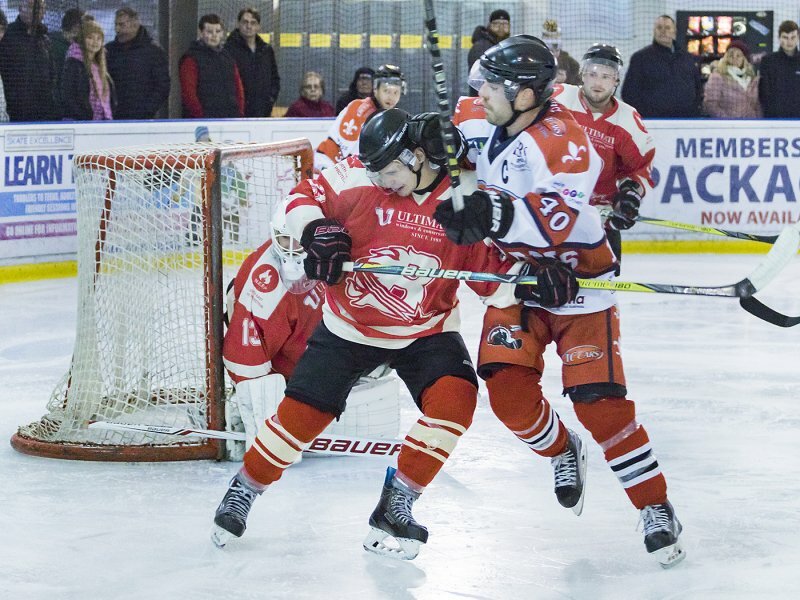 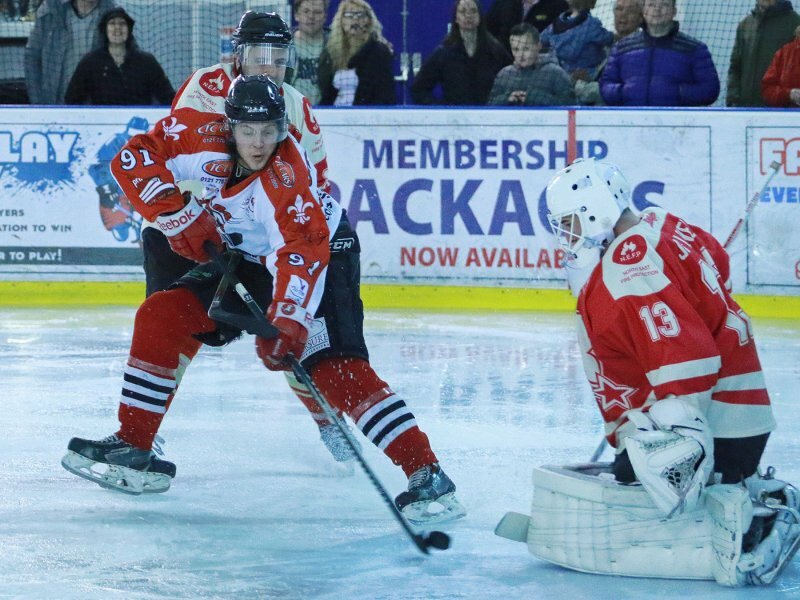 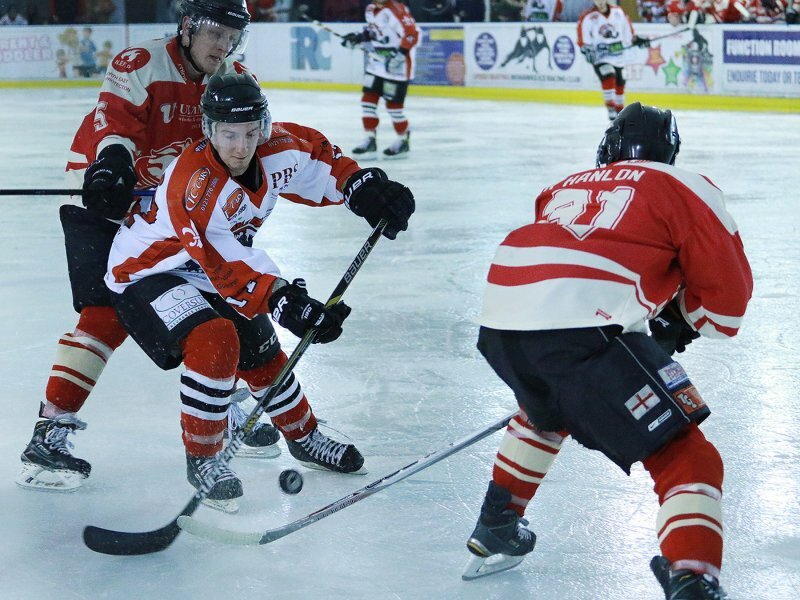 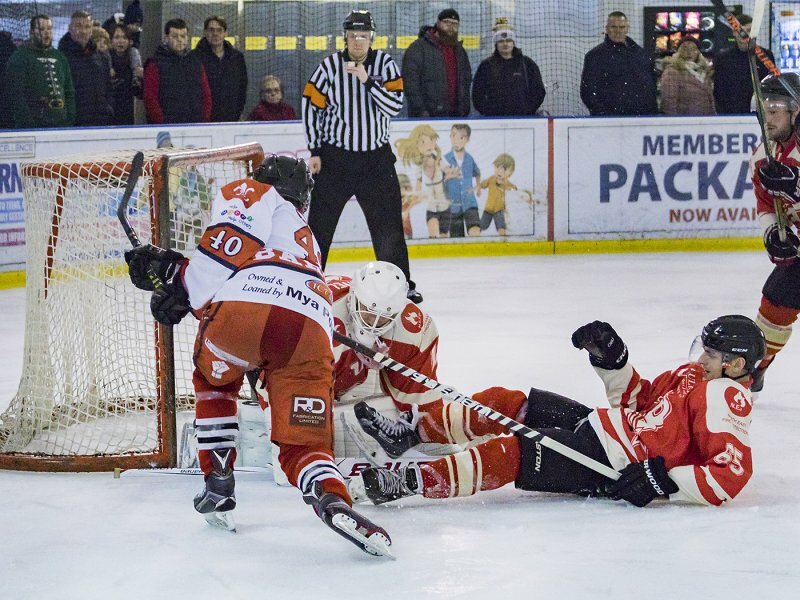 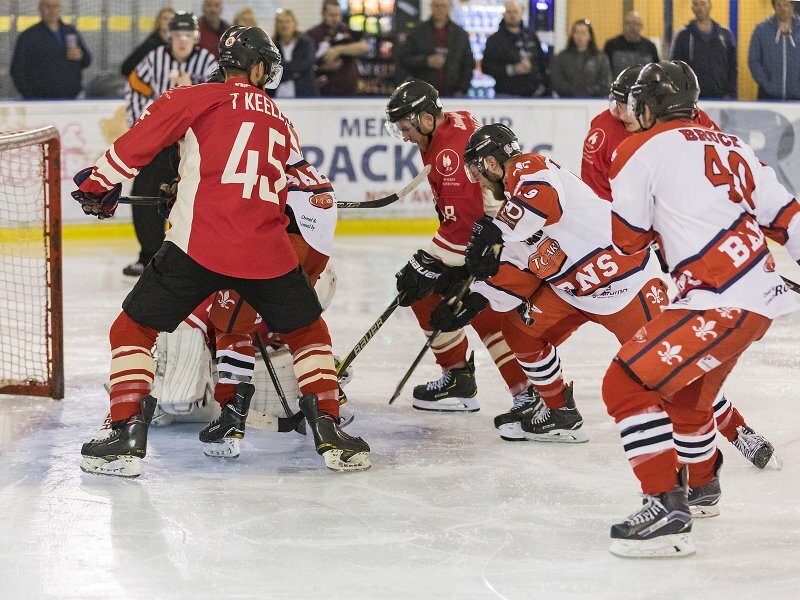 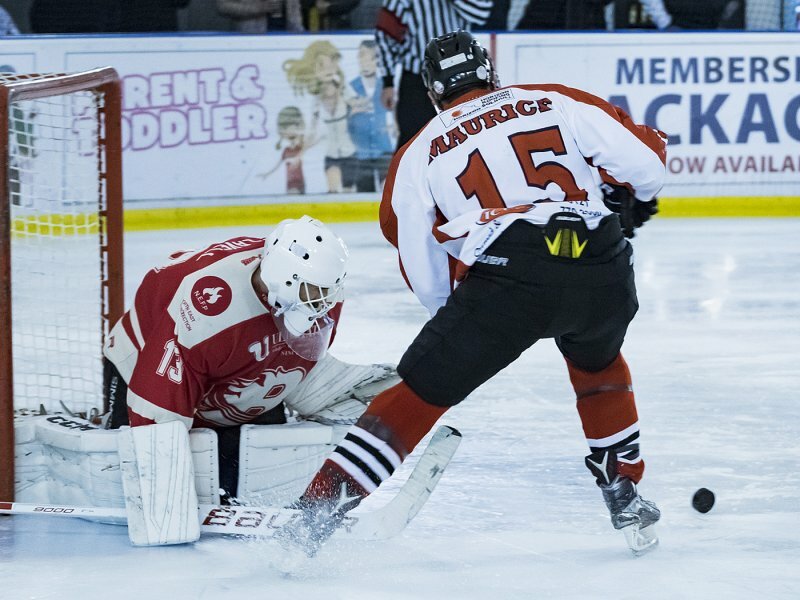 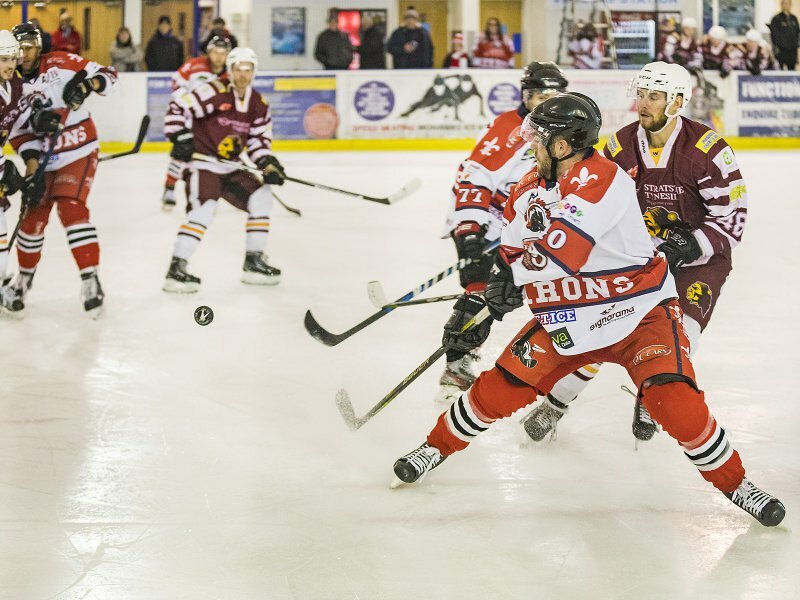 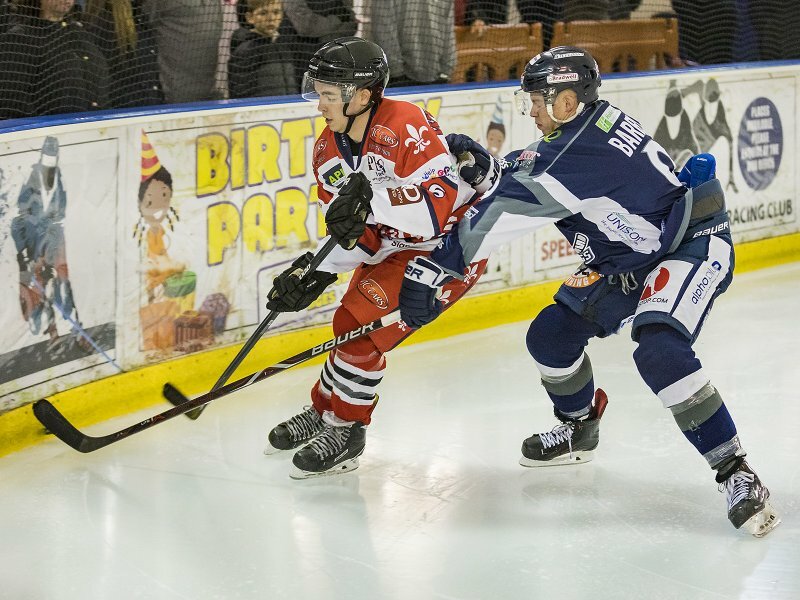 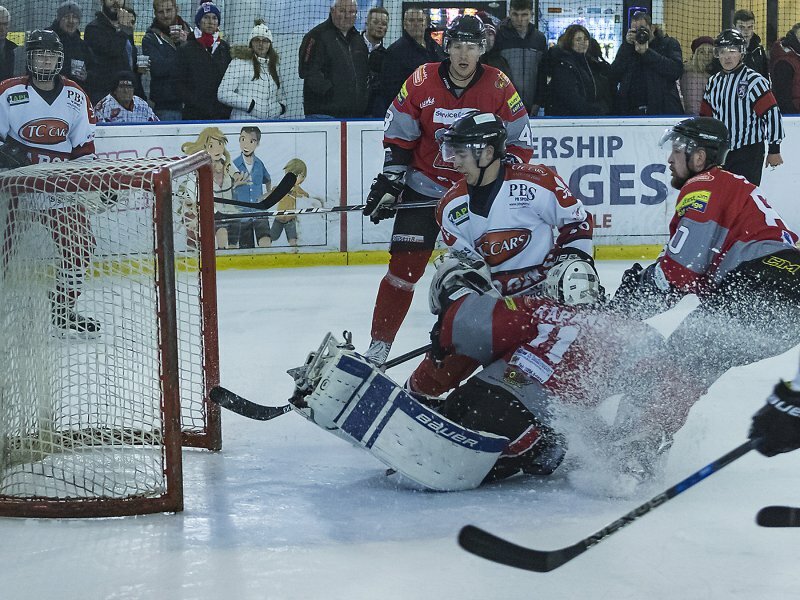 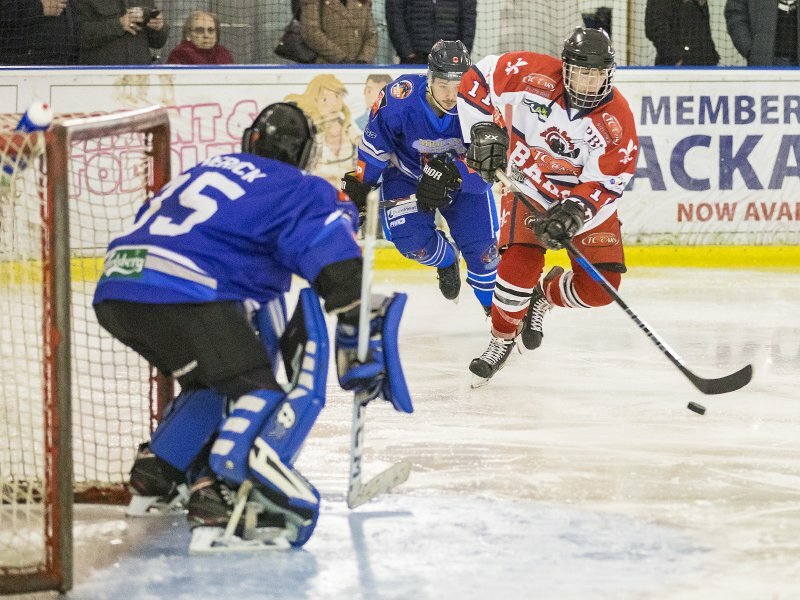 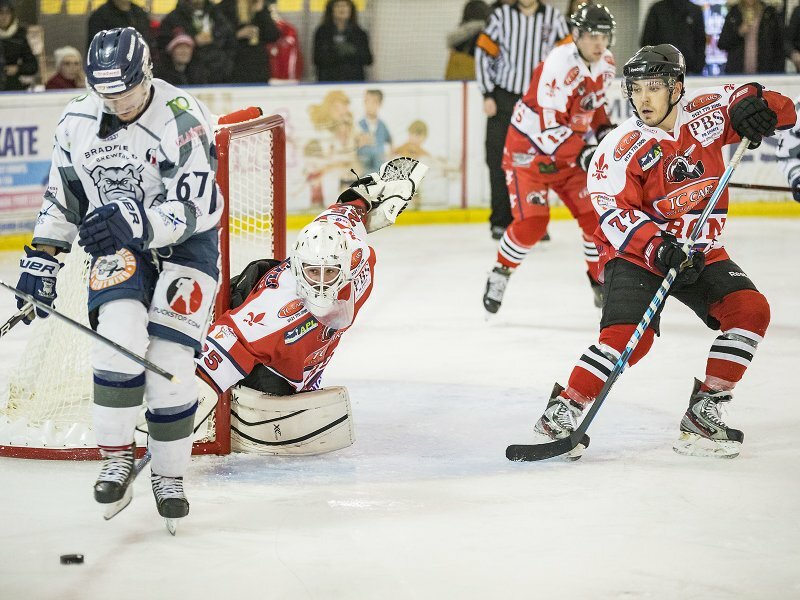 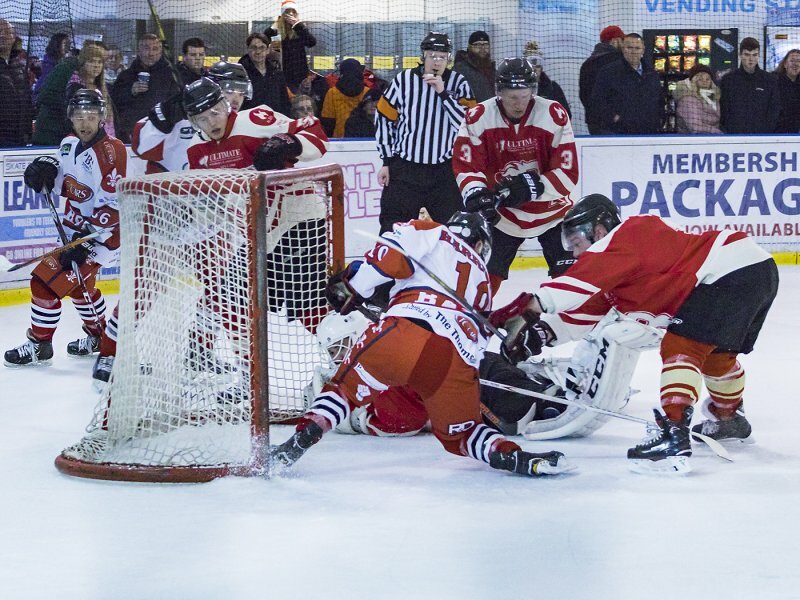 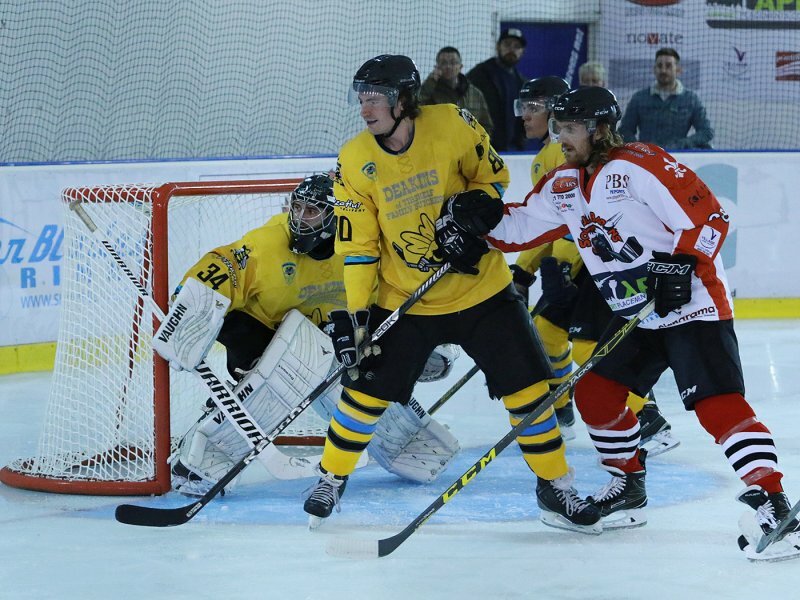 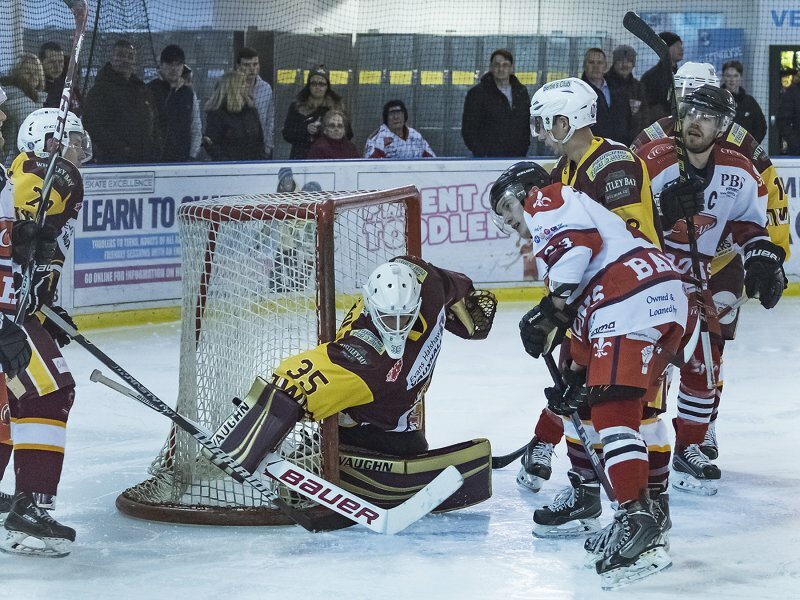 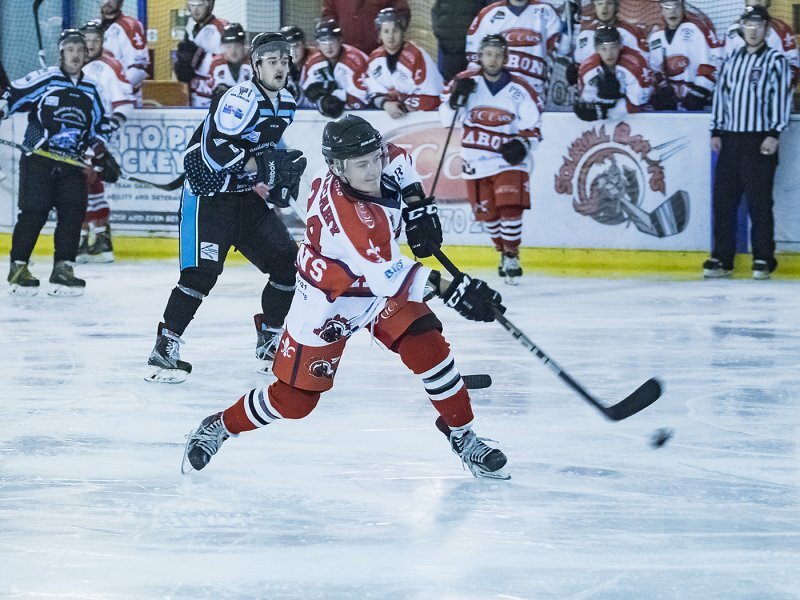 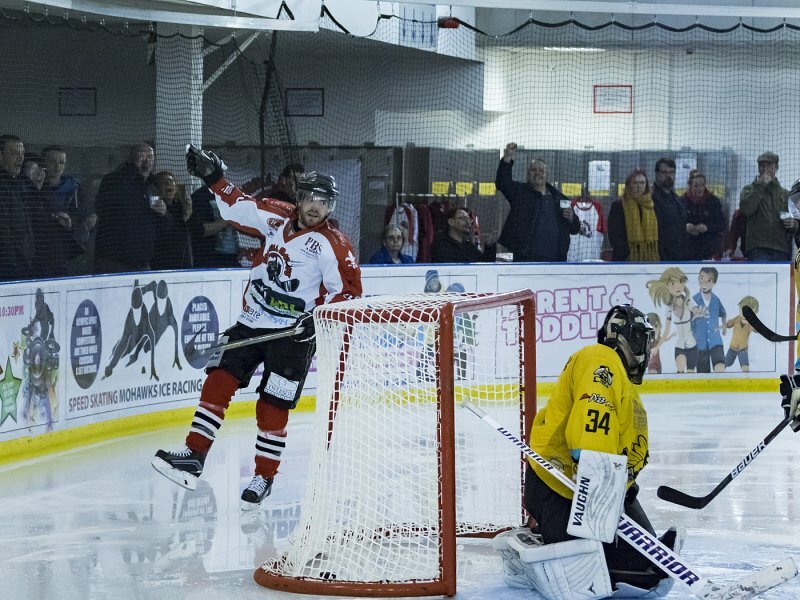 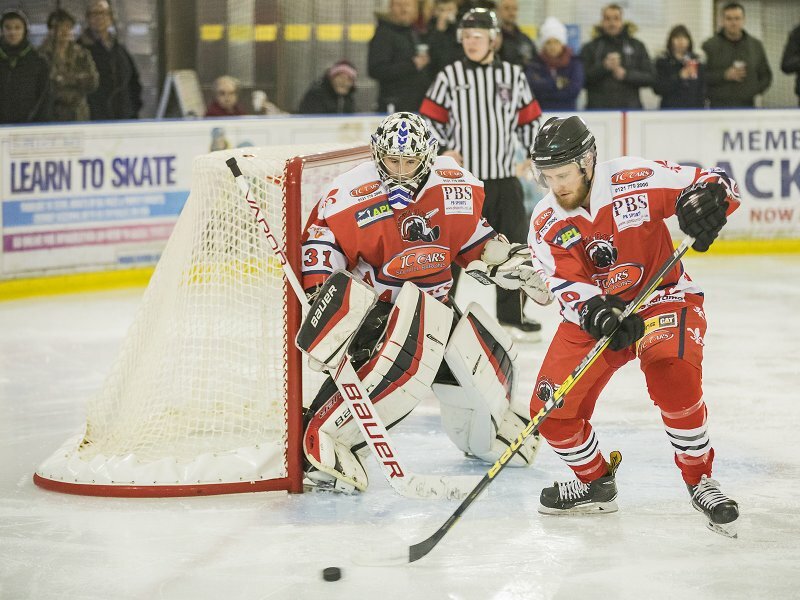 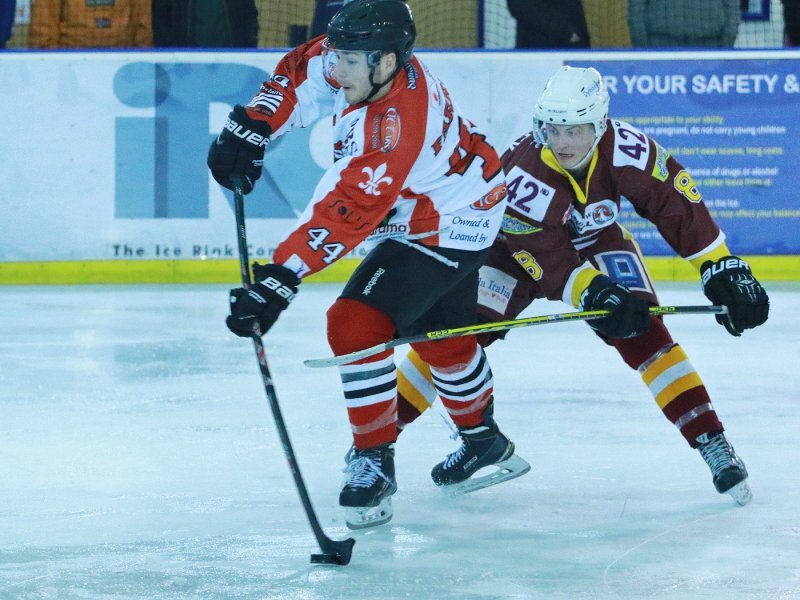 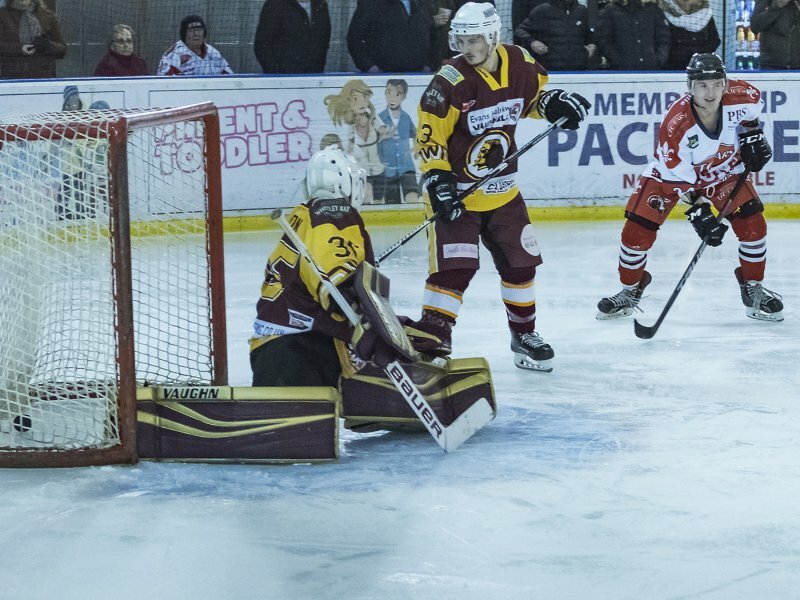 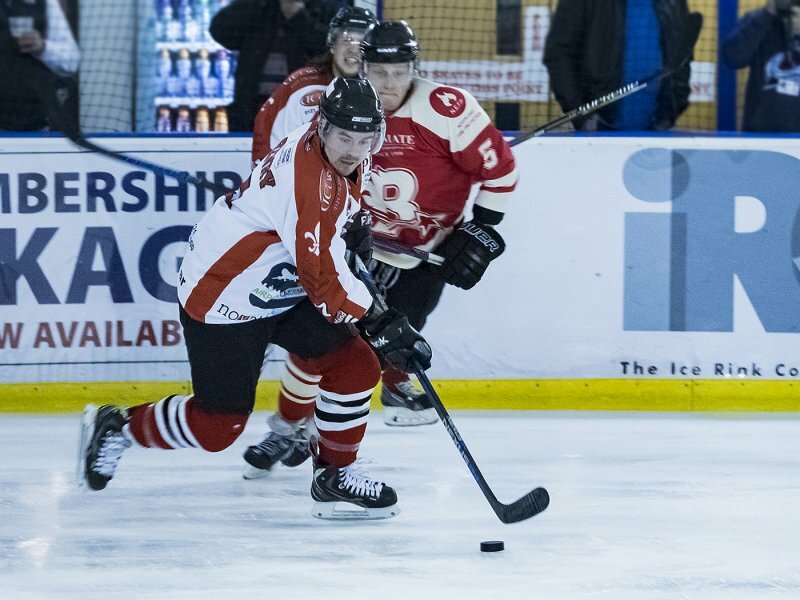 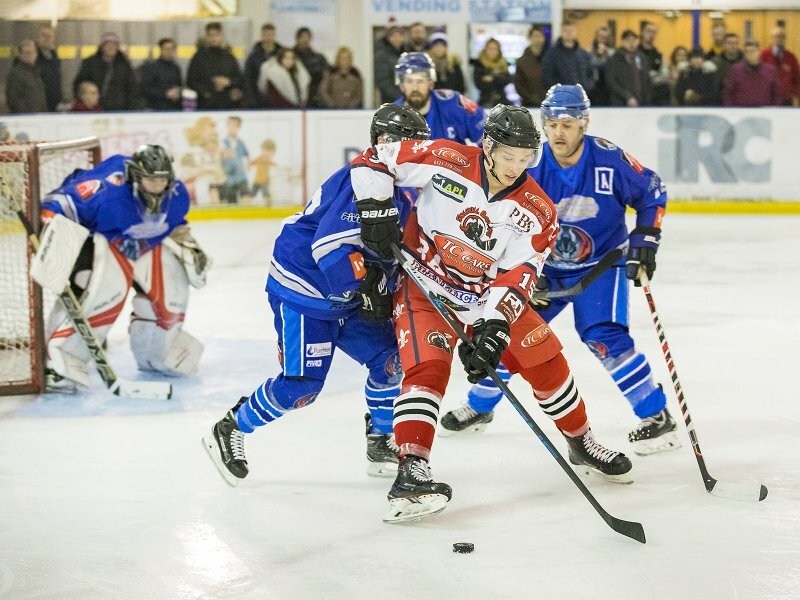 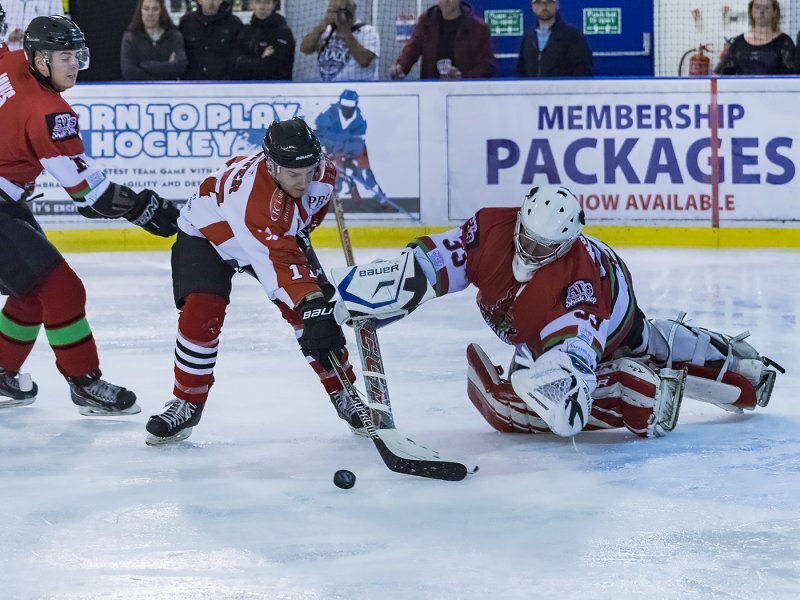 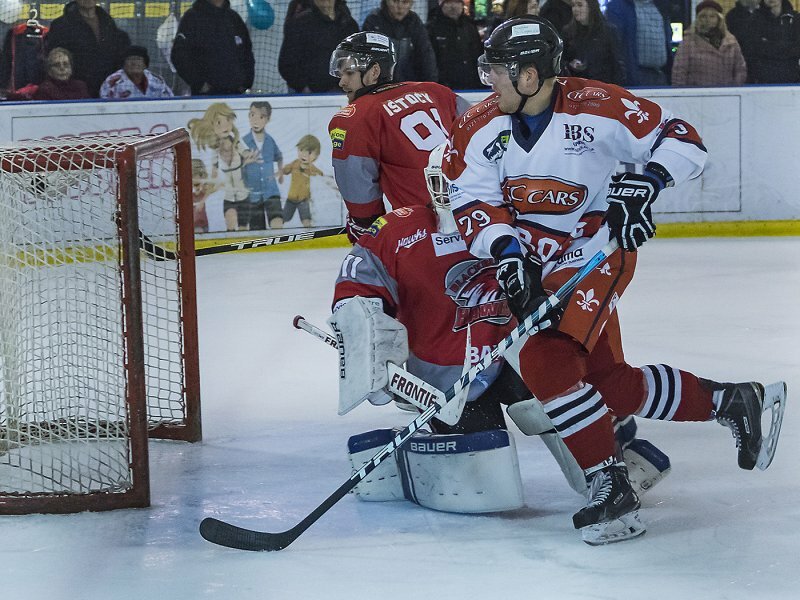 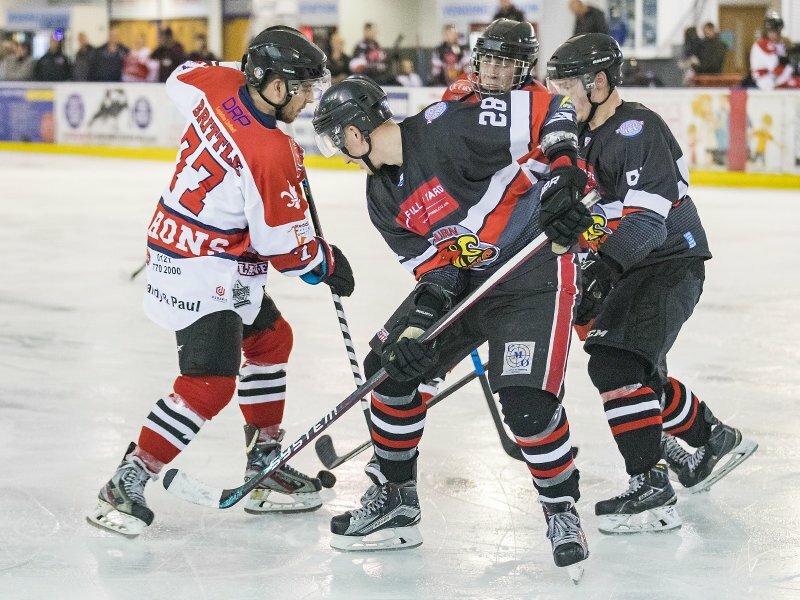 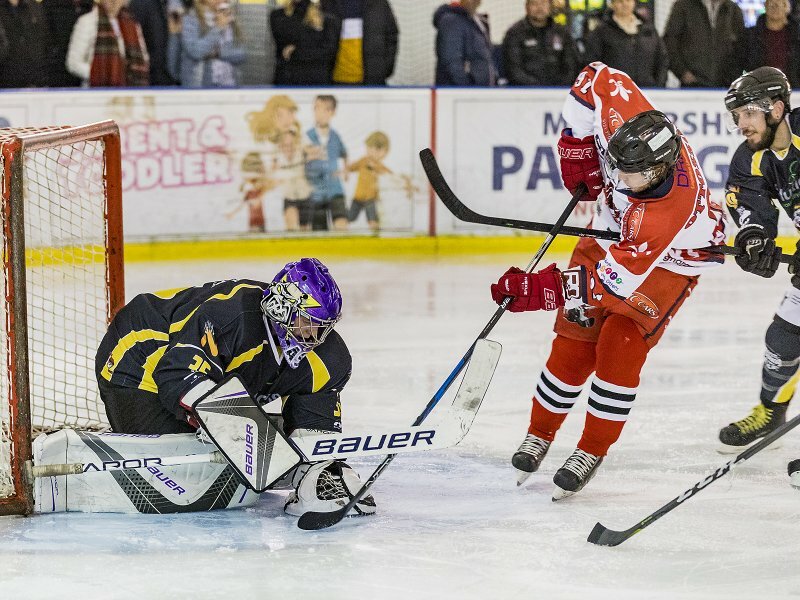 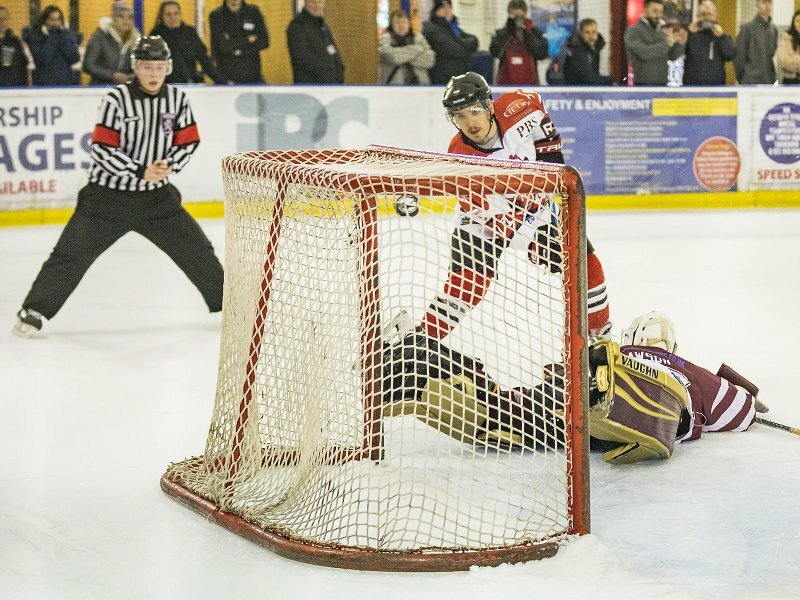 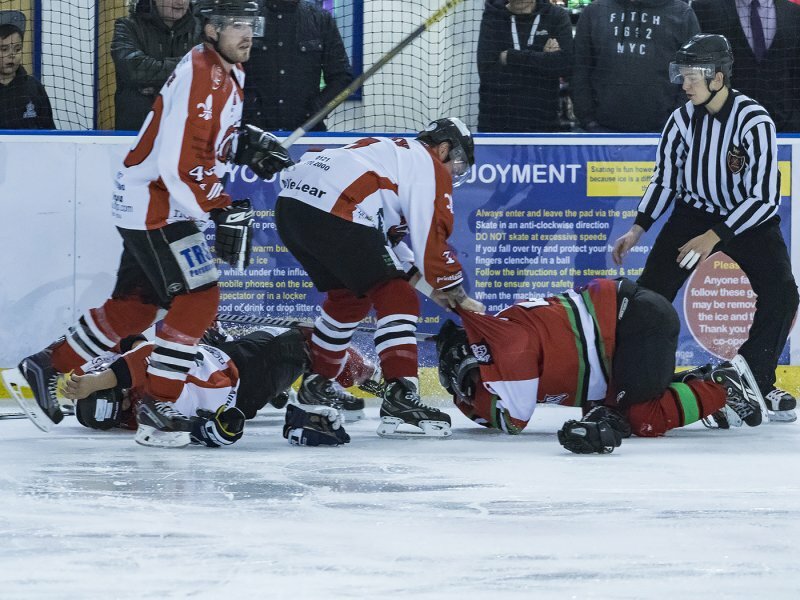 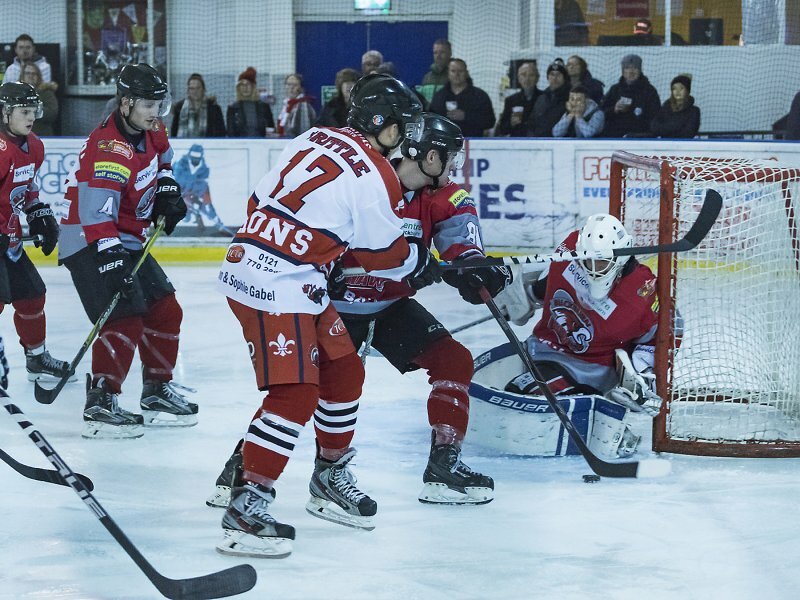 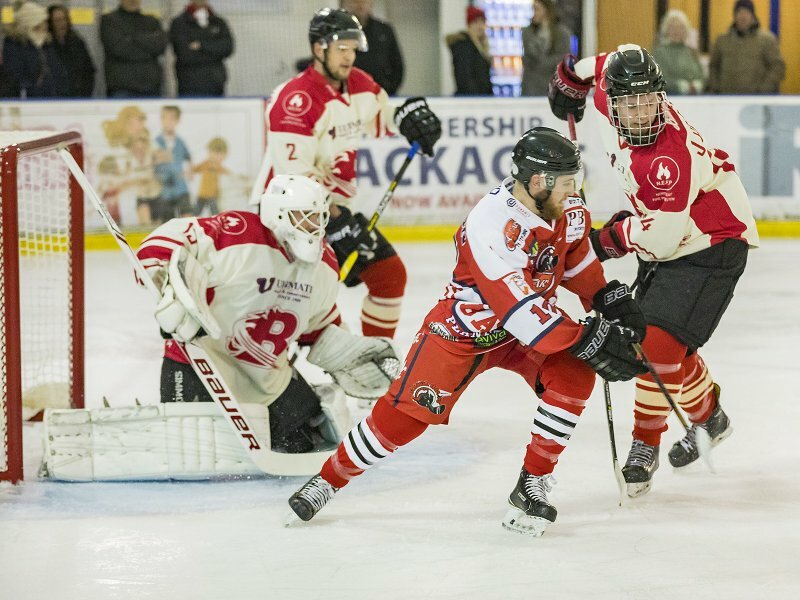 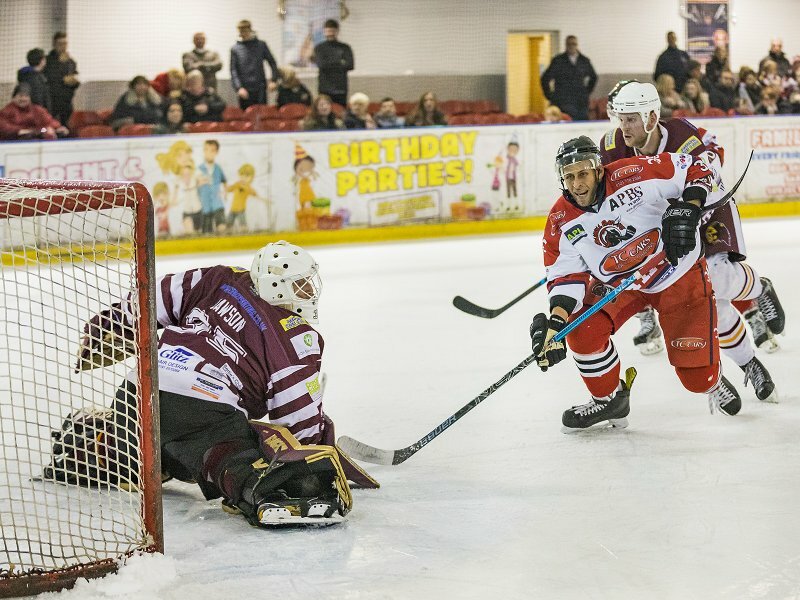 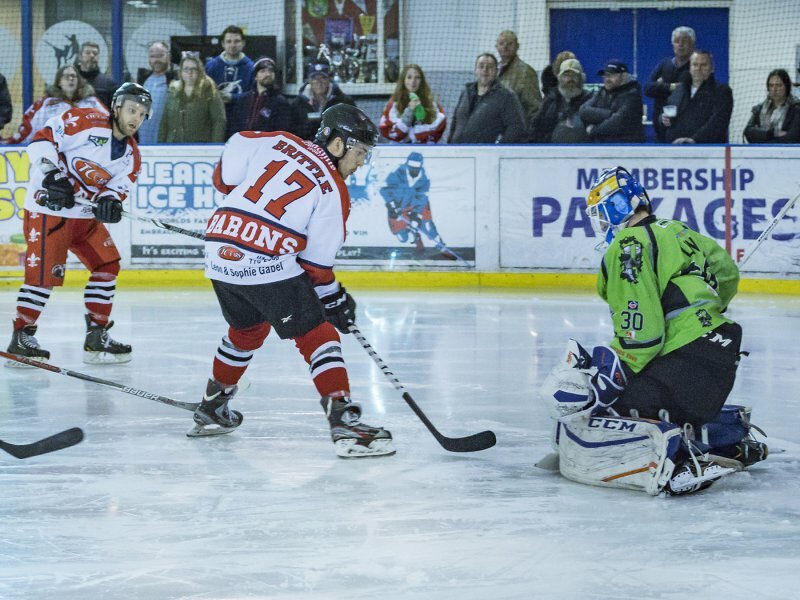 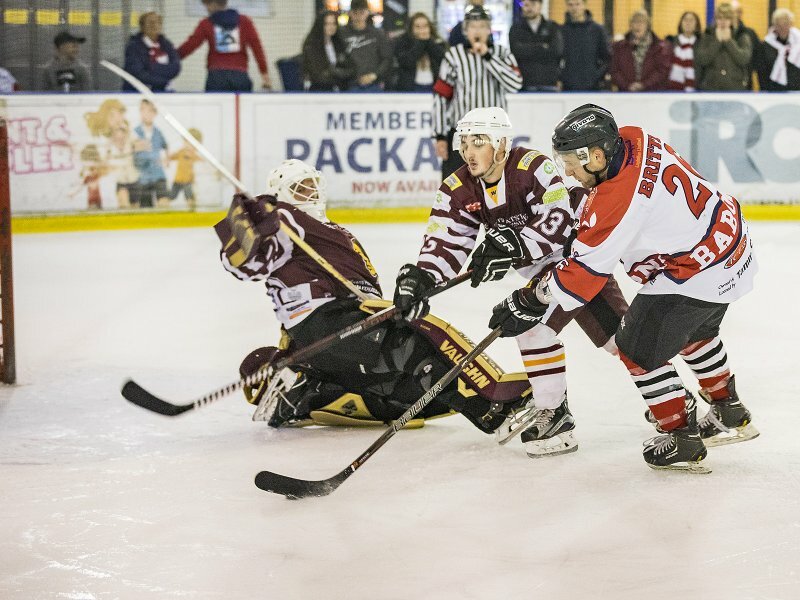 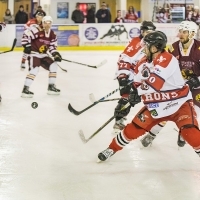 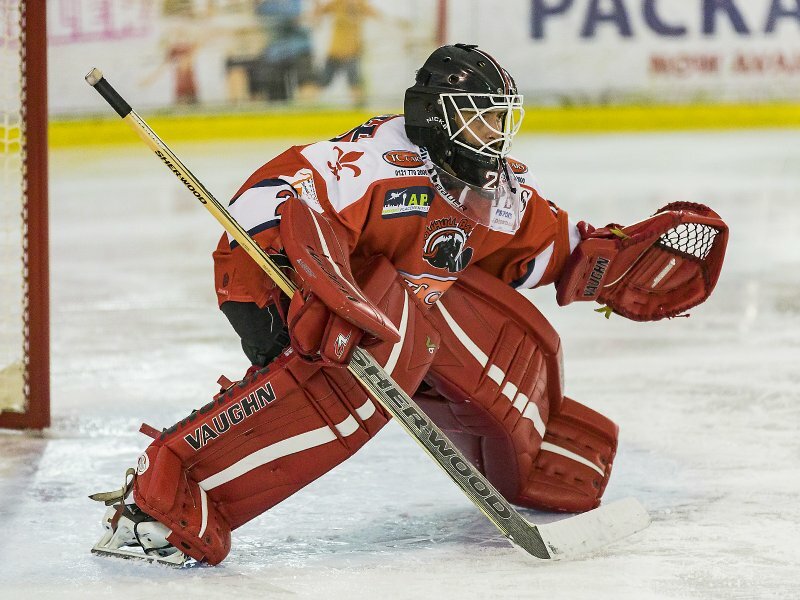 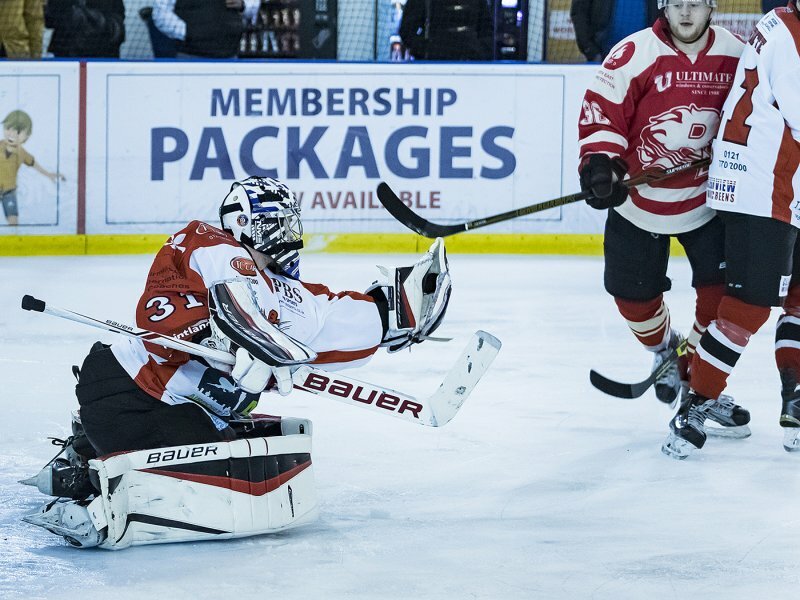 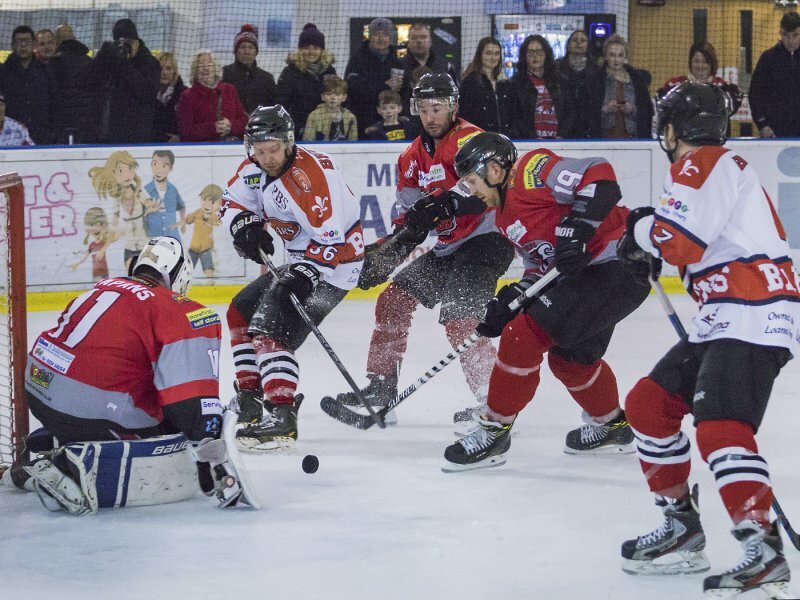 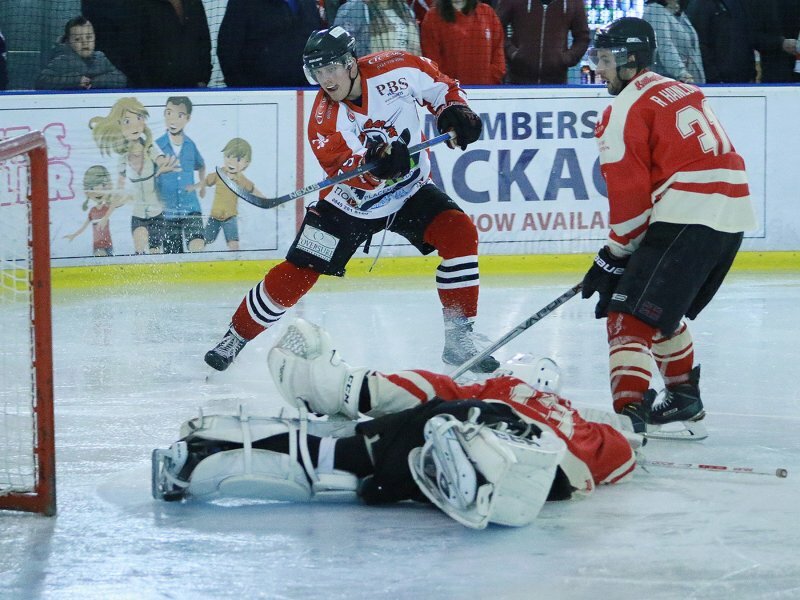 3rd February 2019 – Barons v Nottingham Lions. 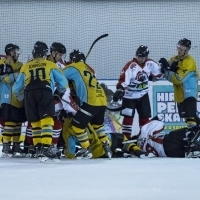 Final score 8-2. 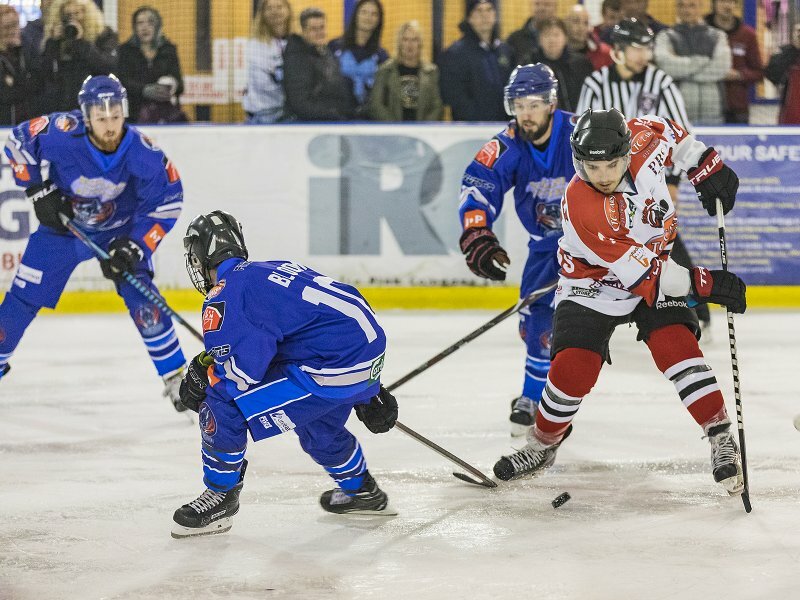 13th October 2018 – Match with Blackburn Hawks. 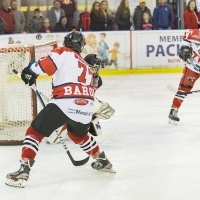 The final score was Solihull Barons 7 – Blackburn Hawks 4. 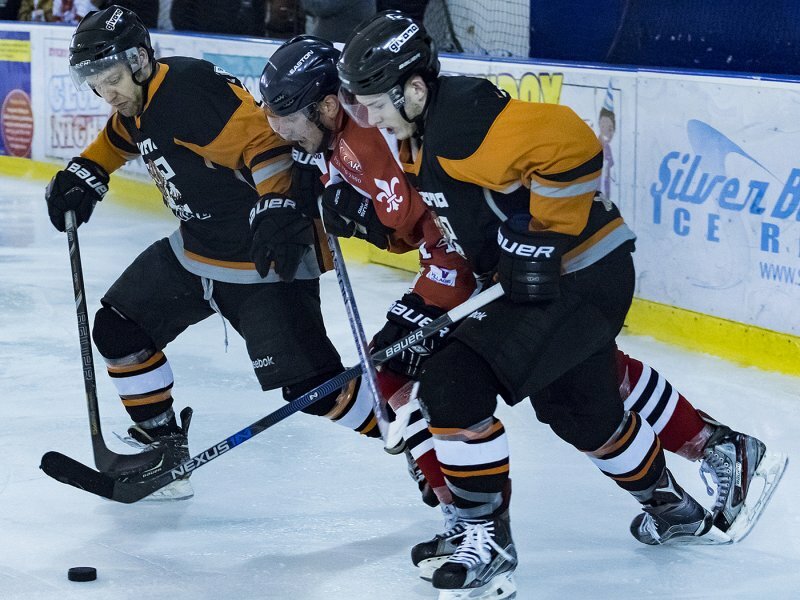 22nd September 2018 – Match with Whitley Warriors. 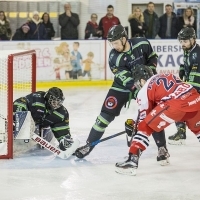 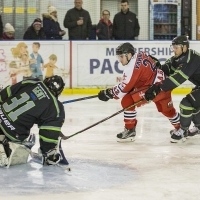 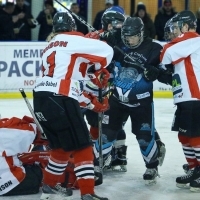 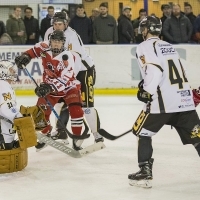 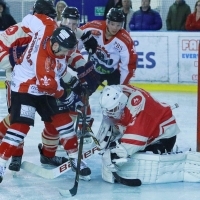 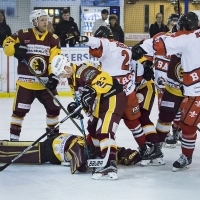 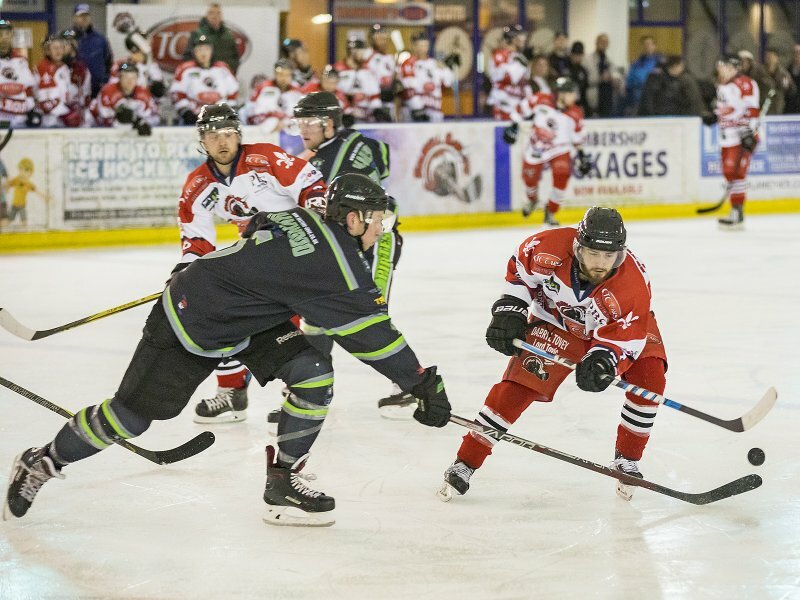 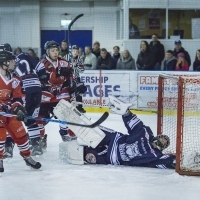 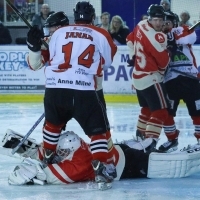 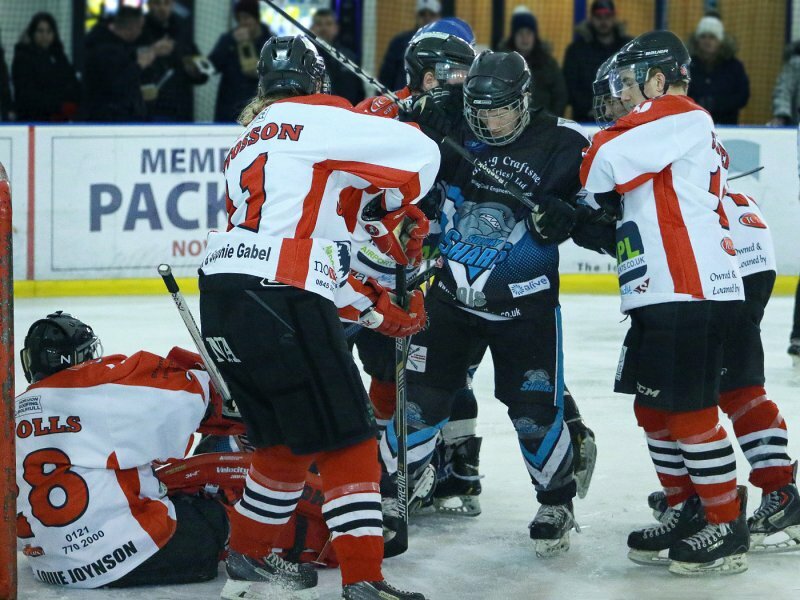 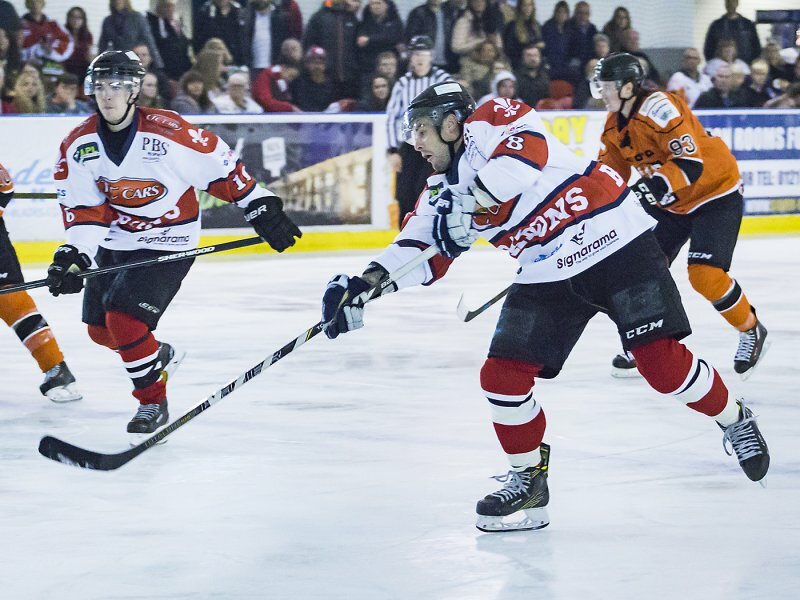 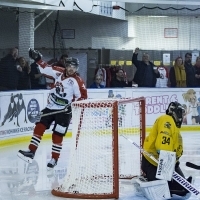 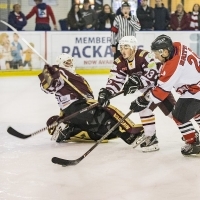 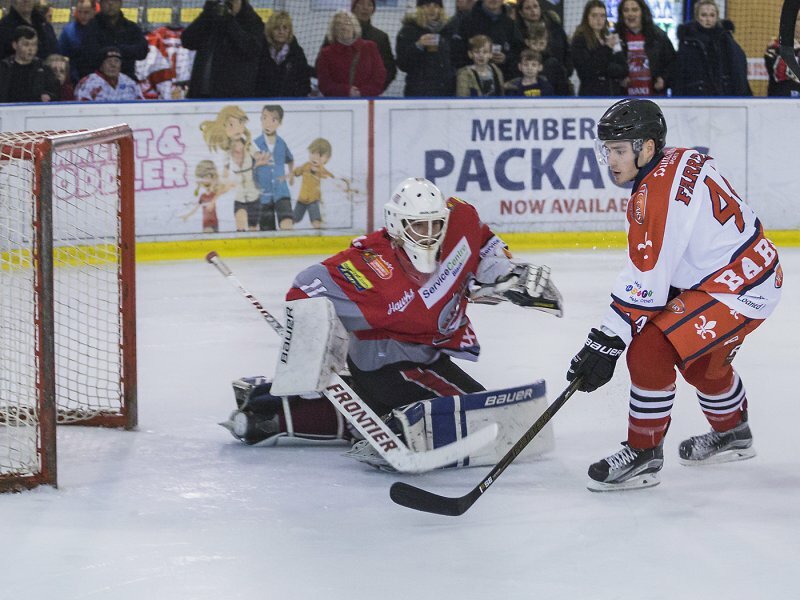 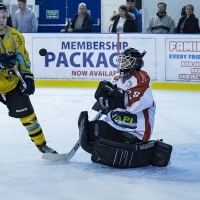 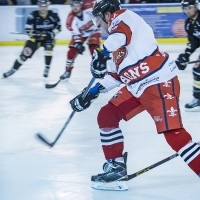 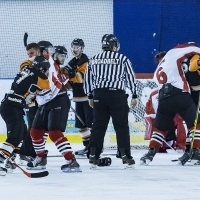 The final score was Solihull Barons 4 – Whitley Warriors 3 after overtime. 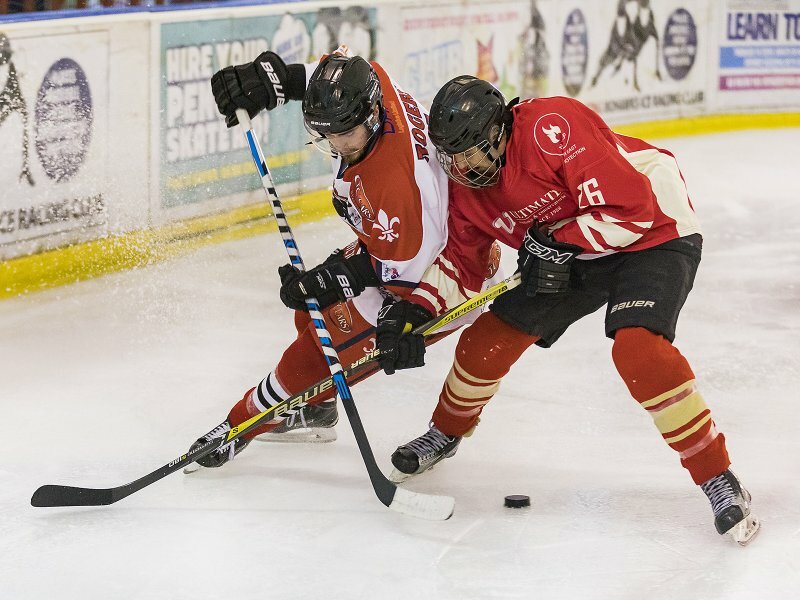 9th September 2018 – Match with Nottingham Lions. 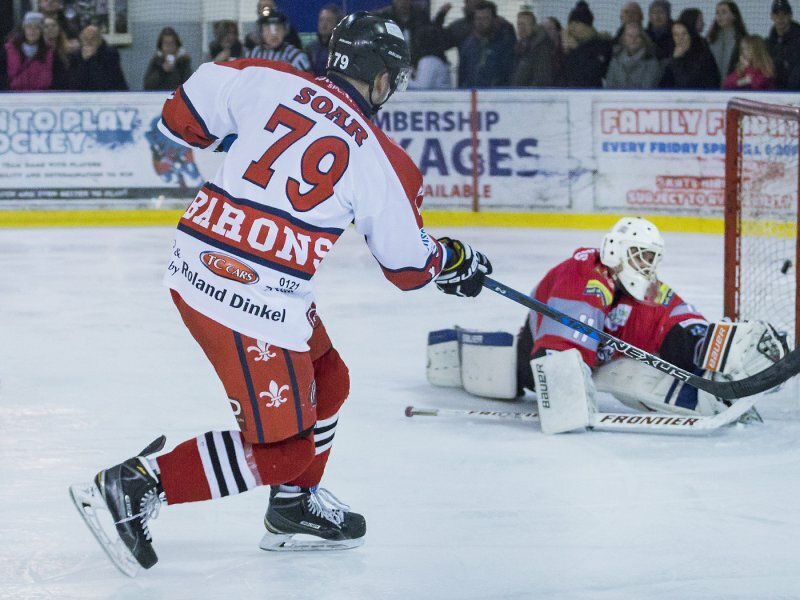 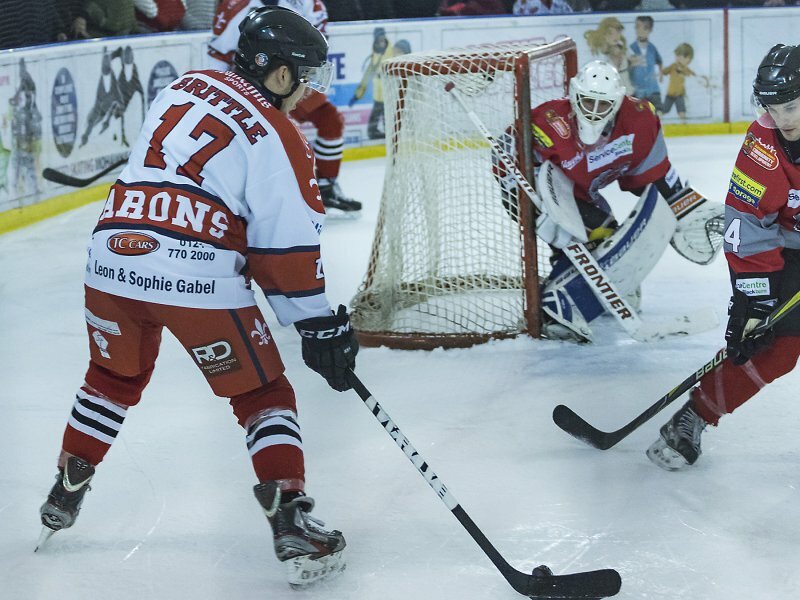 The final score was Solihull Barons 11 – Lions 2. 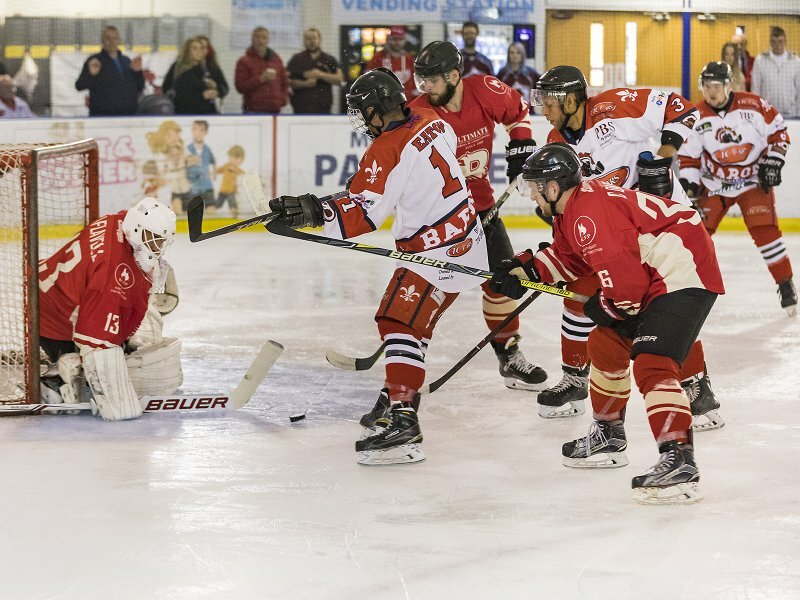 2nd September 2018 – Match with Billingham Stars. 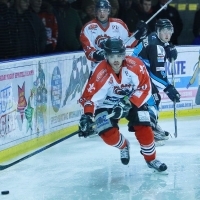 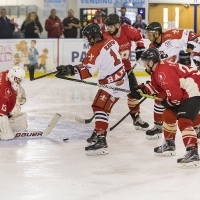 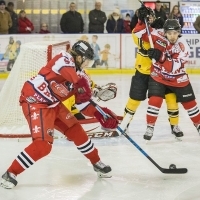 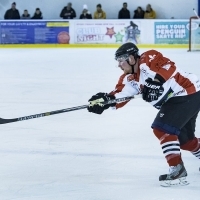 The final score was Solihull Barons 4 – Stars 5. 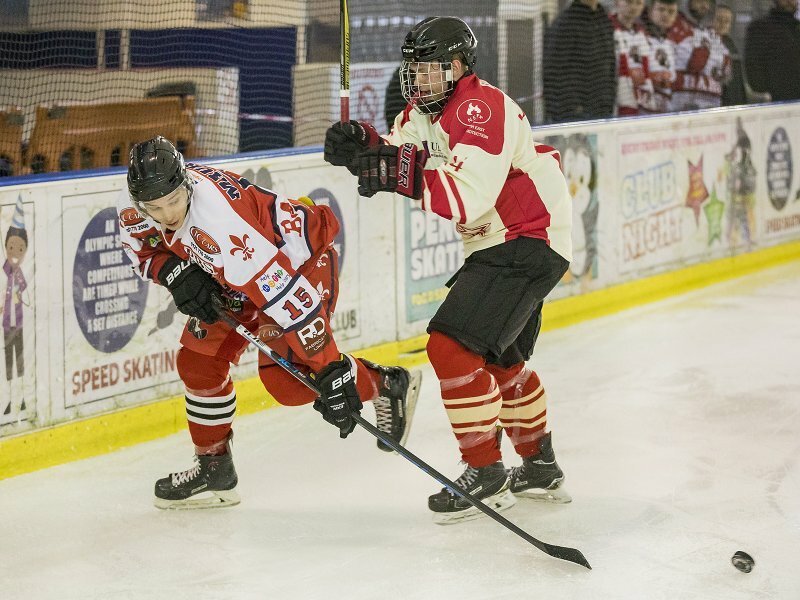 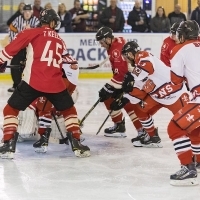 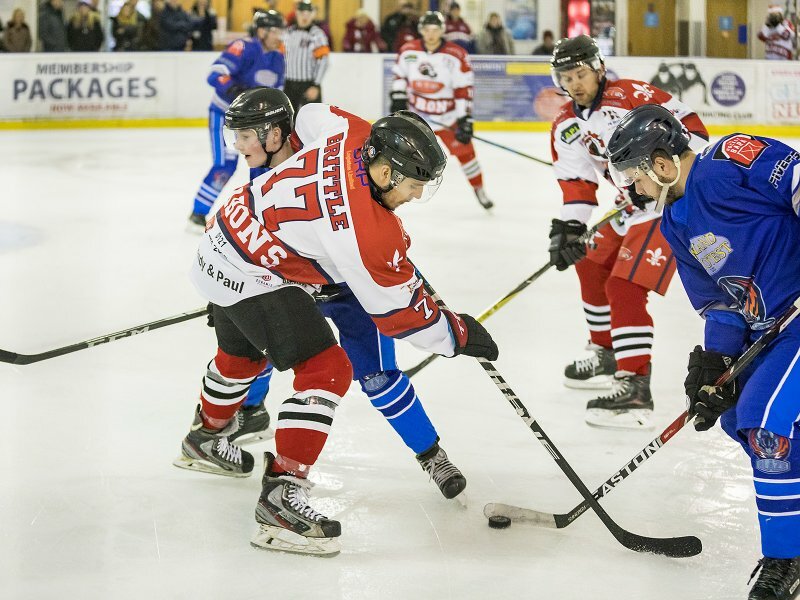 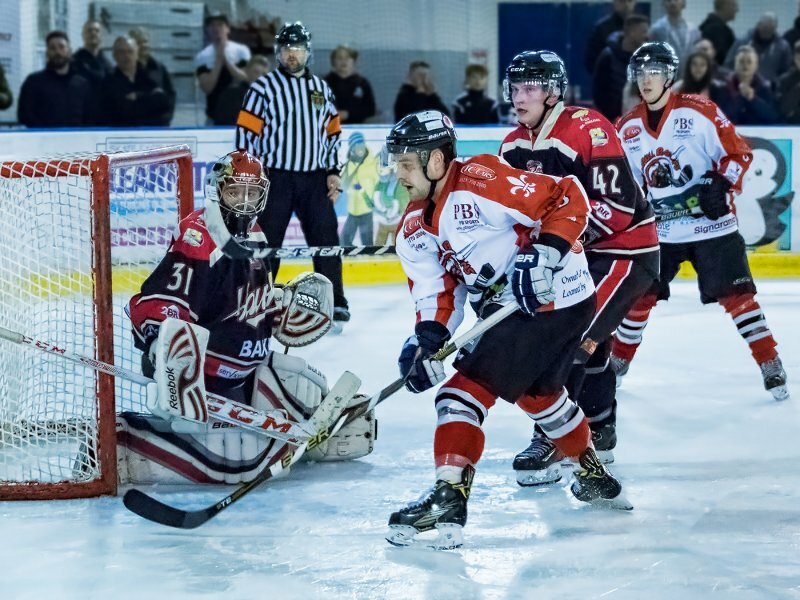 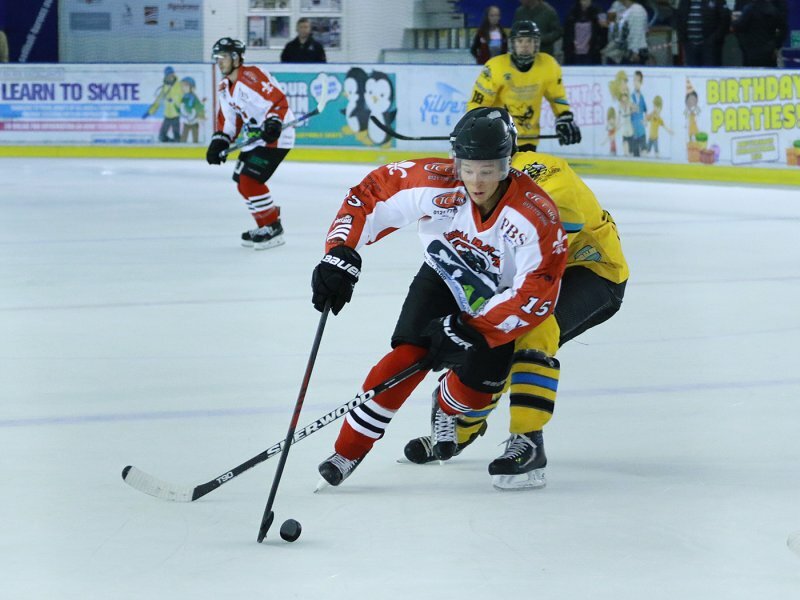 26th August 2018 – Pre-season match with NIHL Coventry Blaze. 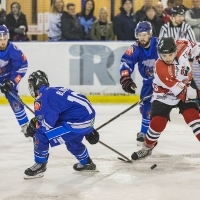 The final score was Solihull Barons 8 – NIHL Coventry Blaze 0. 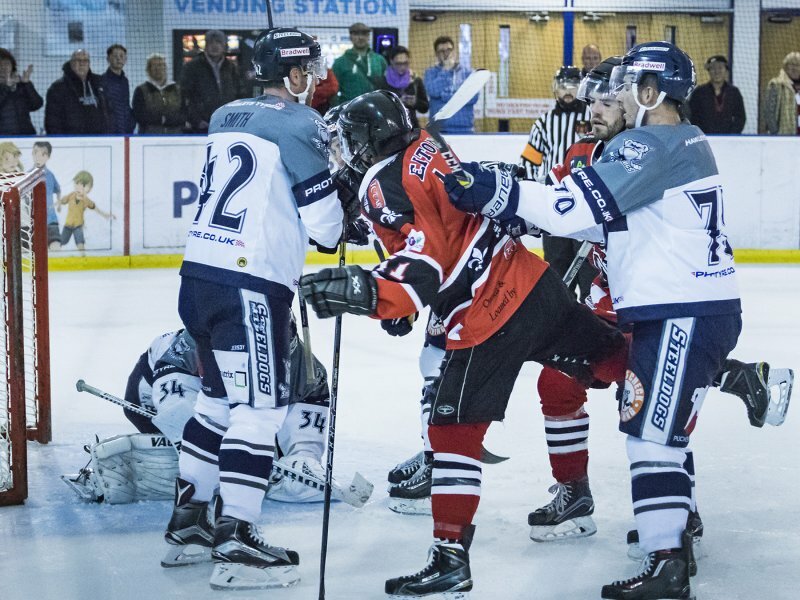 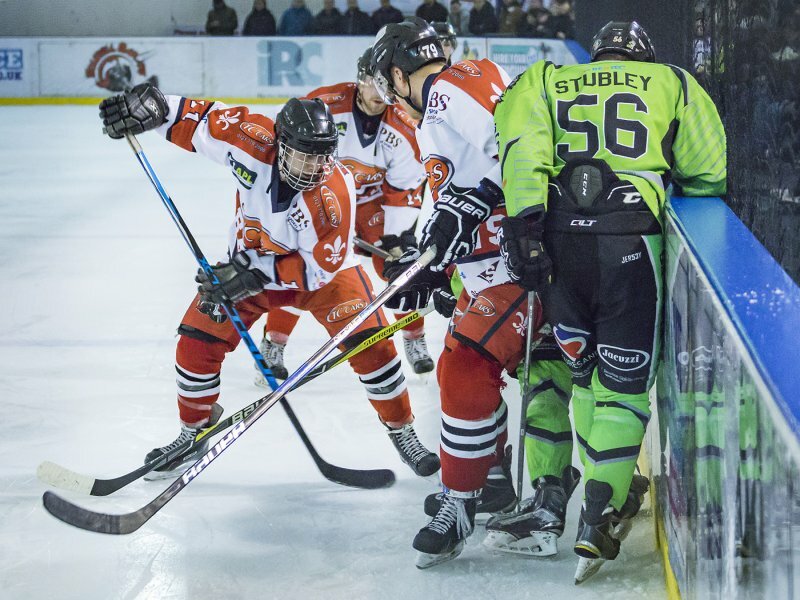 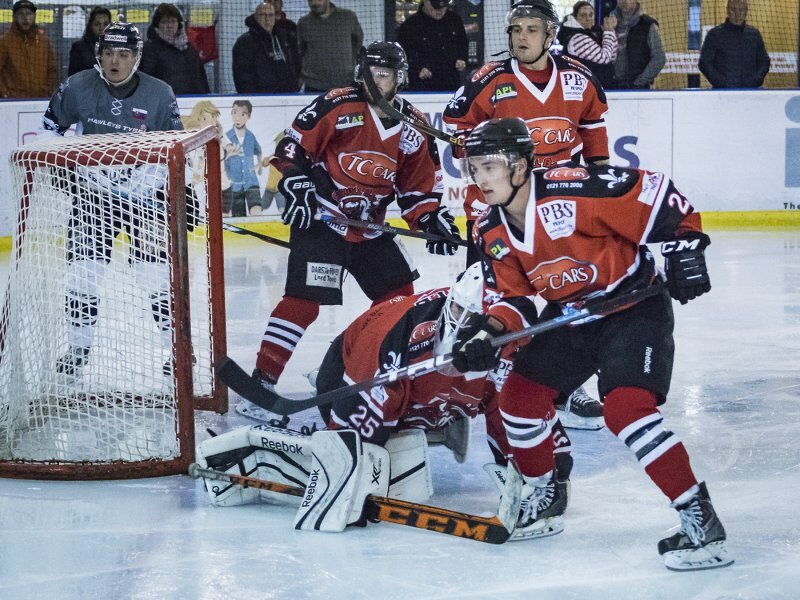 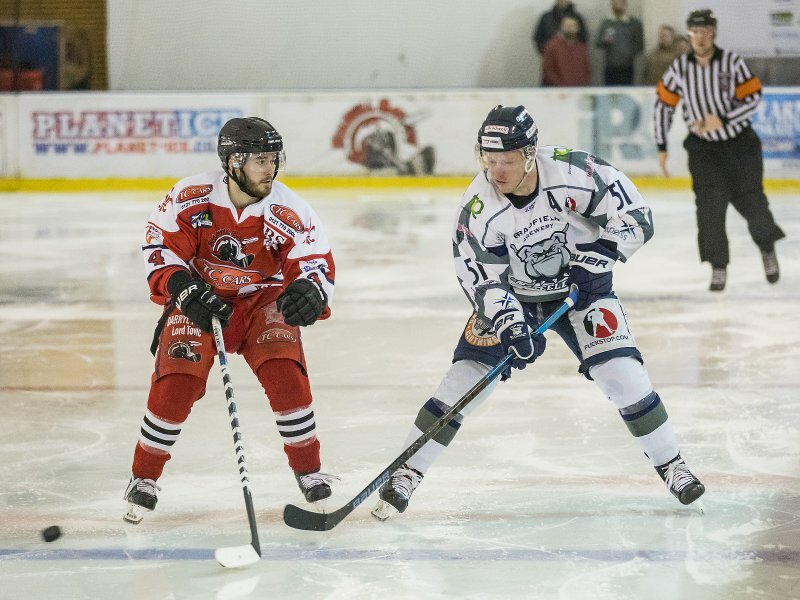 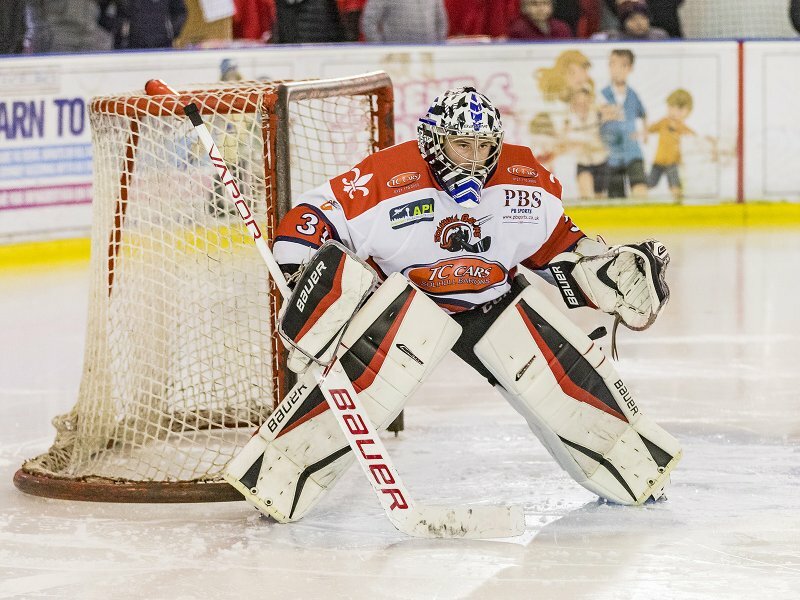 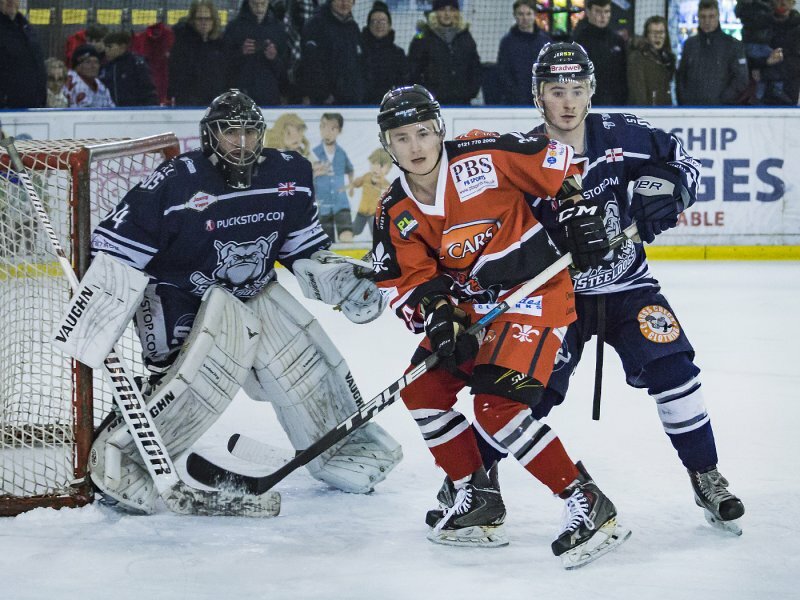 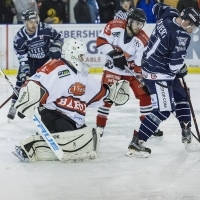 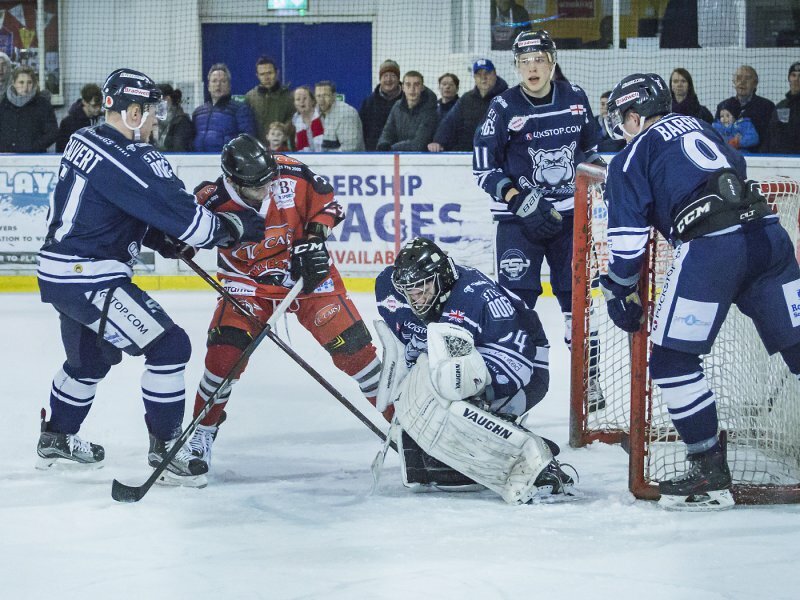 24th March 2018 – Match with Sheffield Steeldogs. 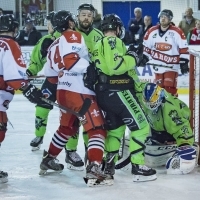 The final score was Solihull Barons 3 – Sheffield Steeldogs 4. 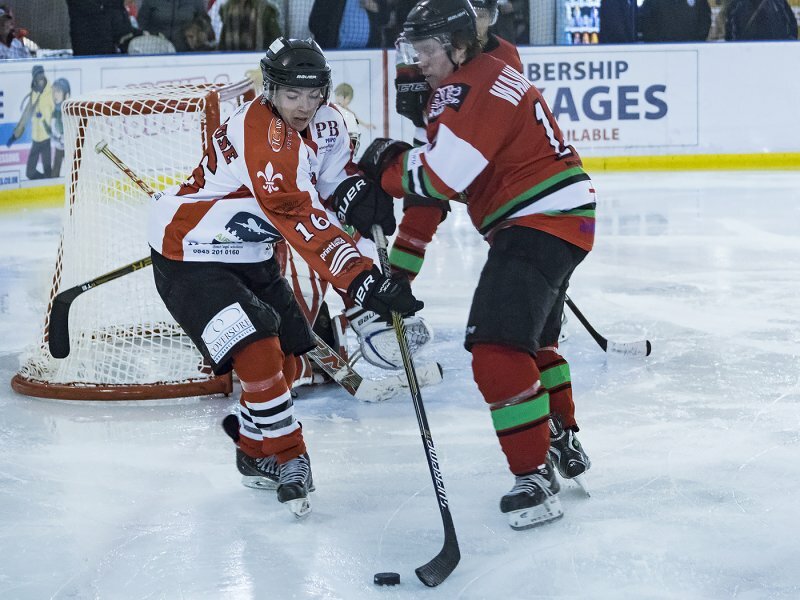 18th March 2018 – Match with Solway Sharks. 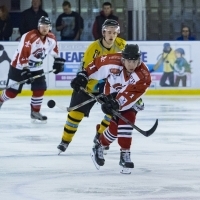 The final score was Solihull Barons 5 – Solway Sharks 3. 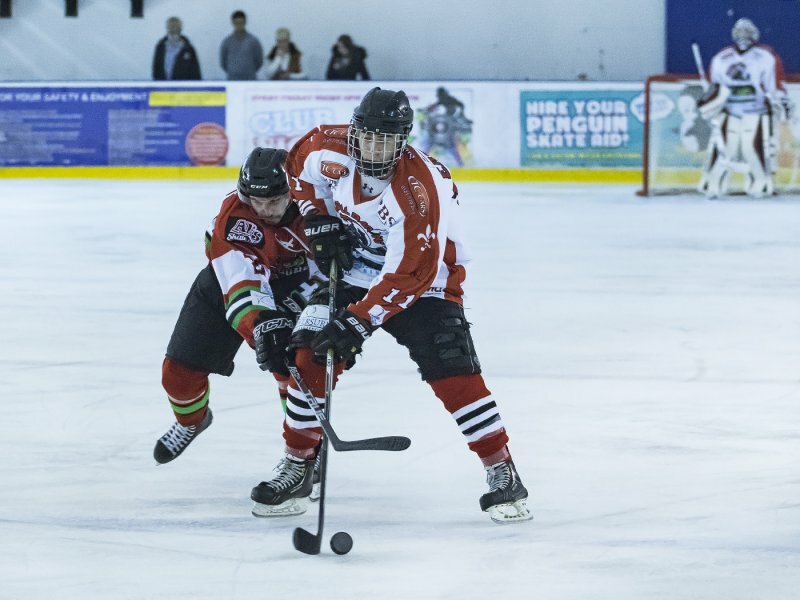 11th March 2018 – Match with Blackburn Hawks. 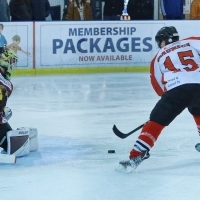 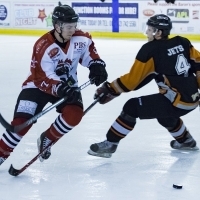 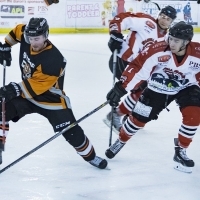 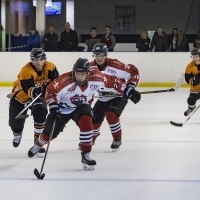 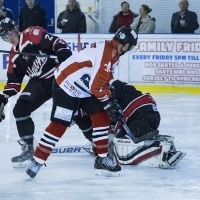 The final score was Solihull Barons 5 – Blacburn Hawks 3. 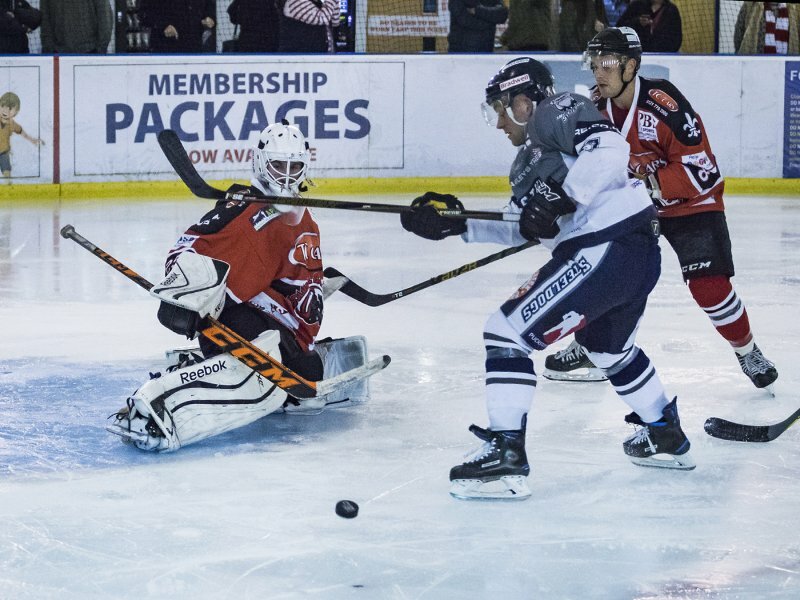 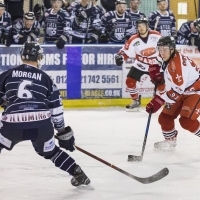 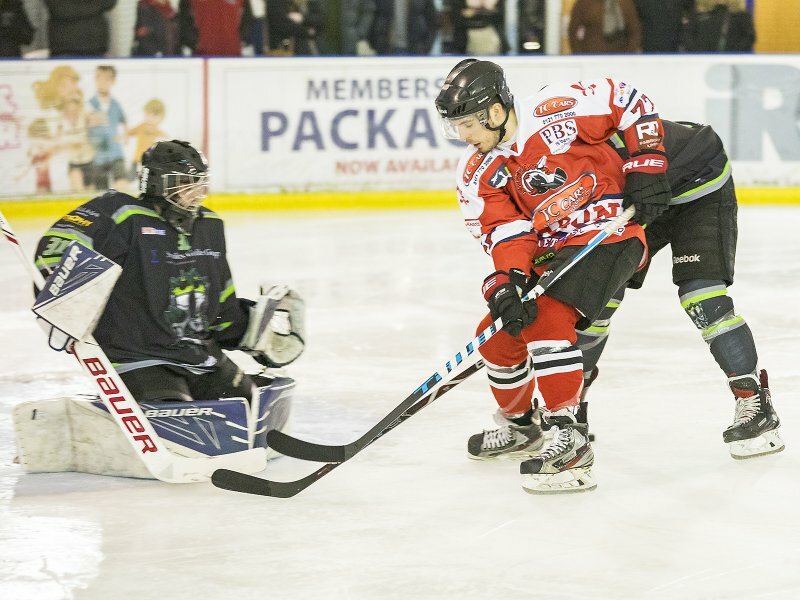 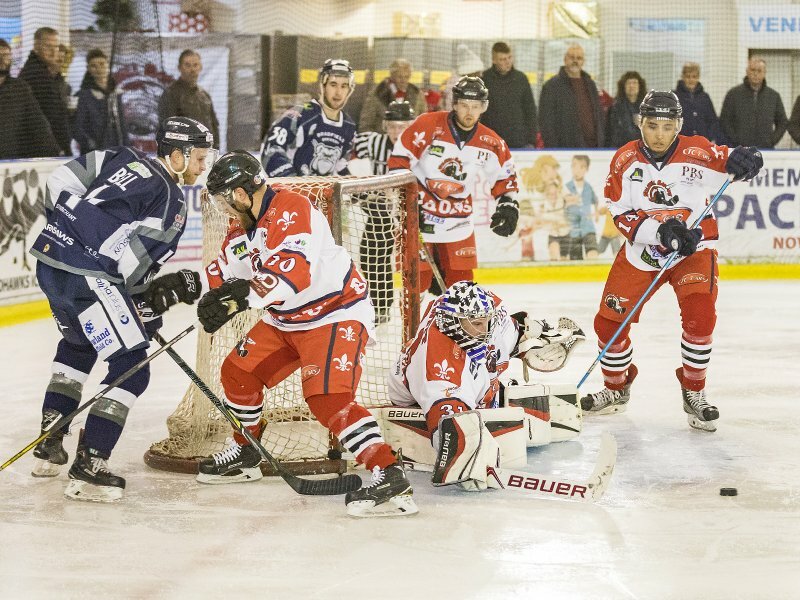 11th February 2018 – Match with Sheffield Steeldogs. 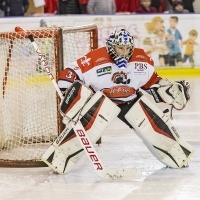 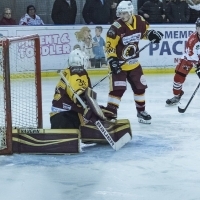 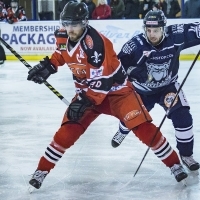 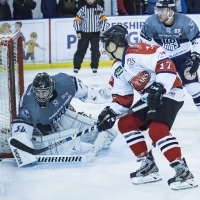 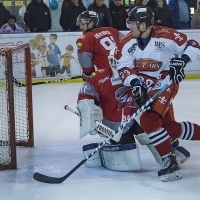 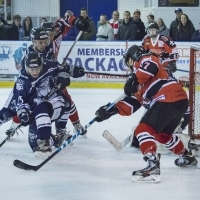 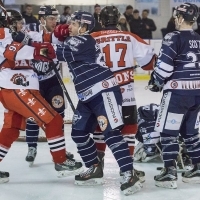 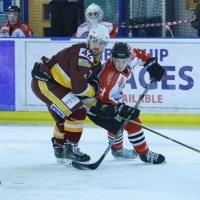 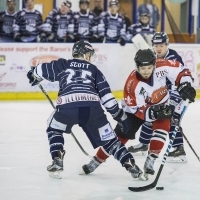 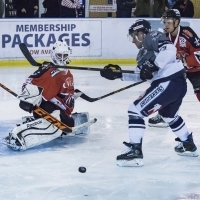 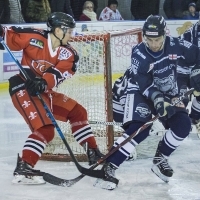 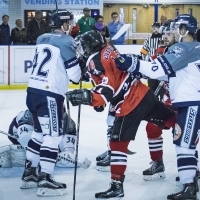 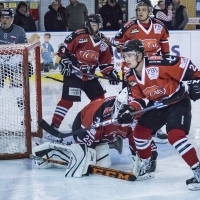 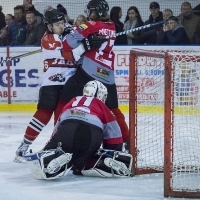 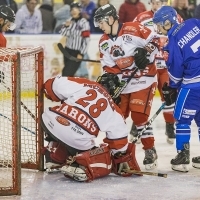 The final score was Solihull Barons 2 – Sheffield Steeldogs 3. 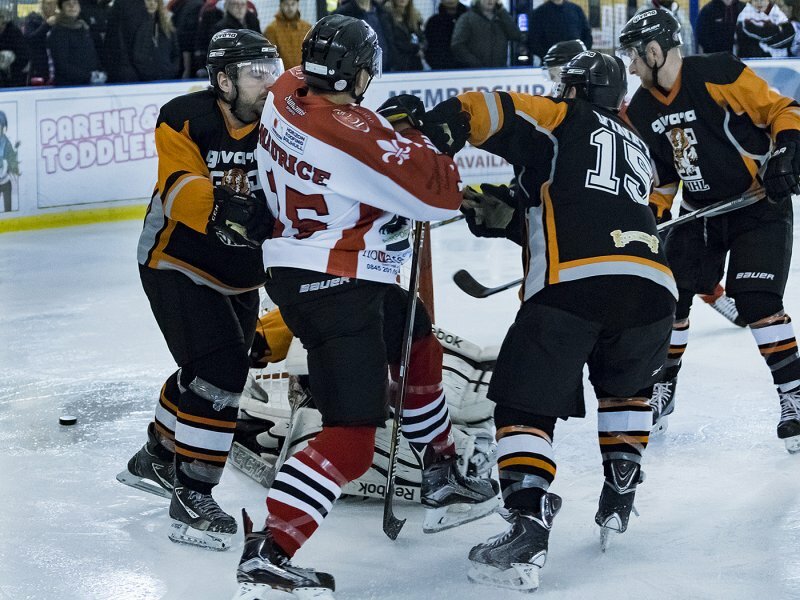 10th February 2018 – Match with Whitley Warriors. 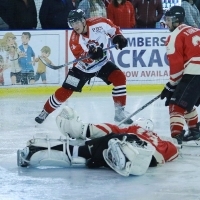 The final score was Solihull Barons 7 – Whitley Warriors 3. 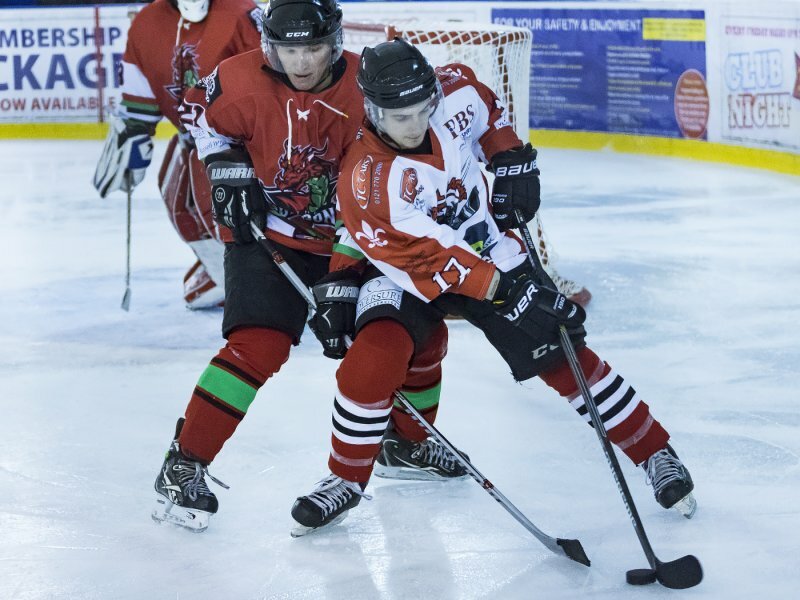 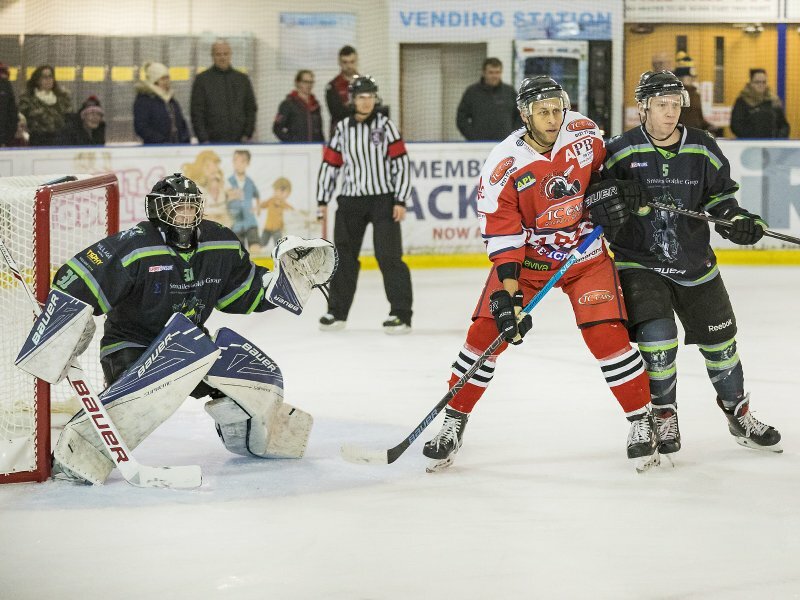 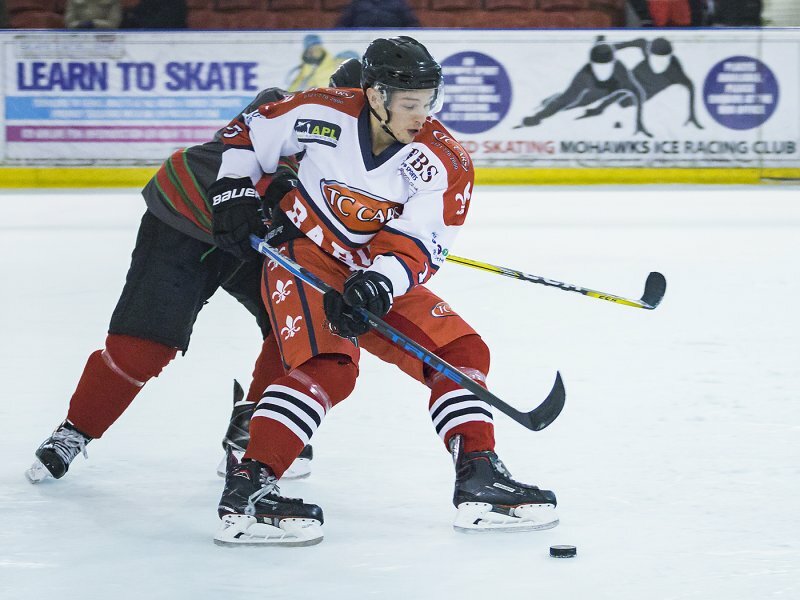 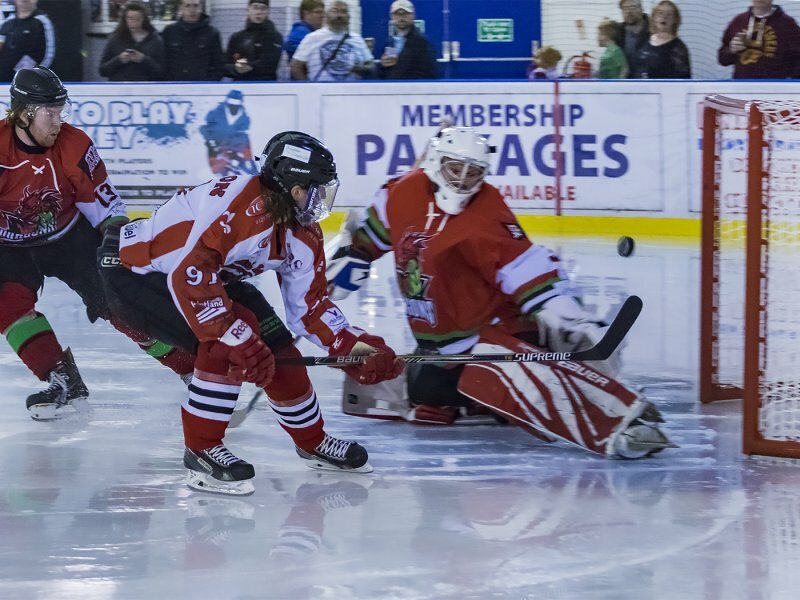 4th February 2018 – Match with Deeside Dragons. 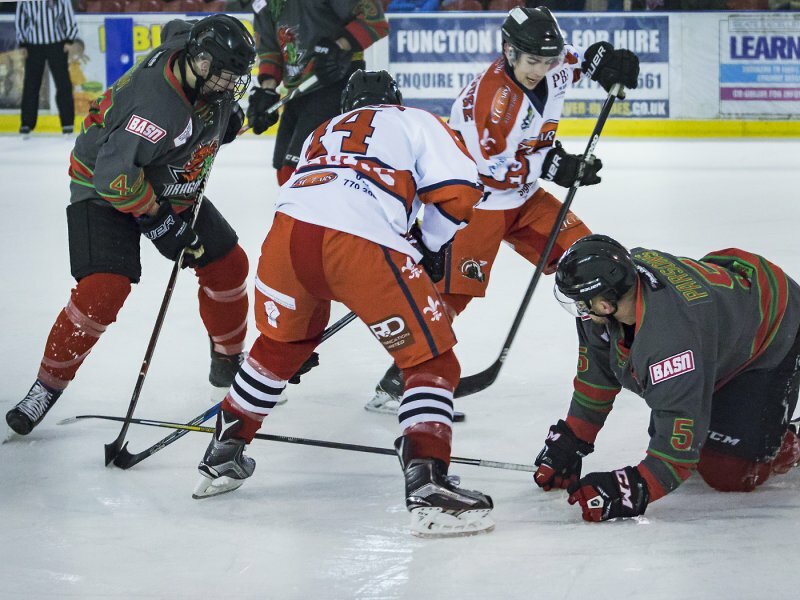 The final score was Solihull Barons 16 – Deeside Dragons 0. 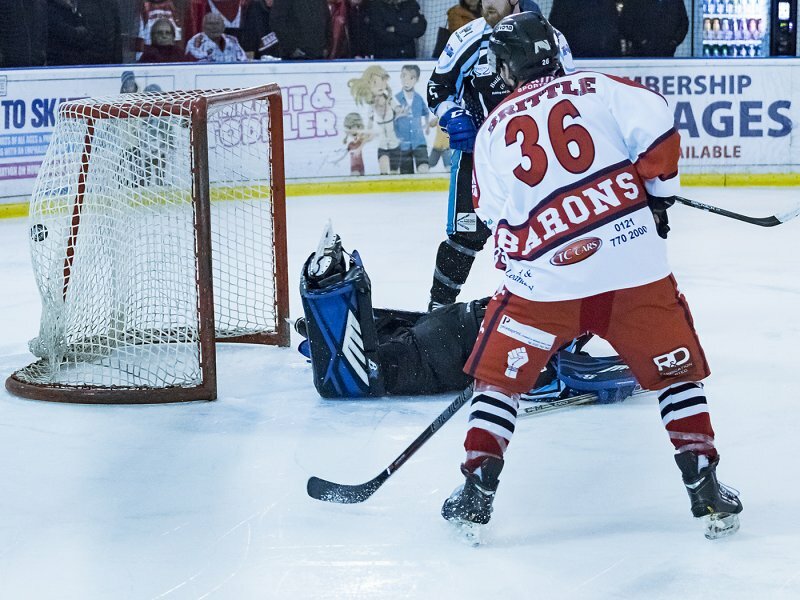 28th January 2018 – Match with Hull Pirates. 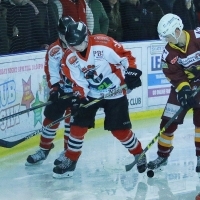 The final score was Solihull Barons 3 – Hull Pirates 4. 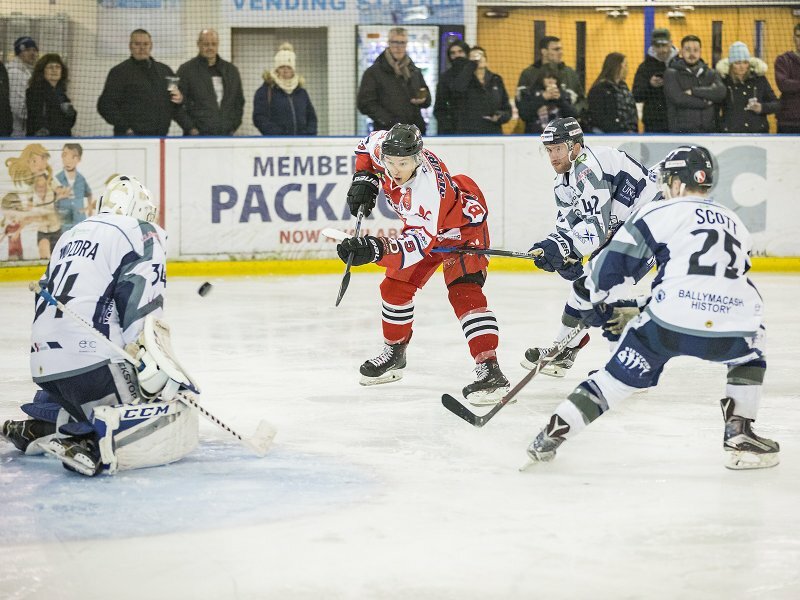 21st January 2018 – Match with Billingham Stars. 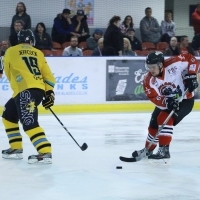 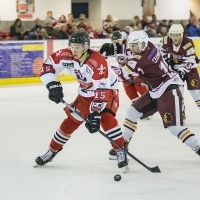 The final score was Solihull Barons 5 – Billingham Stars 1. 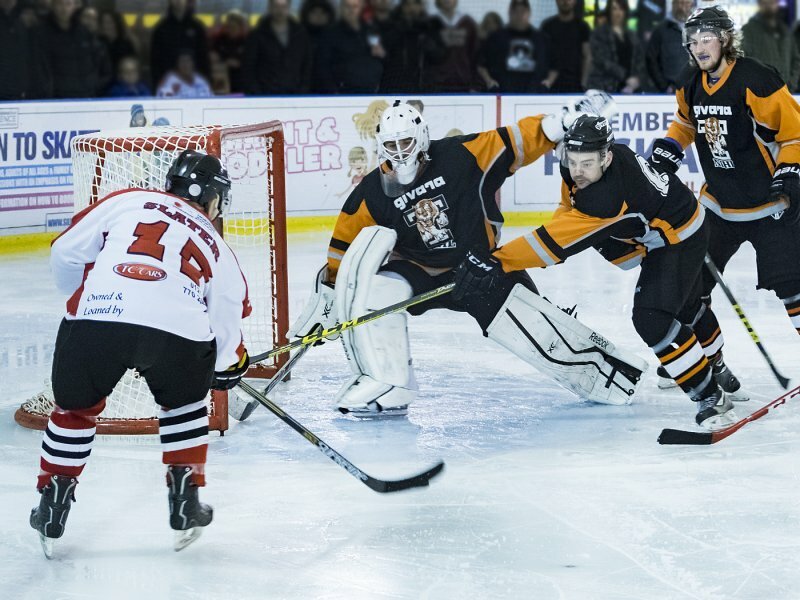 13th January 2018 – Match with Telford Tigers. 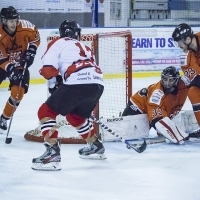 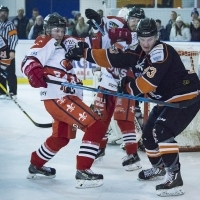 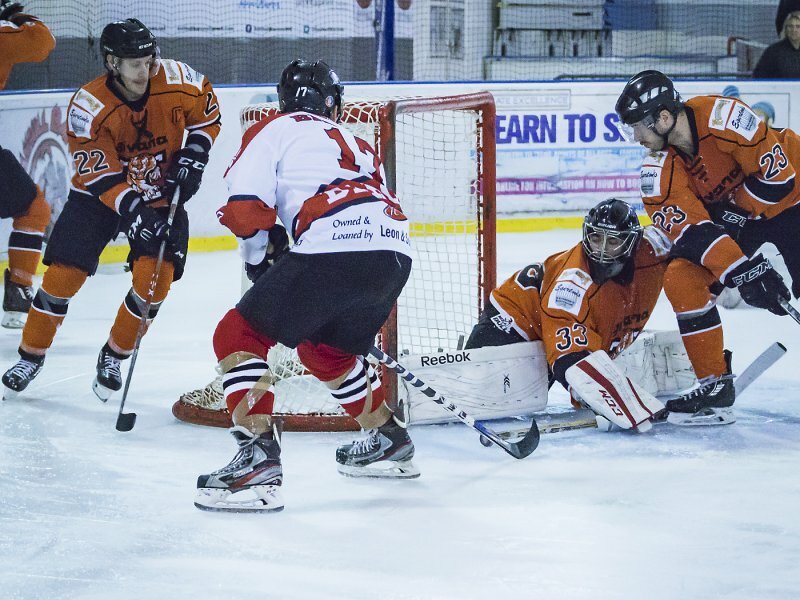 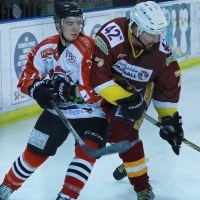 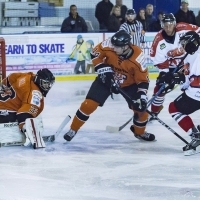 The final score was Solihull Barons 3 – Telford Tigers 2. 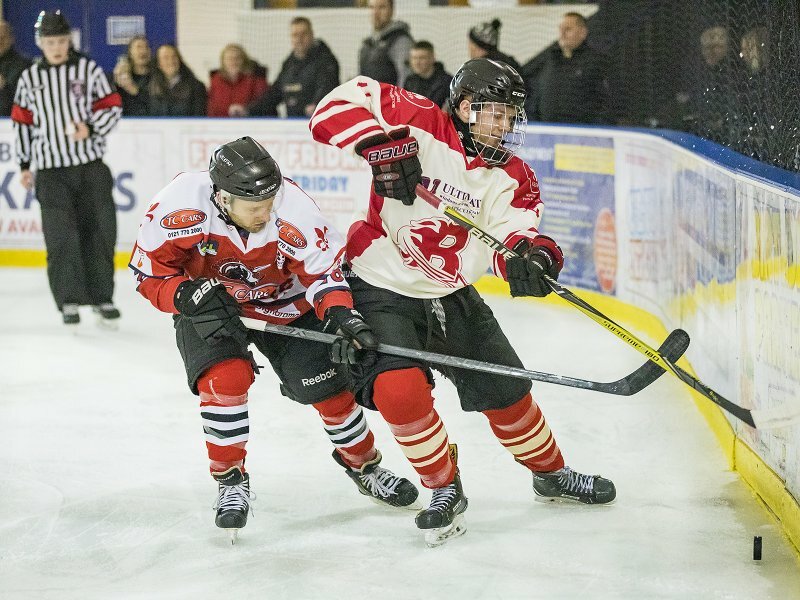 17th December 2017 – Match with Billingham Stars. 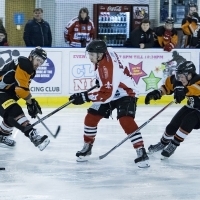 The final score was Solihull Barons 7 – Billingham Stars 4. 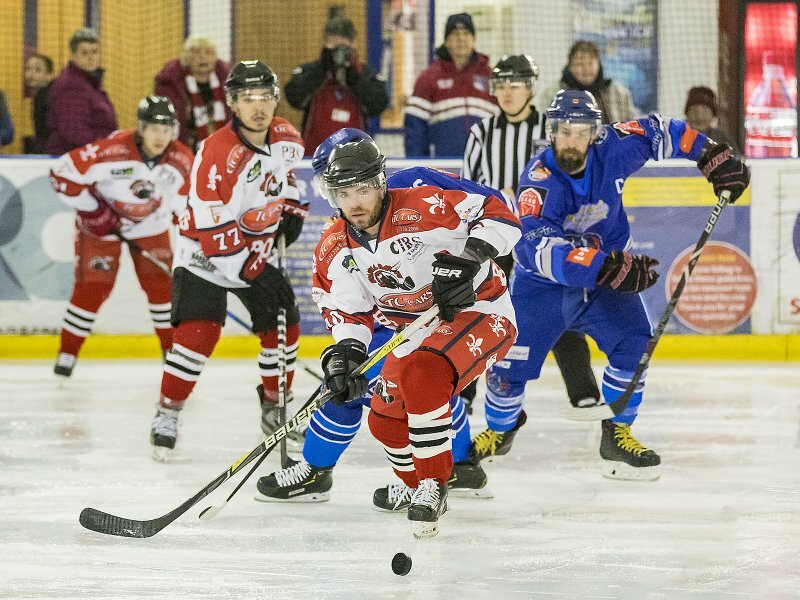 3rd December 2017 – Match with Solway Sharks. 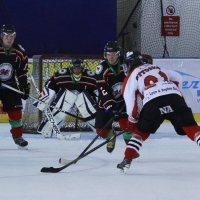 The final score was Solihull Barons 2 – Solway Sharks 3. 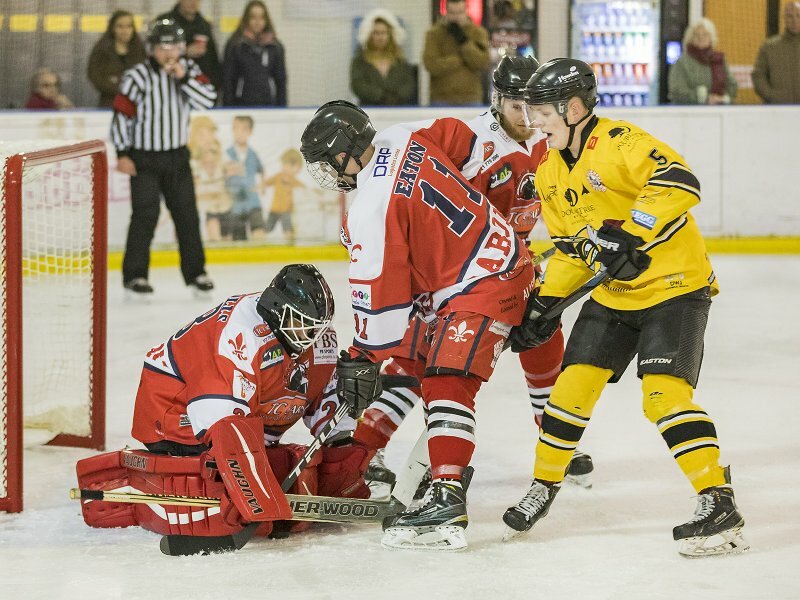 19th November 2017 – Match with Blackburn Hawks. 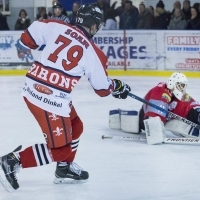 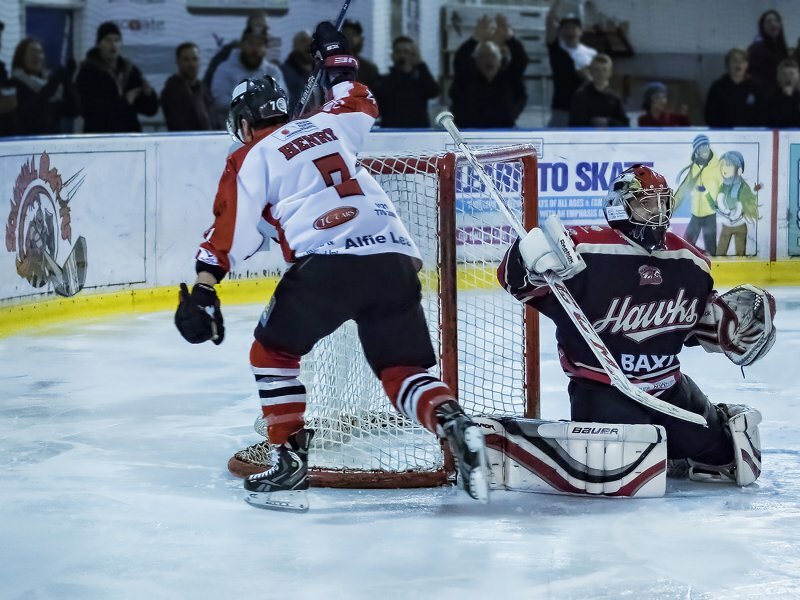 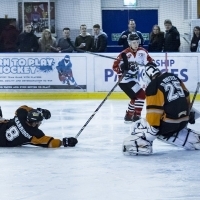 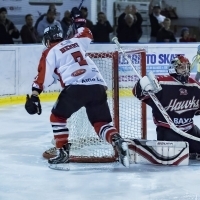 The final score was Solihull Barons 6 – Blackburn Hawks 2. 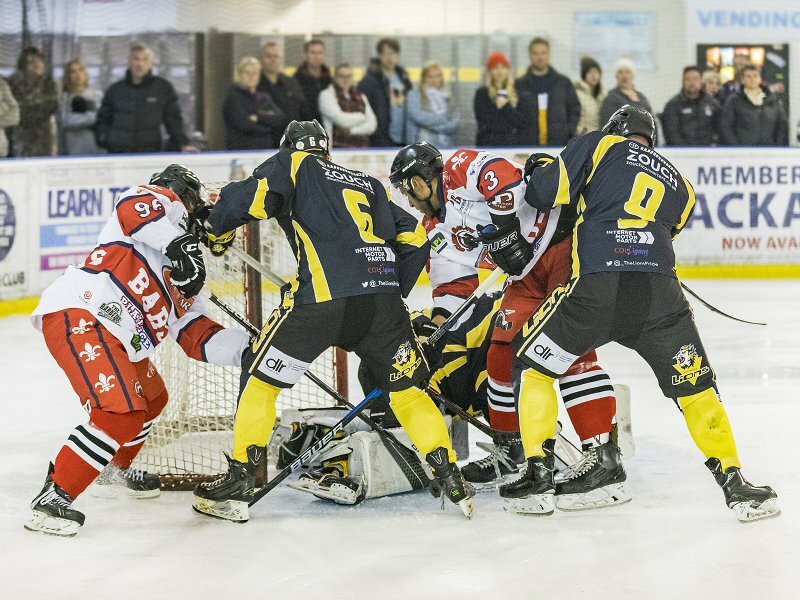 12th November 2017 – Match with Whitley Warriors. 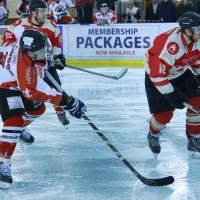 The final score was Solihull Barons 5 – Whiteley Warriors 2. 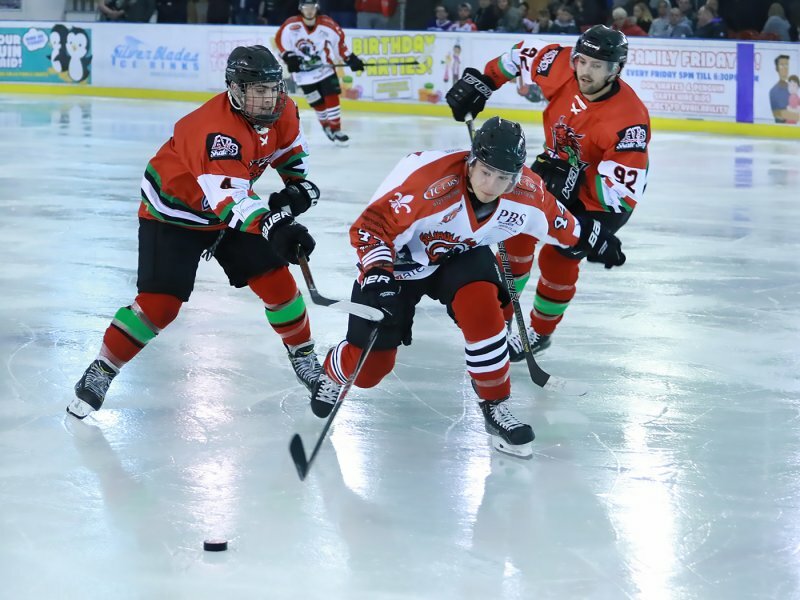 22nd October 2017 – Match with Deeside Dragons. 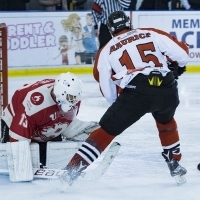 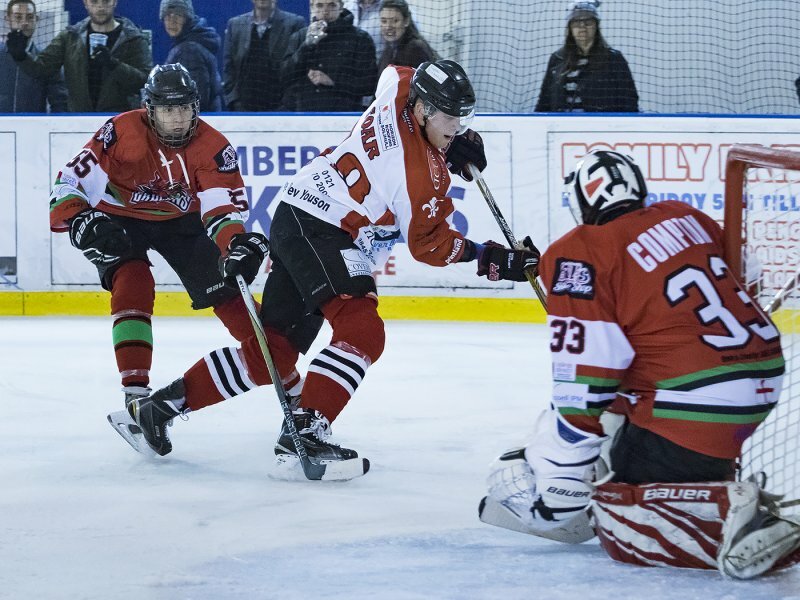 The final score was Solihull Barons 15 – Deeside Dragons 3. 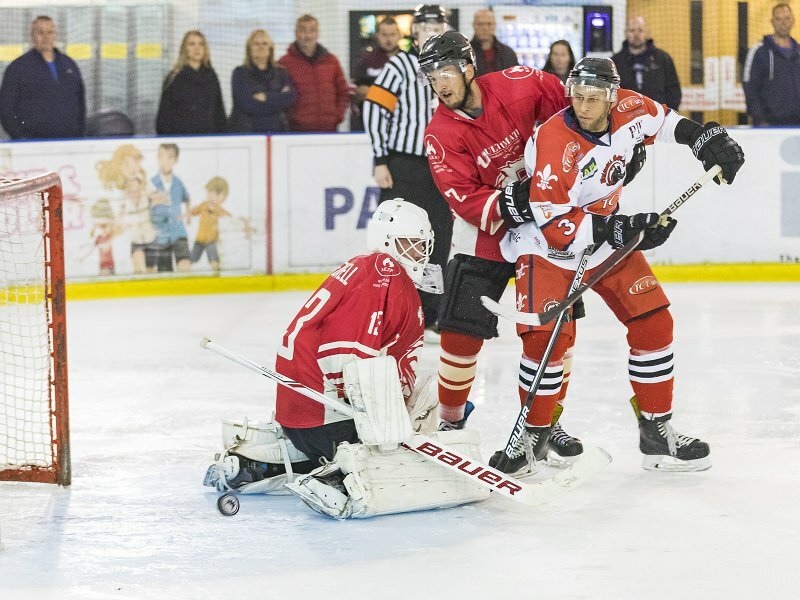 8th October 2017 – Match with Nottingham Lions. 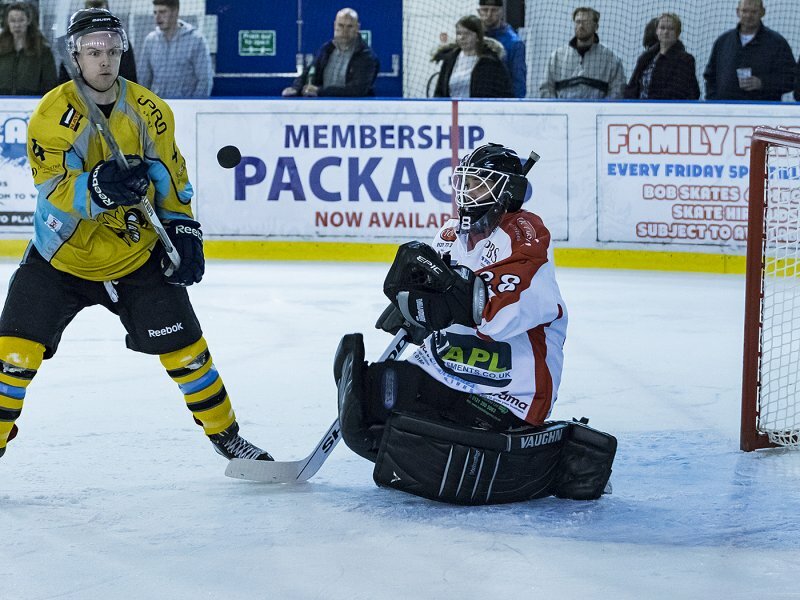 The final score was Solihull Barons 4 – Nottingham Lions 5. 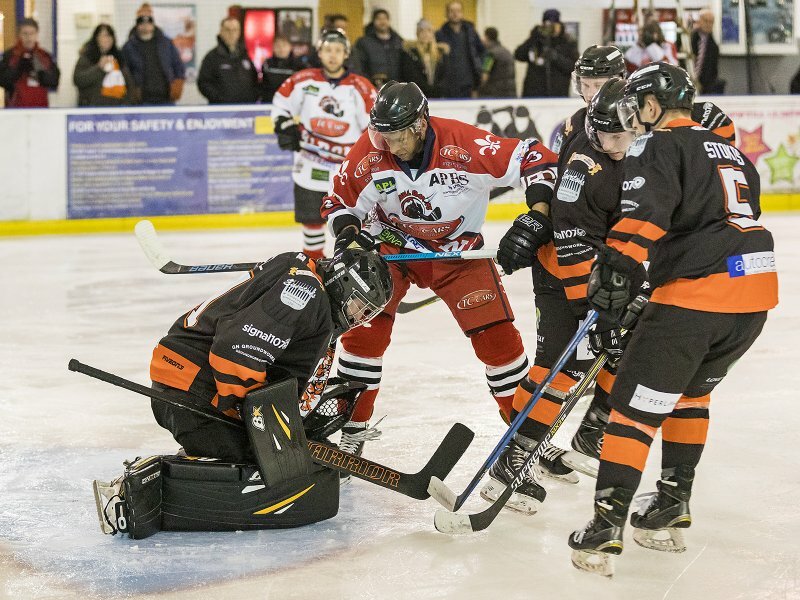 17th September 2017 – Match with Telford Tigers. 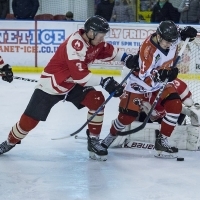 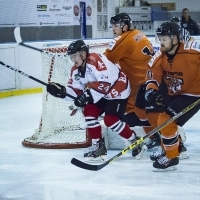 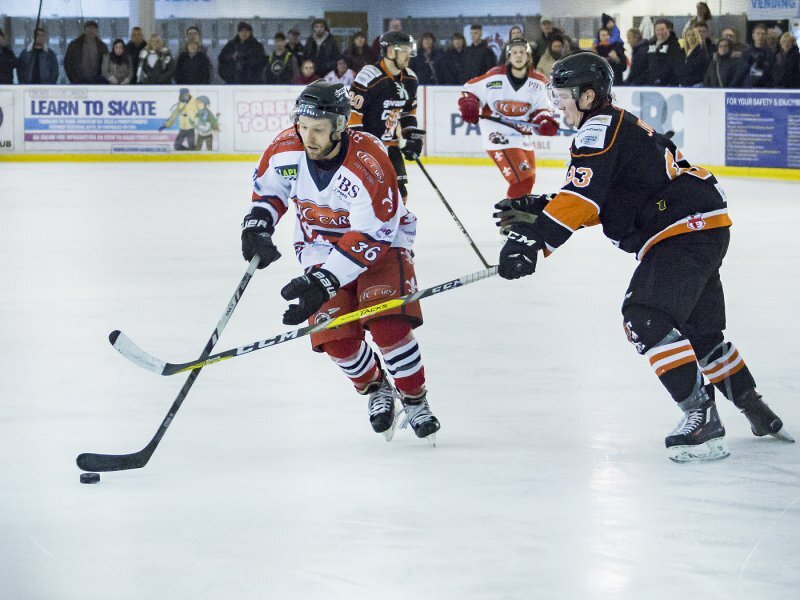 The final score was Solihull Barons 3 – Telford Tigers 5. 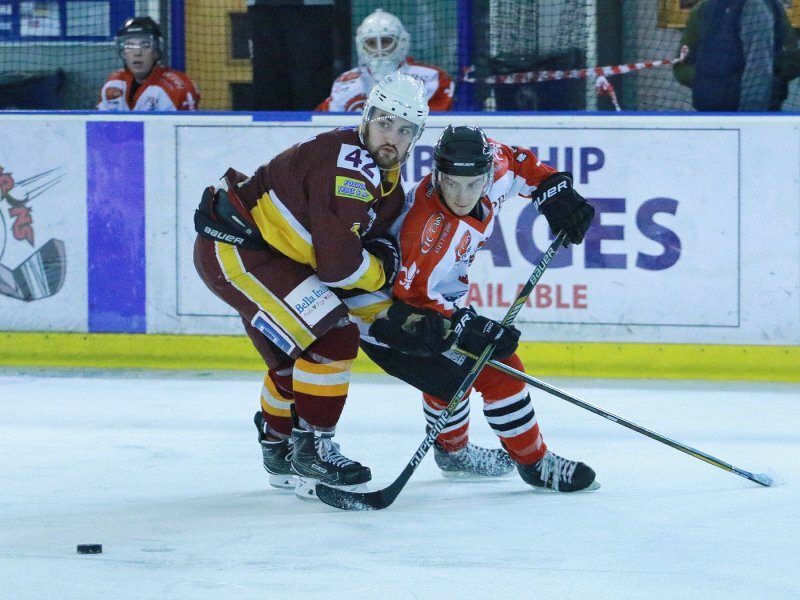 3rd September 2017 – Match with Sheffield Steeldogs. 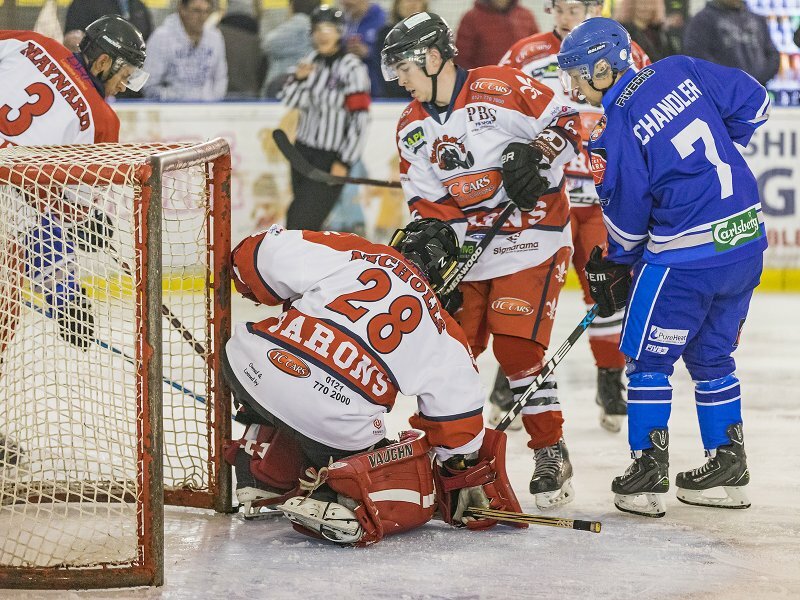 The final score was Solihull Barons 4 – Sheffiled Steeldogs 5. 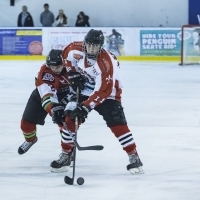 26th March 2017 – Match with Blackburn Hawks. 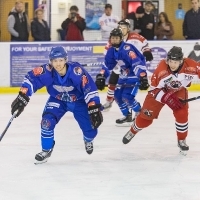 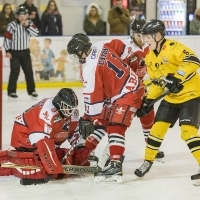 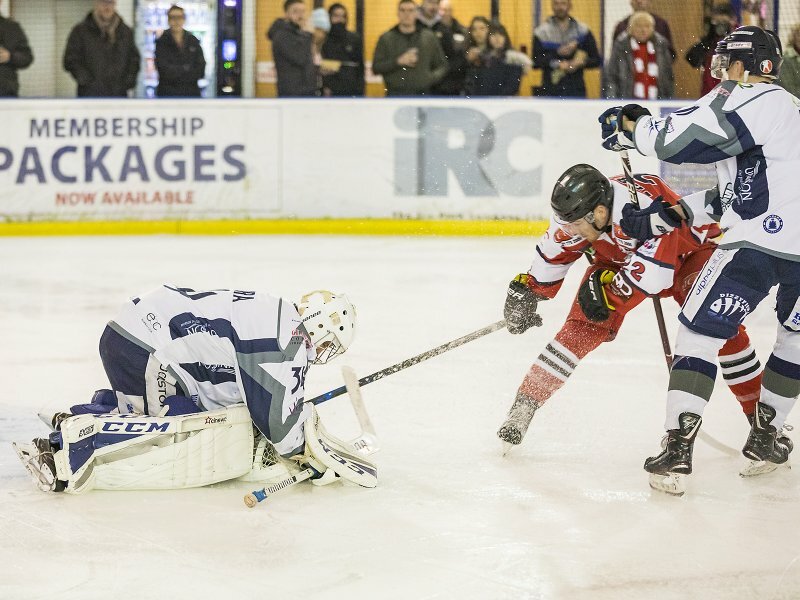 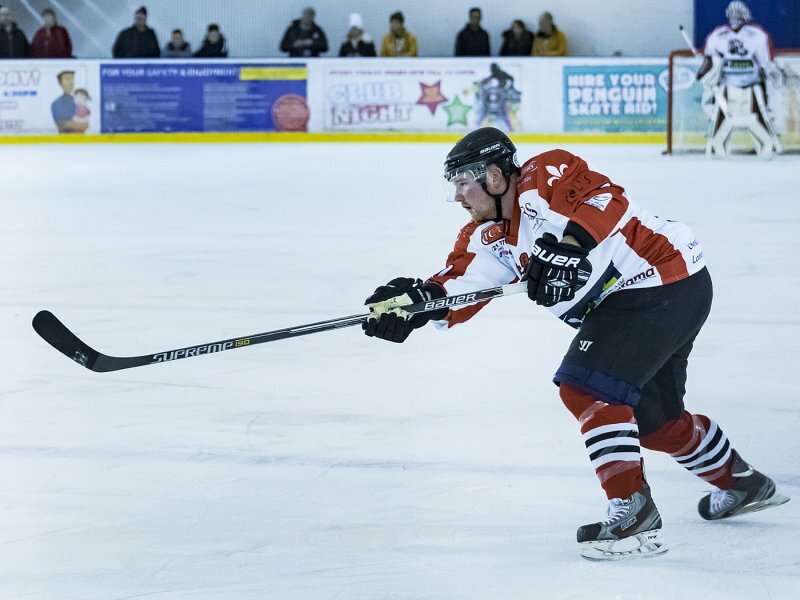 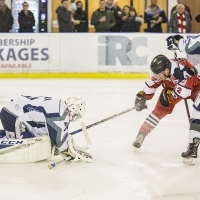 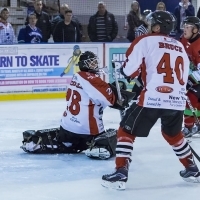 The final score was Solihull Barons 4 – Blackburn Hawks 6. 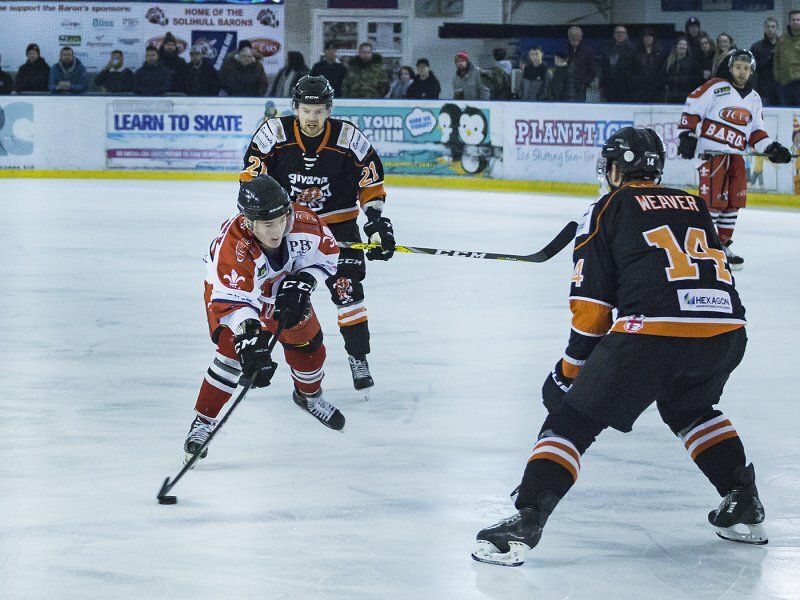 12th March 2017 – Match with Billingham Stars. 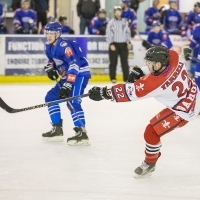 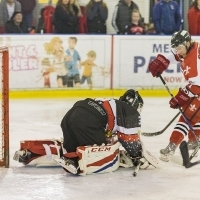 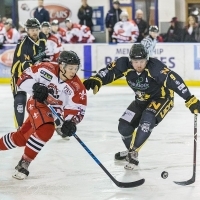 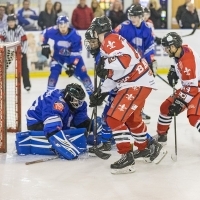 The final score was Solihull Barons 2 – Billingham Stars 4. 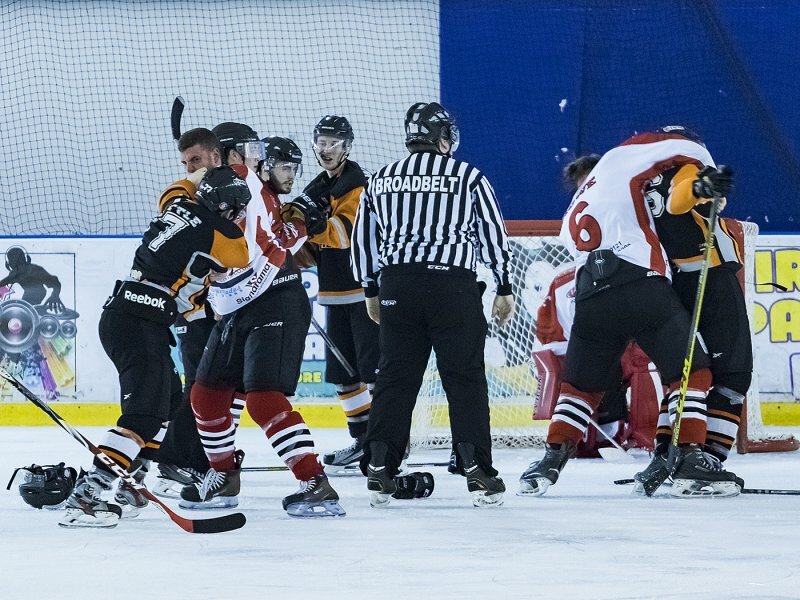 5th March 2017 – Match with Whitley Warriors. 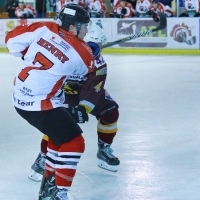 The final score was Solihull Barons 7 – Whitley Warriors 3. 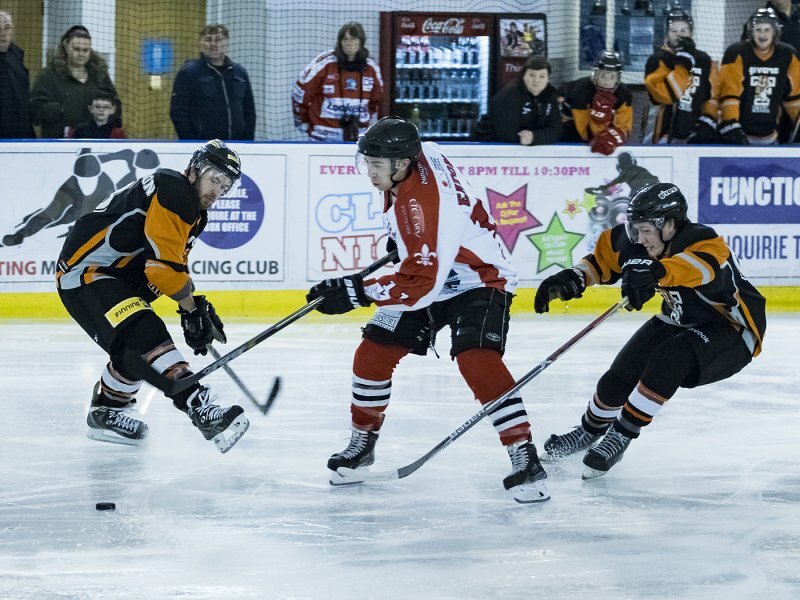 26th February 2017 – Match with Whitley Warriors. 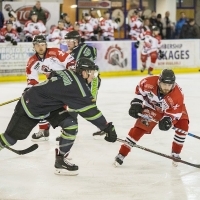 The final score was Solihull Barons 12 – Whitley Warriors 7. 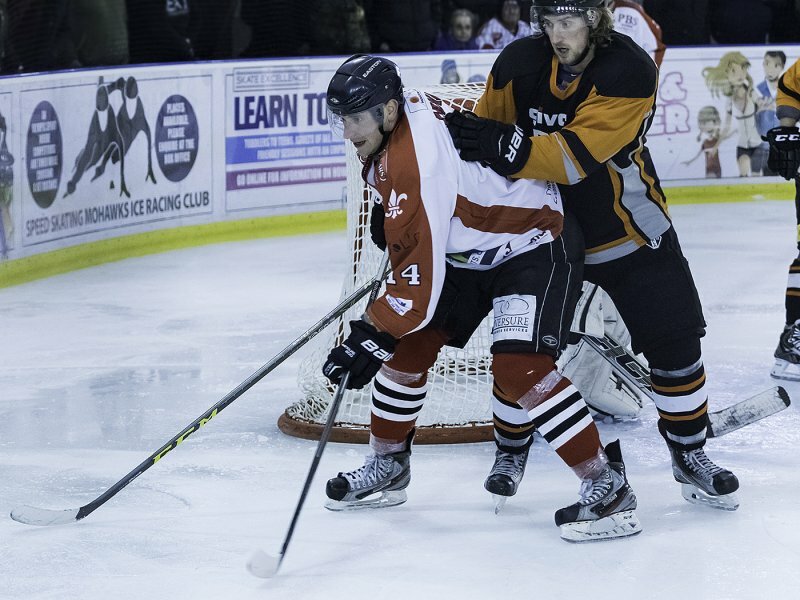 29th January 2017 – Match with Solway Sharks. 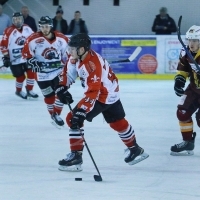 The final score was Solihull Barons 2 – Solway Sharks 4. 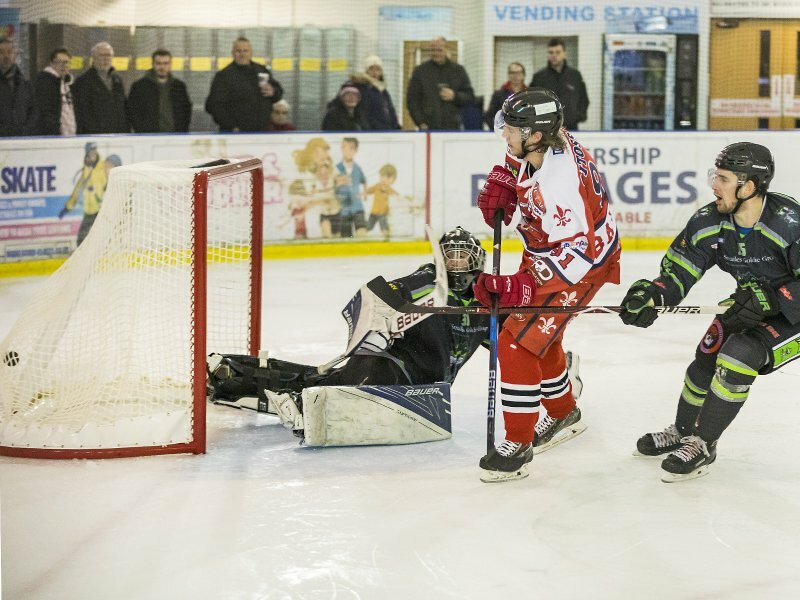 15th January 2017 – Match with Billingham Stars. 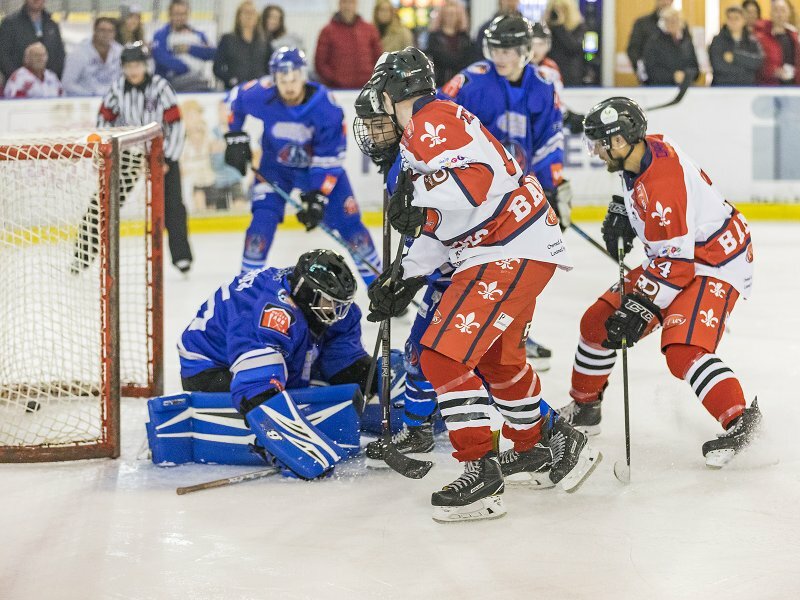 The final score was Solihull Barons 7 – Billingham Stars 5. 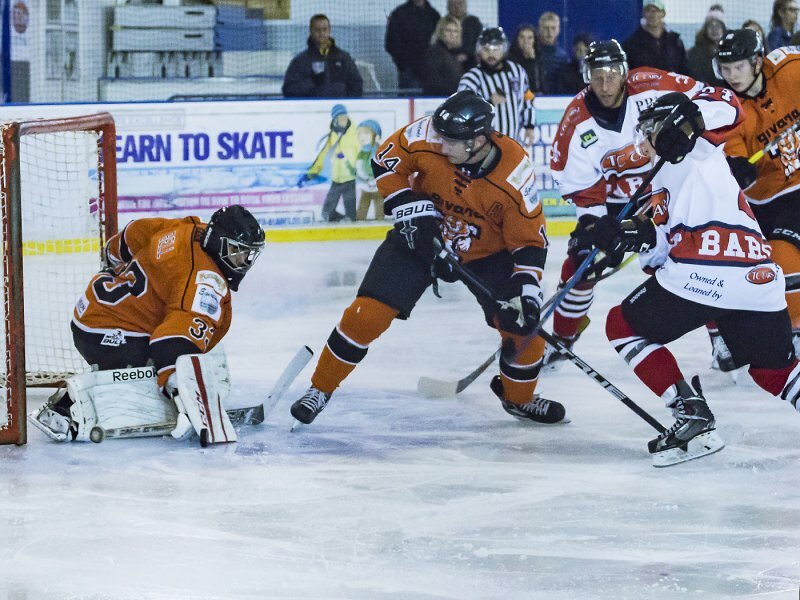 8th January 2017 – Match with Telford Tigers. 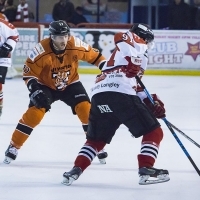 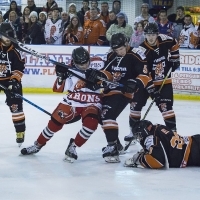 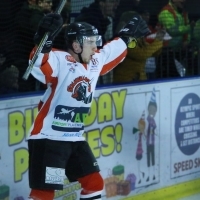 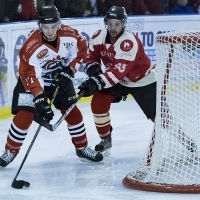 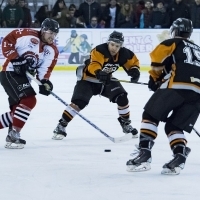 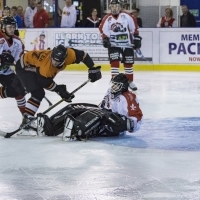 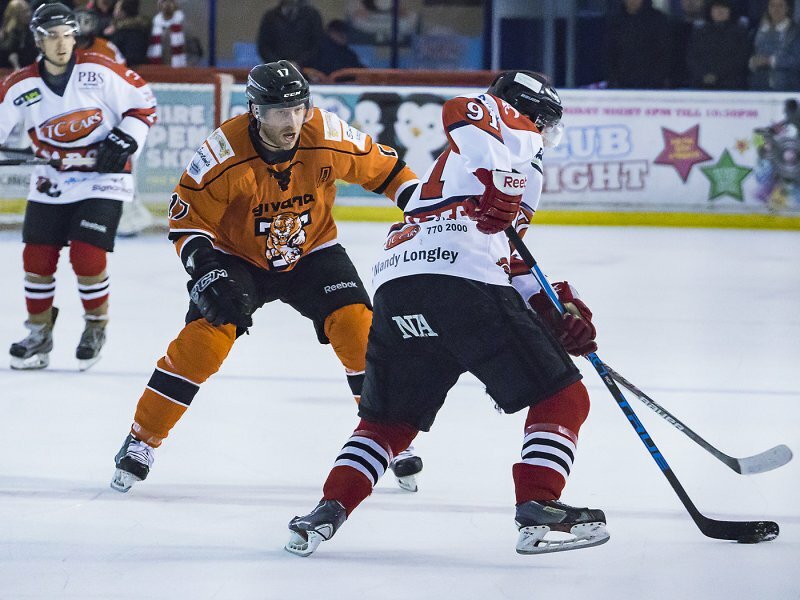 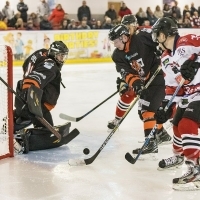 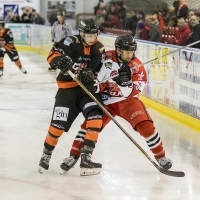 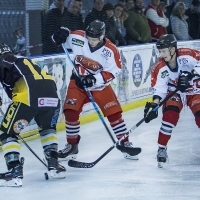 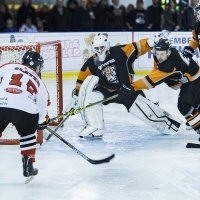 The final score was Solihull Barons 2 – Telford Tigers 6. 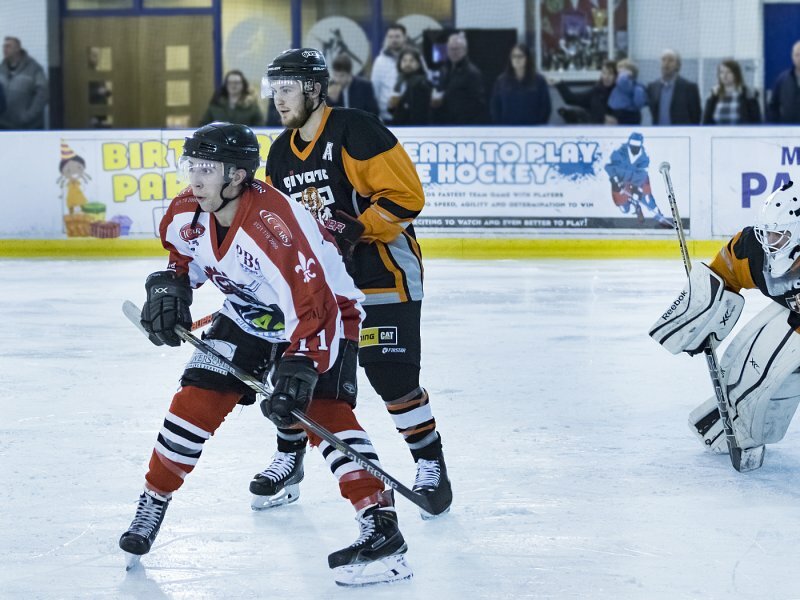 18th December 2016 – Match with Telford Tigers. 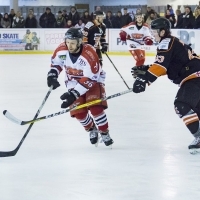 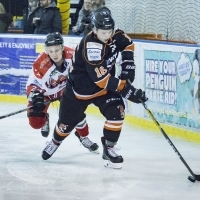 The final score was Solihull Barons 1 – Telford Tigers 4. 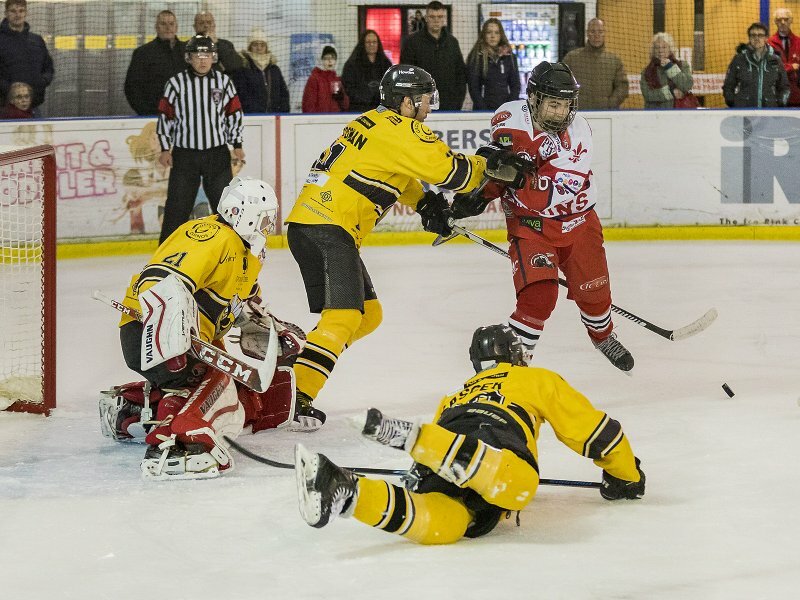 11th December 2016 – Match with Blackburn Hawks. 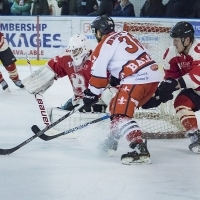 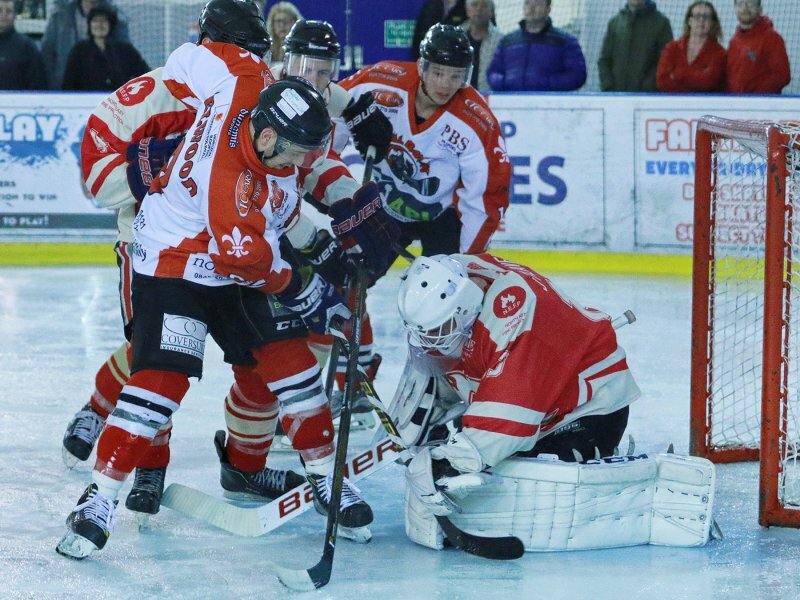 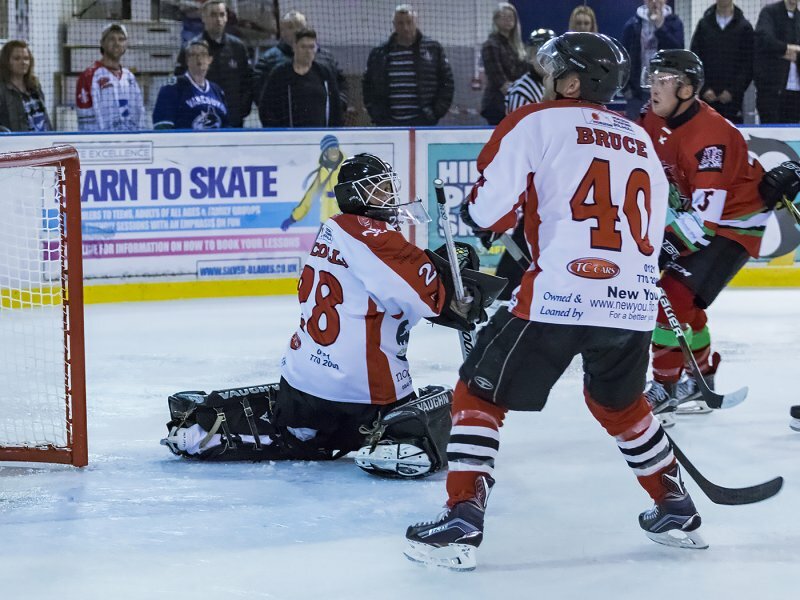 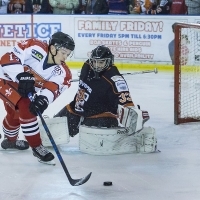 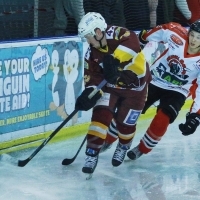 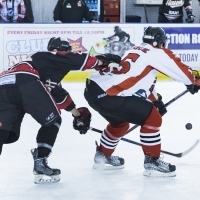 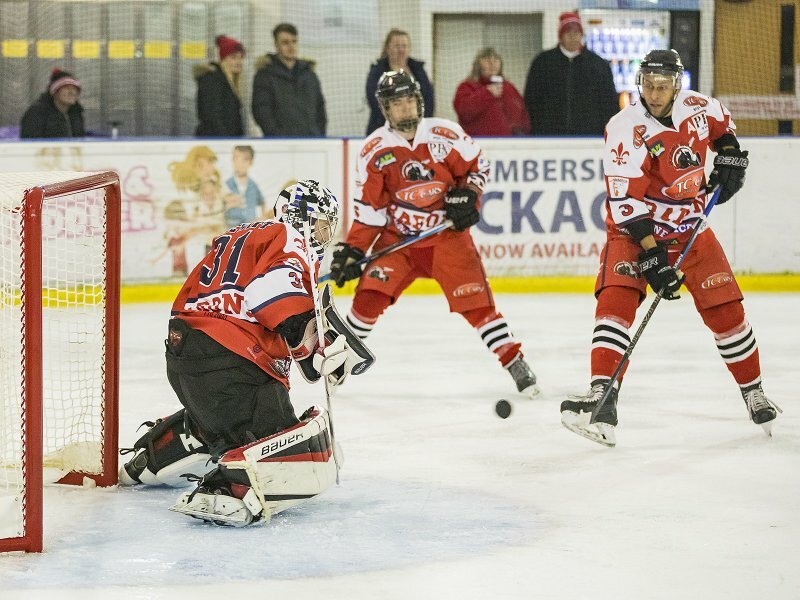 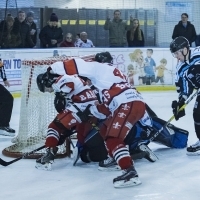 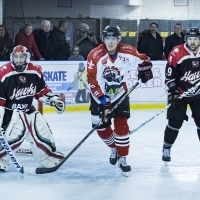 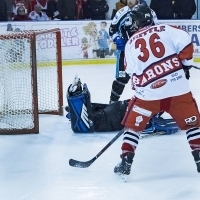 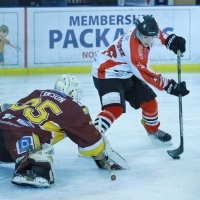 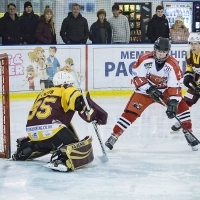 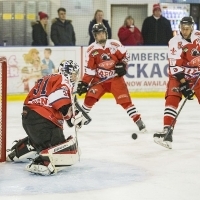 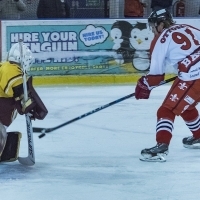 The final score was Solihull Barons 3 – Blackburn Hawks 5. 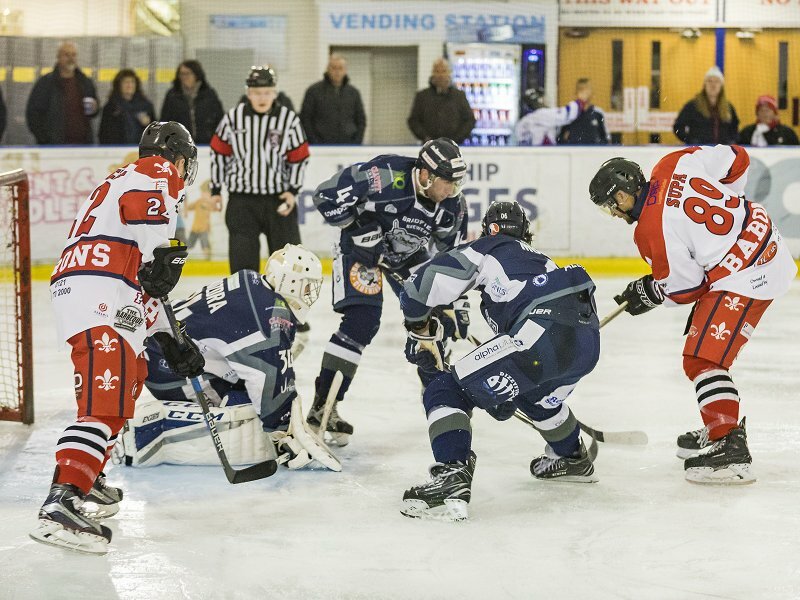 20th November 2016 – Match with Solway Sharks. 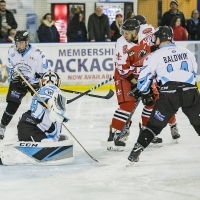 The final score was Solihull Barons 1 – Solway Sharks 4. 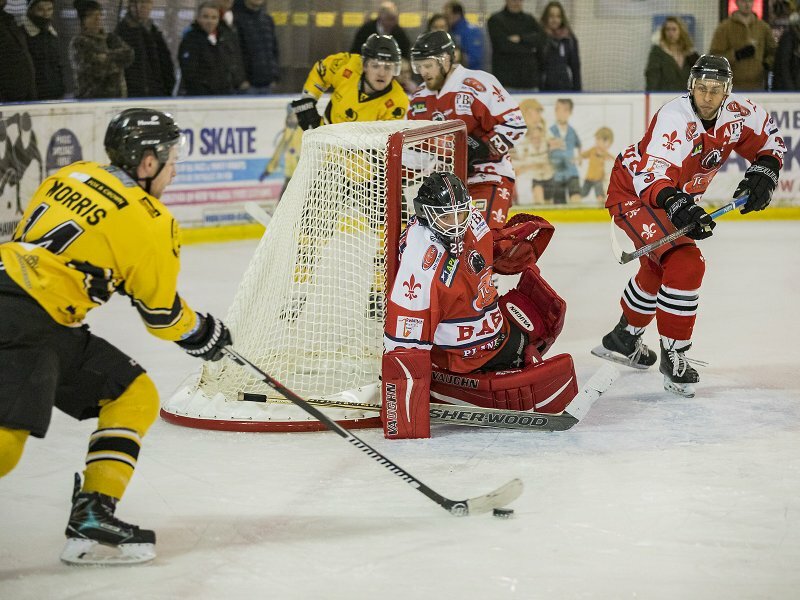 30th October 2016 – Match with Sutton Sting. 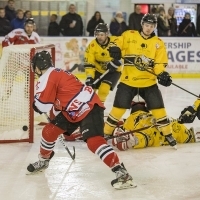 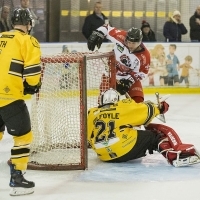 The final score was Solihull Barons 3 – Sutton Sting 2. 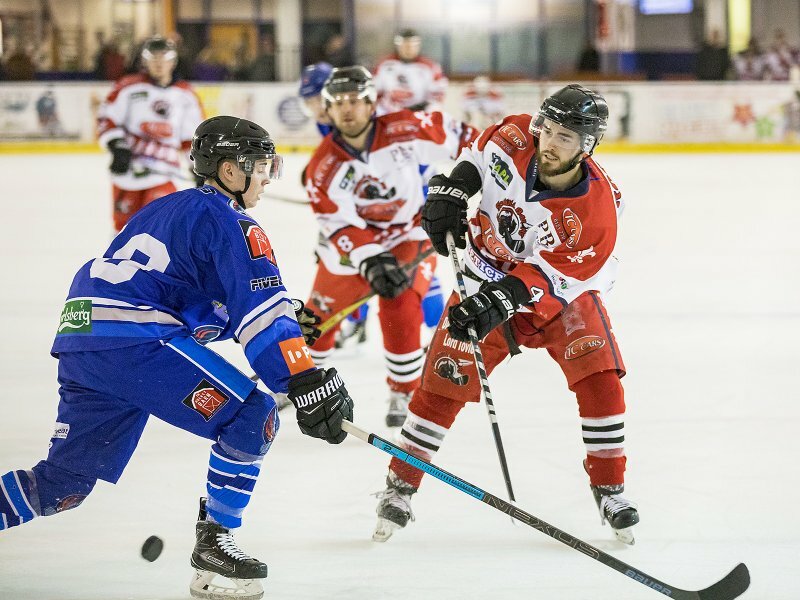 23rd October 2016 – Match with Deeside Dragons. 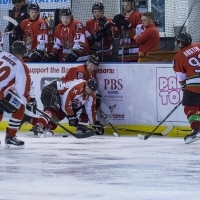 The final score was Solihull Barons 10 – Deeside Dragons 7. 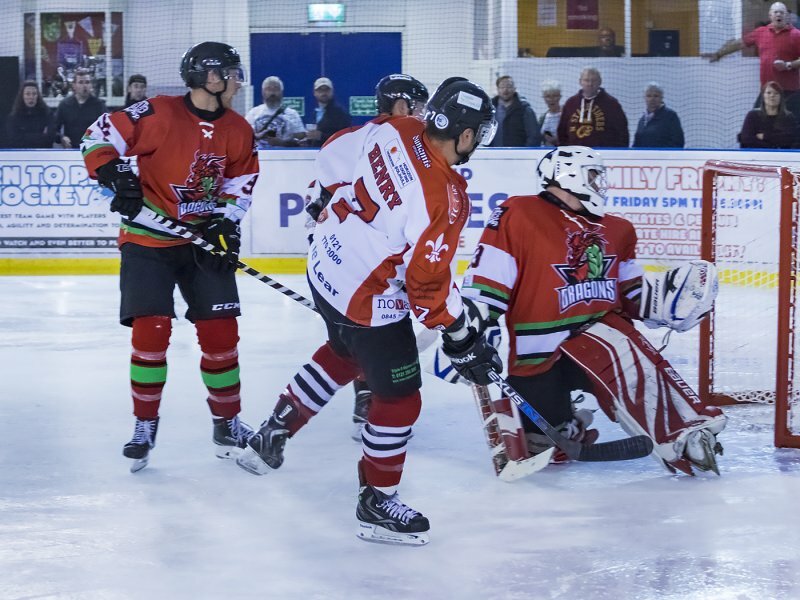 25th September 2016 – Match with Deeside Dragons. 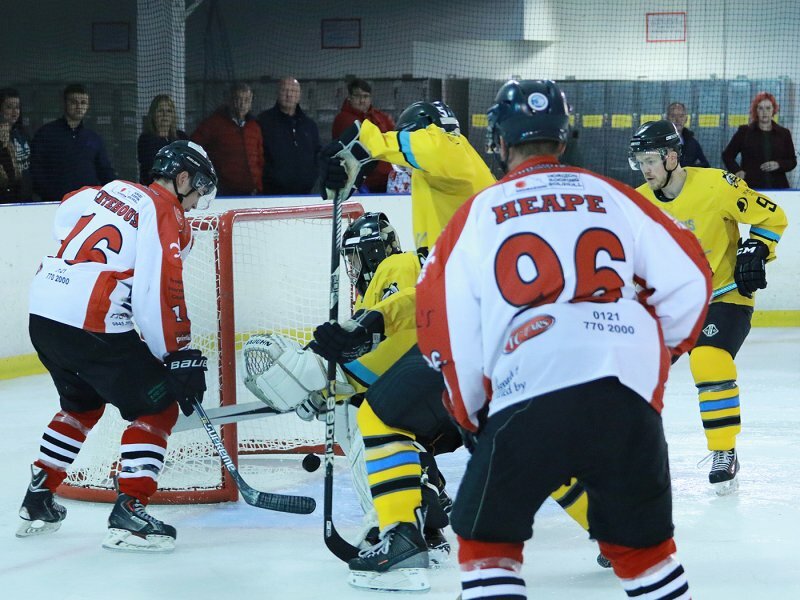 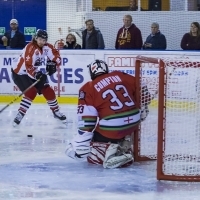 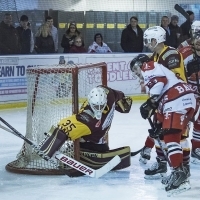 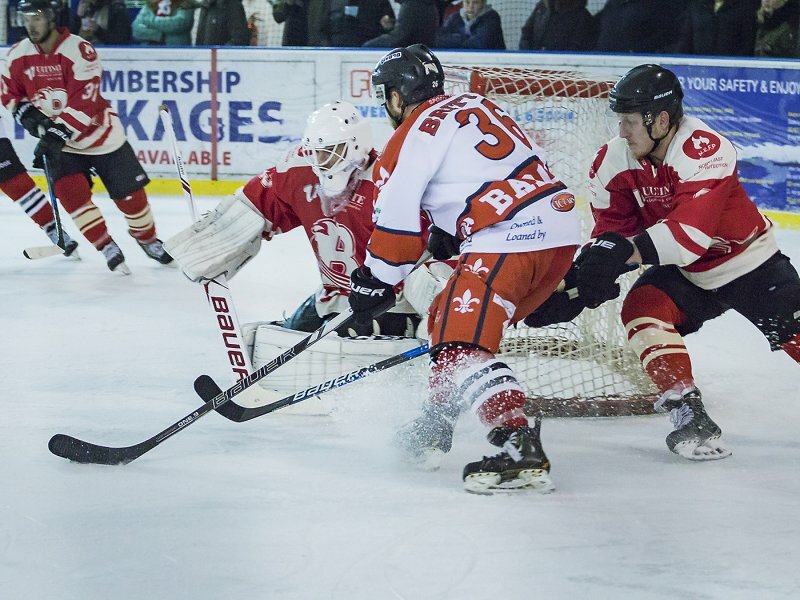 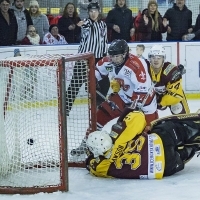 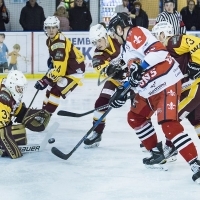 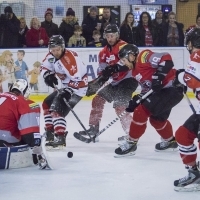 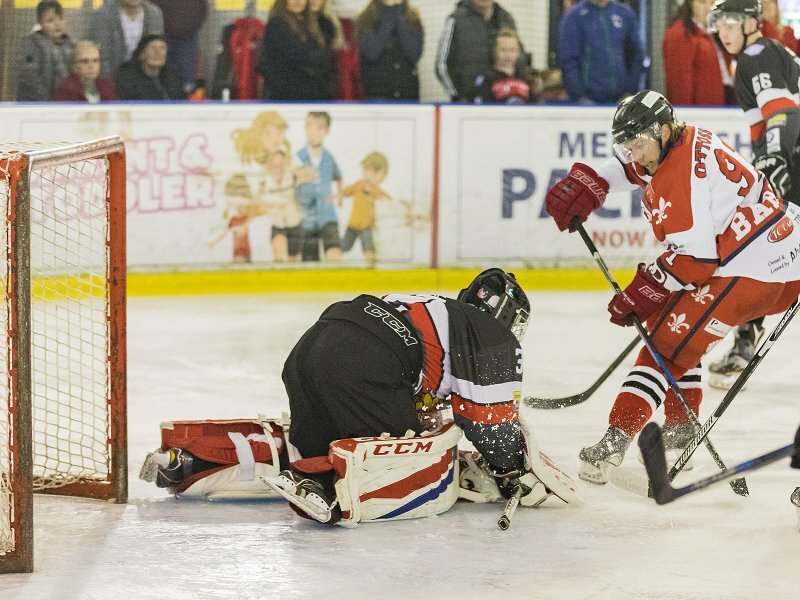 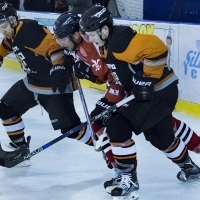 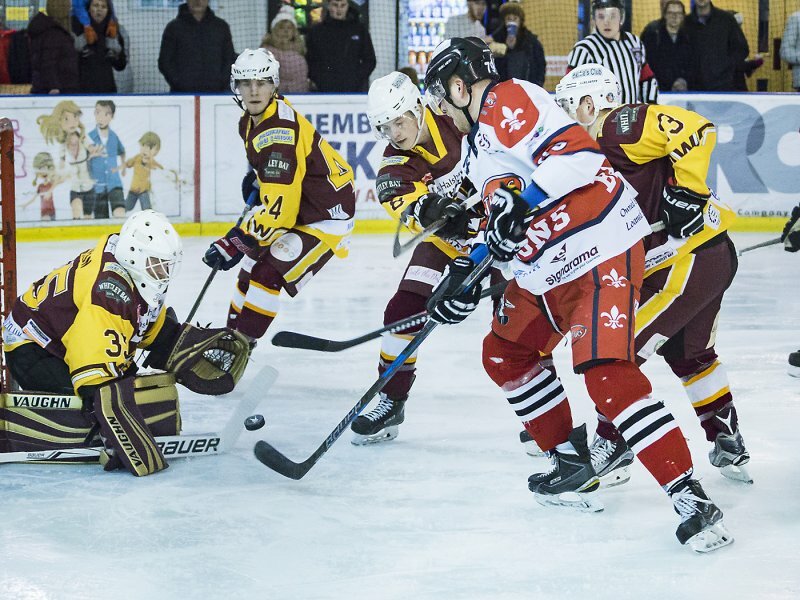 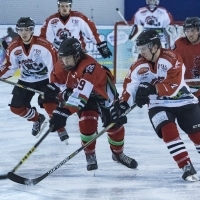 The final score was Solihull Barons 3 – Deeside Dragons 6. 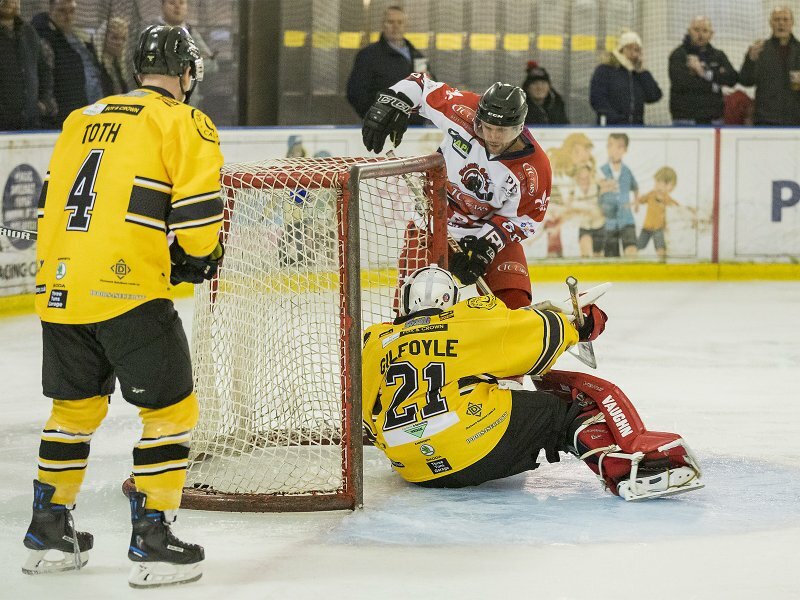 4th September 2016 – First league match with Sutton Sting. 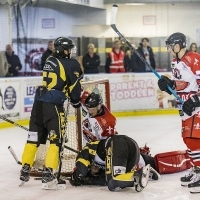 The final score was Solihull Barons 6 – Sutton Sting 3. 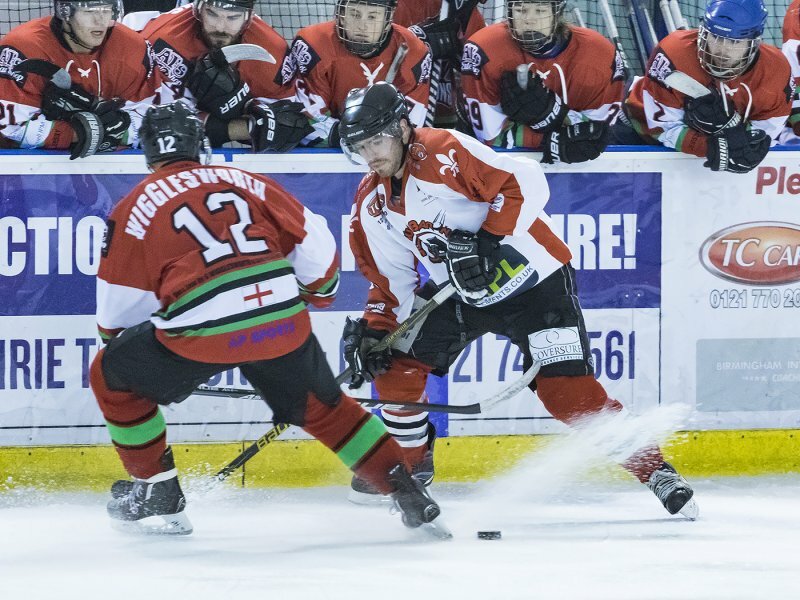 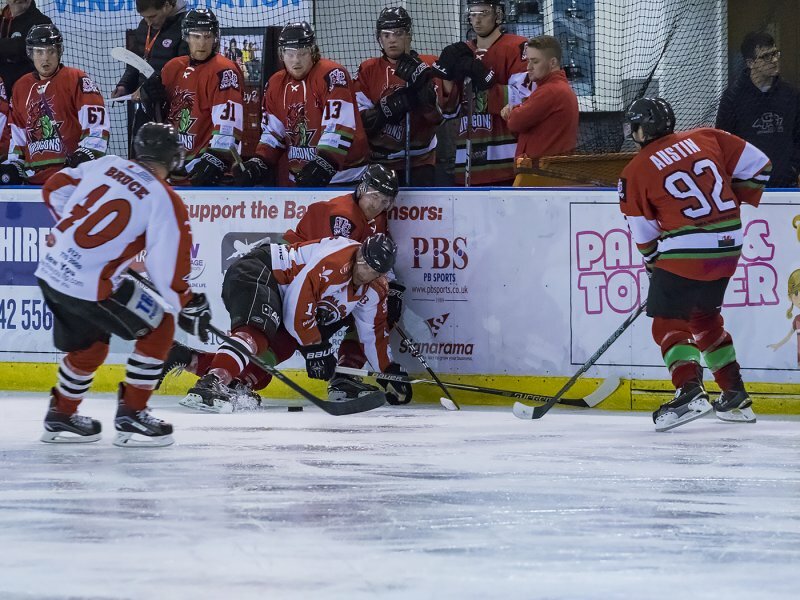 21st August 2016 – Challenge match (a friendly) with Deeside Dragons. 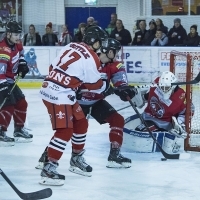 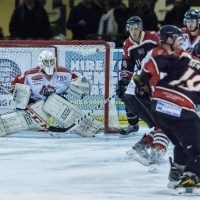 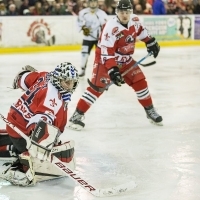 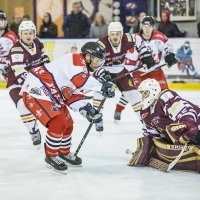 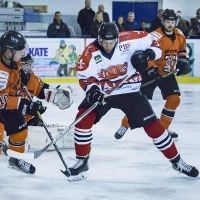 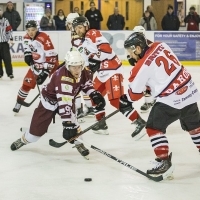 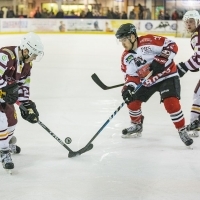 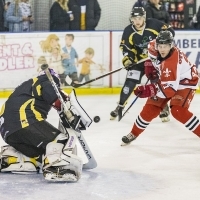 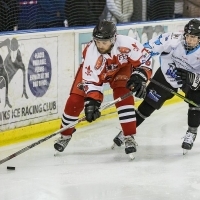 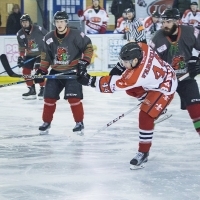 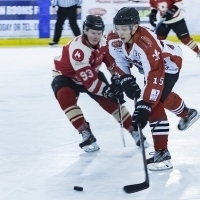 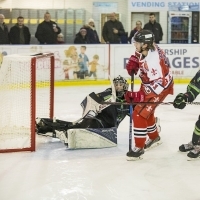 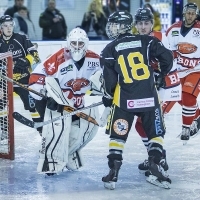 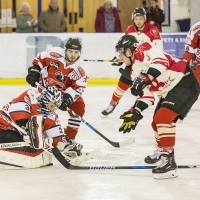 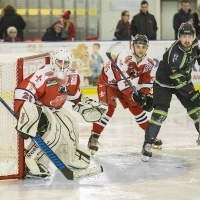 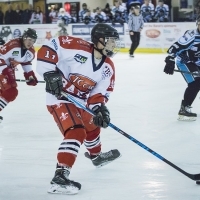 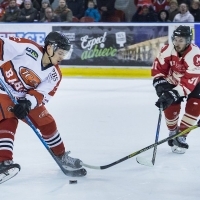 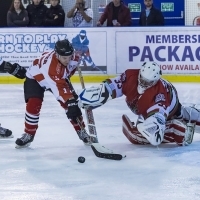 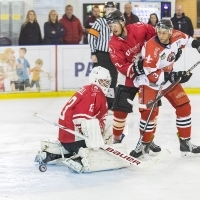 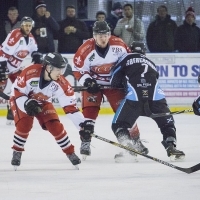 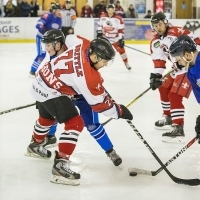 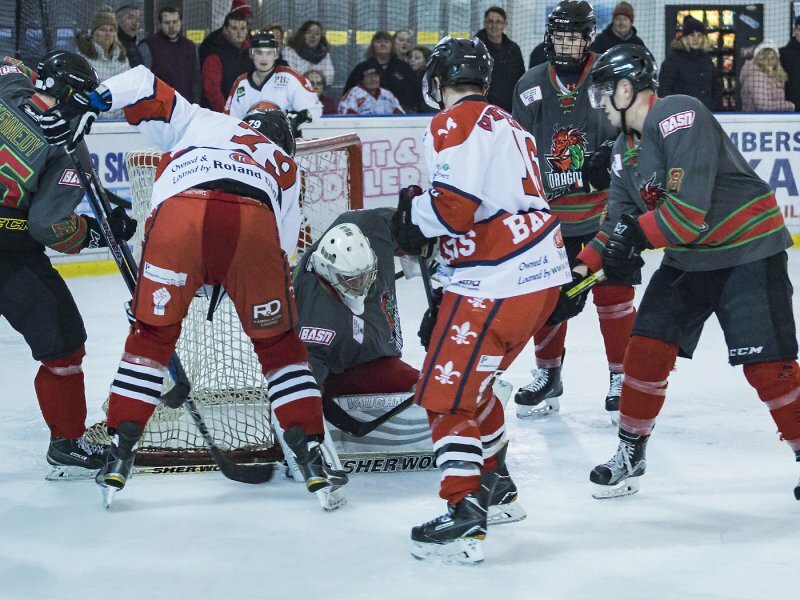 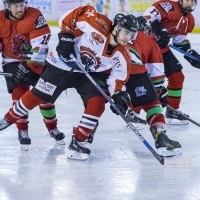 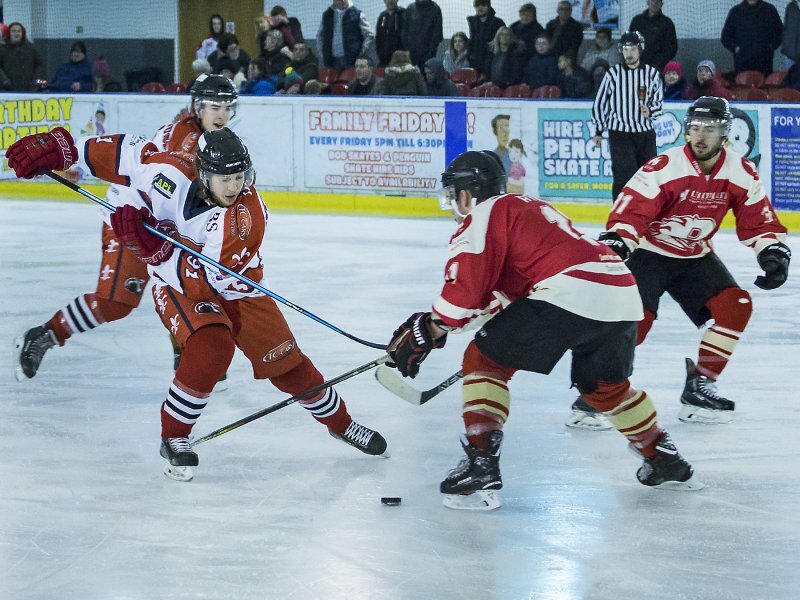 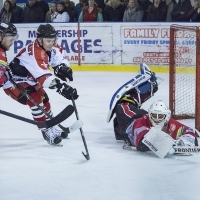 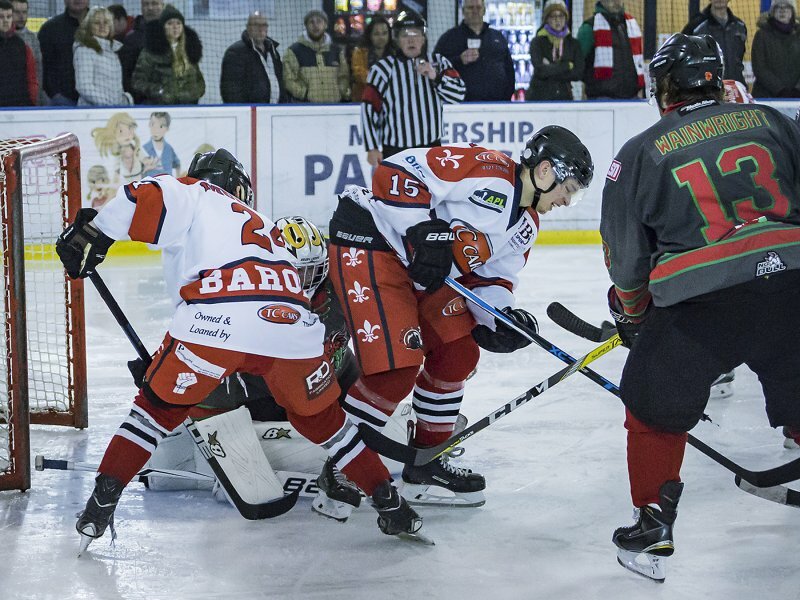 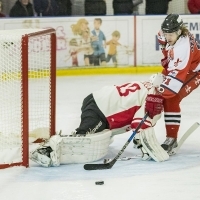 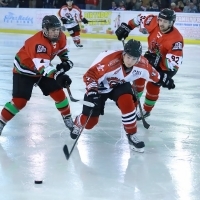 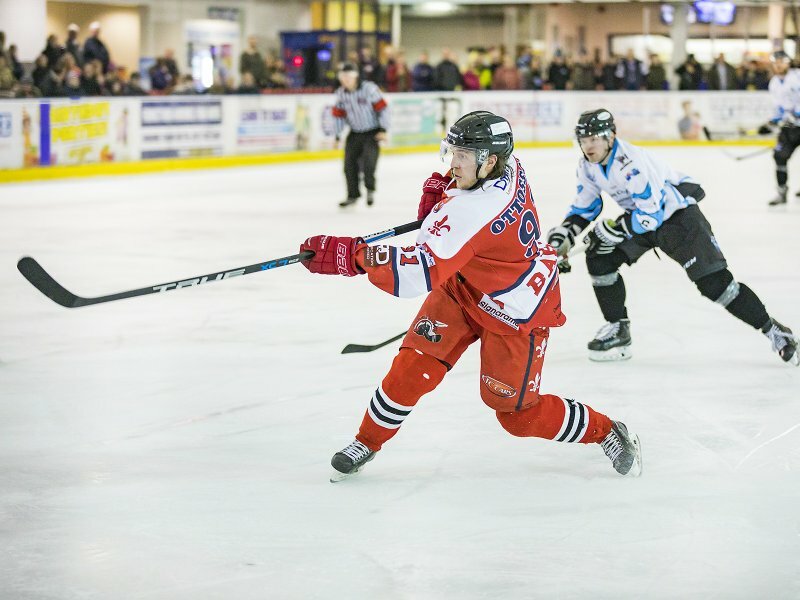 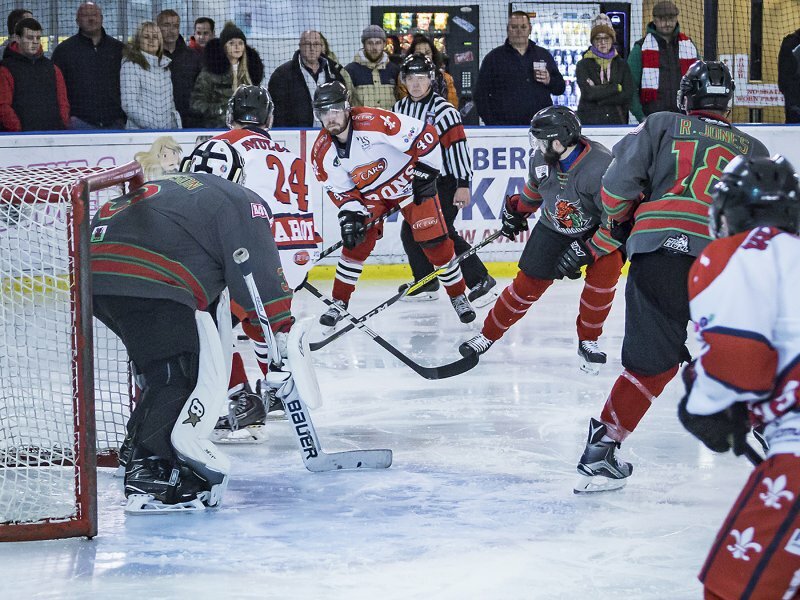 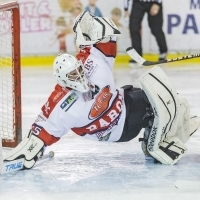 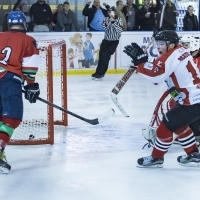 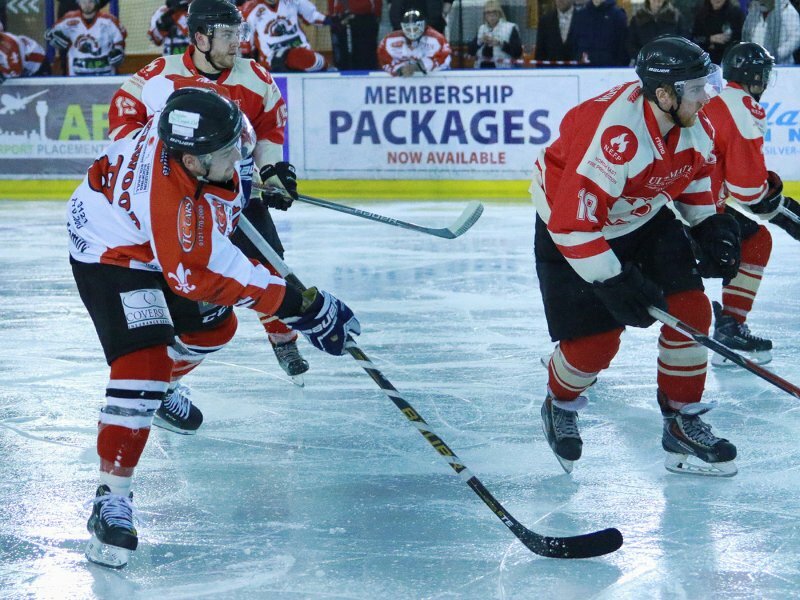 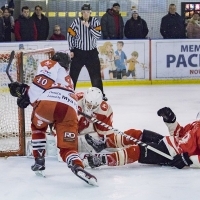 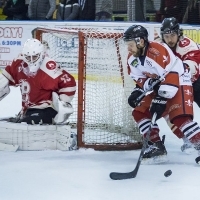 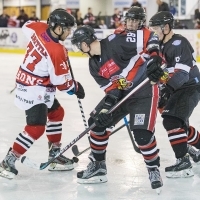 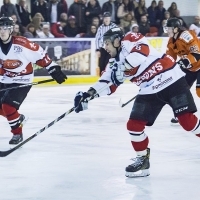 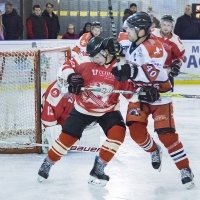 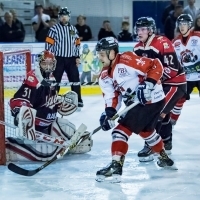 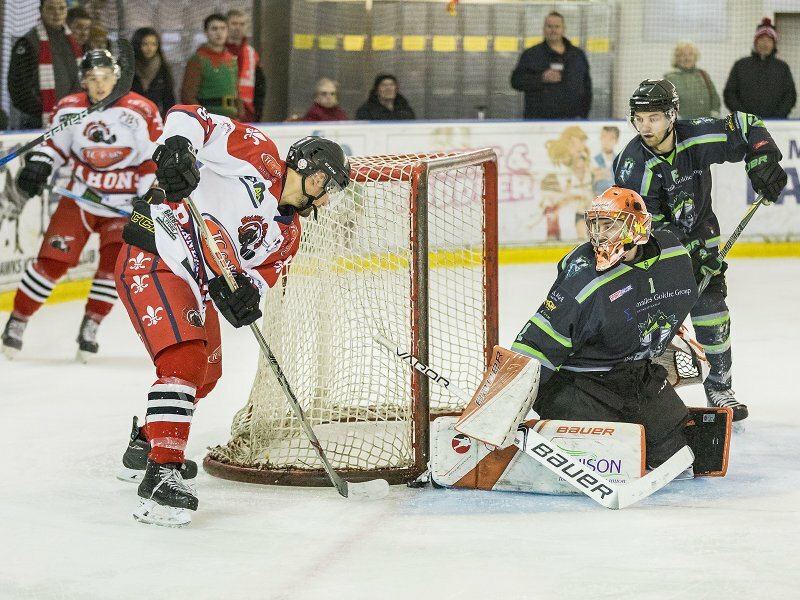 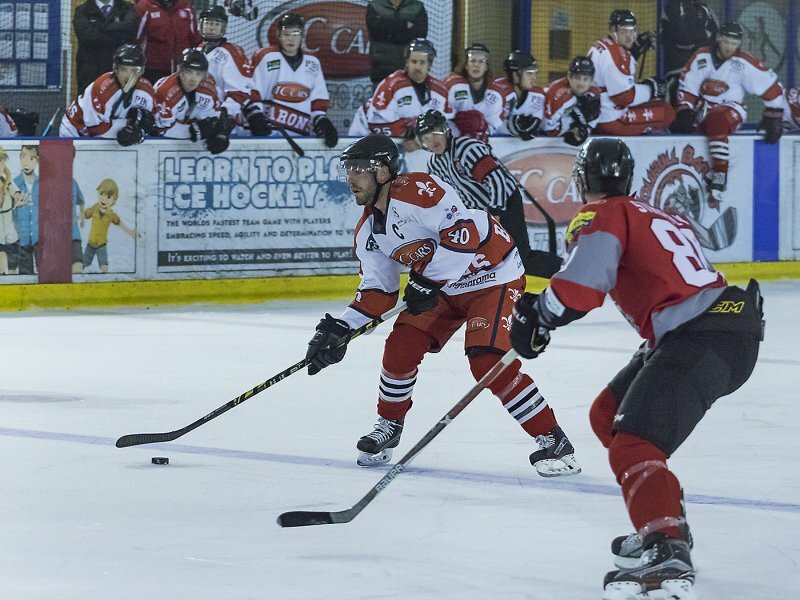 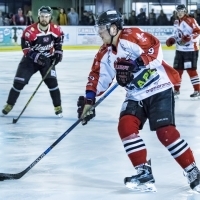 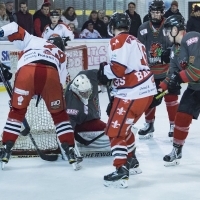 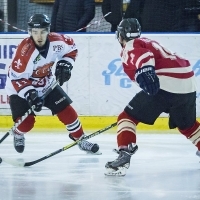 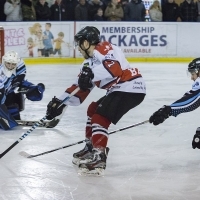 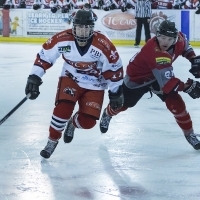 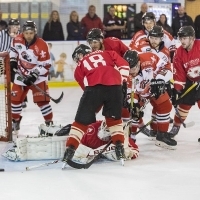 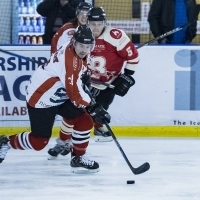 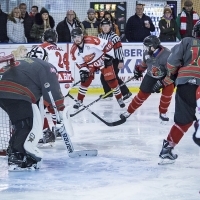 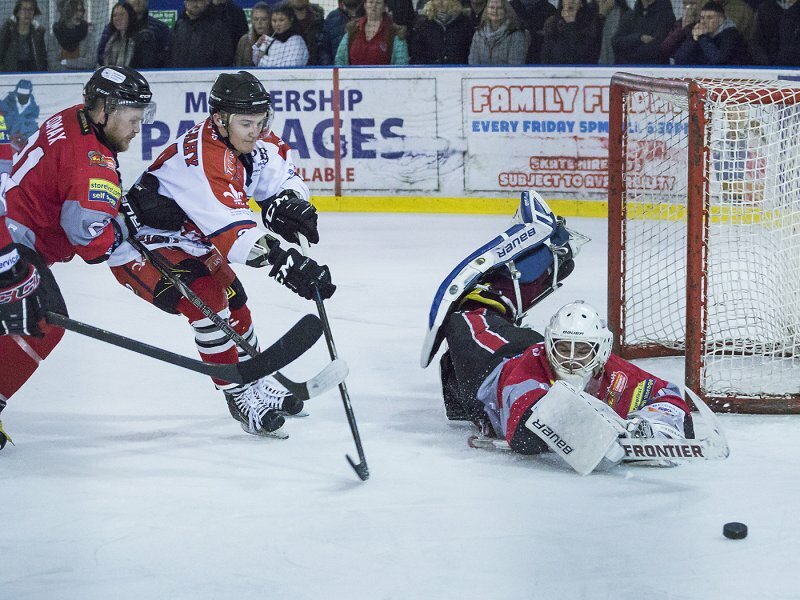 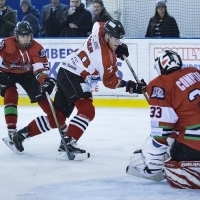 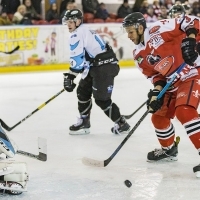 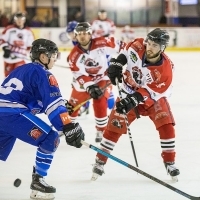 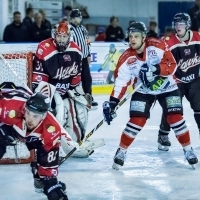 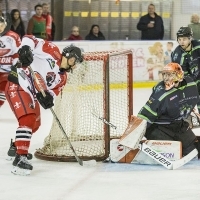 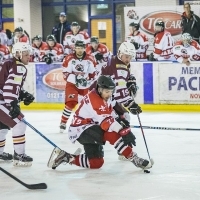 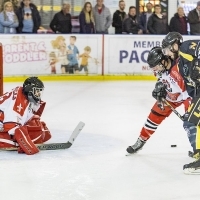 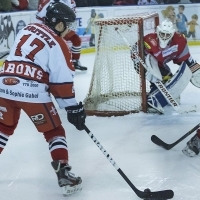 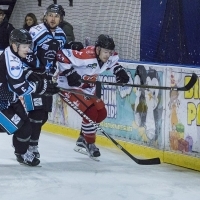 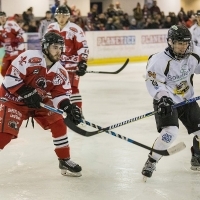 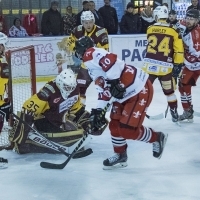 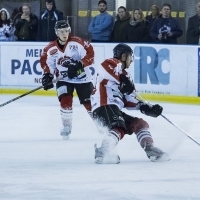 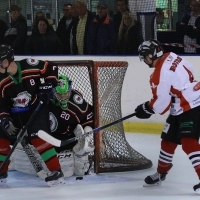 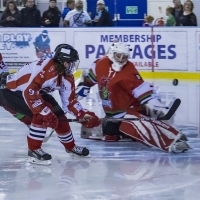 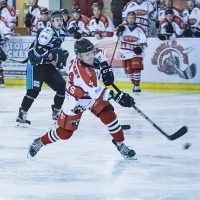 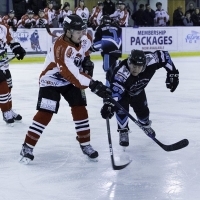 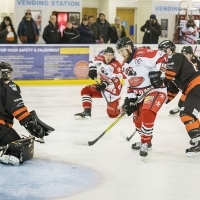 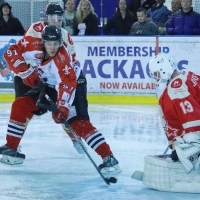 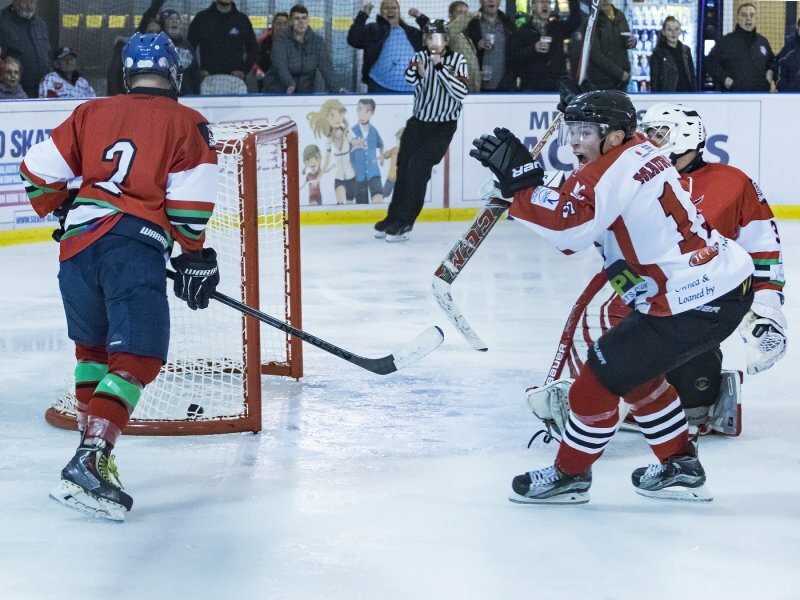 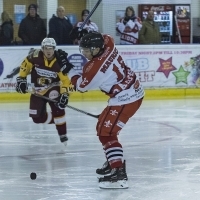 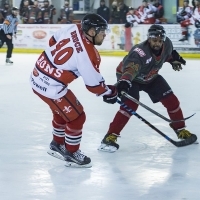 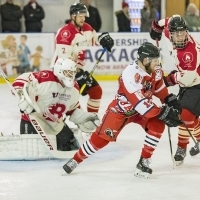 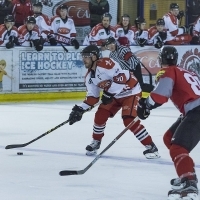 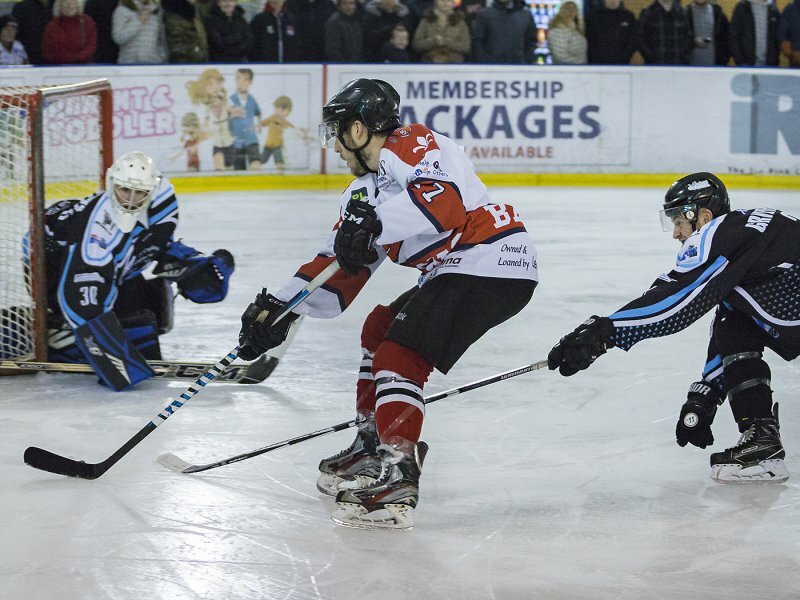 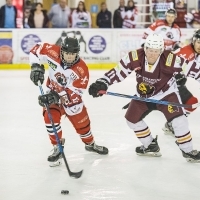 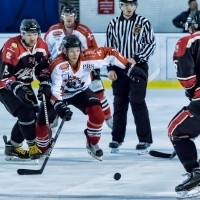 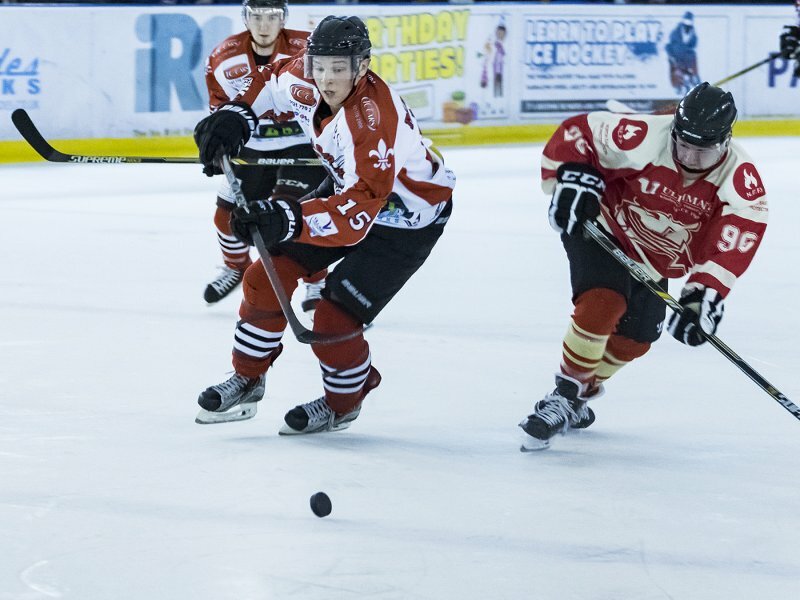 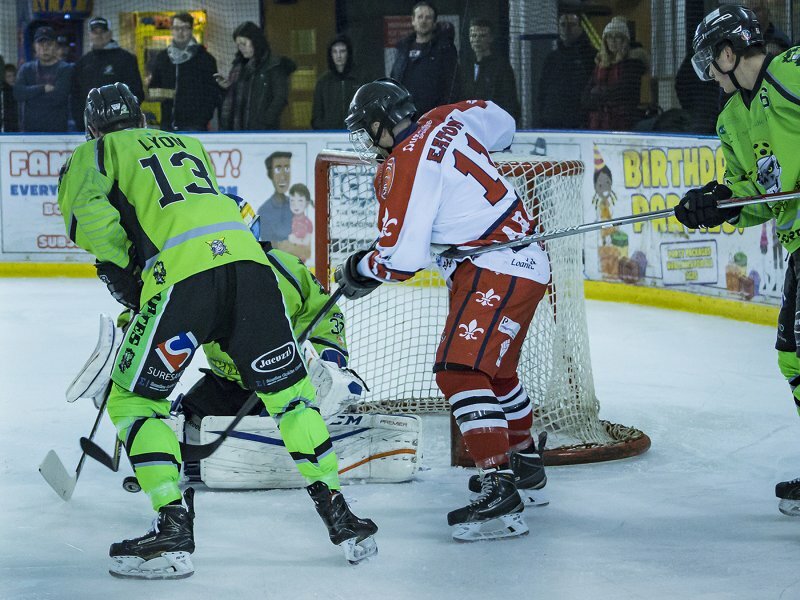 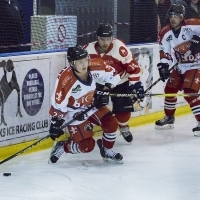 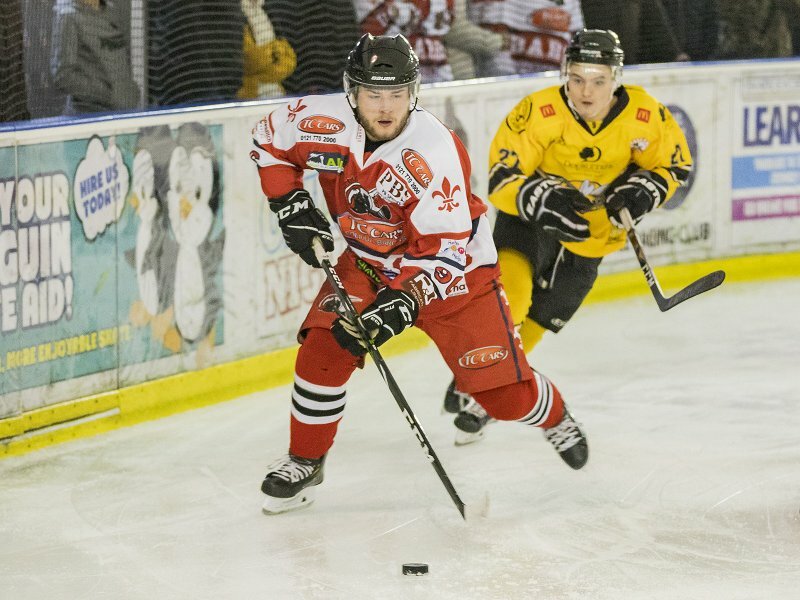 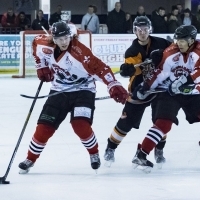 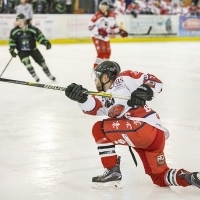 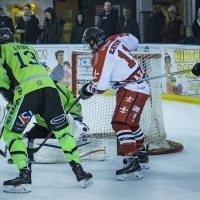 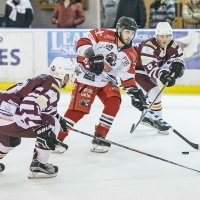 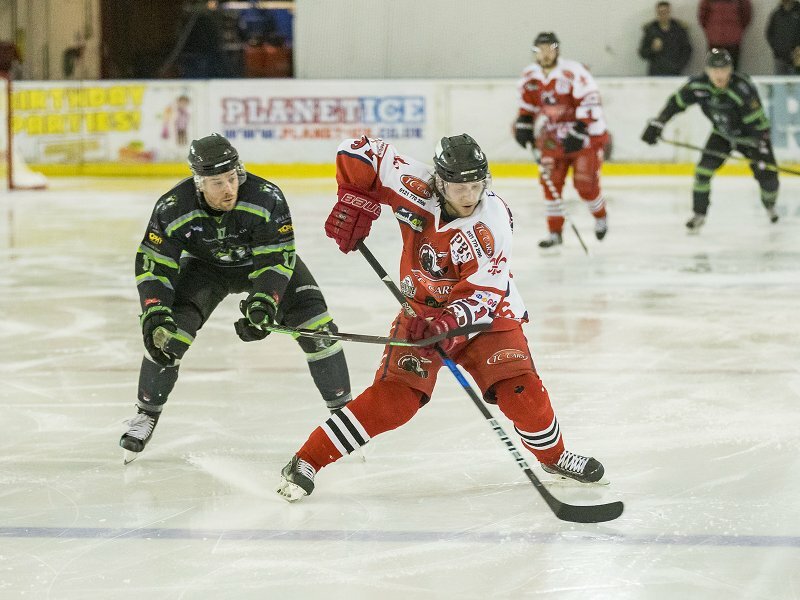 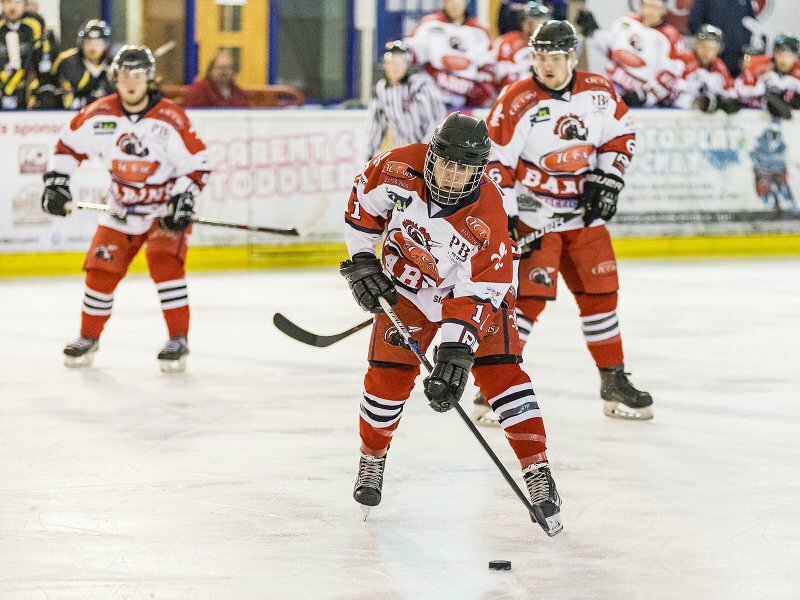 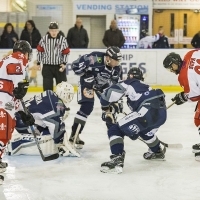 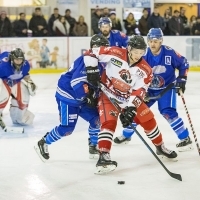 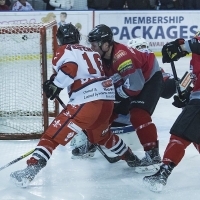 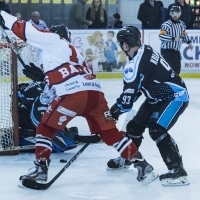 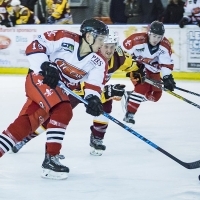 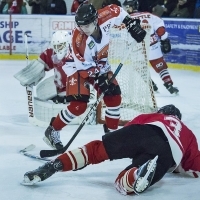 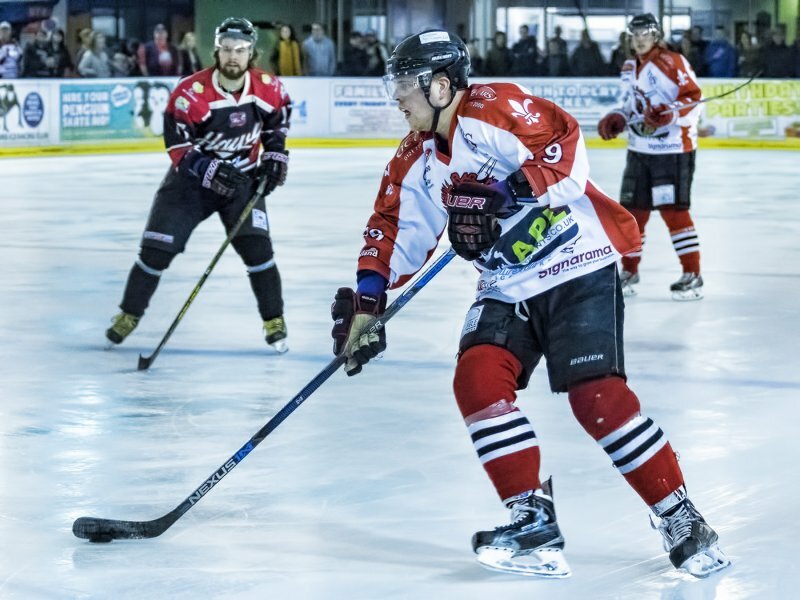 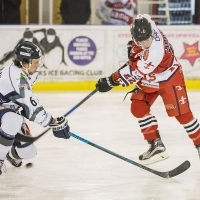 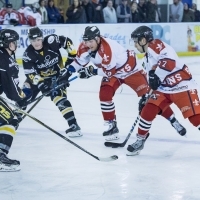 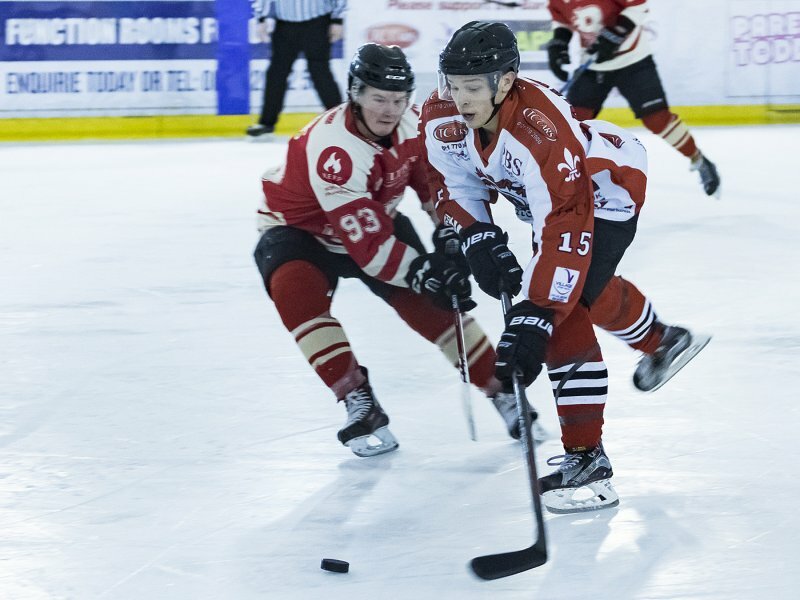 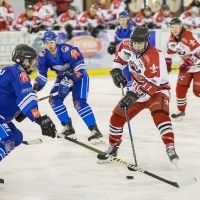 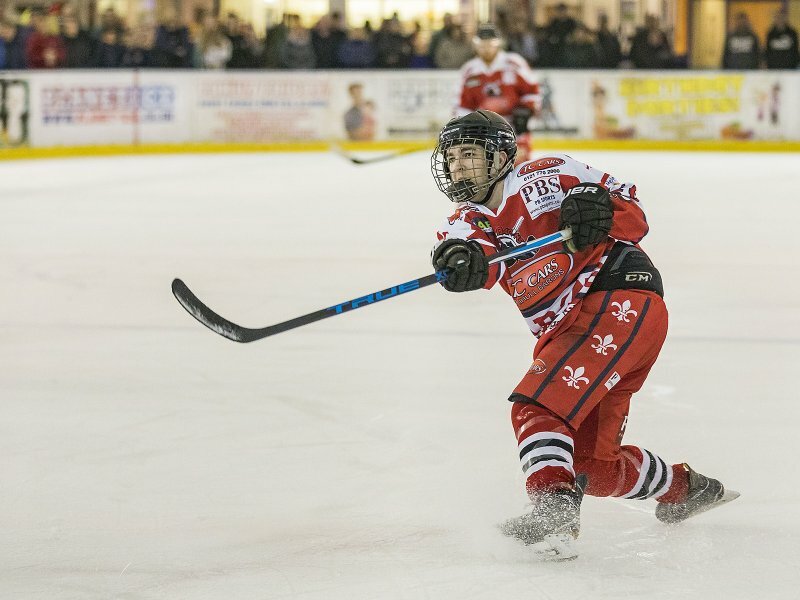 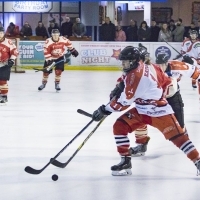 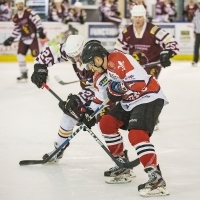 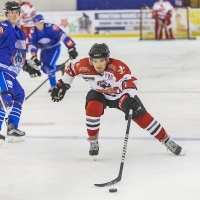 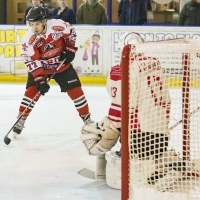 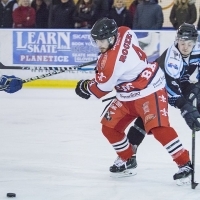 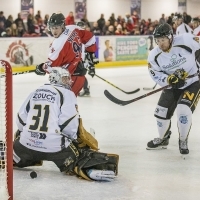 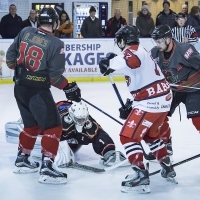 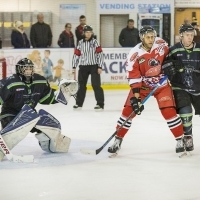 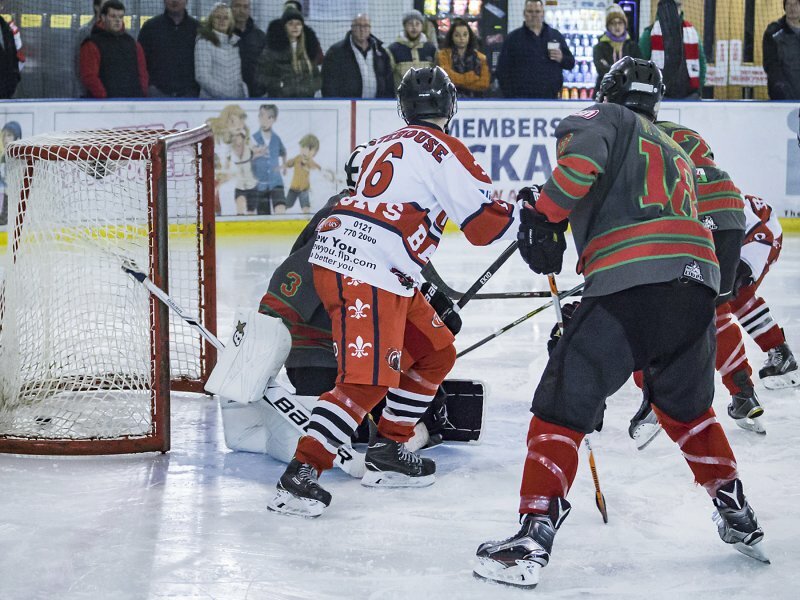 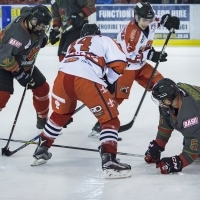 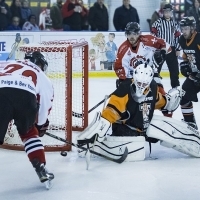 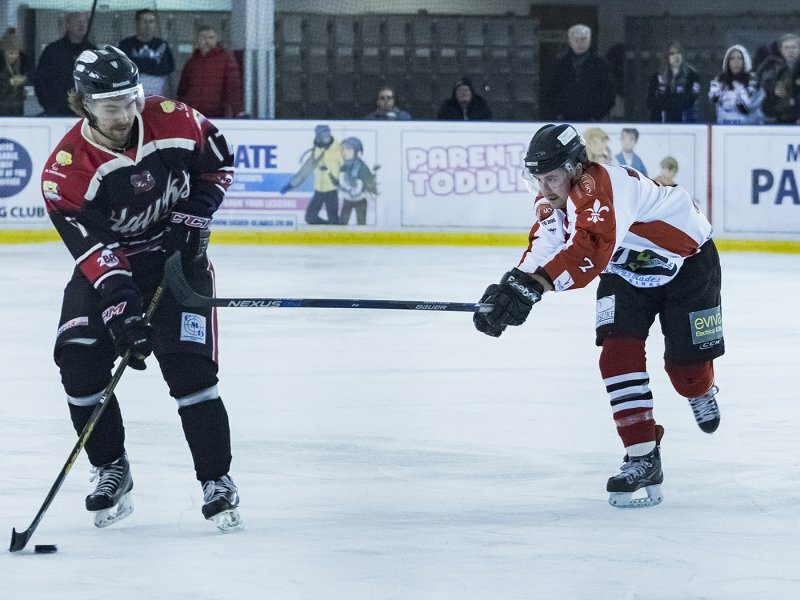 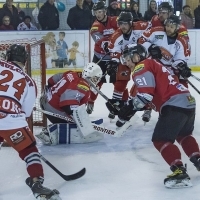 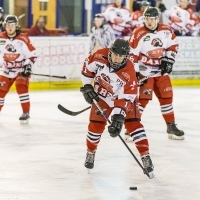 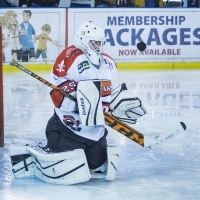 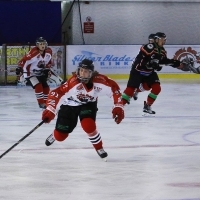 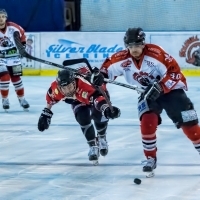 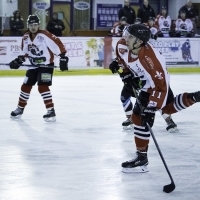 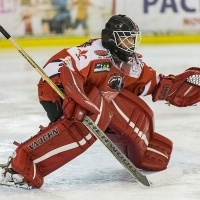 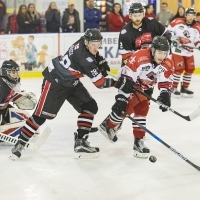 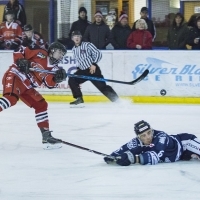 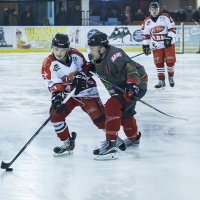 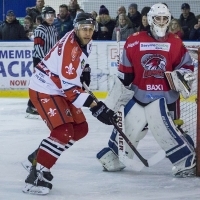 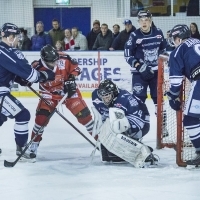 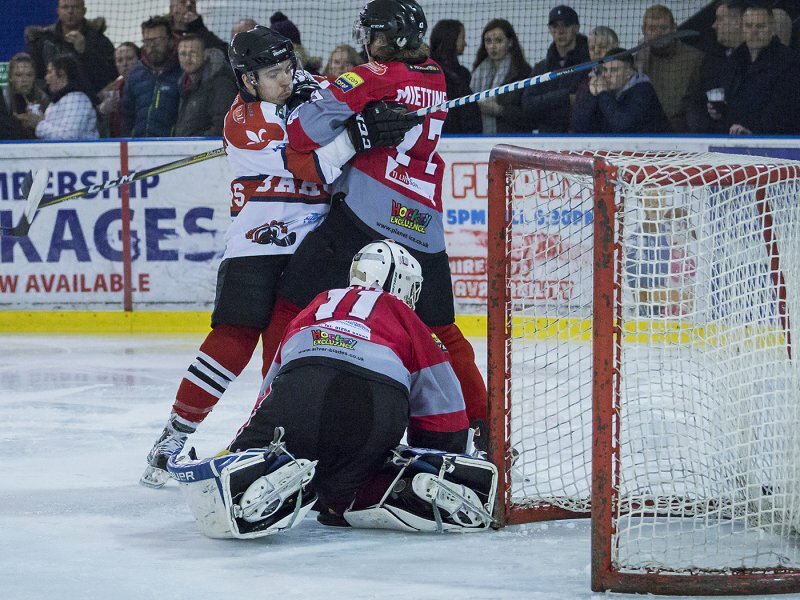 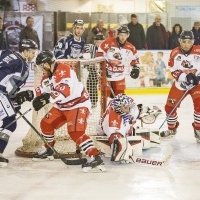 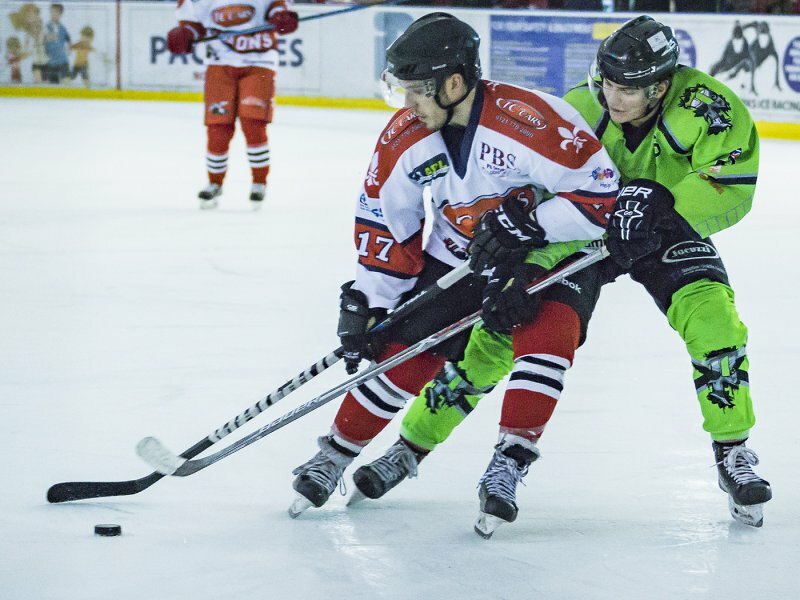 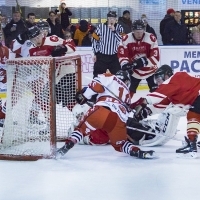 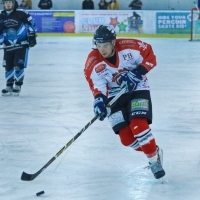 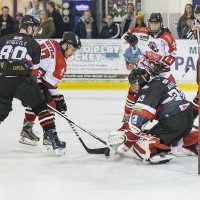 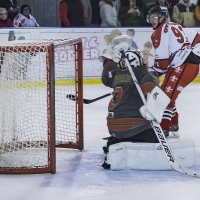 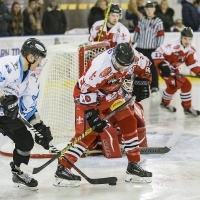 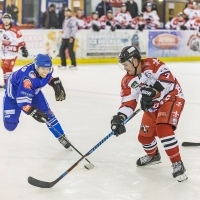 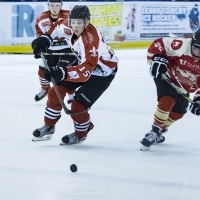 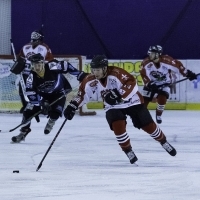 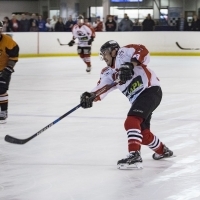 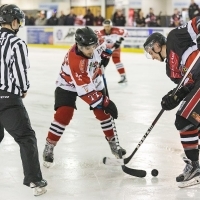 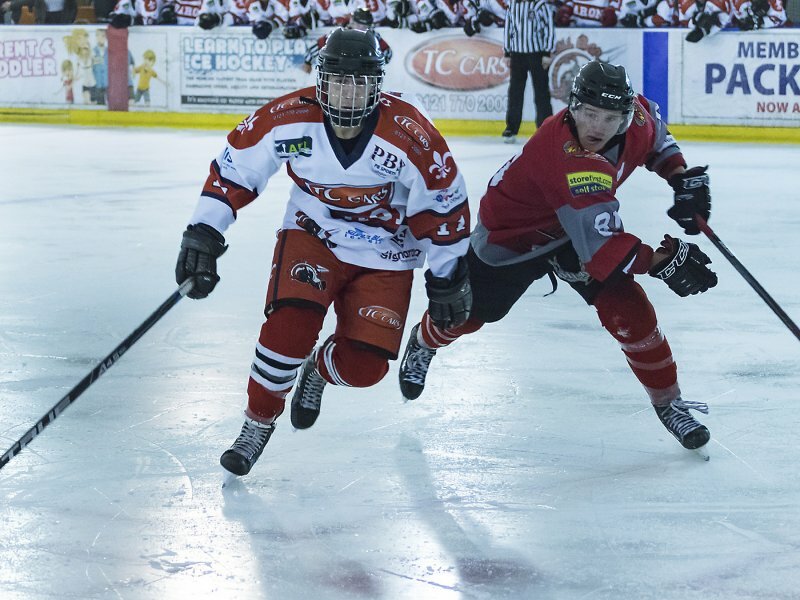 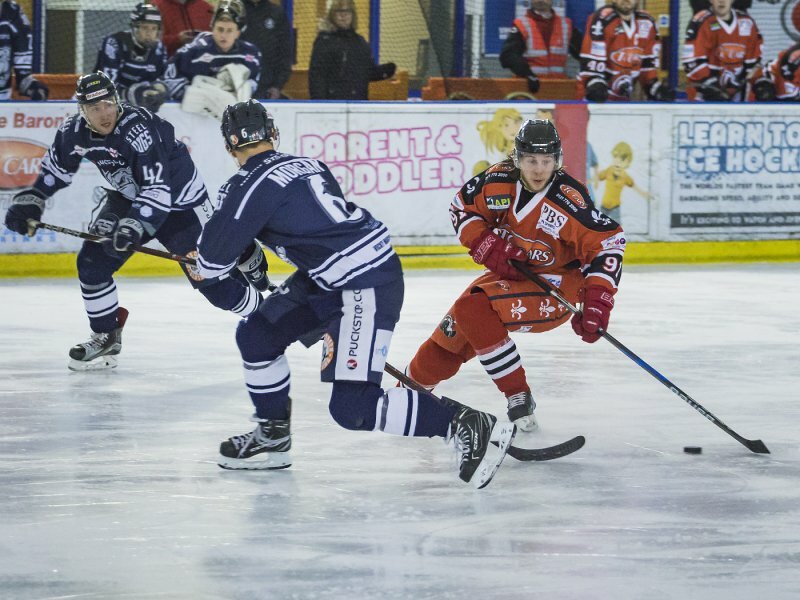 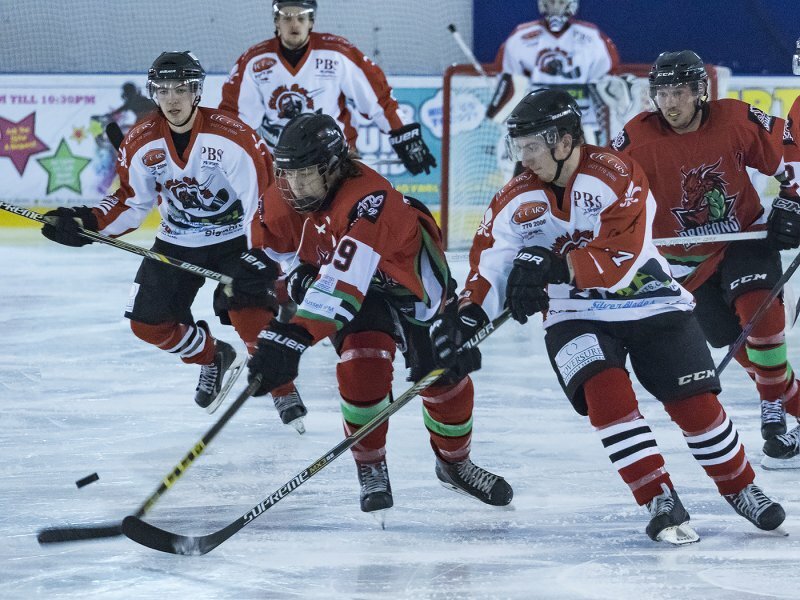 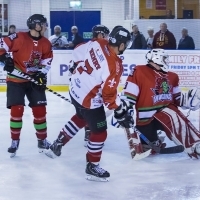 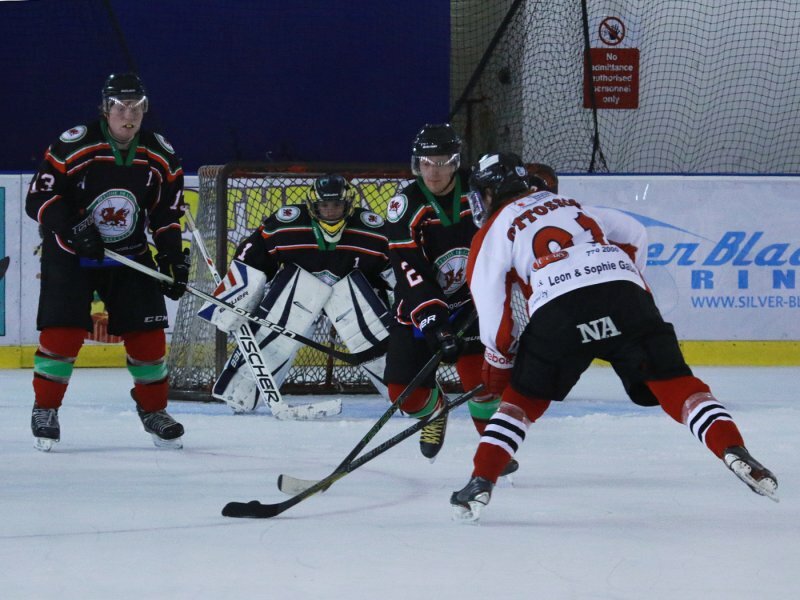 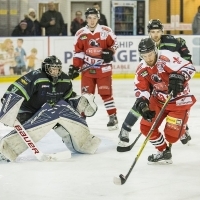 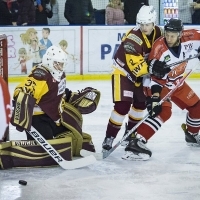 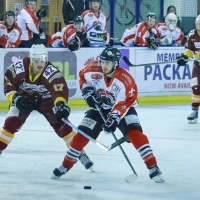 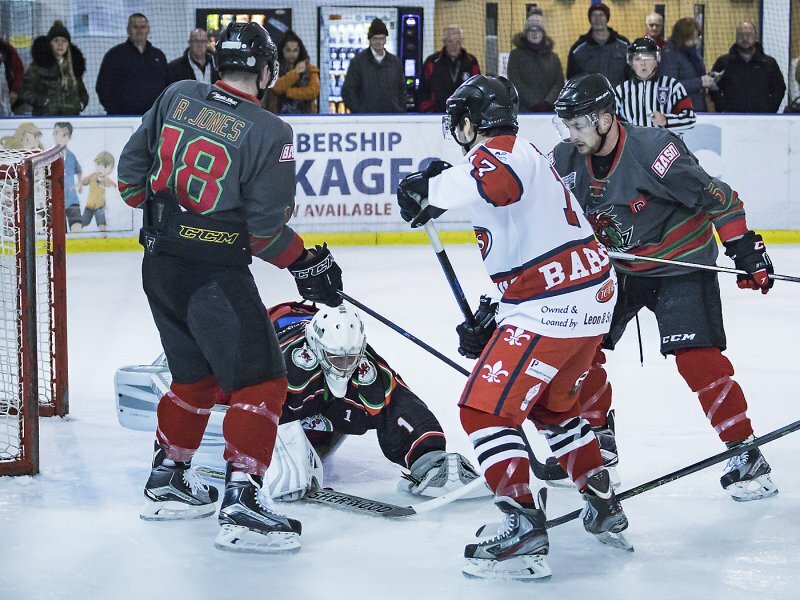 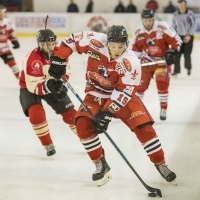 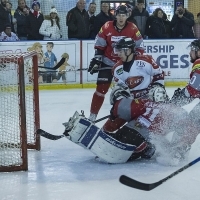 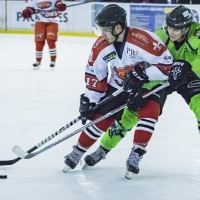 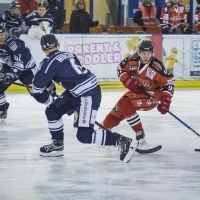 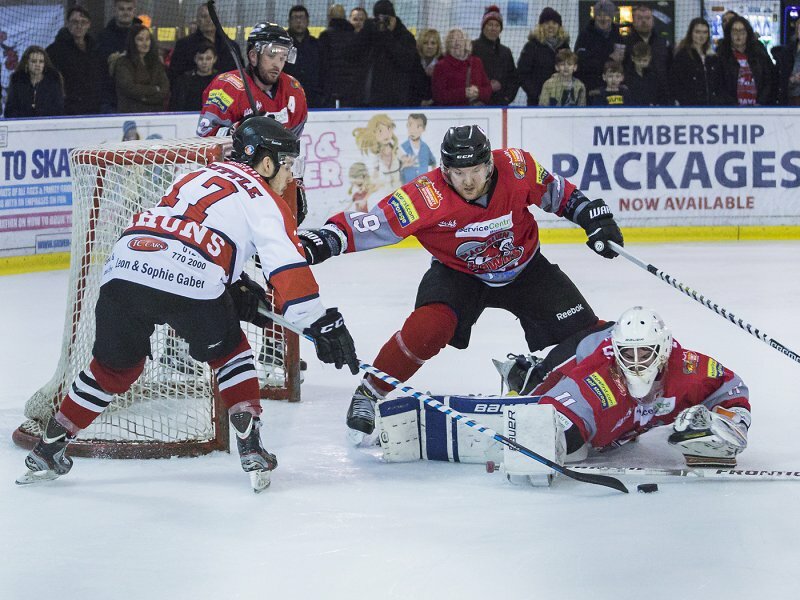 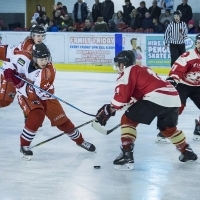 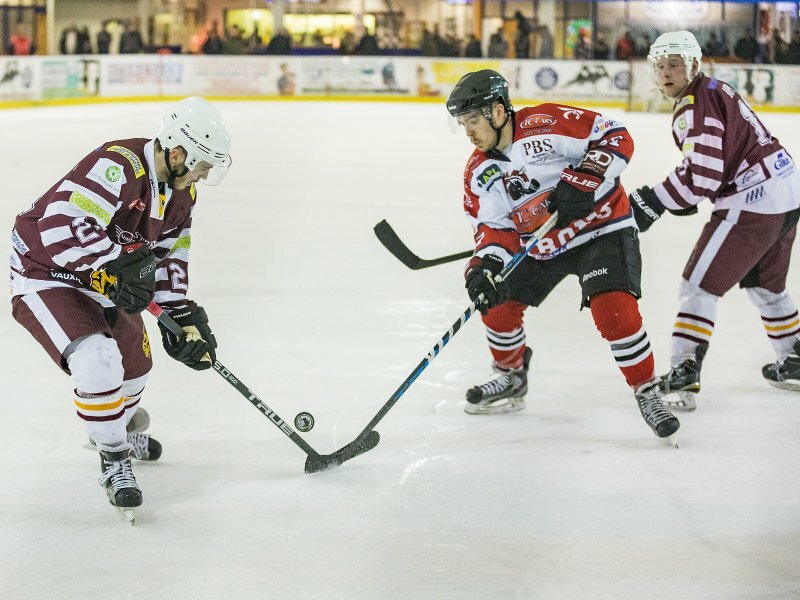 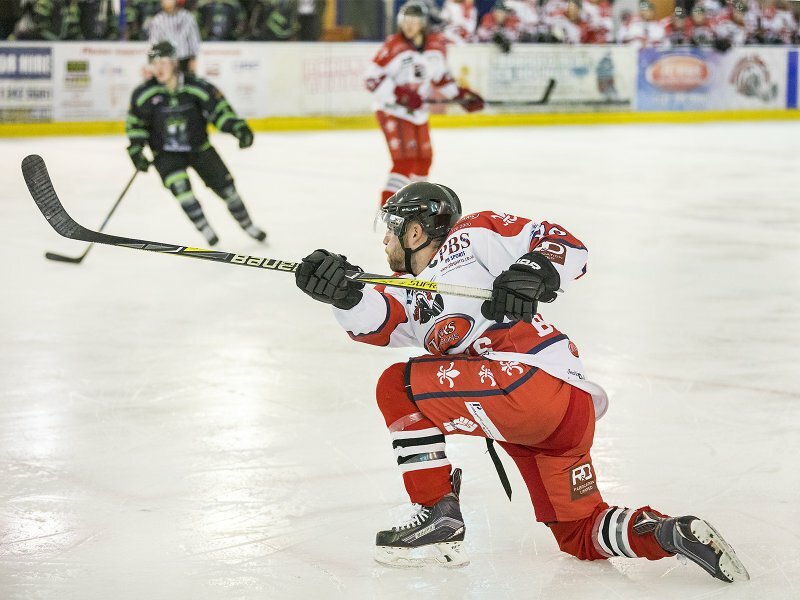 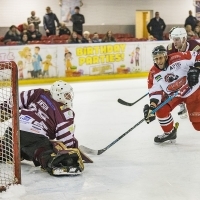 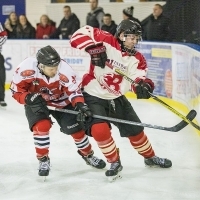 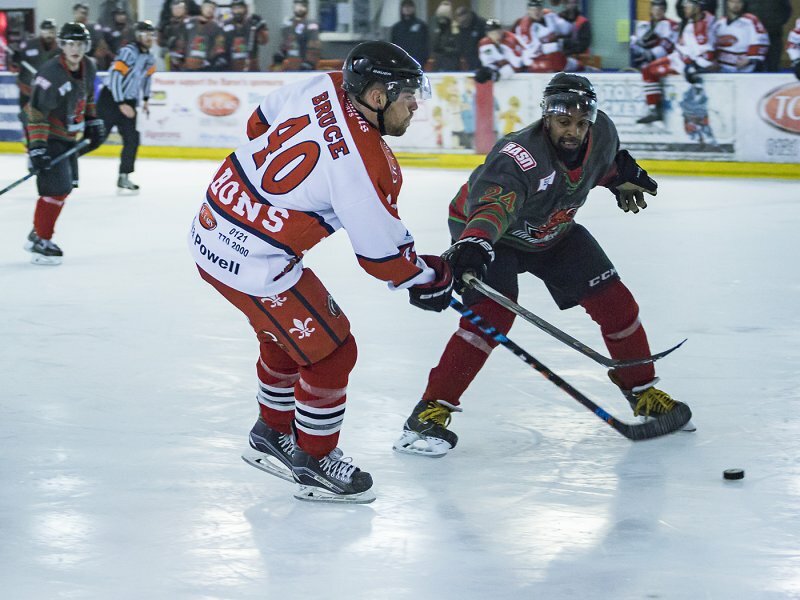 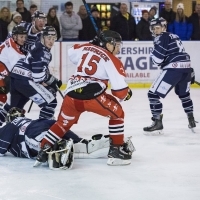 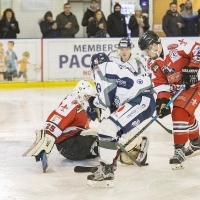 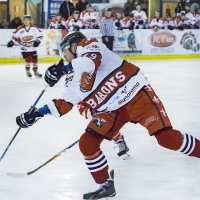 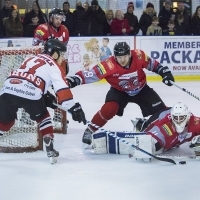 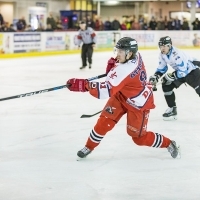 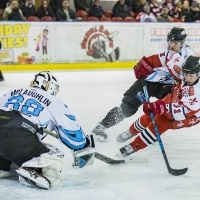 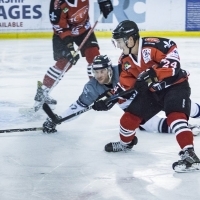 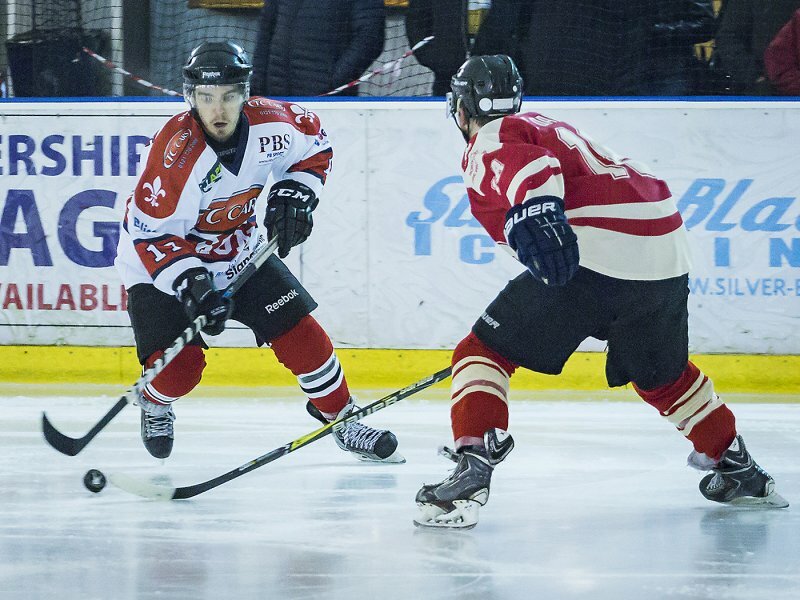 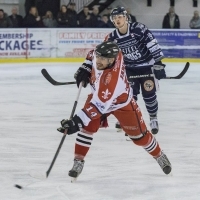 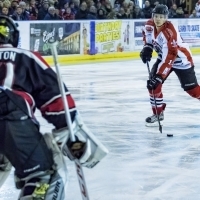 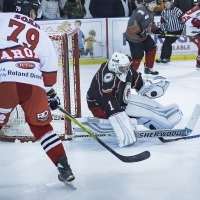 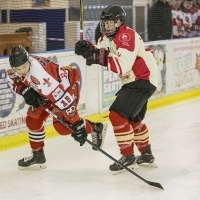 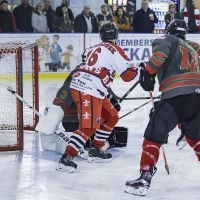 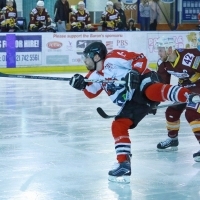 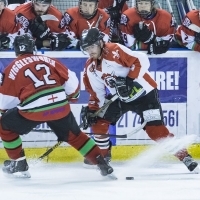 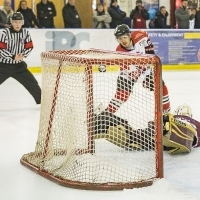 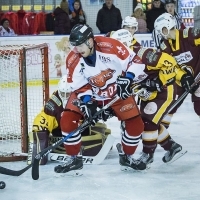 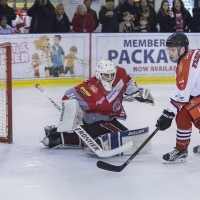 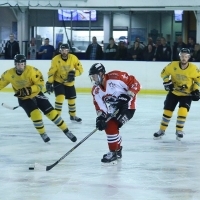 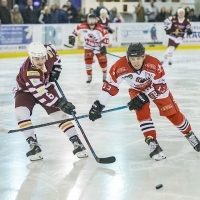 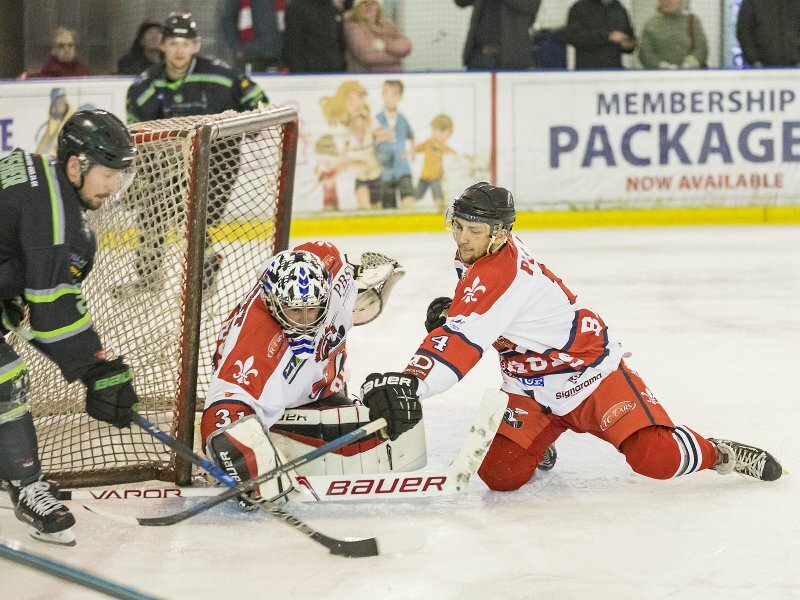 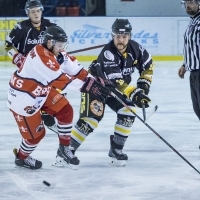 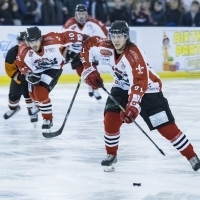 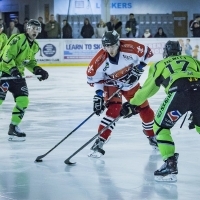 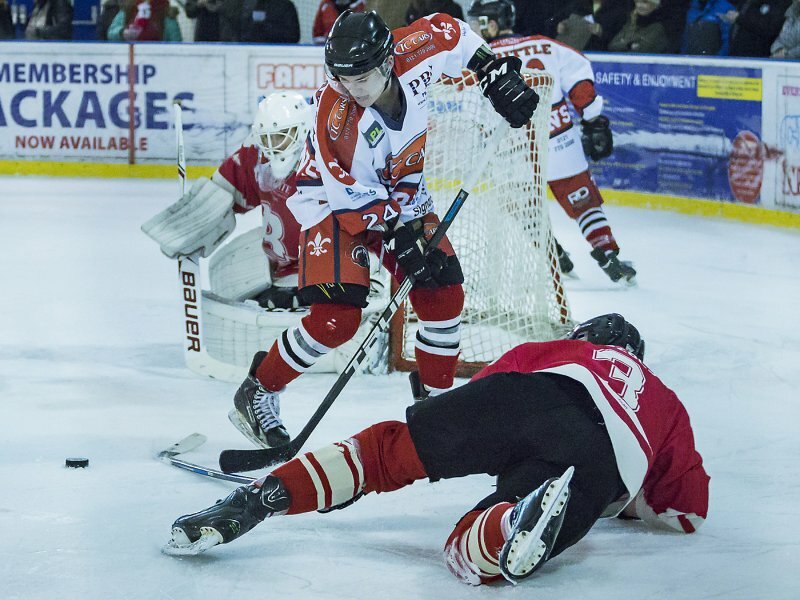 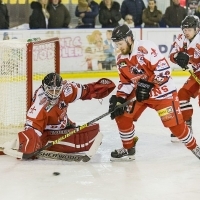 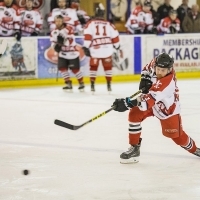 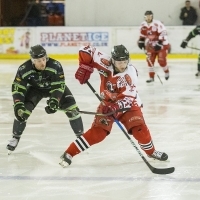 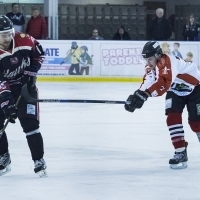 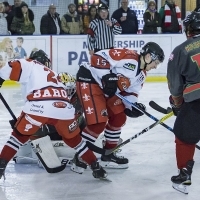 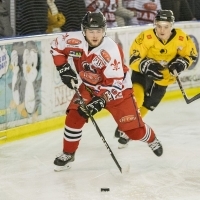 The final score was Solihull Barons 10 – Deeside Dragons 1.